An introverted geek that is just trying to get out more! This was a very odd walk for me, for a number of reasons. Firstly it was very ad-hoc. I spotted a good slot in the weather forecast and decided to go for it! I guess I had been getting itchy feet from my relative lack of activity this year. 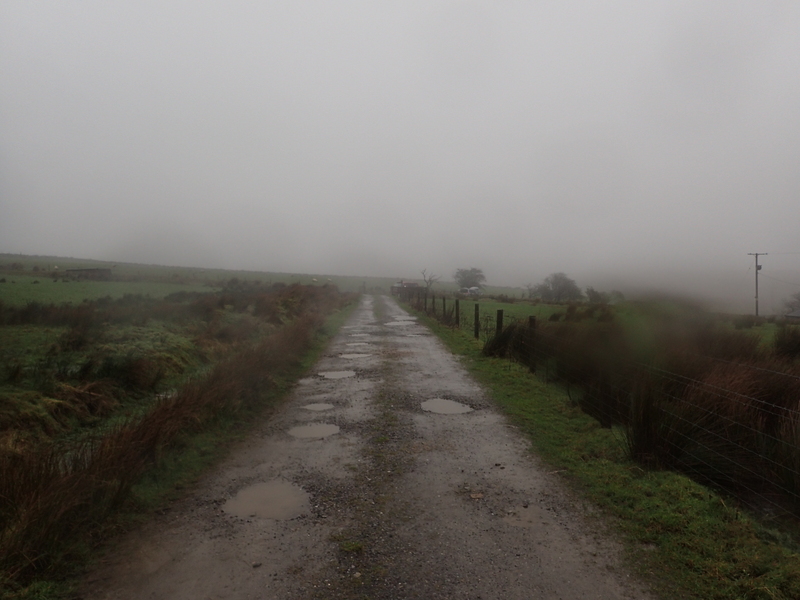 The walk was so ad-hoc that it was the first one where I had driven to and from the destination. This is in complete contrast to my normal use of public transport. I was wondering whether driving after a long walk would be a good thing or not, but as it turned out, it didn’t affect my driving at all. Another oddity was the food situation. There were no snacks on this walk. Just one pasty and that was it! In the event, this worked out quite well, though there were a few occasions where I was hankering after something to snack on. I guess old habits die hard! The oddities also extended to the planning too… As in there wasn’t any! I simply used an off-the-shelf classic route as used by many other people. I guess the last minute nature of this walk meant that I didn’t have time to plan a decent unique route. 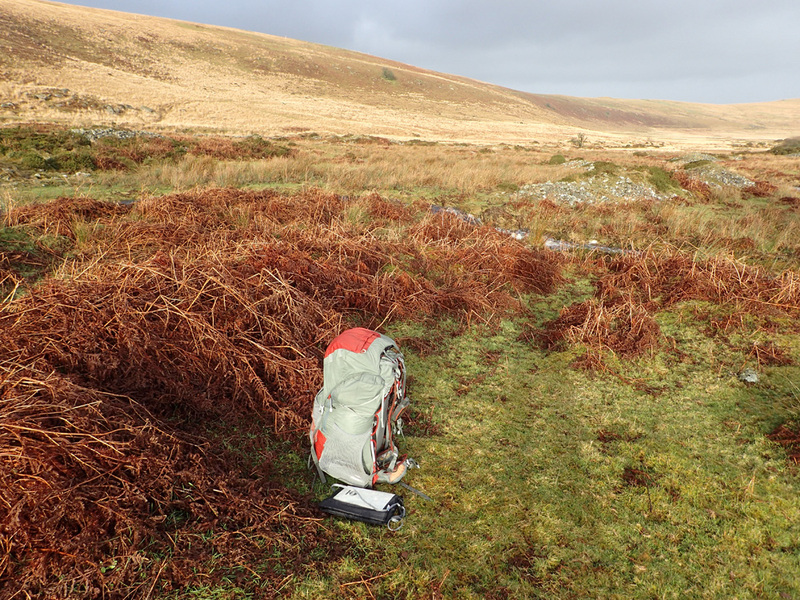 As it was a day walk – another unusual aspect – there wasn’t a lot to carry – just 7 kg of kit, around half of my normal load. Unlike my other recent walks, this one is a day trip only. Kit weight with food and water was around 7 Kg – pretty light by my normal standards. I didn’t think I would need all the layers, but in the event, the high winds ensured that everything got used with the exception of the waterproof hardshell. Even with such a light load, this walk did highlight my lack of fitness. 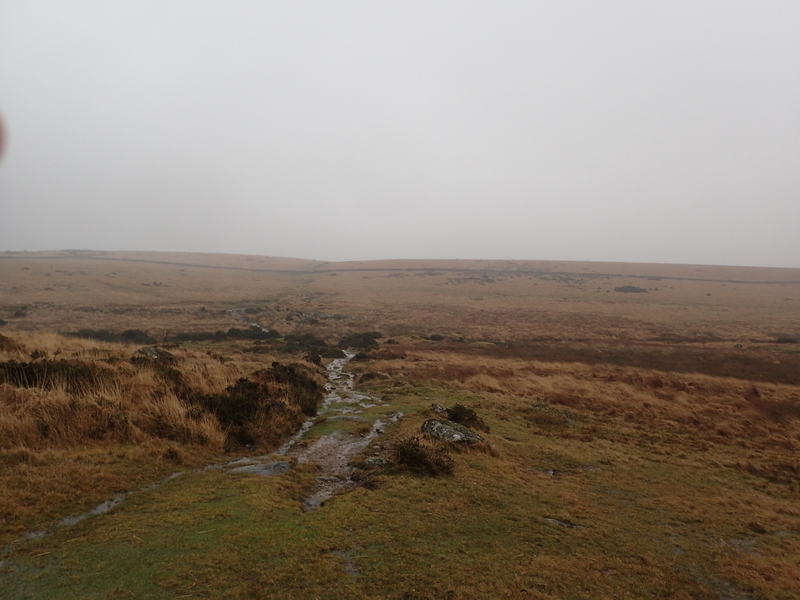 After the Dartmoor walk earlier this year, my fitness regime had gone into decline. This was acutely felt during the walk. If anything, this walk was a wake up call to get myself back up to a peak level of fitness. 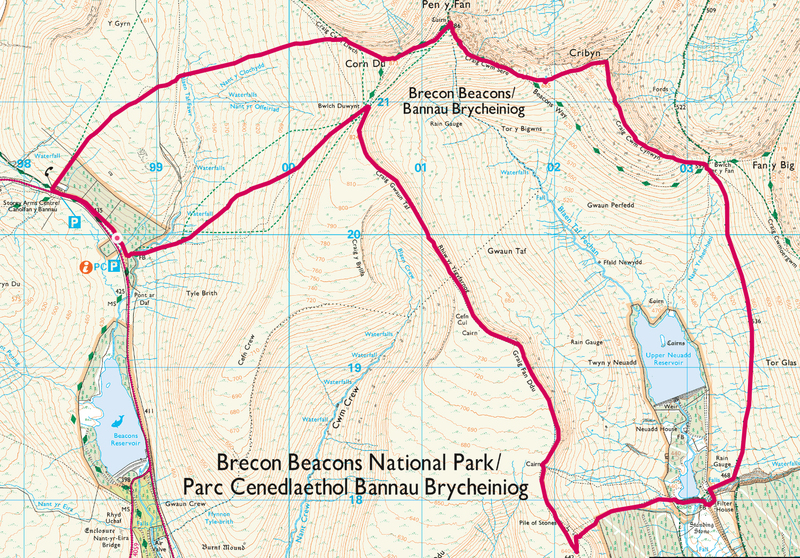 The full clockwise 18.3 km route with 1339 mtrs of ascent and 1201 mtrs of descent. The red spot on the left marks the start and end point. 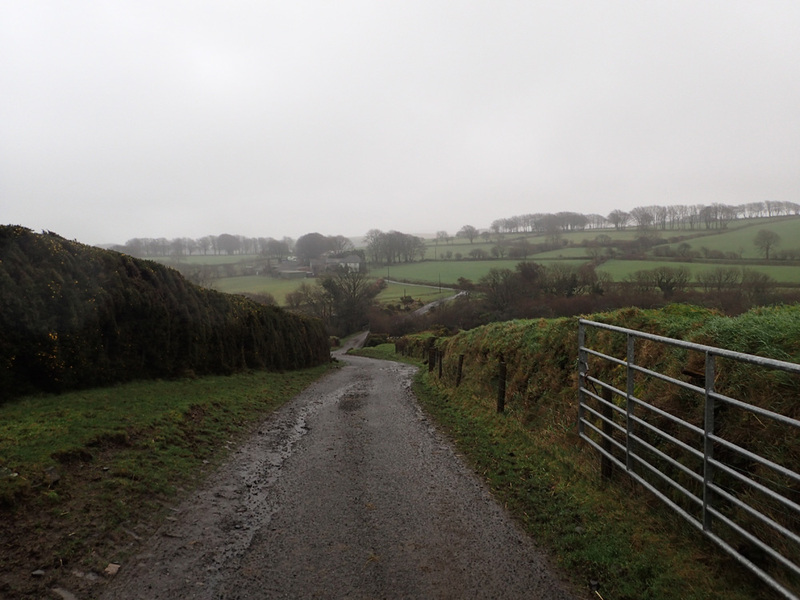 As walks go, this one was pretty hilly! In a first, I actually drive to my destination. I normally use a train for travel, but the last minute nature of this hike necessitated using the car! 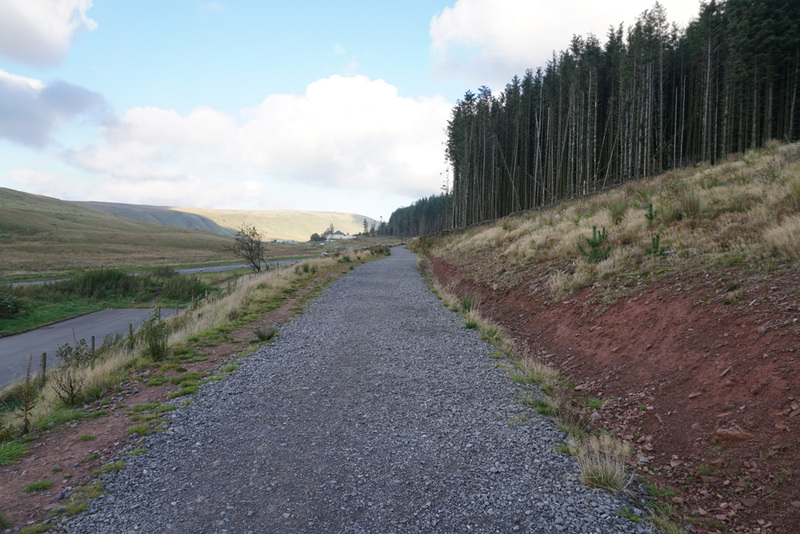 The first stage is to follow the A470 road North Westward to pick up a trail heading up into the hills. 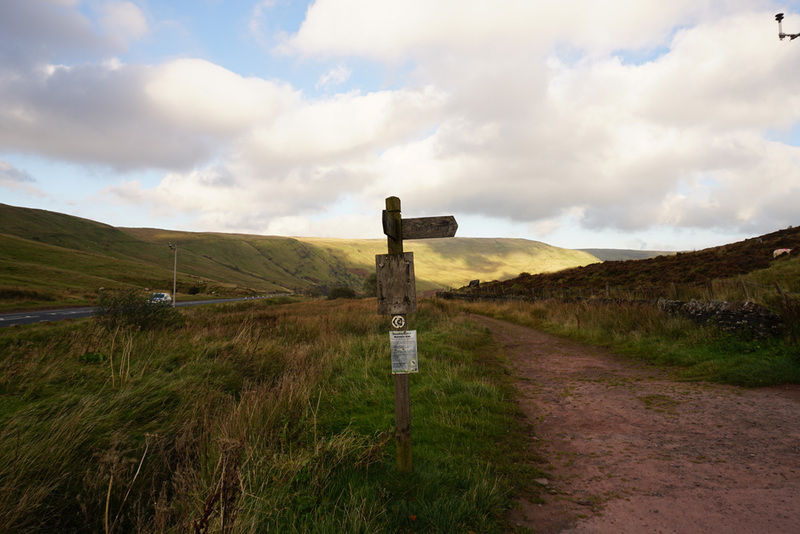 This trail should be located by the Storey Arms – which rather unexpectedly was not a pub! 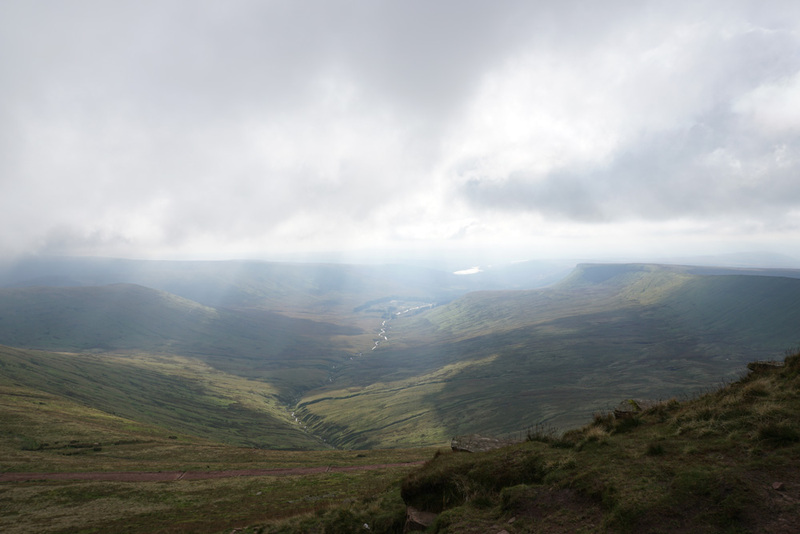 As I ascend I start to get great views onto the Beacons Reservoir to the South. A glance behind me – it looks like I have already gained a fair bit of elevation. 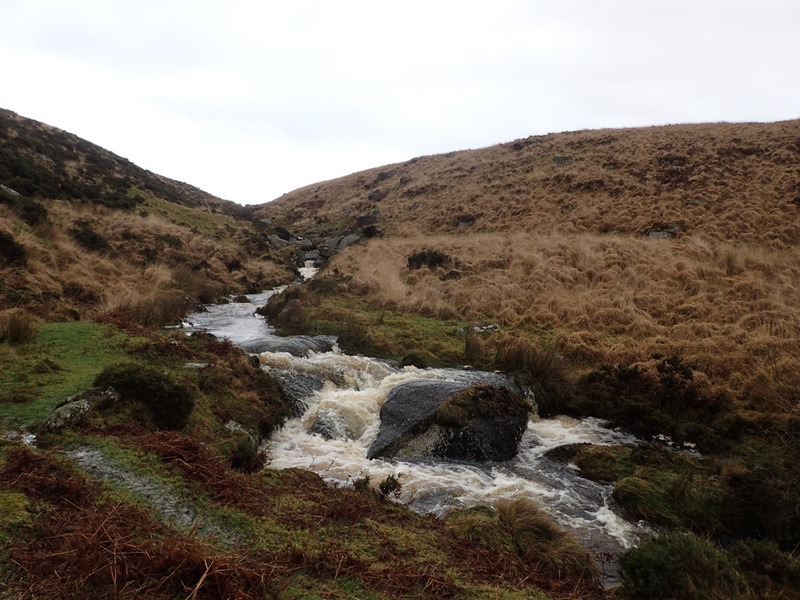 I lose around 40 metres of hard-won elevation to get to the Blaen Taf Fawr stream. 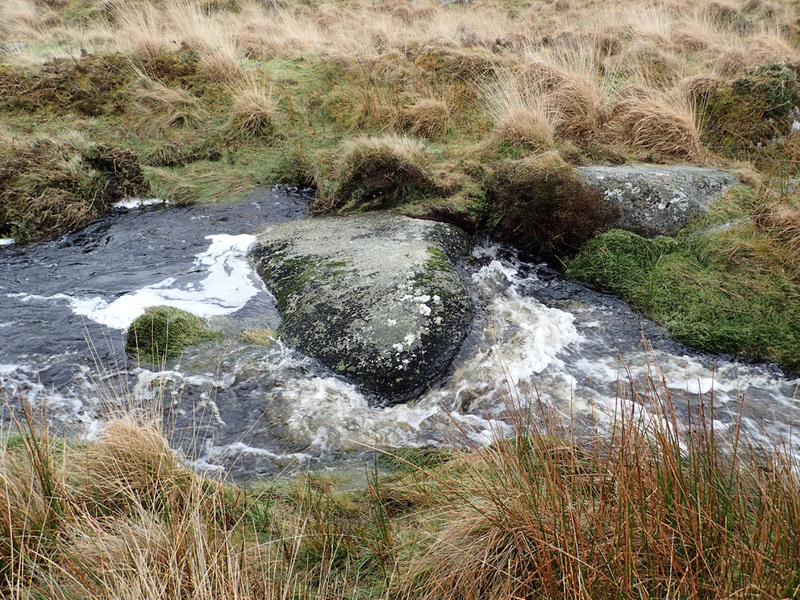 The crossing turns out to be pretty straight forward – just a case of hopping from stone to stone! 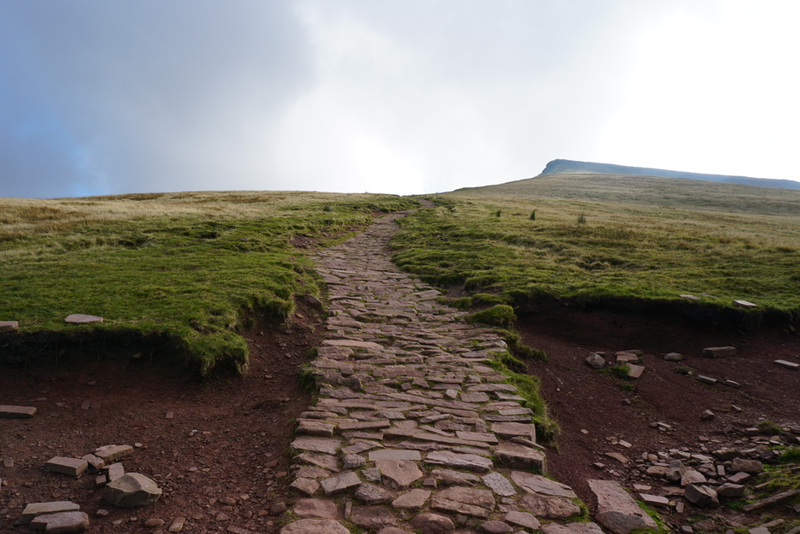 The main climb up to Corn Du is now on! 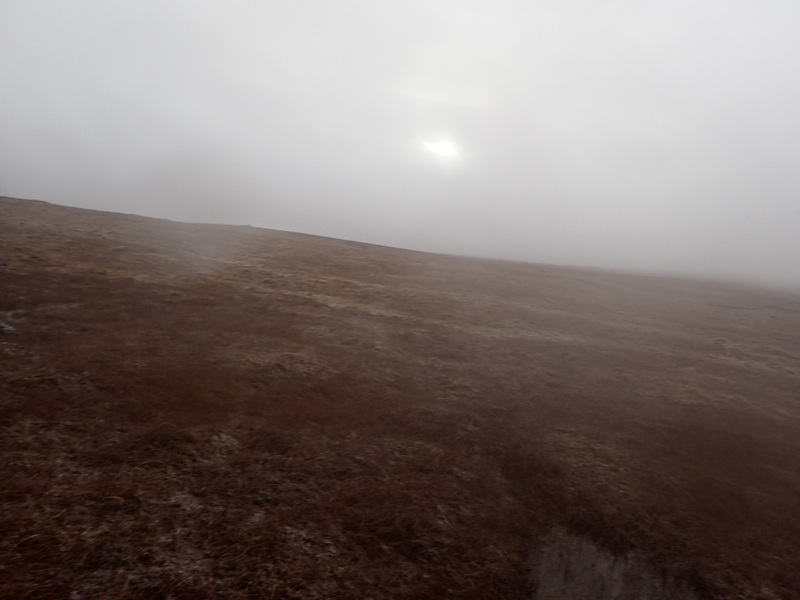 The winds today are very strong – as a result I’m seeing the clouds rush by the peak up ahead. It’s a shame the still photos do not capture this! 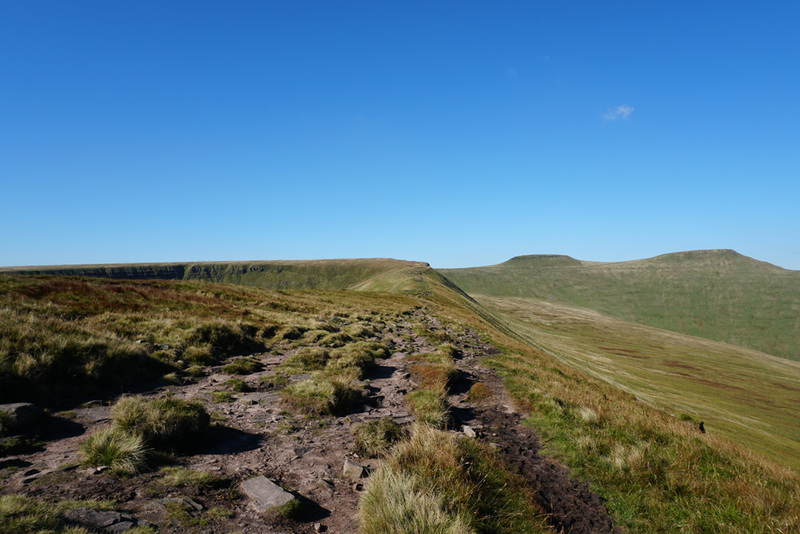 I soon get to the point where the path I’m on joins the main one following the ridge of Craig Cwn Llwch. 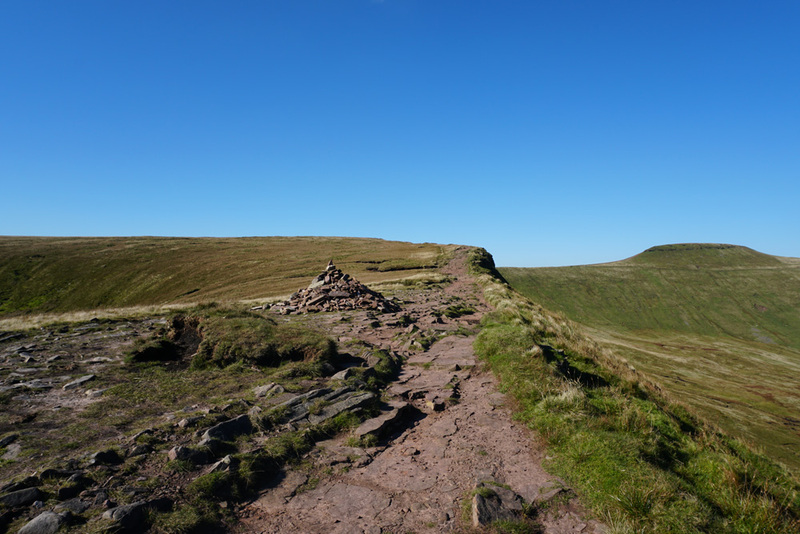 As I climb up to the peak of Corn Du, I turn around to get this picture of Llyn Cwm Llwch. 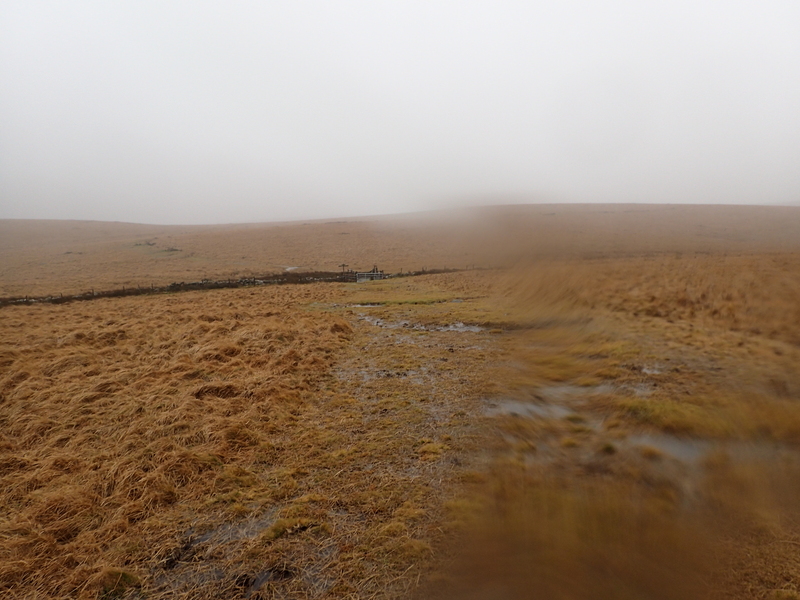 I find it very difficult to keep the camera steady due to the high winds. 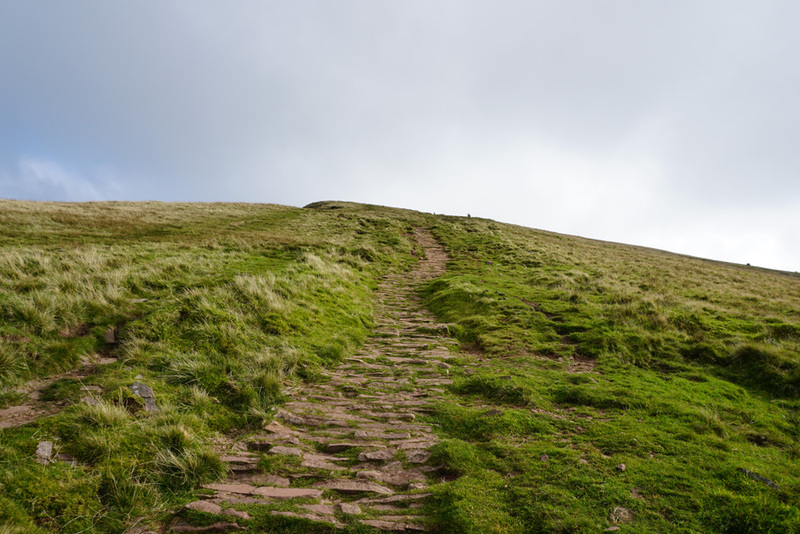 The final climb up to the peak is on. One always gets an additional spurt of energy when one is this close! Nearly there. I’m now wondering what I will see when I get up there! 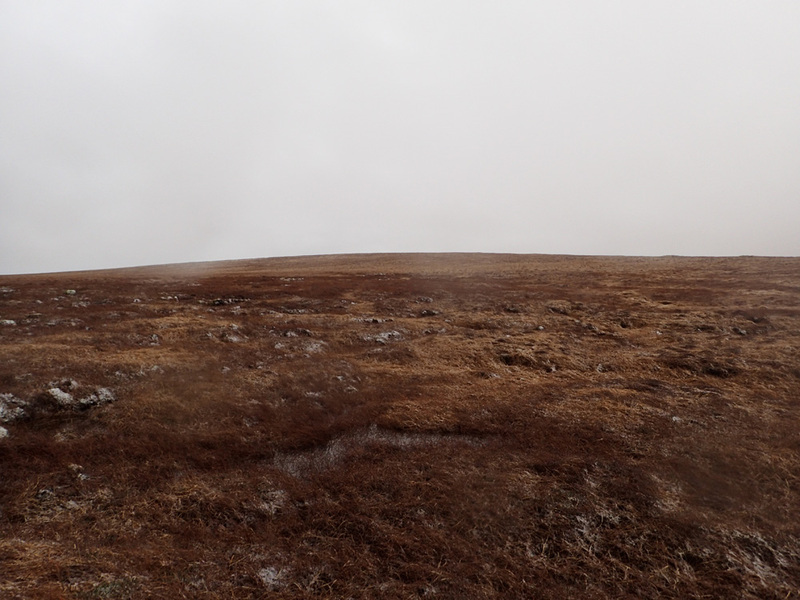 I soon spot the cairn marking the top of this rather flat mountain. Despite my anti-social nature I end up sitting nearby to the other walker so as to get some respite from the very high winds. 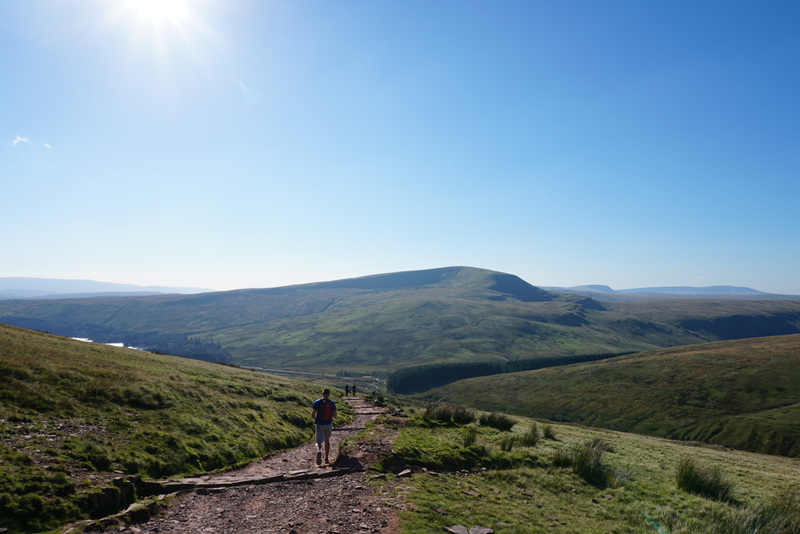 After having some water and hot coffee, I start to make my way to Pen y Fan which is up ahead. 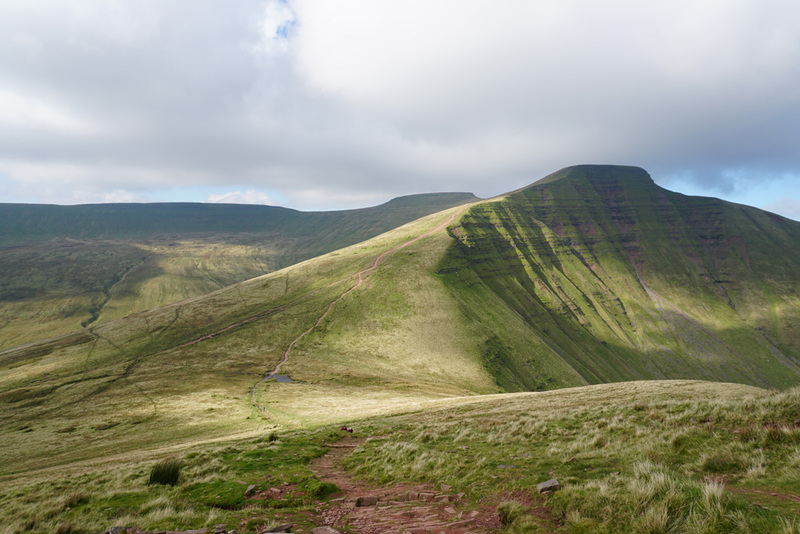 This is another mountain with a distinctive flat top. At this point the main climbing has been done. 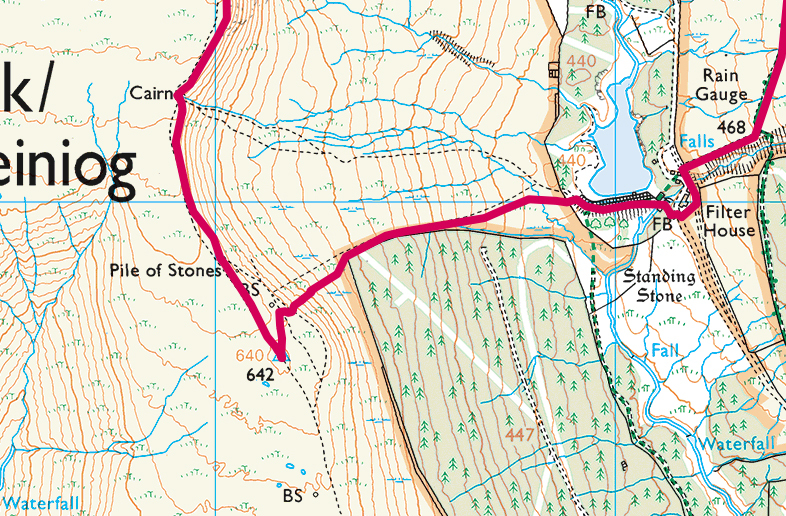 This section of the walk should be a simple jaunt! 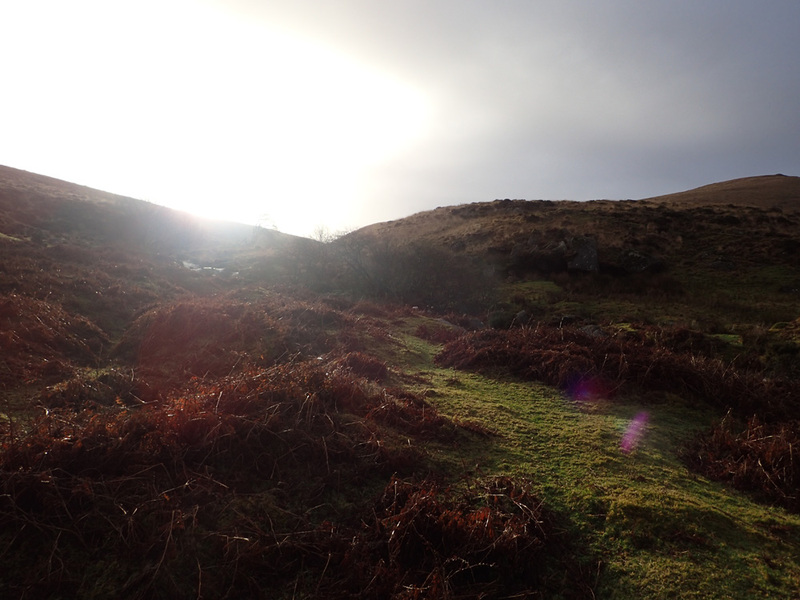 I’m entranced by the moving ‘God Rays’ to the South over the Blaen Taf Fechan stream. 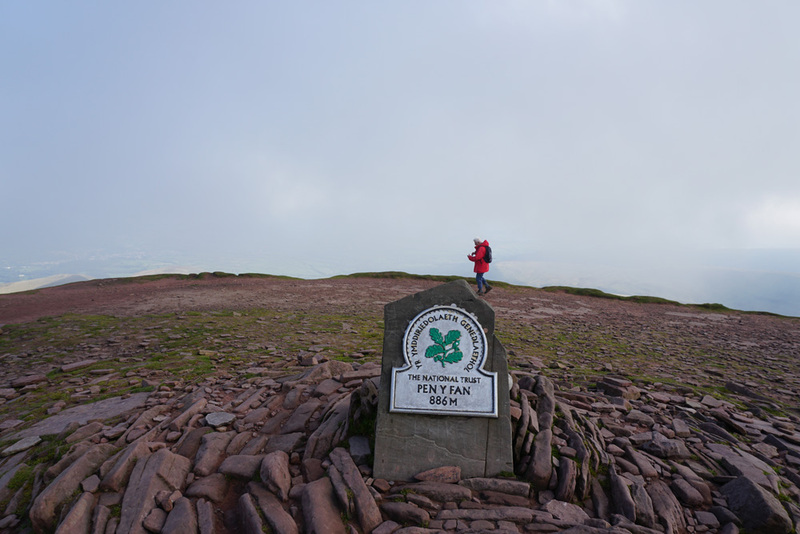 It doesn’t take long to reach the top of Pen y Fan. 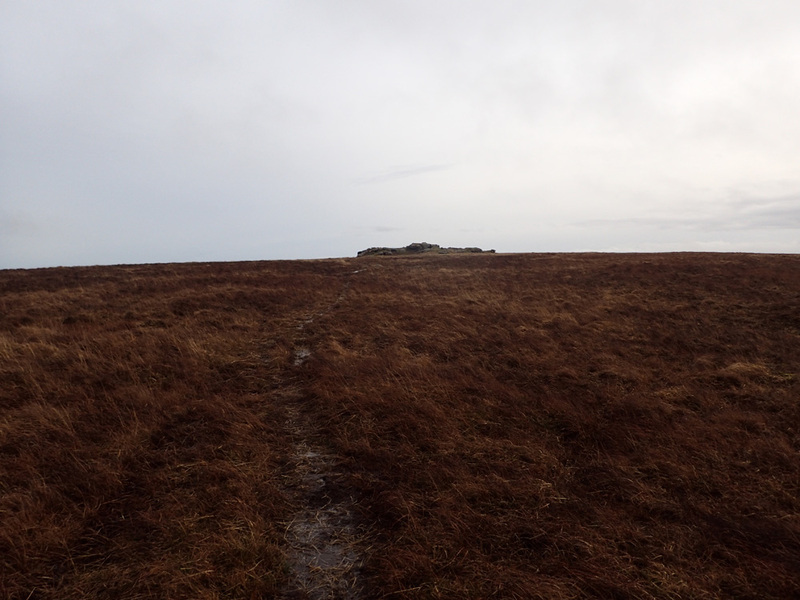 Up ahead is the cairn marking its top. Alas, I have arrived too early in the morning. As a result the cloud hasn’t had a chance to burn off. 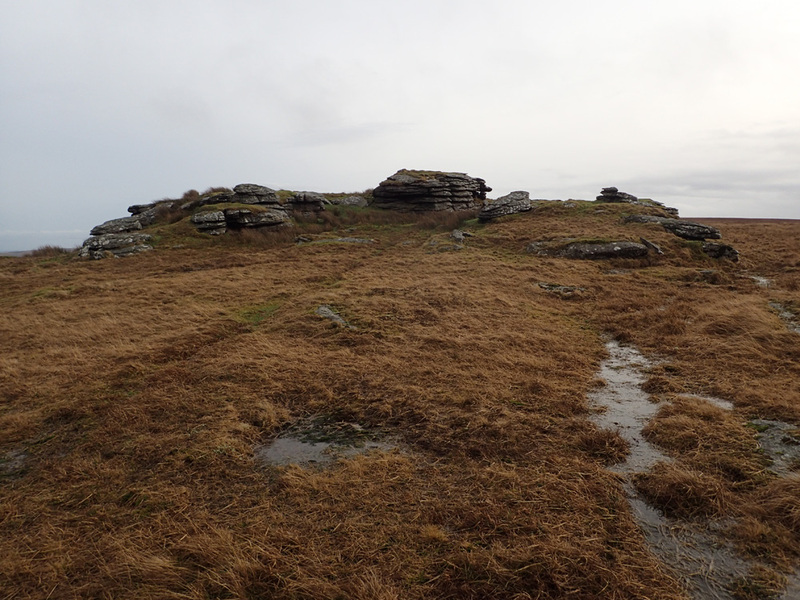 However, unlike my previous walk up here, the high winds ensure that I do get occasional glimpses at the surrounding scenery! 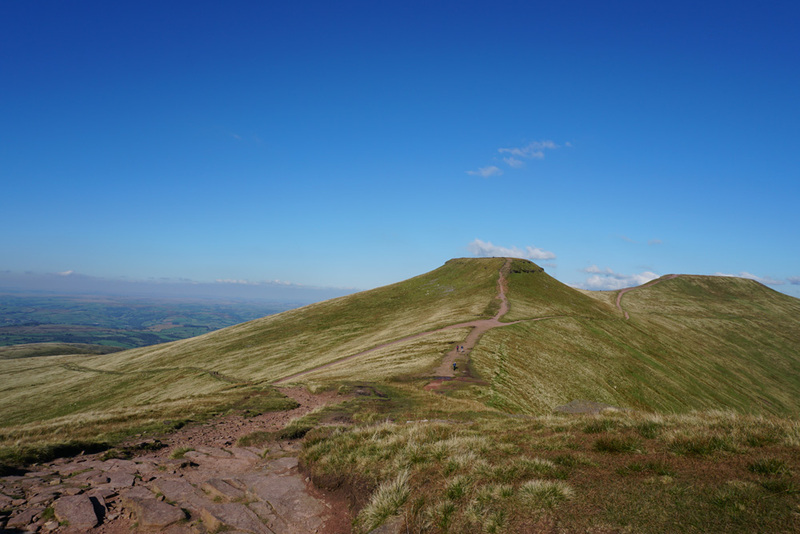 Pen Y Fan!!! 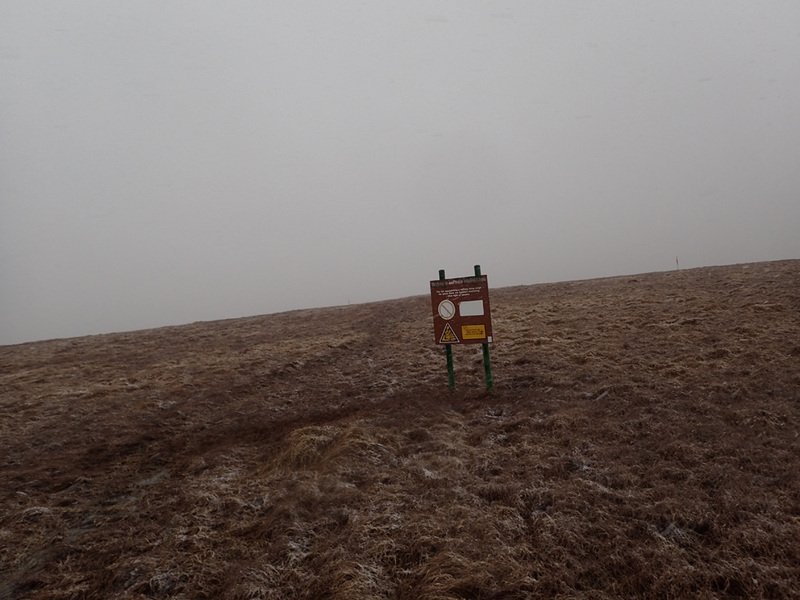 This is the highest point for today’s walk. 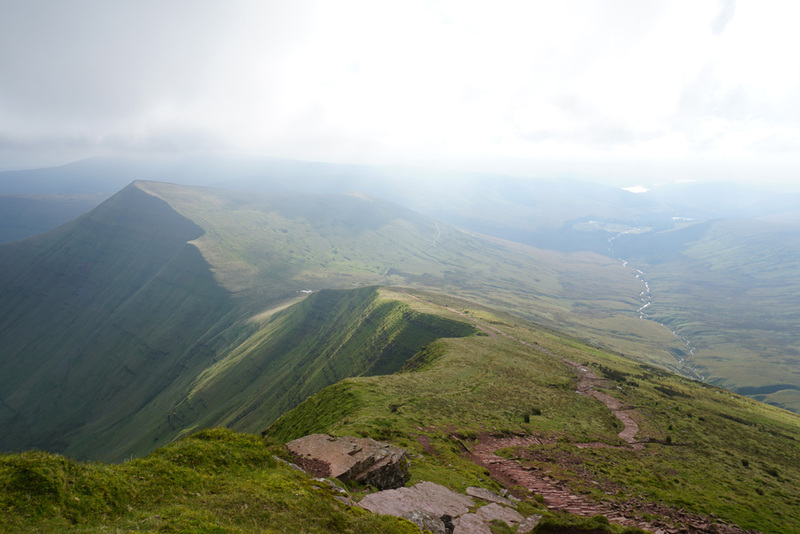 To the South West a lone walker and his dog start their descent down from Pen y Fan. The ‘God Rays’ are very much in evidence here too. I wish I had the presence of mind to actually film it. 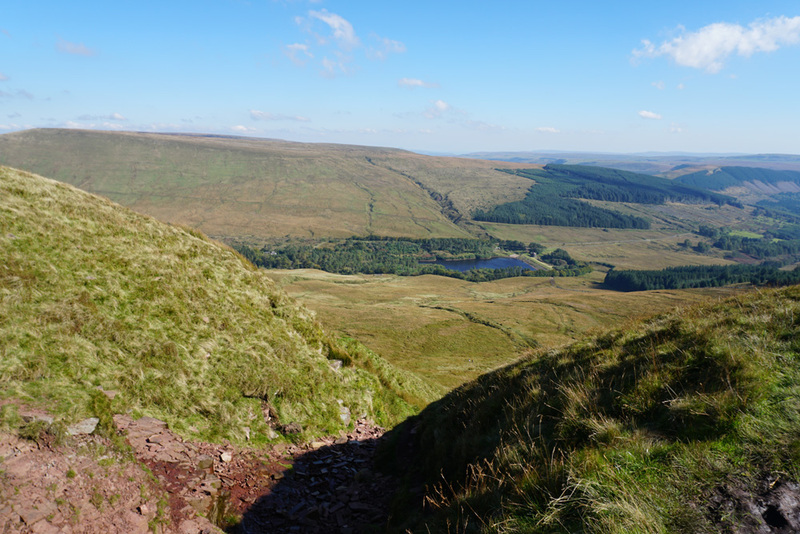 I now start the descent down Pen y Fan to climb Cribyn at 795 mtrs which can be seen just up ahead on the left. Today’s walk resulted in an ear to ear grin. I was so glad I jumped on the opportunity that this sunny weather slot provided! Behind me on the left is where I pitched my Akto tent on the first visit here. I soon get to the bottom, but have to take a detour to go around the water. 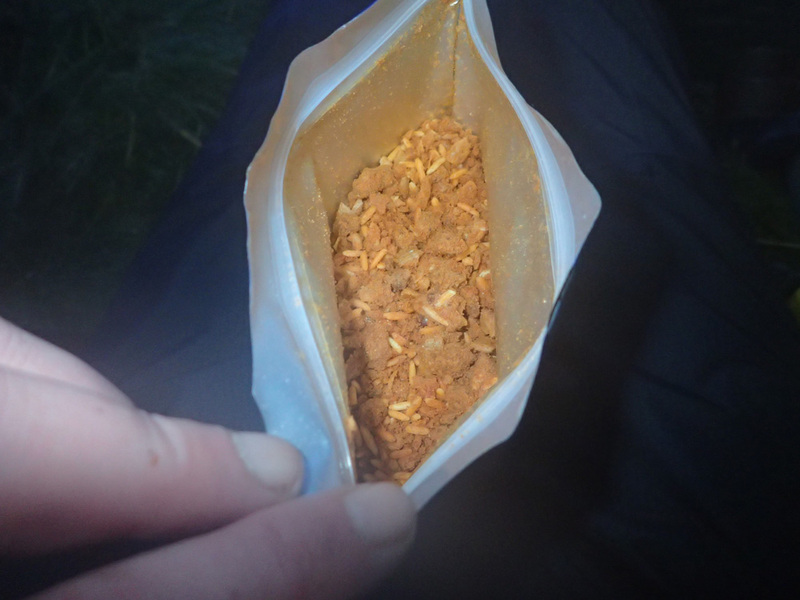 On my last trip, this was dried out which presented a problem as I needed water for cooking. Up ahead one can see the climb up to Cribyn. 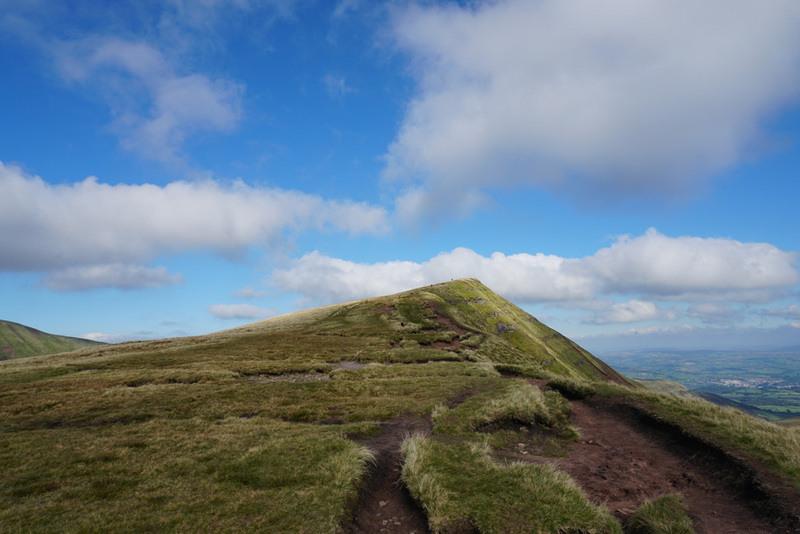 I had missed this mountain on the last walk due to running out of daylight – I was determined to make amends! 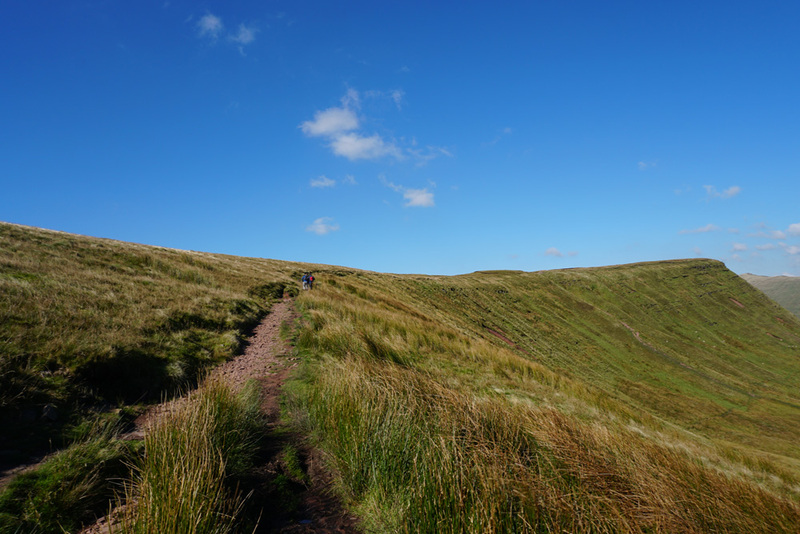 The climb up Cribyn is fairly steep and really takes it out of me. One thing this walk has taught me, is that one must stay fit between walks! I guess my exercise program will be restarted when I get back. 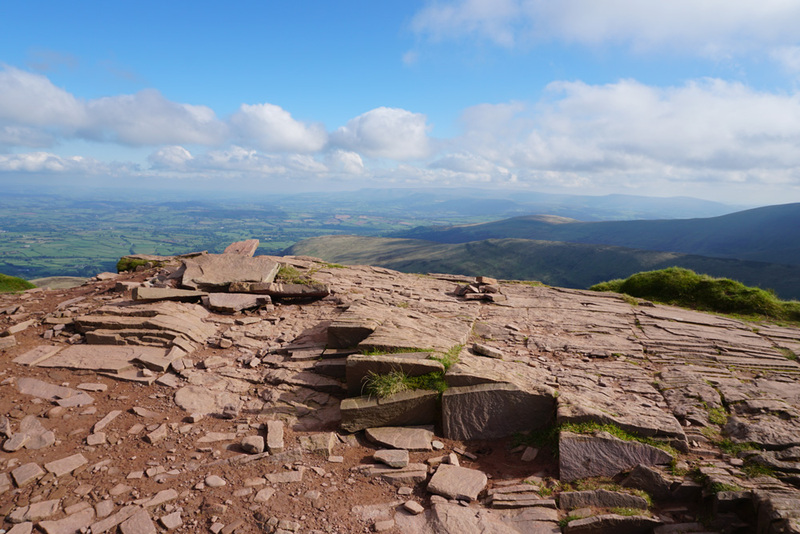 A look behind me toward Pen y Fan and Corn Du from right to left respectively. I have already gained a fair bit of elevation, but there is still a fair ways to go! The top now feels like it is in reach! 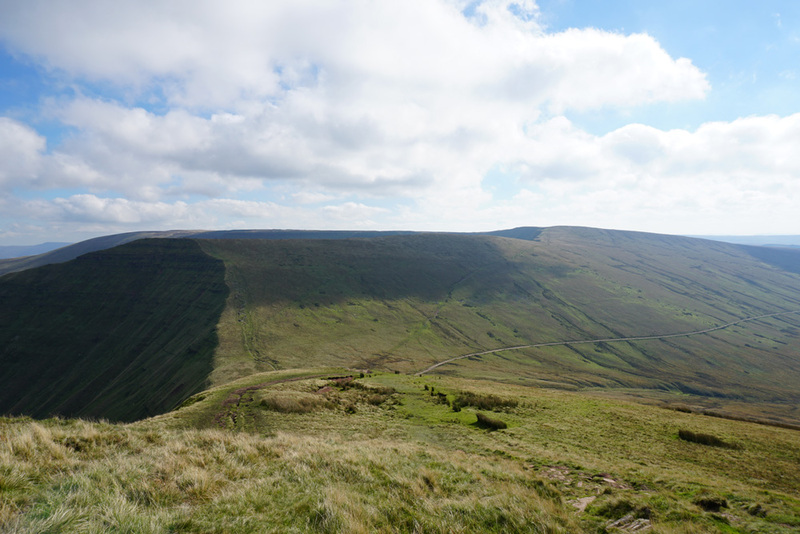 The excellent view from the top of Cribyn looking Northward. 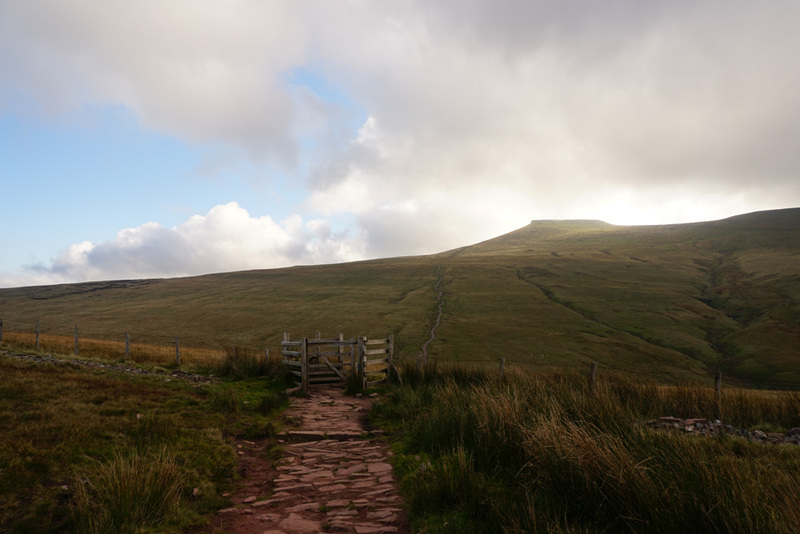 I now start my descent of Cribyn to the South East. 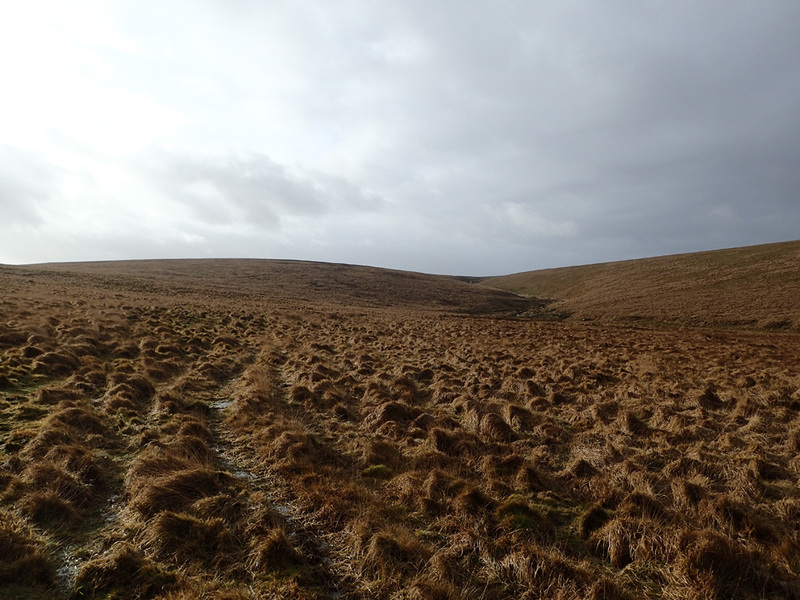 The route follows the ridge edge of Craig Cwm Cynwyn down to the track that one can see in the saddle up ahead. That’s my next destination. 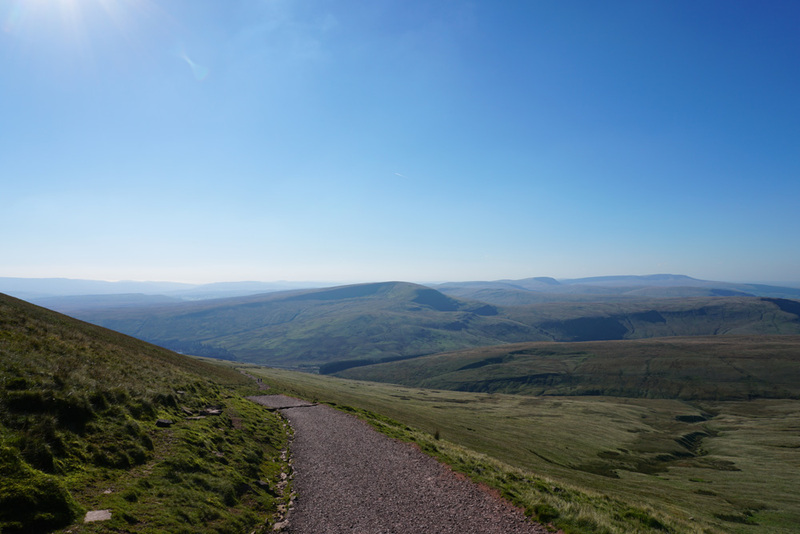 As I descend, I take a quick look behind me back up to Cribyn. As I descend the winds start to reduce in intensity. 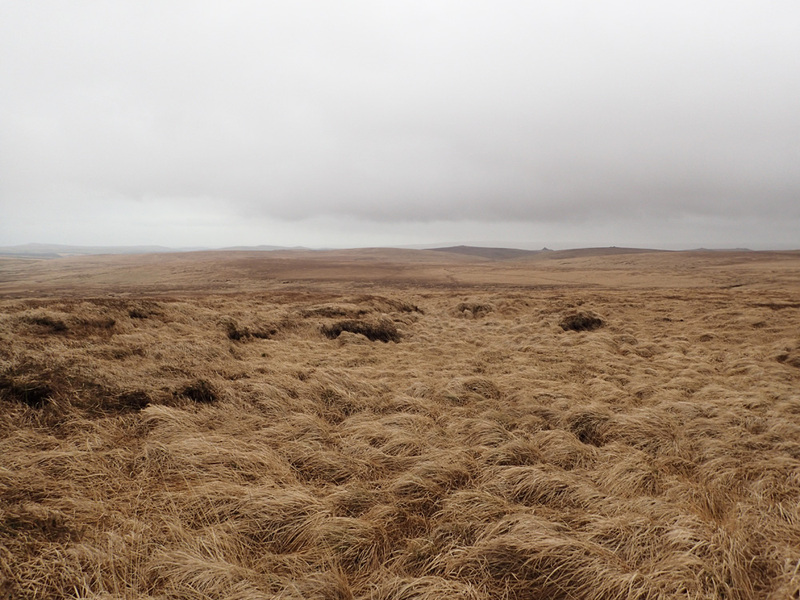 I was rather glad of this as being close to the edge with high gusting winds leads to a feeling of unease. 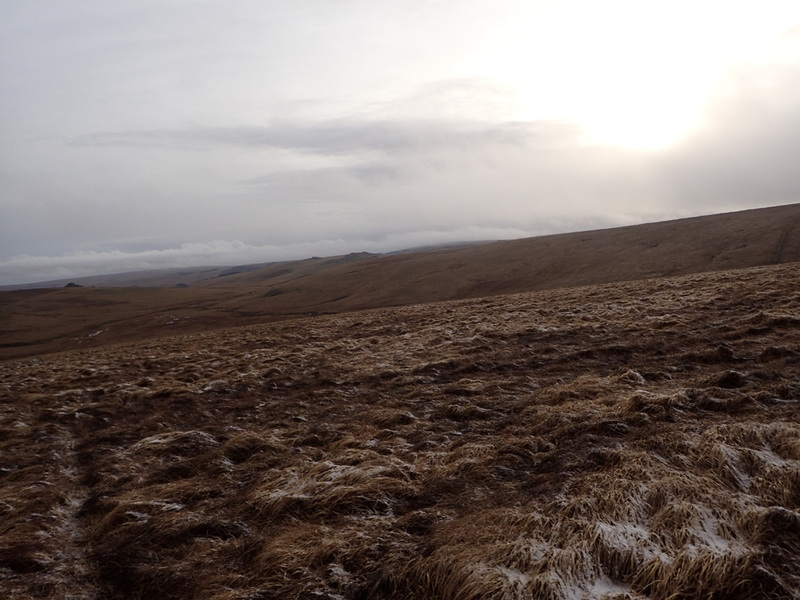 I can now see the track I will be taking down to the Upper Neuadd Reservoir. 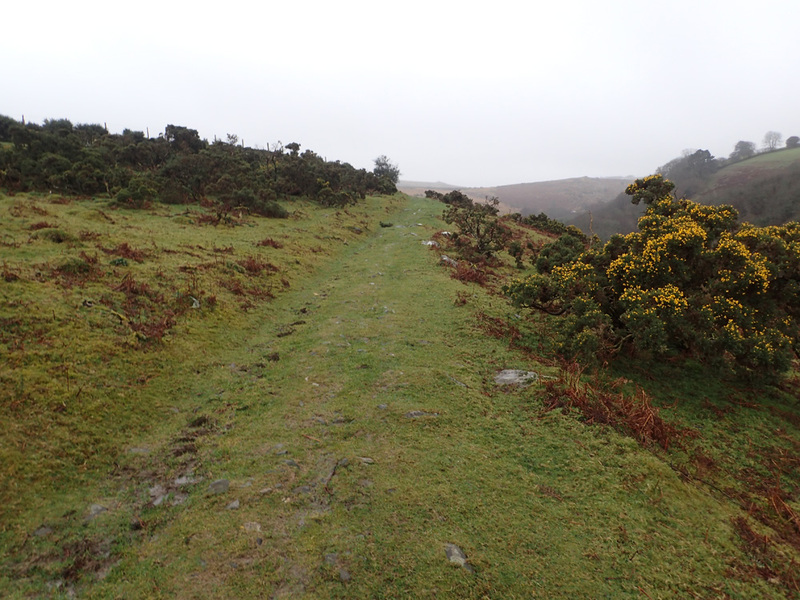 This is the track I had walked up on my previous walk. 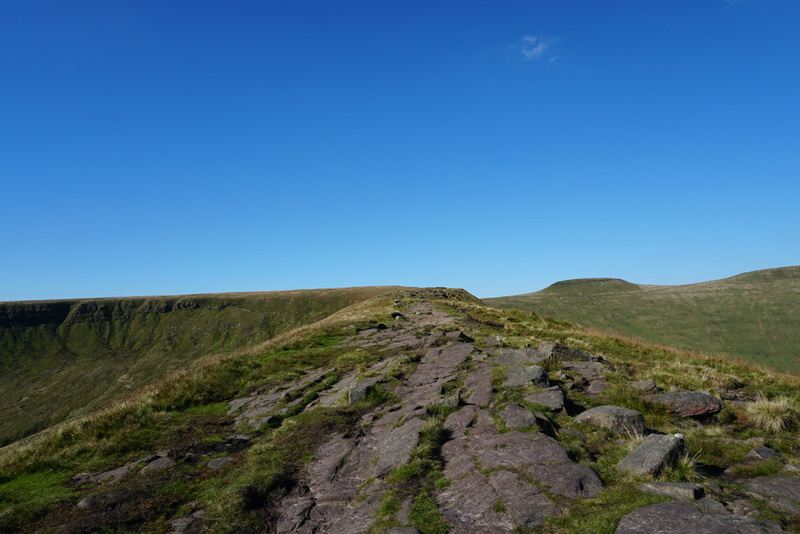 The peak up ahead is Fan y Big and is alas not on the itinerary due to time constraints. As I get near the bottom I see many soldiers climbing the mountain. I give them plenty of room as their packs look exceedingly heavy. I chat with their leader on the way down, their packs weigh a staggering 42 kg!!! I’m not even sure I could lift that. The most I have ever carried was 20 kg and that was in Winter for a 5 day walk. I can’t imagine a load of double that weight. These guys are obviously exceedingly fit. I soon get to the bottom and spot this sign. There is also a notice board, but it looks like it has fallen into disuse. 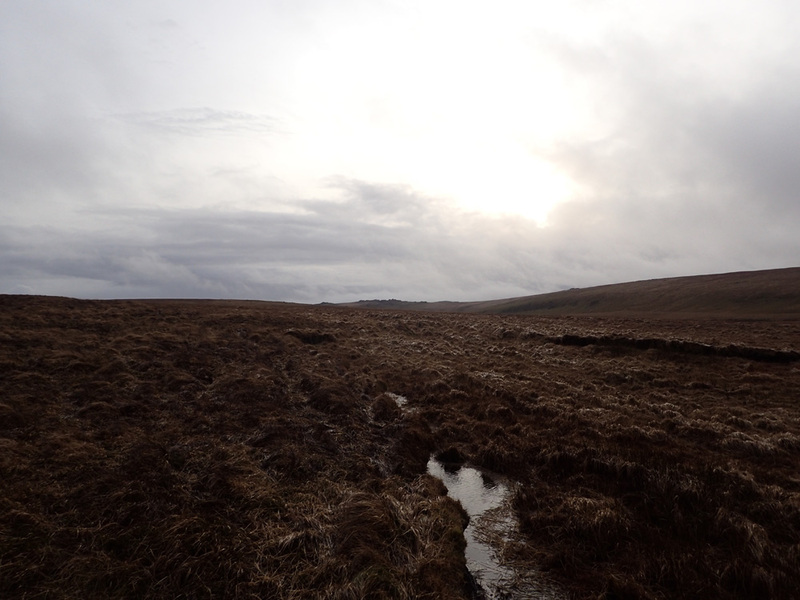 I’m now on the shallow descent down to the Upper Neuadd Reservoir which can just be seen to the centre right. There are no winds here, so I’m finding I’m starting to overheat, even after shedding my main fleece layer. I soon get to the bottom and hang a right to take me down to the reservoir itself. Up ahead is what I know will be the toughest climb of the walk. To my right is possibly the most Gothic Dam I have ever seen! 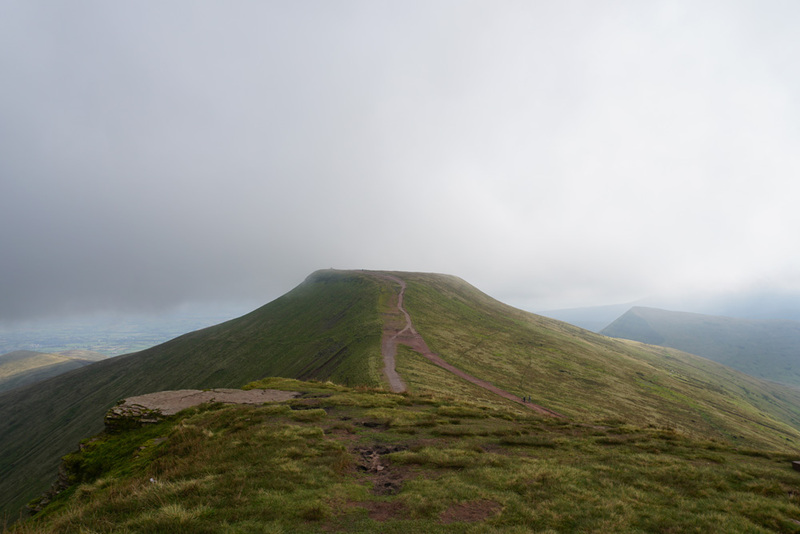 Corn Du and Pen y Fan now look a long way away to the North. 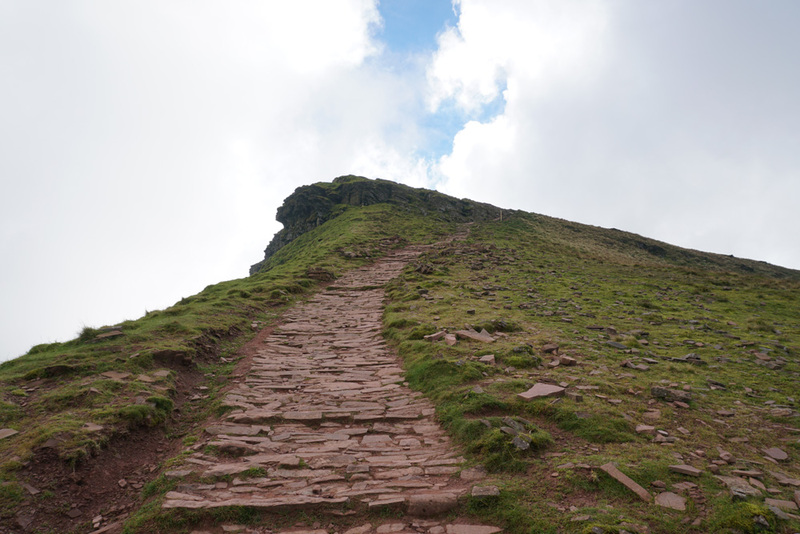 This is a close up of the final main climb of the walk up to Twyn Mwyalchod. It’s the last steep bit near the top which looks like it’s going to score highly in the ‘fun’ ratings! 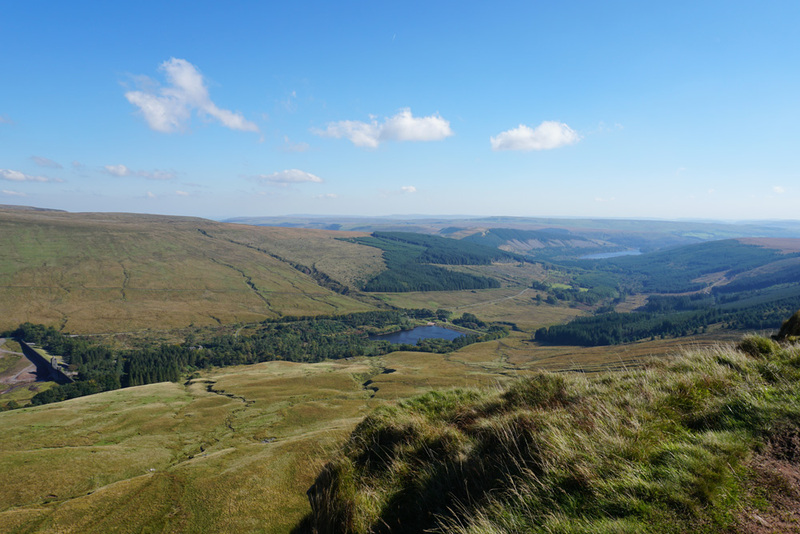 This is the view to the South from the Southern extremity of the Upper Neuadd Reservoir. I’m now on the dam of the Upper Neuadd Reservoir heading Westward. 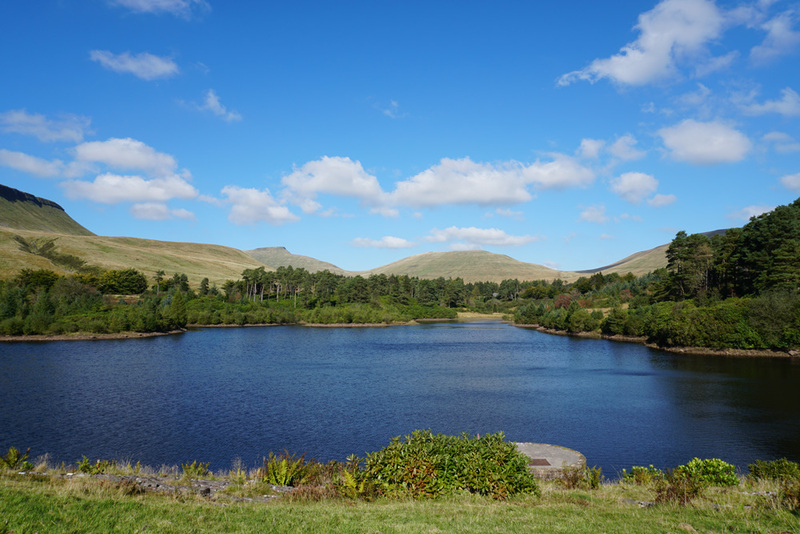 The view Northward across the reservoir up to the Mountains – simply stunning! I soon reach the gate that will take me to the bottom of the big climb. I take the opportunity to rest up and take on a lot of water. 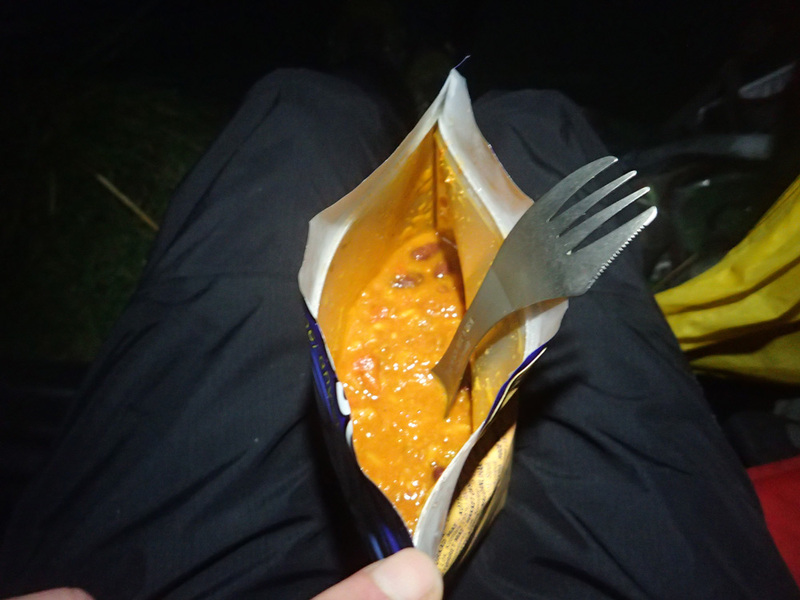 I decide to defer the lunch until after the climb so as to make it more comfortable. 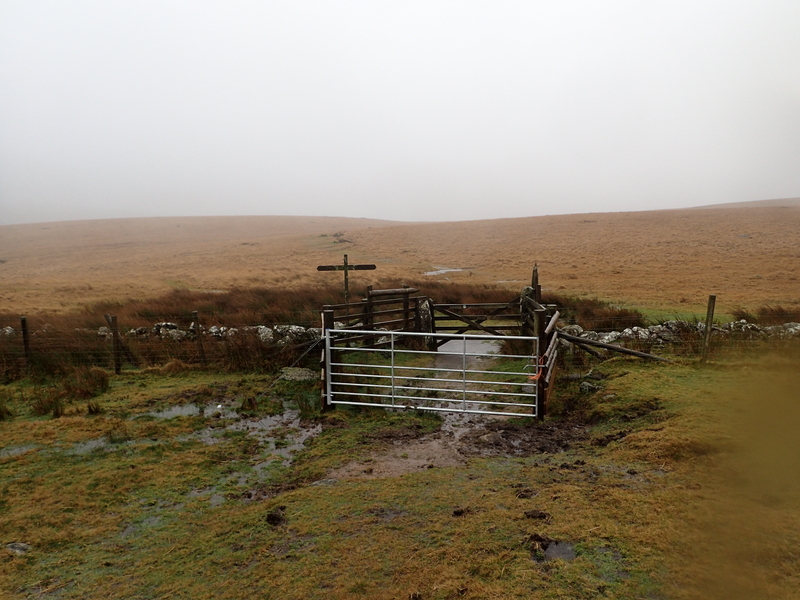 The terrain on the other side of the gate is exceedingly muddy. 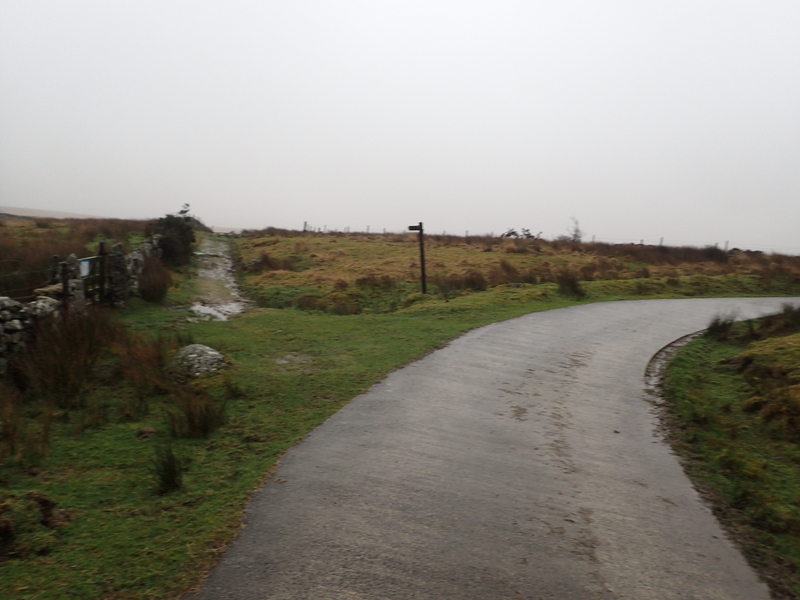 The route up is fairly straight forward as it is marked by bags of stone. 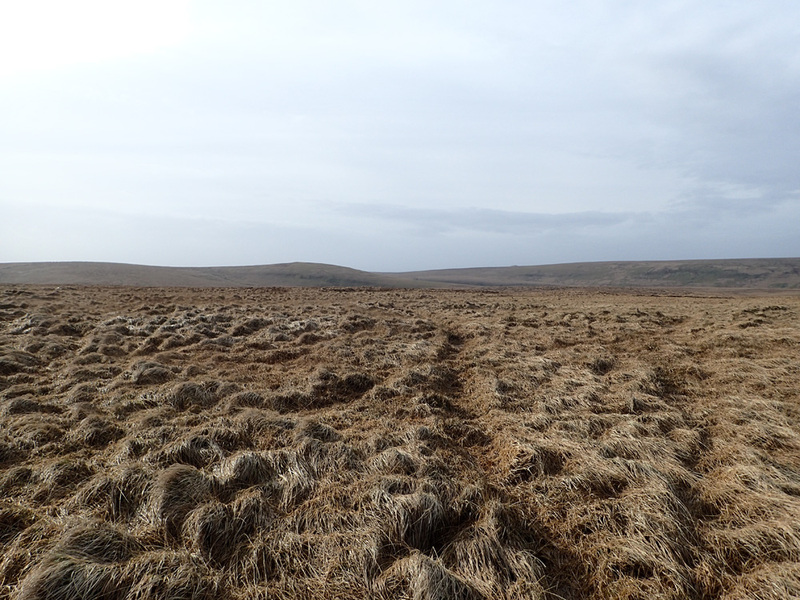 It looks like the National Trust are going to put a stone track in here. 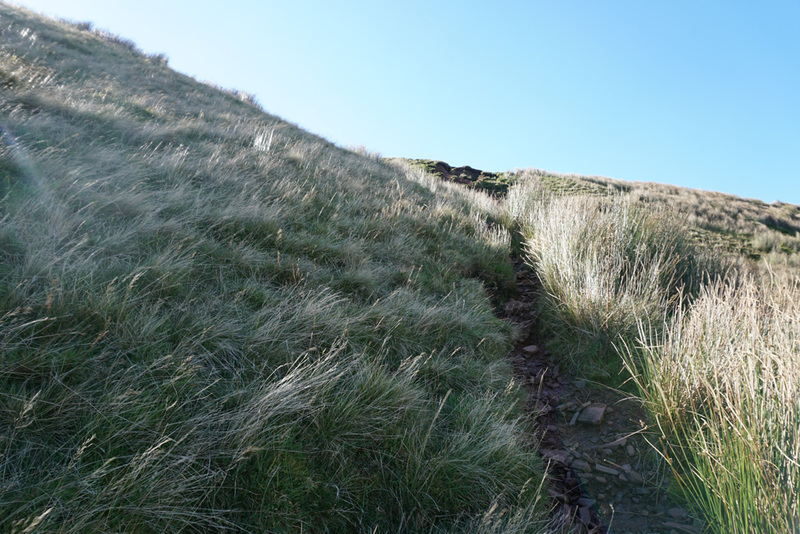 This would be a good move as the ground is exceedingly soft and muddy which hinders the ascent somewhat. These stone bags also serve as great dry seats for resting on too! 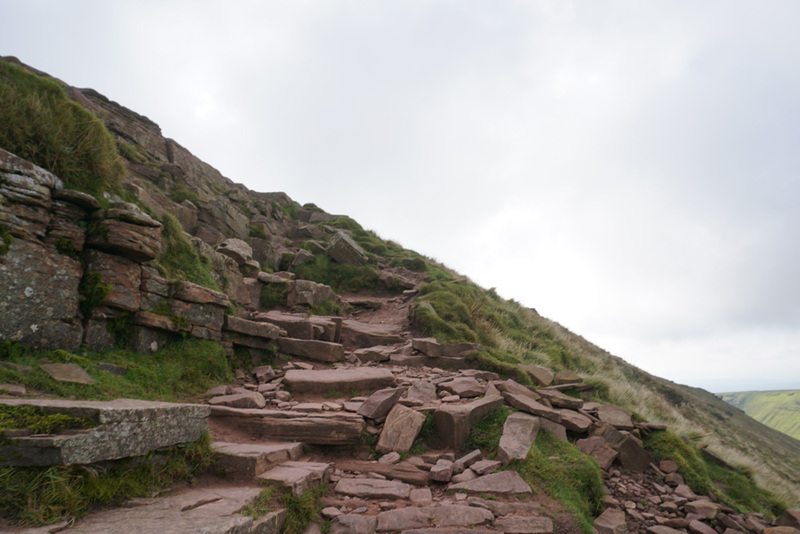 The final climb requires the use of all fours. 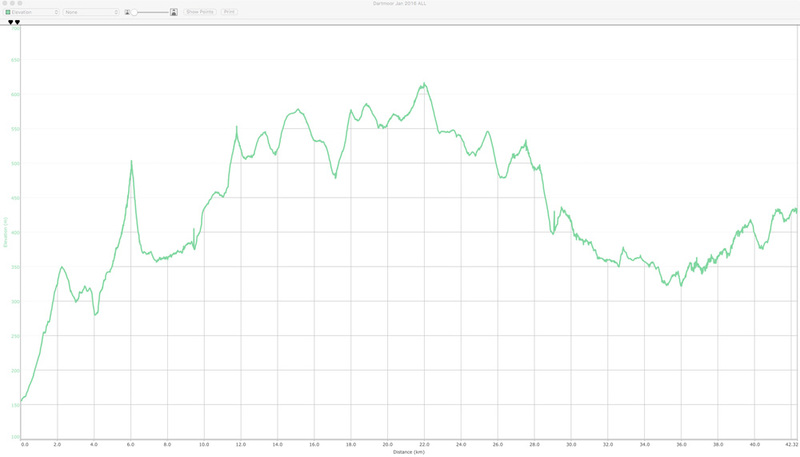 At this elevation the winds have picked up again. Although they make the climb a little harder, they are very welcome as they have the positive effect of cooling me down. I get to the top and shelter in this cut away. It is here that I decide to have my lunch consisting of a Cornish Pasty. This went down really well! 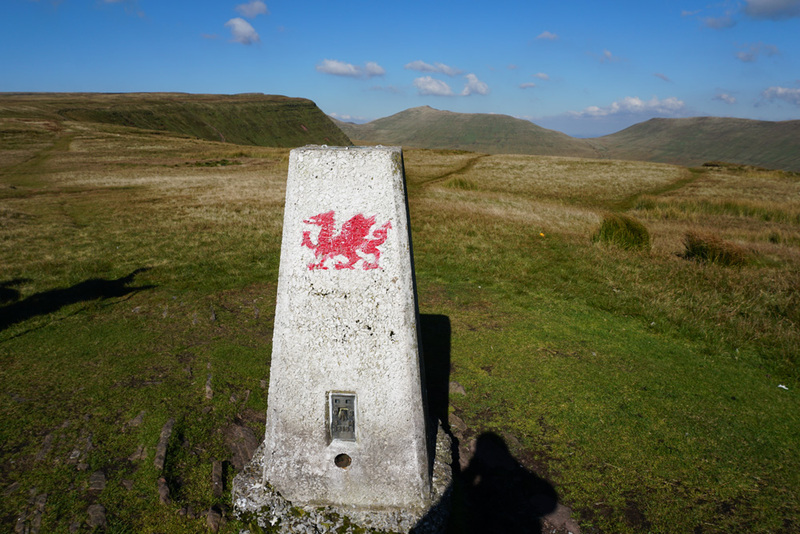 Before heading Northwards I take a quick diversion Southward to go to the nearby Trig Point. 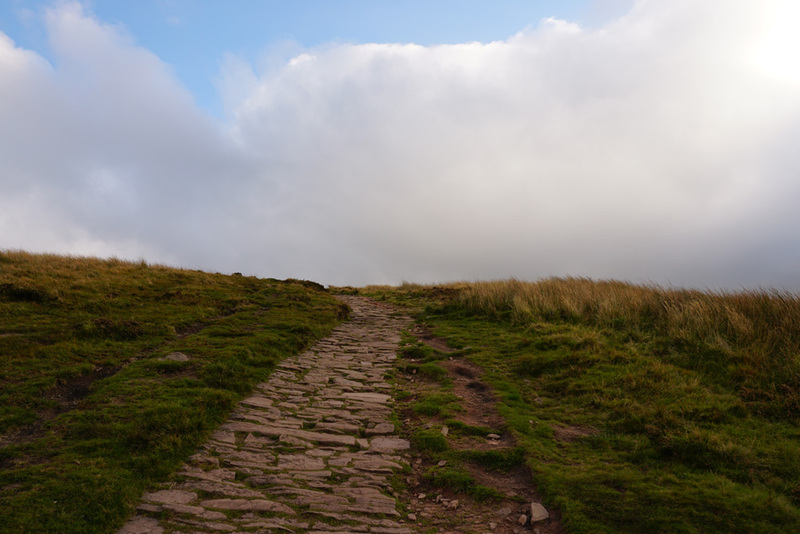 As an aside the climb up to 642 was the toughest climb of the whole walk. 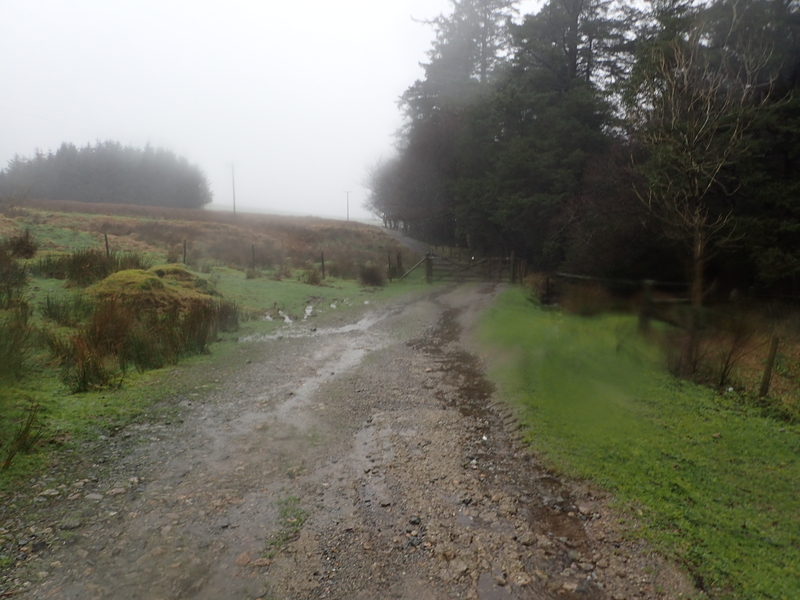 It was muddy and exceedingly steep! 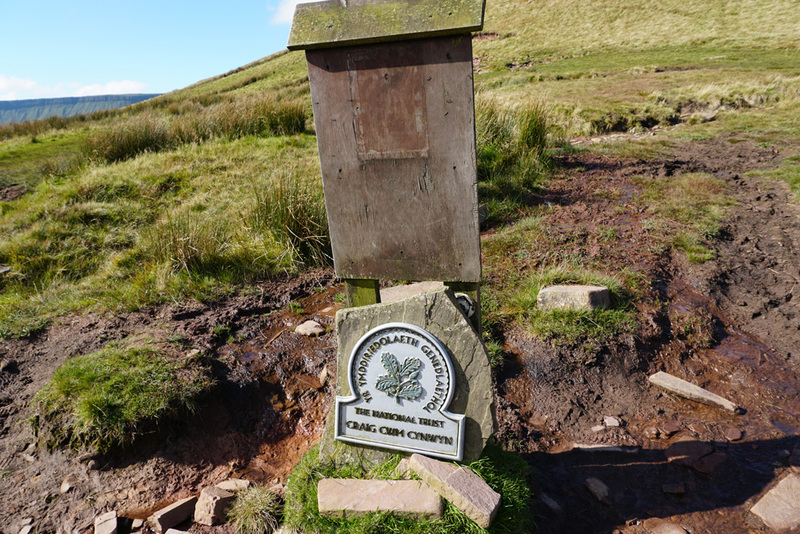 The result of my diversion – the Trig Point! 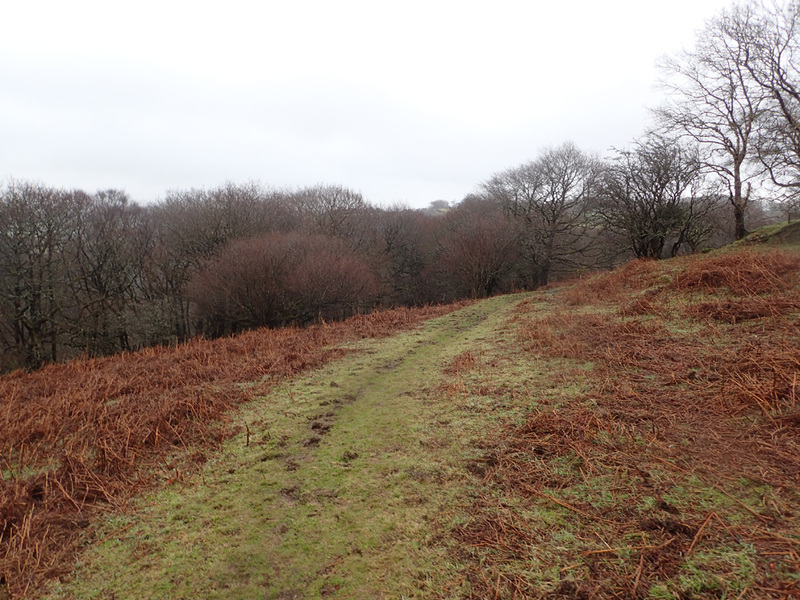 I’m now on the ridge walk Northwards. 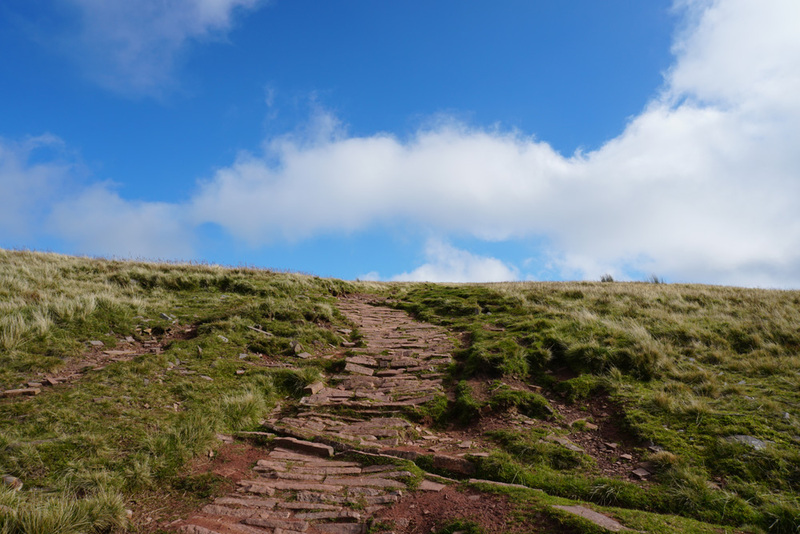 It’s a shallow ascent which makes for a nice pleasant stroll. The hard climbing for this walk is now behind me. 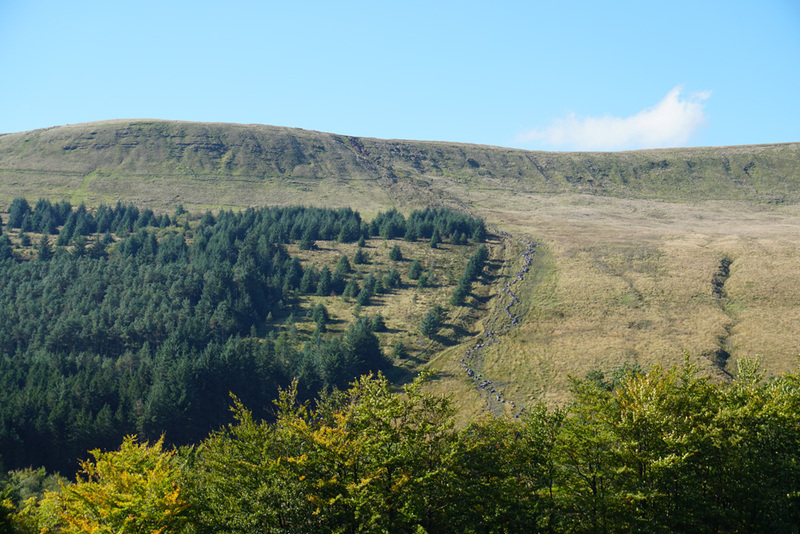 As I head Northward I see the second climb point up to the exceedingly steep ridge. 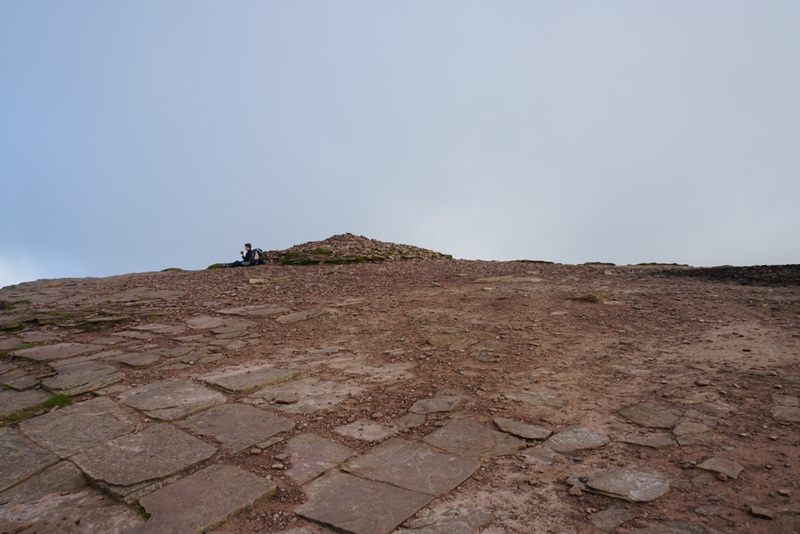 Down below are two people looking up and assessing the climb – they are there, you just need to look very carefully! I’m so glad that I have already got this bit out of the way! The trail runs quite close to the edge. The high winds mean that a certain amount caution has to be exercised. 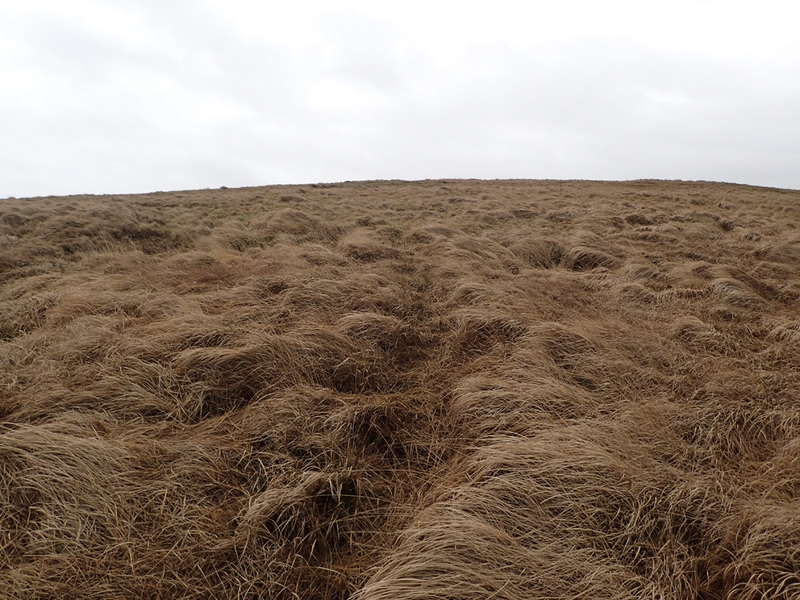 Though luckily the winds are blowing from right to left – so if anything should go wrong, I should be blown into the hill and not off it. The view behind me to the South is just stunning! 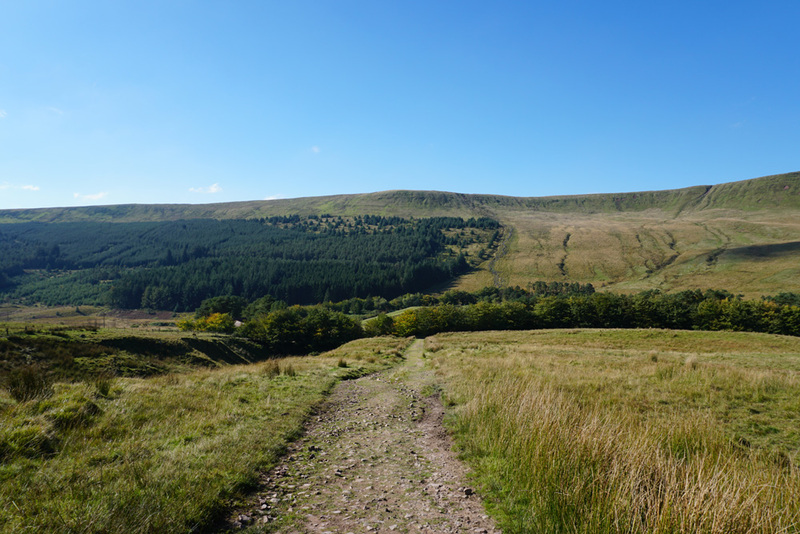 Up ahead is the Rhiw yr Ysgyfarnog ridgeline. From the map I was hoping it would be like the CMD Arete of Ben Nevis, but in reality, it is actually quite wide. On the ridge-line. There is plenty of room to swing a cat – if you are into that sort of thing! 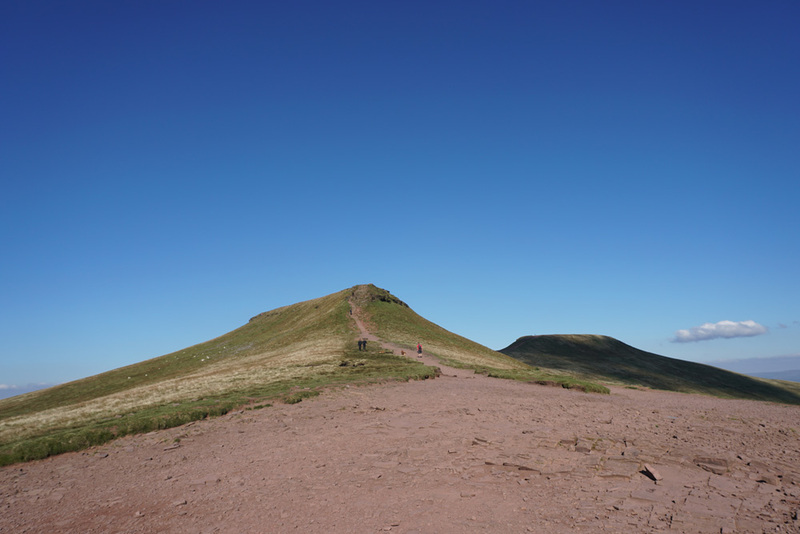 In the distance is the distinctive shape of Corn Du which I had climbed earlier. That’s pretty much where we are headed. I stop off at this cairn to polish off the last of my water supplies. 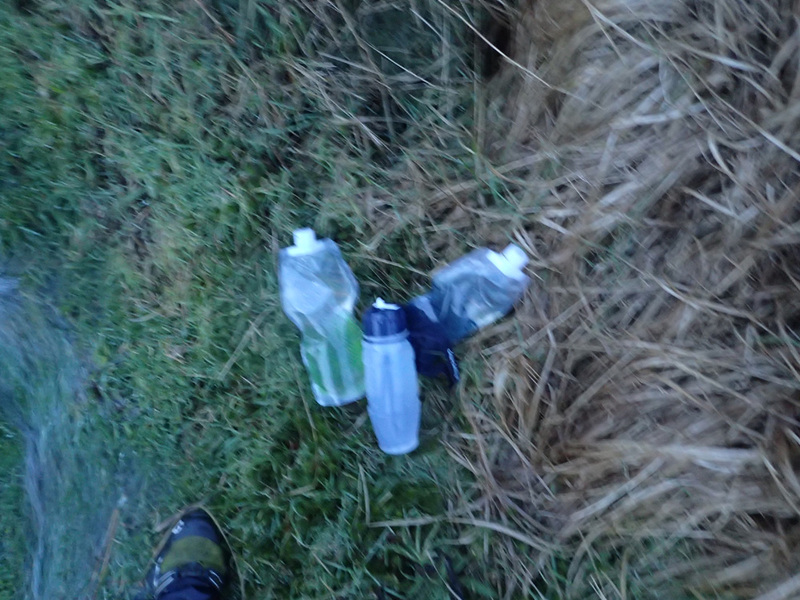 It seems that I had got my water provisioning for the walk pretty much spot on at 1.7 litres! 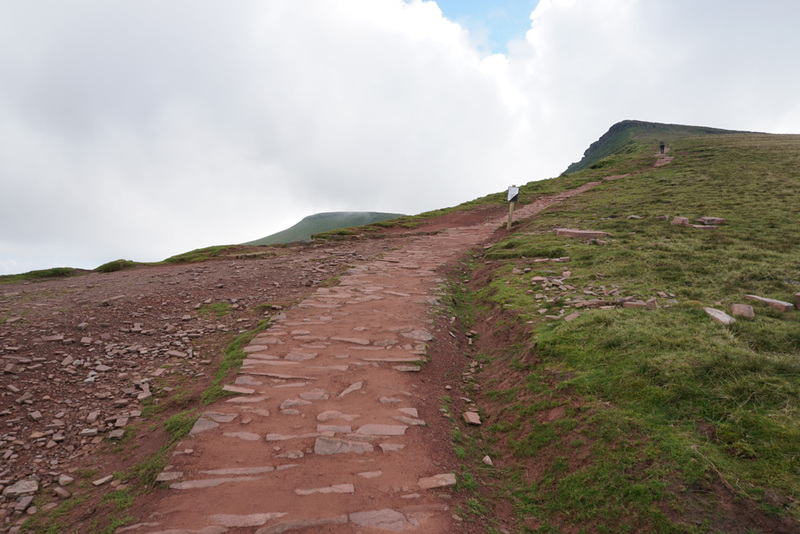 Up ahead at the base of Corn Du is the main trail leading down off of the Mountains. This is the one that I will be using for my descent. 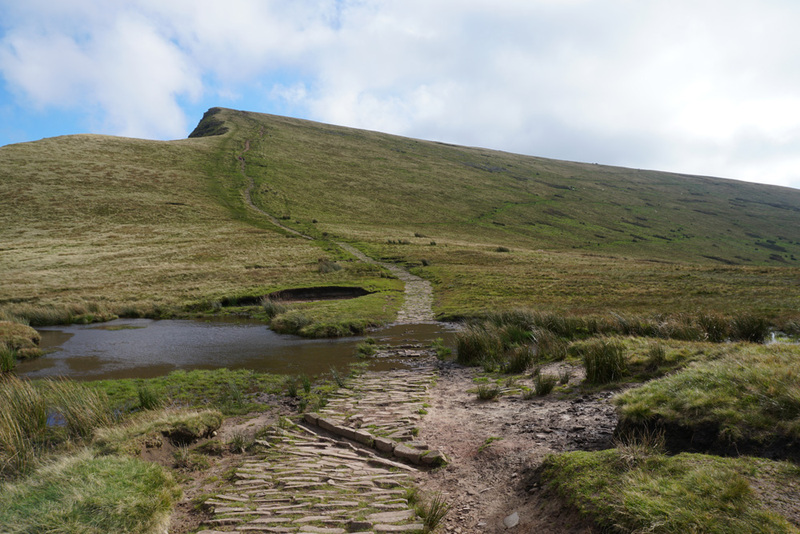 I’m now at the base of Corn Du and busy preparing my walking sticks for the descent. For those that don’t know, they make a huge difference to the preservation of your knees on long descents. They also provide additional anchor points, which are always useful when going down hill. The descent is now on. It’s time to leave the hills behind. 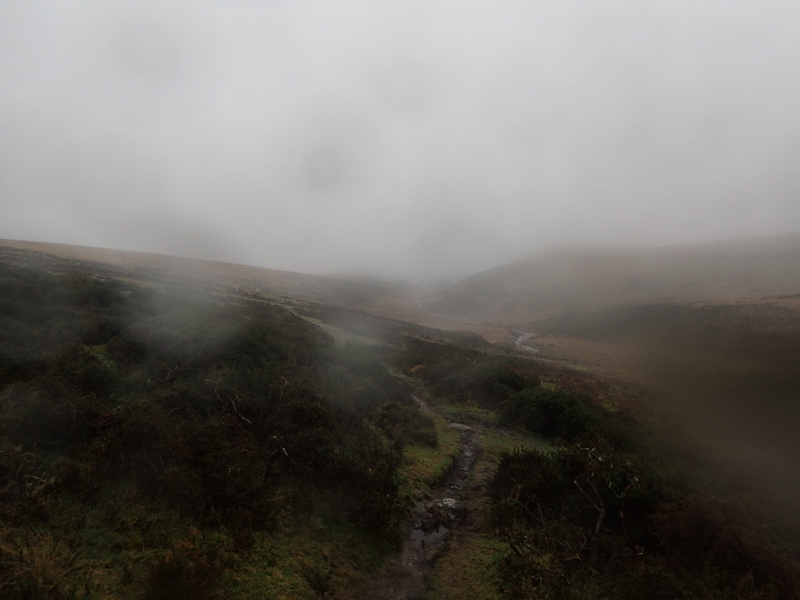 Whilst the terrain features broadly make sense, I’m a little concerned that I can’t see the Brecon Reservoir. As a result I start to question whether I’m on the correct descent path! 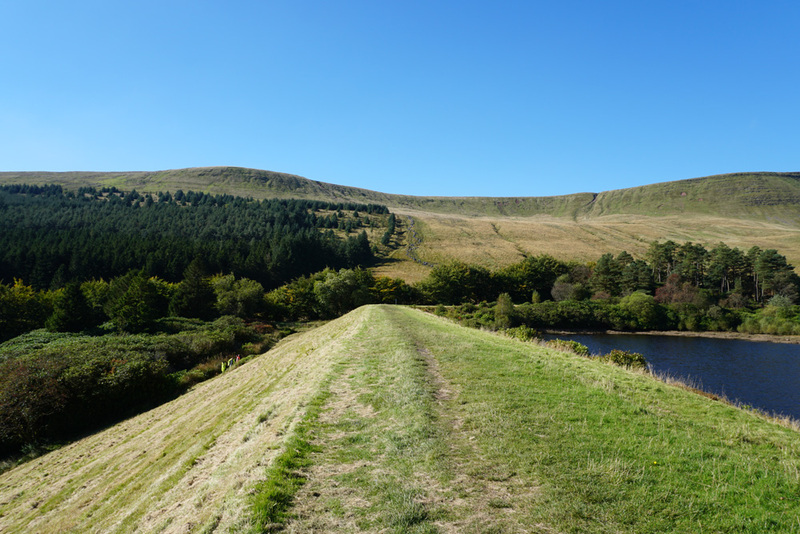 However, the reservoir soon puts in an appearance! At this stage of the journey I’m quite conscious of the clattering noise made by my walking sticks, I seem to be a noise polluter! Down below is the Car Park. This one is a good one in that it has full toilet facilities and a food wagon on hand! 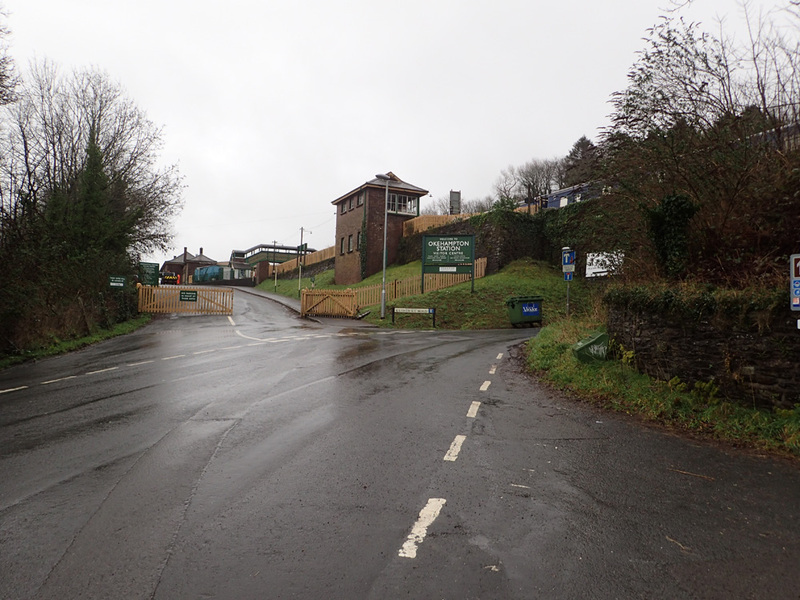 I soon get to the bridge for the crossing to the car park. The sign at the bottom. These are very informative and provide good background information for the area – well worth a read! 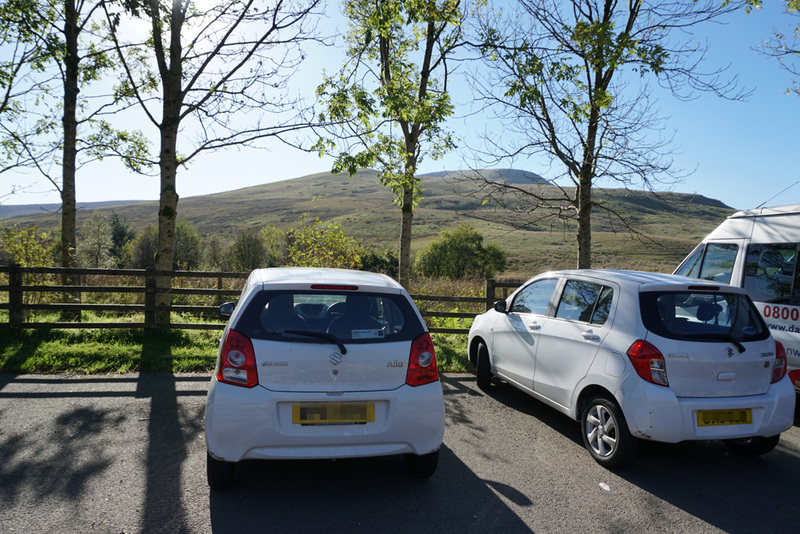 There’s the car park and the end of today’s walk. Finally back at the car. It was weird being able to drive straight back from a walk without having to rely on public transport. Even weirder is the way the pedals felt after a long walk – they certainly give your muscles a bit of a stretch. The trip back to Bristol proves to be a relatively quick and uneventful one. I hadn’t realised that this place was only an hour and a half away! I think I will have to make more day trips here. I’m so glad that I jumped at the opportunity that the weather presented. 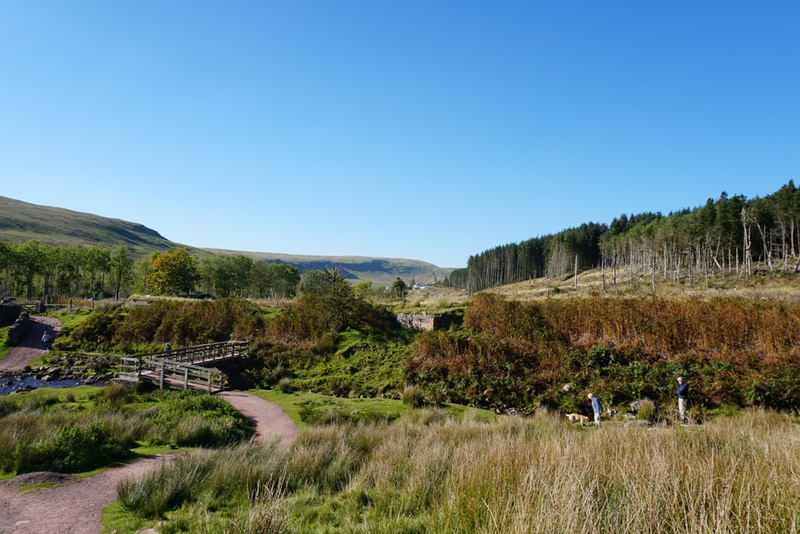 It made for a very pleasurable walk – one that I enjoyed immensely. Hopefully it will rekindle my passion for walking which had admittedly been in somewhat of a decline since last year. This walk also shows that one doesn’t have to do a multi-day day walk to go out and have fun! With the arrival of Virtual Reality, it would be fair to say that I have been somewhat distracted – hence the lack of updates or indeed walks! 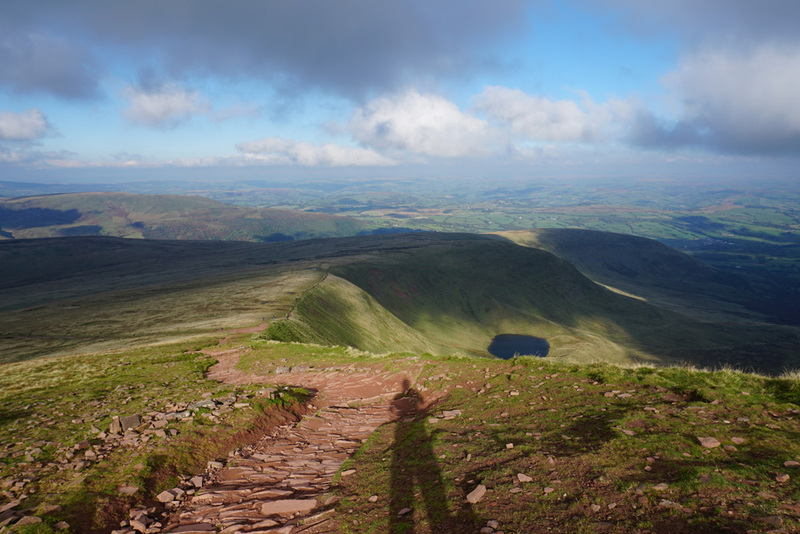 I still intend to hike and hope to be getting a 4 day walk in over the next two months or so. In the meantime I have decided to release the short videos that I made on my 2014 solo walk in the Cairngorms from Blair Atholl to Aviemore. These videos were never really meant for public consumption, they were filmed as a private visual diary so that I could reminisce over previous endeavours! 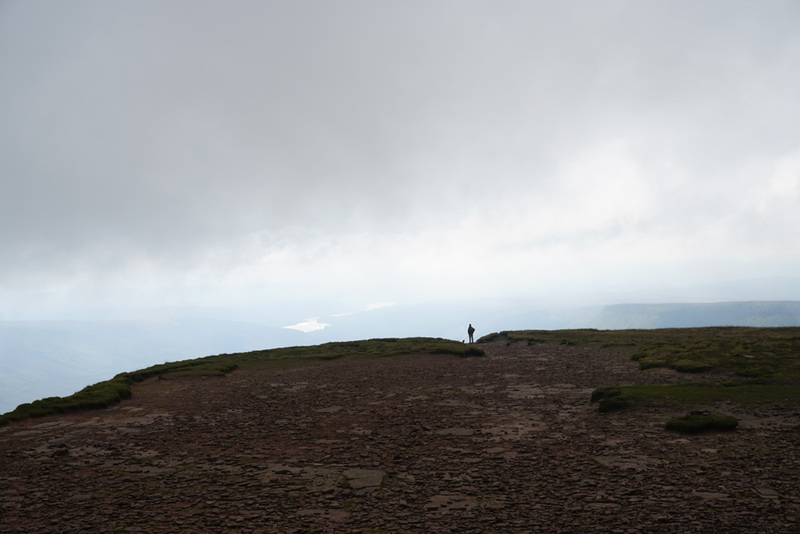 Nevertheless I have decided to put these out there – hopefully they will allow people to get a feel for some of the Cairngorm’s beautiful locations. 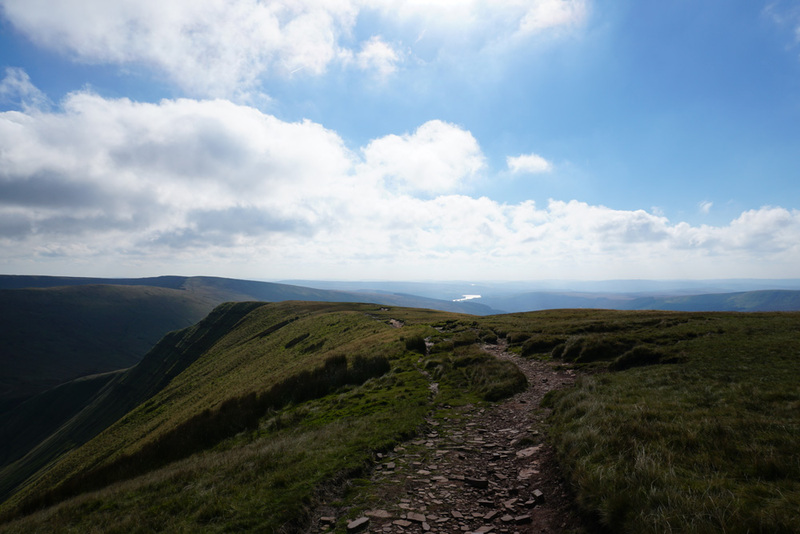 So here they are, 16 raw and uncut short video diaries covering Day 2 to Day 4 of this walk – enjoy! Day three was planned to be an easy day. 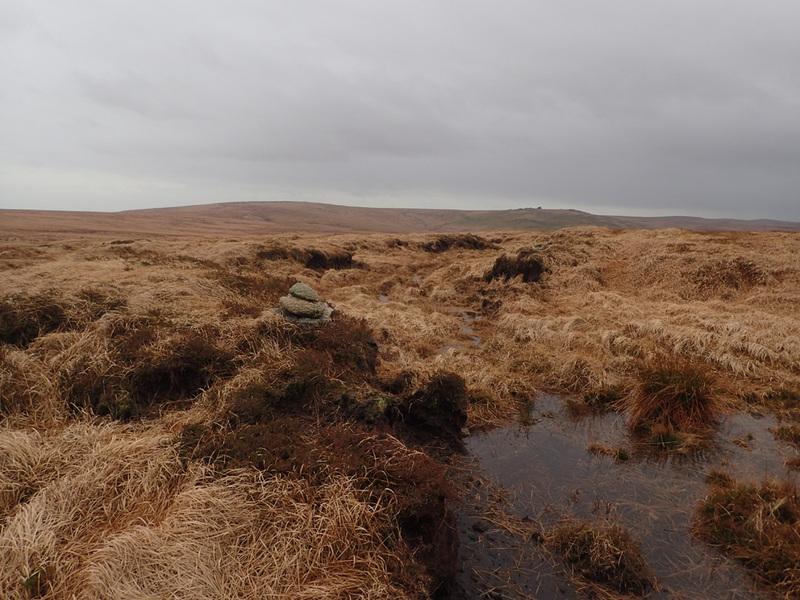 It was designed as a day to recover from the previous day’s Northern Moor crossing. 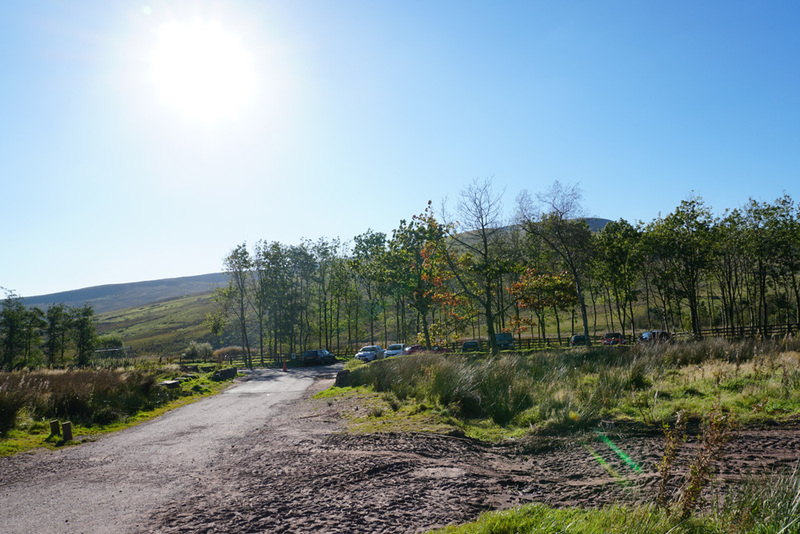 It included a lot of track walking as well as some slack as I knew that I would finally be getting to pop into Crockern Farm to meet up with fellow Bloggers! 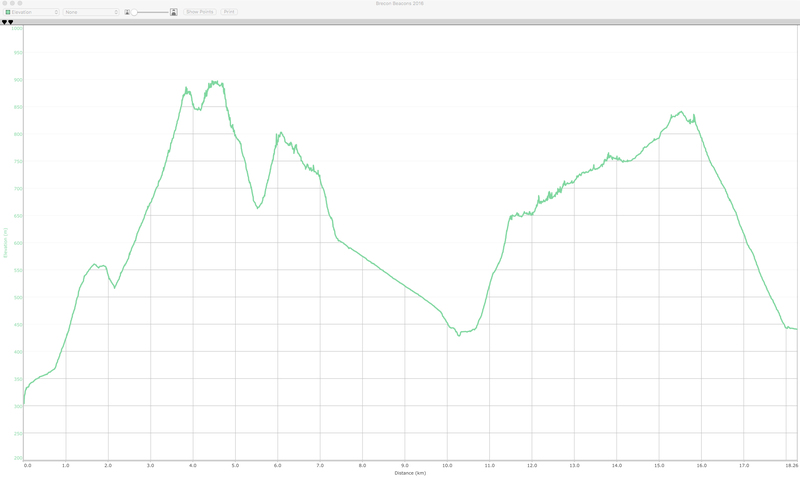 The elevation profile for Day 3’s walk. Topmost of my mind was the flying visit. I’m not naturally a social person, so I was a little anxious about the visit. But in the end things worked out well with Catherine and Roger proving to be impeccable hosts. Day three was the first time I have ever had to cut a walk short in the 5 years I have been doing it. Such decisions are never taken lightly, but the winds and poor weather finally got the better of me. At the time I had felt quite guilty about the decision, but since then I have come to realise that it was the right one to make. 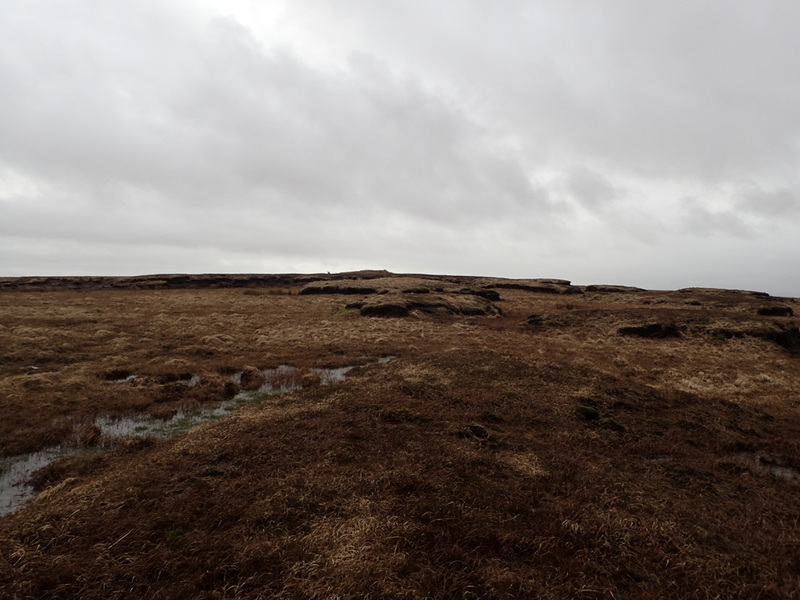 Had I not made it, I could have quite easily ended up on the wrong end of a rescue operation on the Northern Moors. I must apologise in advance for the quality of this post’s photos, however, the weather was not being conducive to the taking of these! I awake to the sounds of rain. As with Day 2, I immediately pack the sleeping bag and down jacket into their respective dry bags to keep them away from any moisture. Day 3’s view out of the tent! Time for breakfast! The warm muesli goes down particularly well on this cold morning! 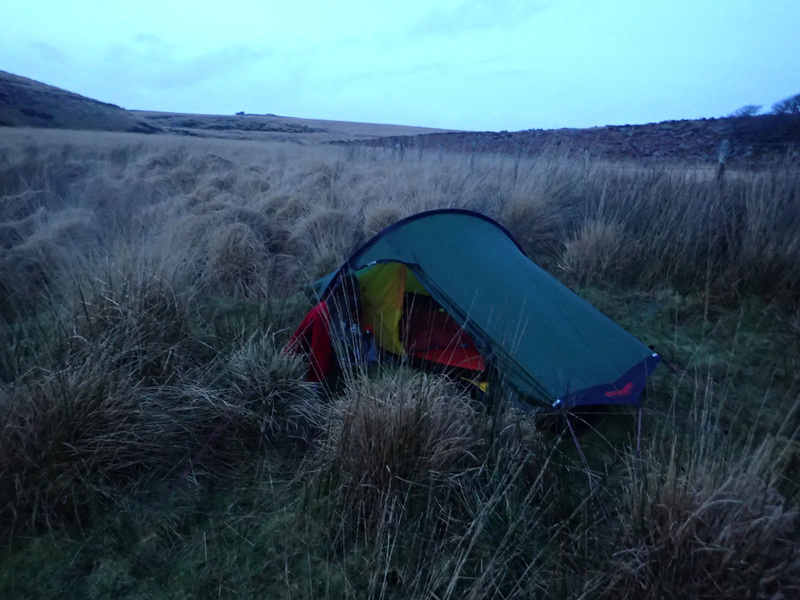 As with previous camp-spots I leave the ground in a pristine condition. 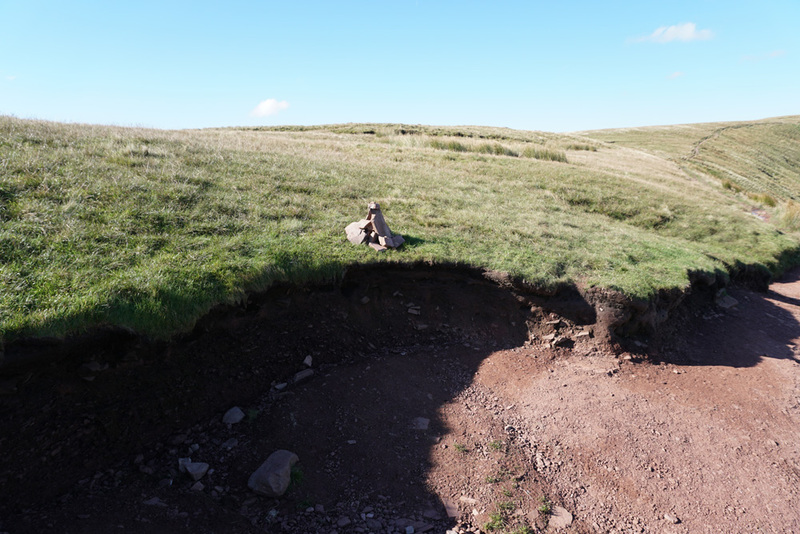 If you look bottom left, you can see the hole in the ground that ended up in the vestibule of my tent. 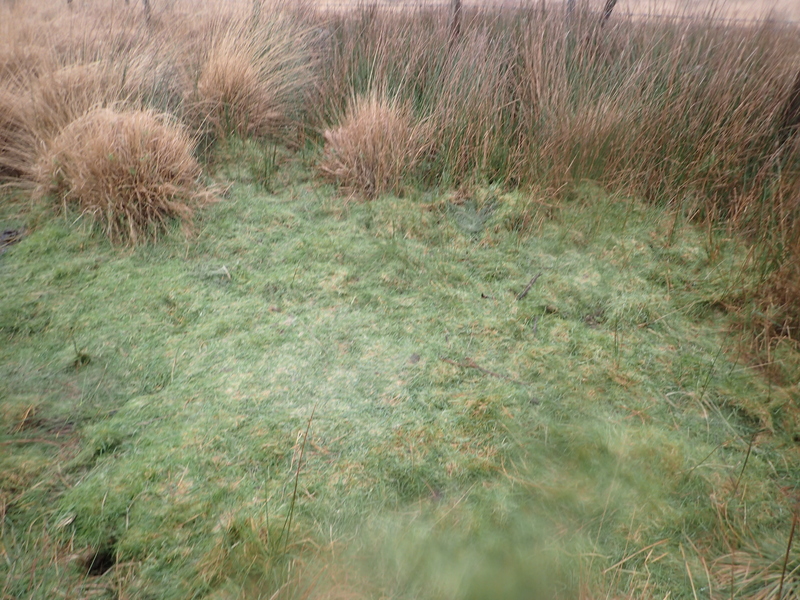 A quick inspection reveals that it does run fairly deep, which adds to my suspicions that I had accidentally camped on a burrow of some sort! Today’s initial plan is to handrail West Dart Southward to get me to Crockern Farm and then ultimately to the B3357 road. But before I start the handrail I need to climb the hill to my left to find the track that will take me in that direction. It doesn’t take long before I locate the trail Southward. 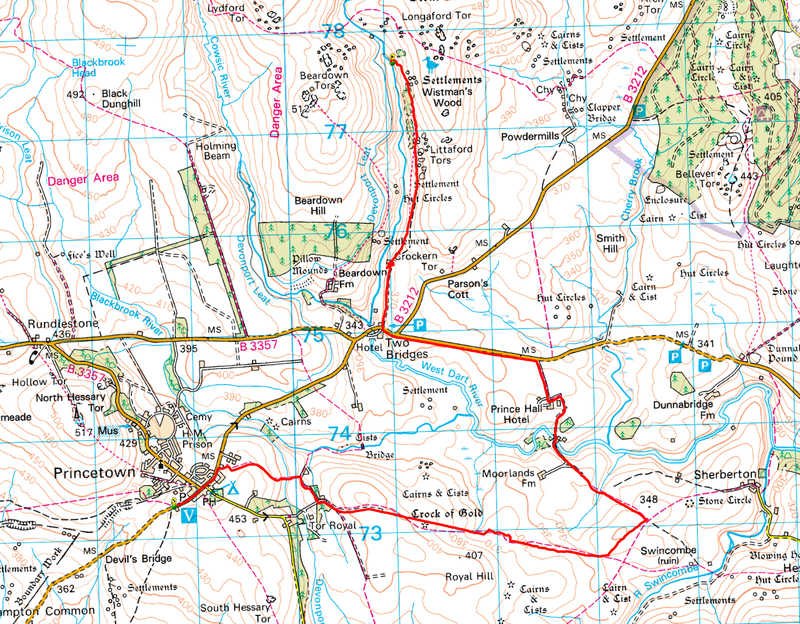 Navigationally speaking, today would be a fairly relaxed one as most of the walk would be on trails. Looks like this day’s weather is going to be non-stop rain. However, my thoughts aren’t about the weather, instead I’m thinking about the up and coming rendezvous with Catherine and Roger over at Crockern Farm. This is a big departure for me, as I don’t normally meet up with people on my walks! 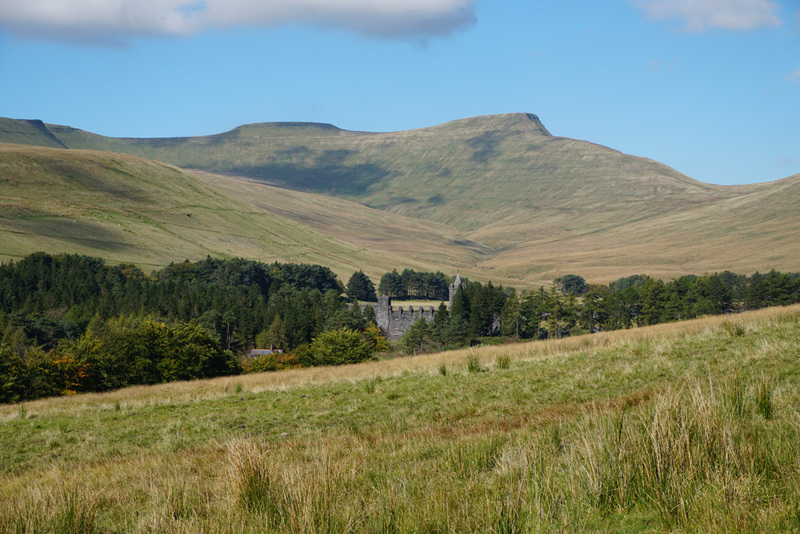 To the right are Wistman’s Woods. 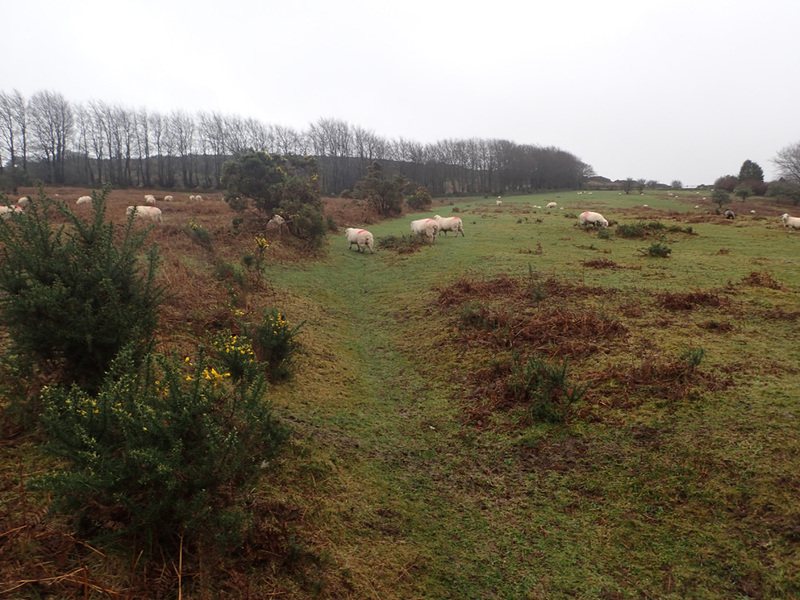 These woods are very similar to those at Piles Copse and Black-a-Tor Copse. 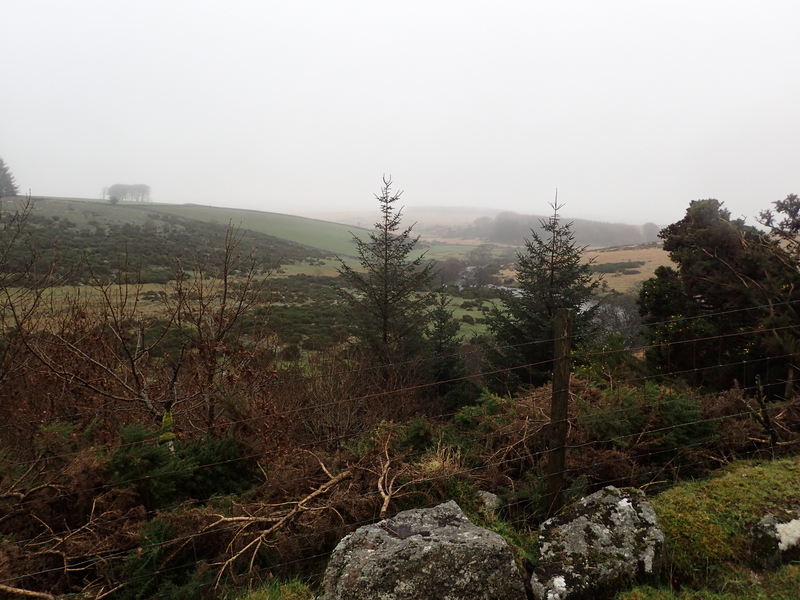 It is hard to believe that Dartmoor was once completely covered by the Oak trees that make up this wood. 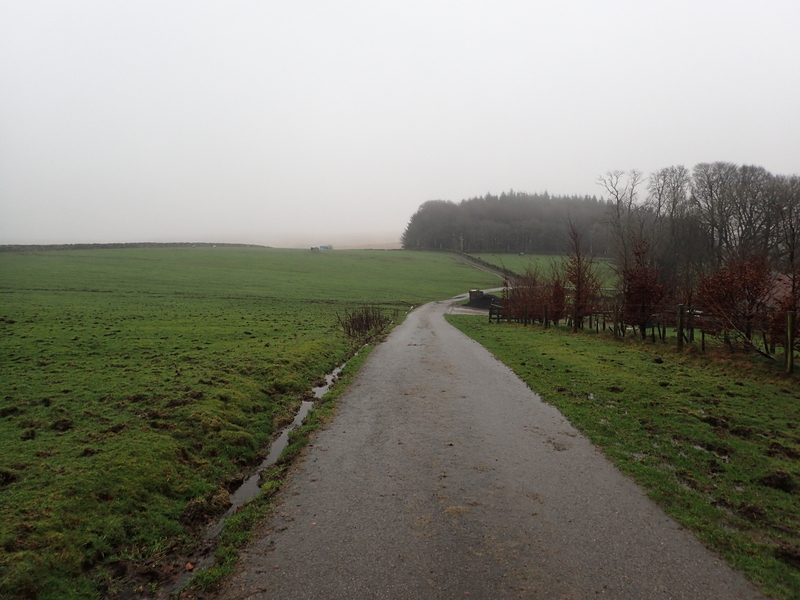 Through the rain and fog I can now make out some trees and what looks like farm buildings in the far distance. I soon get to the first boundary wall. These are handy features when following long tracks as they enable one to precisely gauge one’s progress on the map. 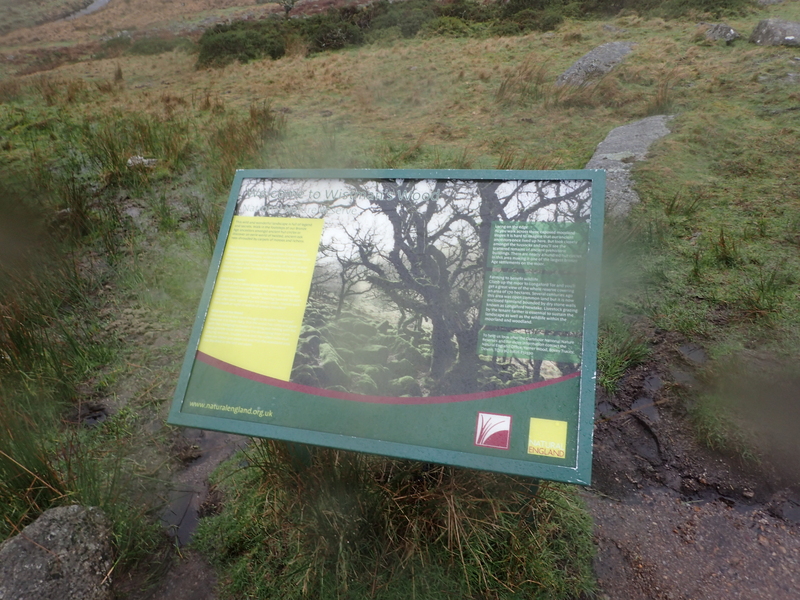 Before I cross the wall I take this photo of the signage for Wistman’s Wood. 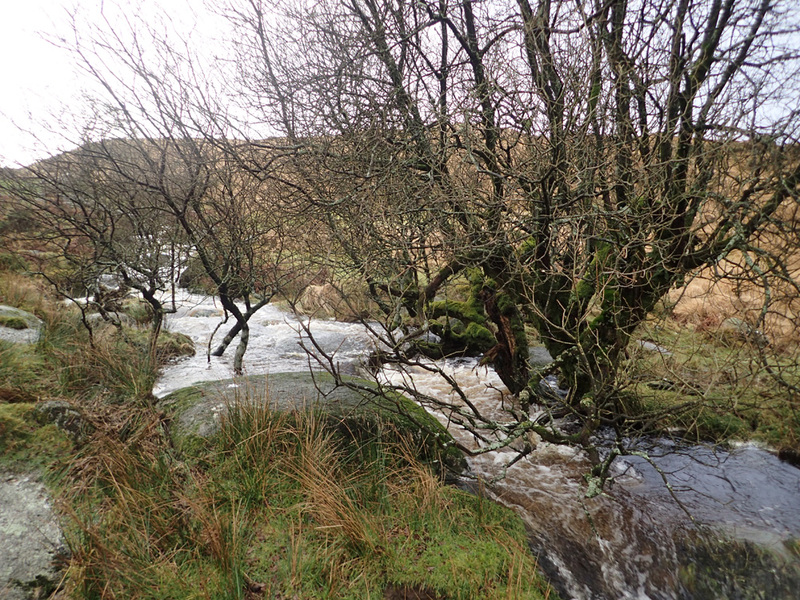 Like all the other Oak woods on Dartmoor this one is classified as a Nature Reserve. 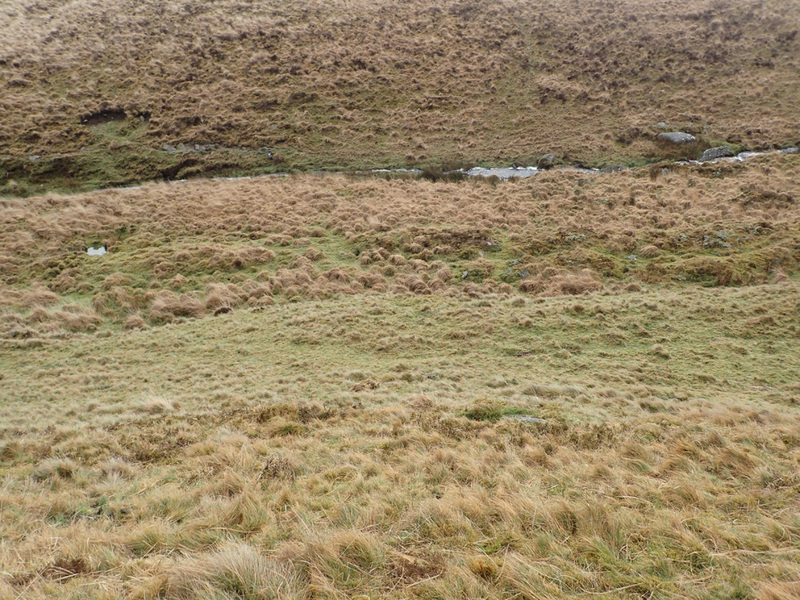 I’m rather surprised to see a group of young hikers heading off the Moors. They were right behind me and I didn’t even know they were there! Observation skills null-point! I look at the kit they are carrying and it looks exceedingly bulky and heavy. 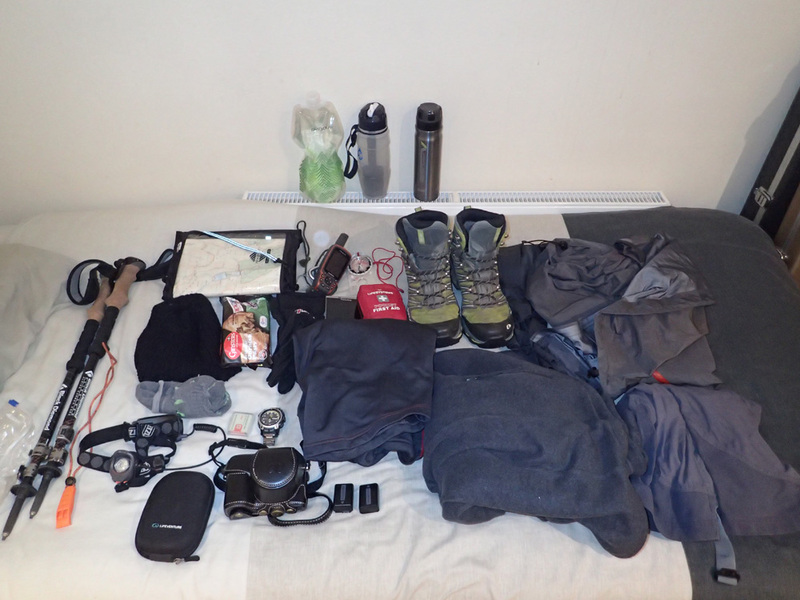 My rucksack is half the size and has equipment and food for 5 days – I’m not sure what they are carrying! I’m soon back on the trail. I work my way to the front of the other hikers, but it was kind of disconcerting to know that they were right behind me! 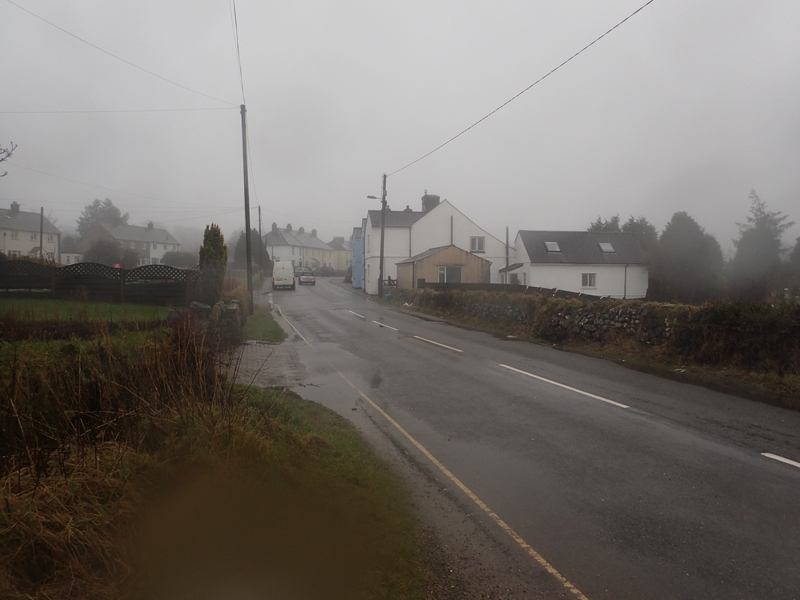 It doesn’t take long before I spot the outer buildings for Crockern Farm. I’m now a little anxious as I’m not really a social animal. I guess my introverted nature puts paid to that! 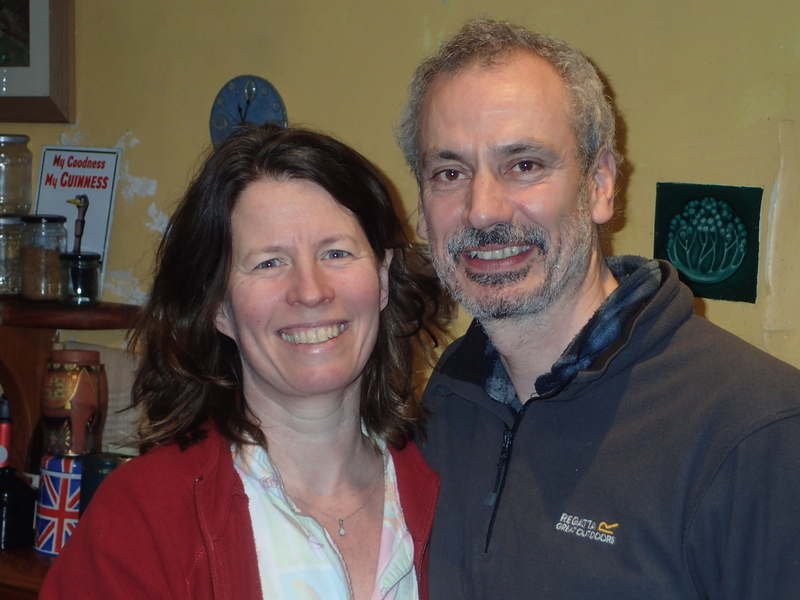 I pop into Crockern Farm where I meet up with Roger and Catherine for the first time. 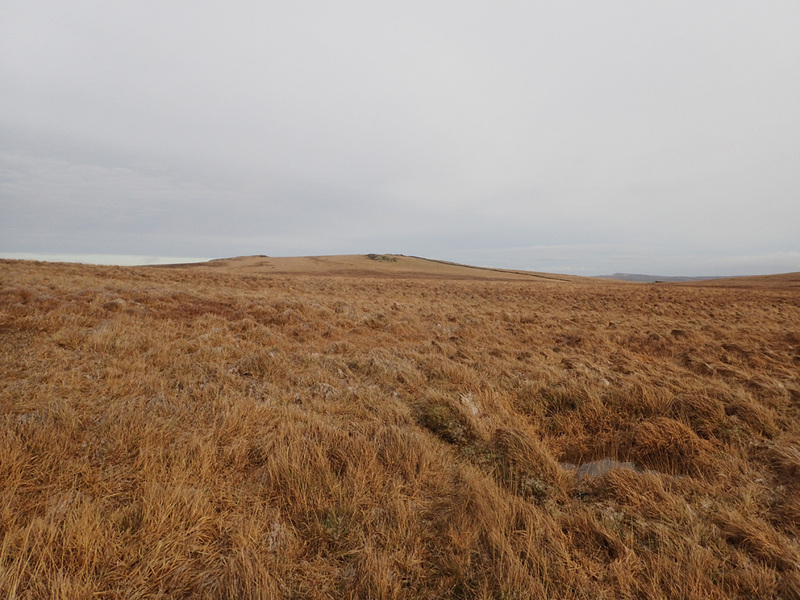 I had always intended to pop in during one of my walks, but the nearby terrain makes it relatively difficult to put a decent North to South Dartmoor plan together. We swap many stories and I get to look around their excellent abode. The work they have put in over the years is certainly paying off! If you want to read more about their adventures pop over to their Crockern Farm Blog! 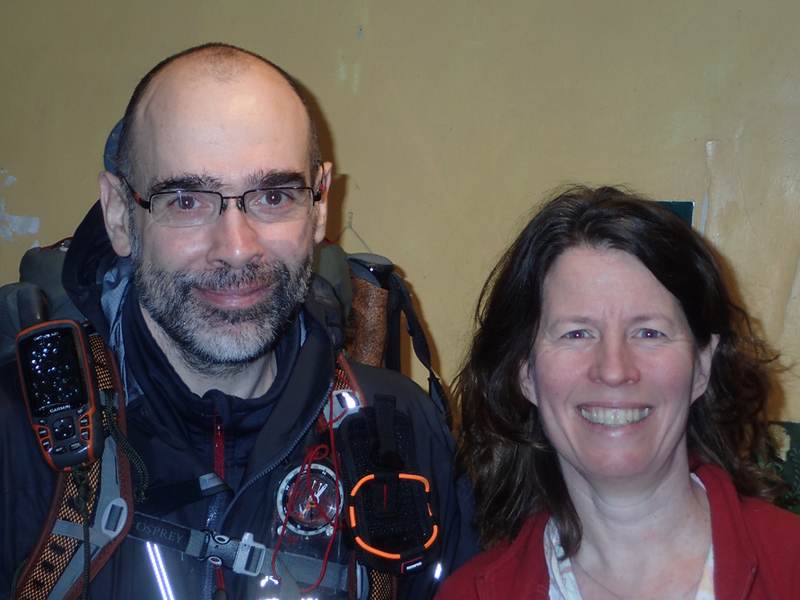 Roger manages to snap a picture of Catherine and I – proof that I do socialise occasionally! Having someone else take a picture always results in a better photo. Given that these are rare for me, I take advantage of it and use a cropped version for my blog portrait! 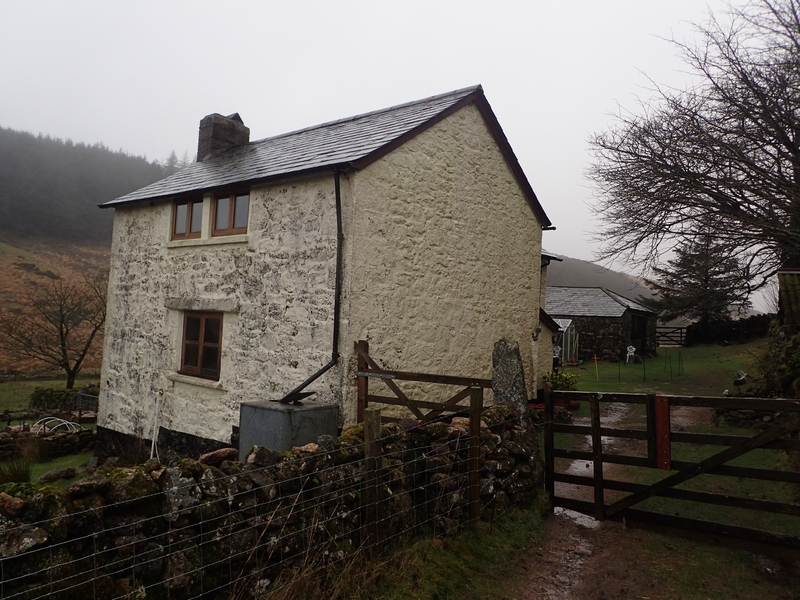 With a lack of daylight in the Winter I soon have to depart Crockern Farm and head back out into the wilds! I’m now headed Southward on a well made track. The plan is to intercept the B3357 road where I will hang a left Eastward. There we go! 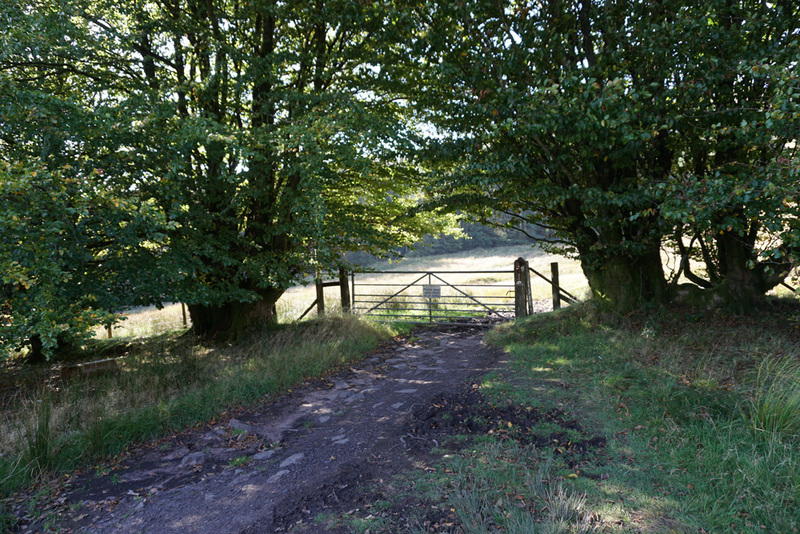 The gate to the main road. 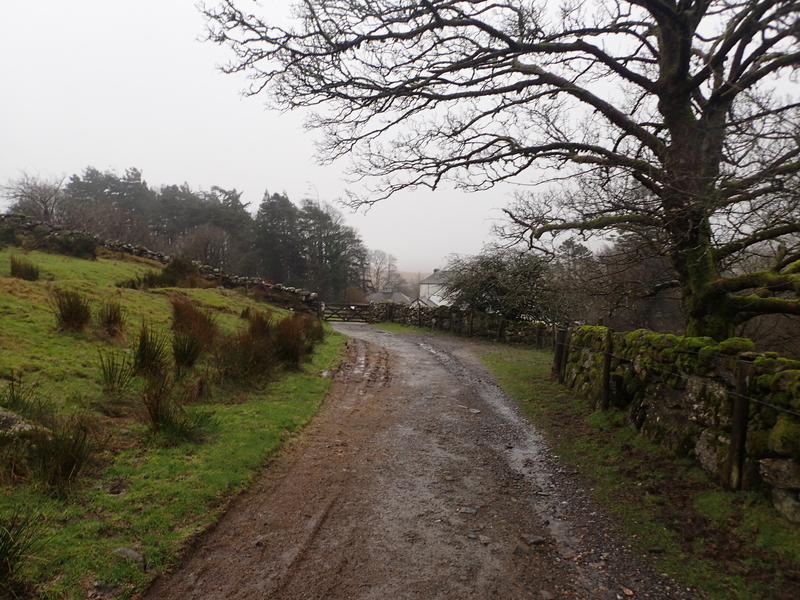 I had checked this road out on Google Maps to make sure it was safe enough to walk on after some rather hair raising experiences on my first Lake District walk with regard to fast moving traffic. This area nececitates a road walk from here, either East or West to enable one to proceed onwards – it’s one of the reasons why my earlier plans have avoided the area. Although the sighting lines down the road are not too good, there is plenty of free space to my right to avoid any incoming traffic. The sight lines do eventually open up to reveal the extent of my journey. I’m going to be walking for approximately 1.5 km down this road. As I get nearer to the sign, it does confirm that it is indeed the sign to the Prince Hall Hotel. Time to get off the road and head Southward. To my right are water logged fields. The winds coming in from this direction are ferociously strong. This does not bode well for the rest of the journey. 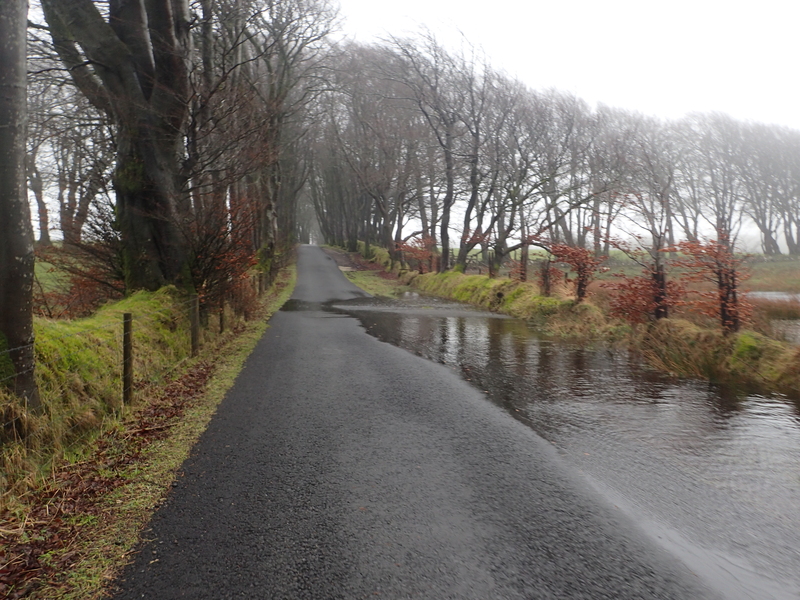 Most of the road that I’m following to the hotel is waterlogged. I guess that this road was never designed for the volume of rain that we have been getting this year. It isn’t long before I get eyes on the Hotel itself. The plan is to hang a left around it. 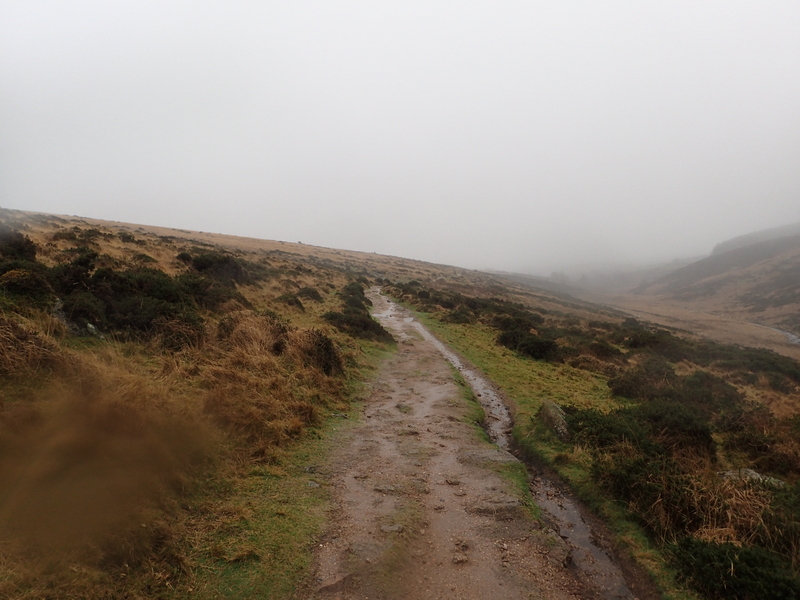 This track should ultimately take me to a bridge crossing the West Dart River alongside the Dartmoor Training Centre. 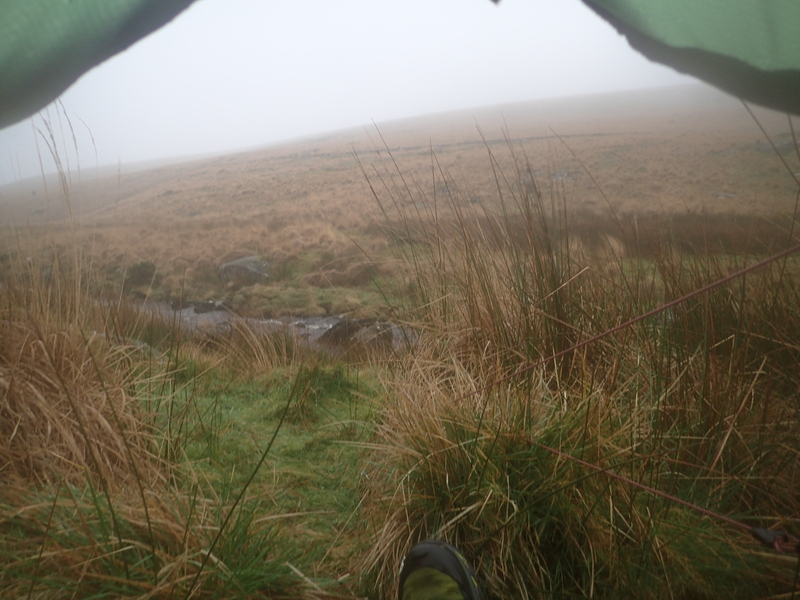 Finally, I get my eyes on the Dartmoor Training Centre and the bridge across the West Dart! 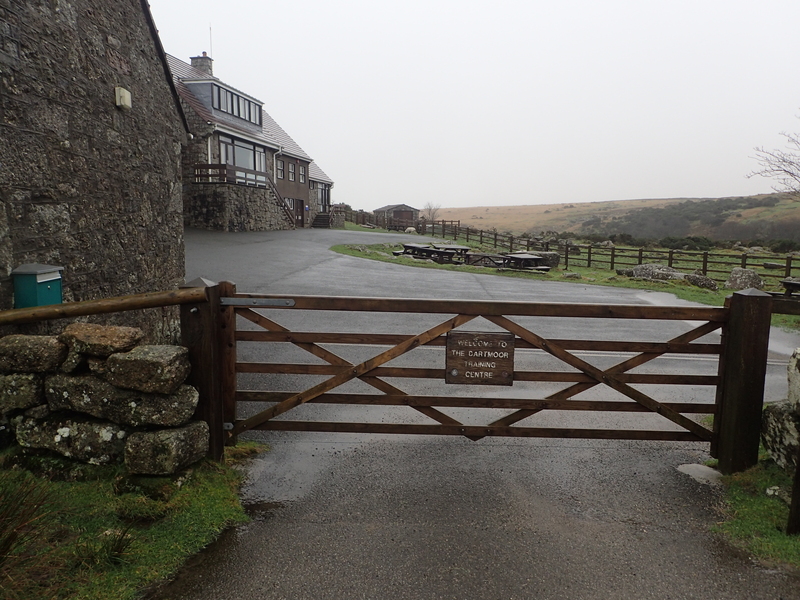 The Dartmoor Training Centre looks completely deserted right now. 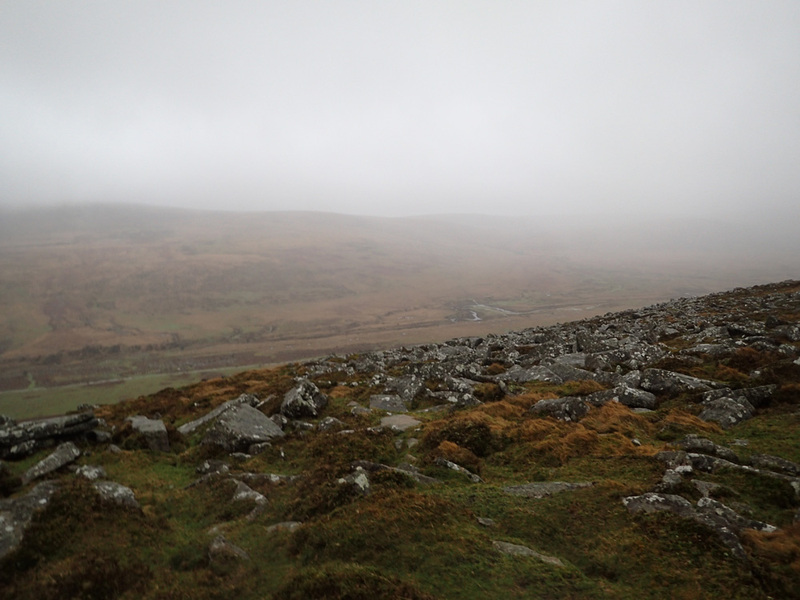 I guess they will be ramping up toward May ready for the annual 10 Tors competition. 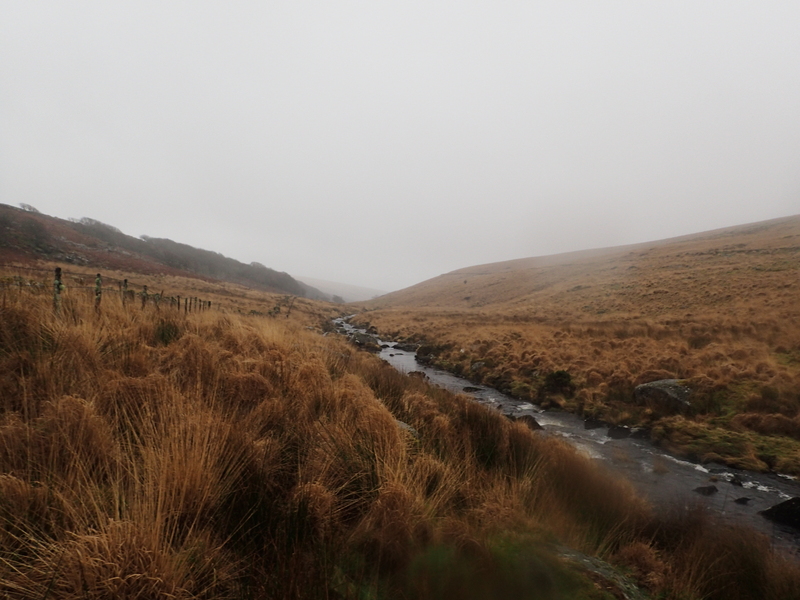 The view NorthWestward up the West Dart River. 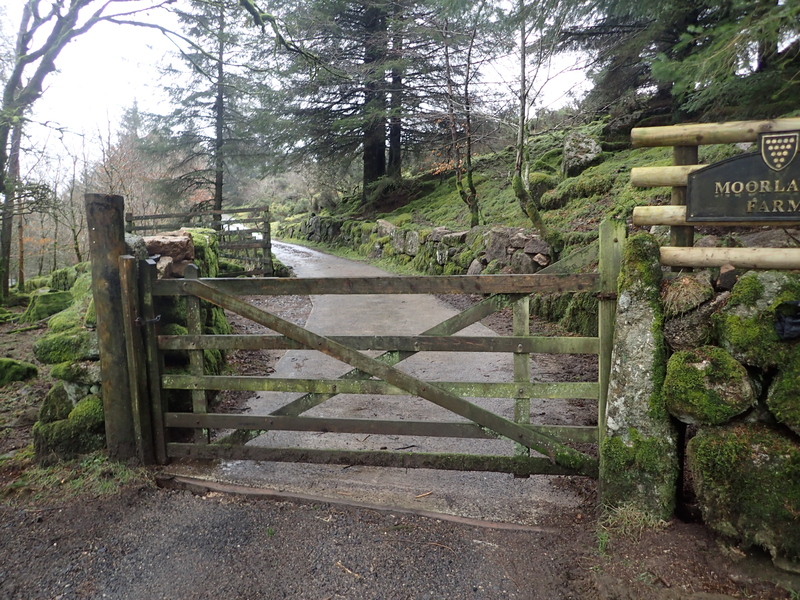 Once I cross the bridge I have to pop through this gate. 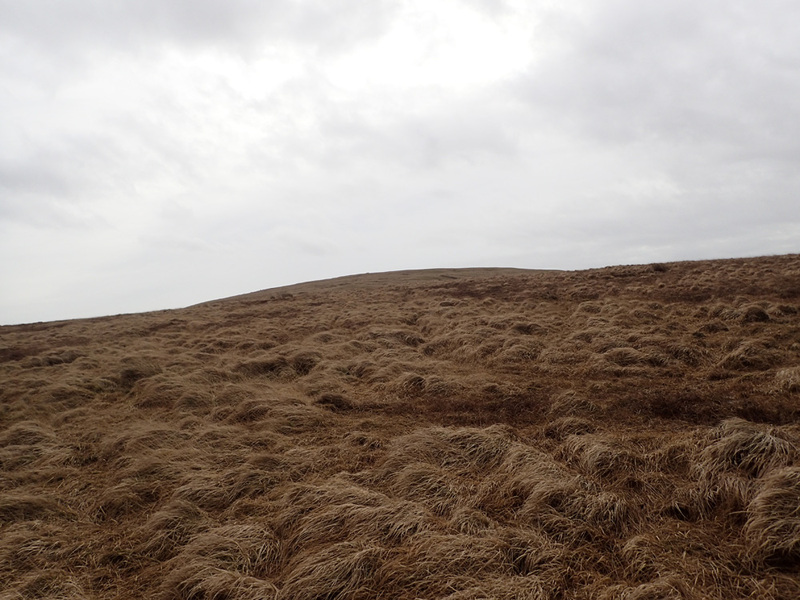 It’s then a case of heading SouthEastward up an unmarked hill to around 351 mtrs elevation. The winds will be more or less right behind me for this leg which will help propel me up the hill. As I climb higher the winds are perceptibly picking up. Whilst I’m currently enjoying their assistance up the hill, I know it will be a different story once I have to turn into them. 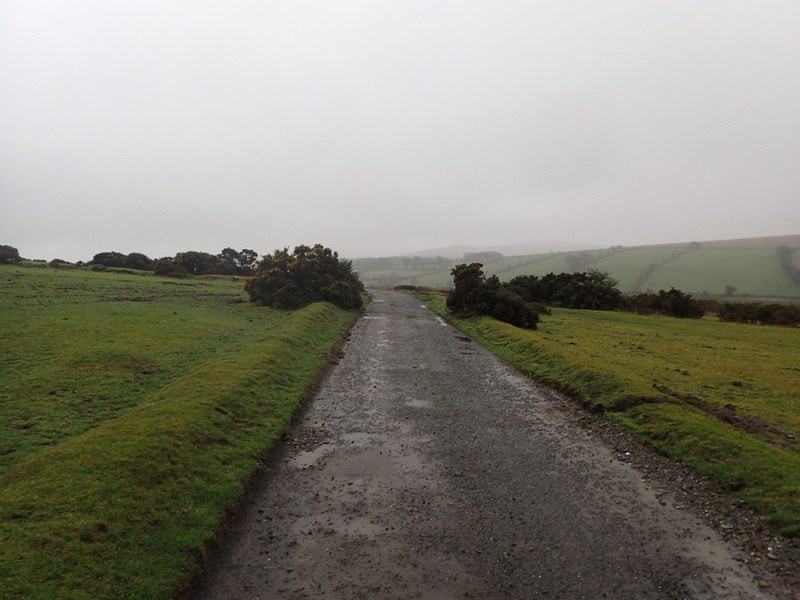 The views off to my left are pretty good despite the dire weather. Guess which way I’m going? Yup, it’s mud all the way! As I climb up through the mud, I know that I will soon be getting to a ford point across the Rue Lake Stream. I’m not looking forward to the Ford as these always involve having to take off one’s boots and then having to go through the hassles of drying one’s feet off before putting everything back on. 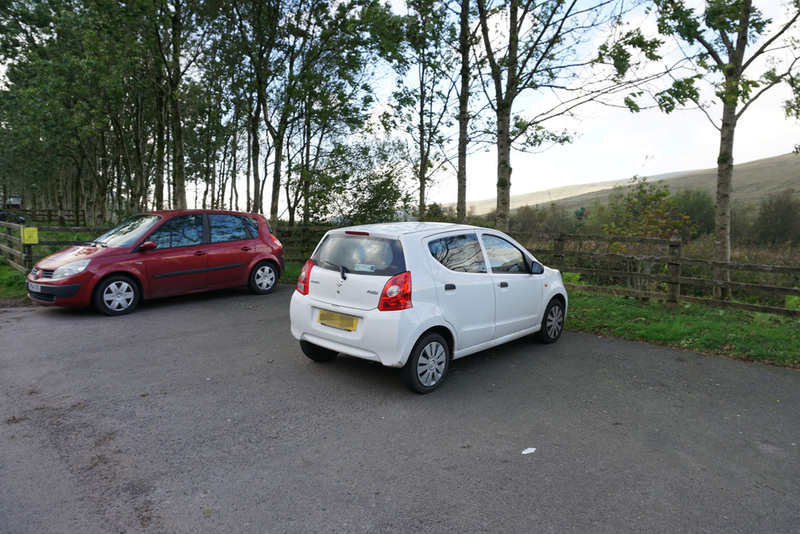 A ford, can easily add an additional stationary 10 minutes to a walk. I’m now on a short downhill leg which should take me directly to the ford. There it is! At this point I resign myself to having to get ready for the inevitable ford. However, when I get there I notice a crude stone bridge off to the left!!!! Excellent news! 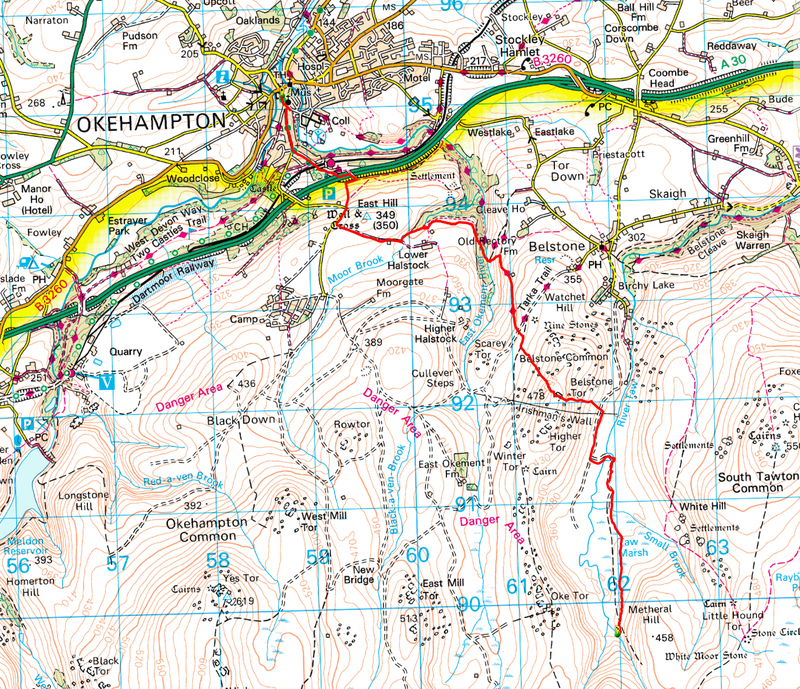 Once again, it’s a feature that is not on the Ordnance Survey map. I sometimes wonder about their recent quality or lack of it. I guess they can’t afford to send survey teams out as often these days? I’m now on the climb again. I’m looking for the signs of a cross road as I will need to hang a right Southward. I know that if I start heading downhill, I would have gone too far. In the distance I spot a sign post! Excellent – I now have my turn point! Here I have turned Southward to begin my climb of the 351 mtr hill. The winds are racing from right to left here. I’m finding it genuinely difficult to keep my balance. I find that I’m having to walk at an angle as the winds are so strong that the rain drops actually hurt when they impact my face. I’m now thinking that if it is like this going across the winds, what’s it going to be like when I start having to walk into them? 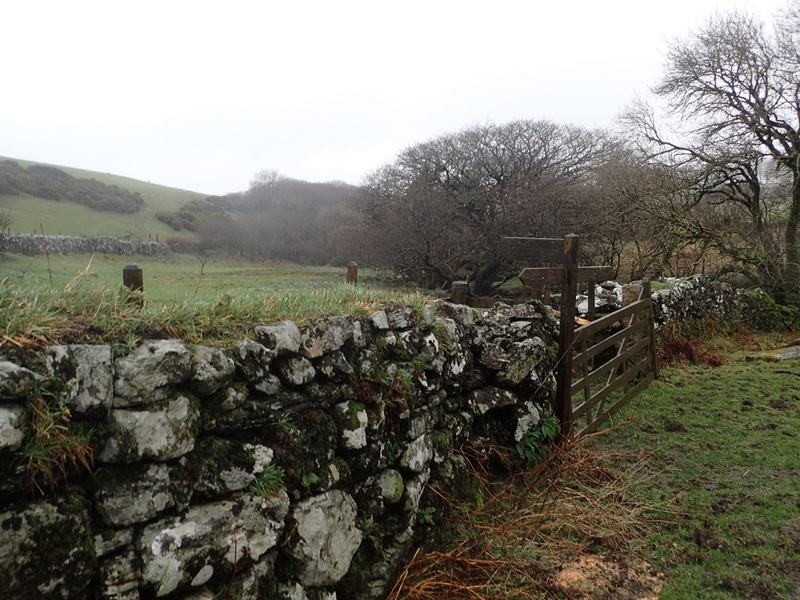 Down below is the boundary and the gate that I will need to go through. I don’t really know it at this point, but my kit has wetted out. I guess that three days of rain is enough to overcome Gortex Pro. Since this walk I have often thought about this and I can’t help thinking that a plastic poncho would be far more effective, cheaper and lighter! One would get a material that genuinely doesn’t let in any water, plus the design would have plenty ventilation. It could be me, but I can’t help thinking that a lot of these breathable fabrics are simply a marketing con. The going Westward is just as bad as I had anticipated it would be. I consul myself with the fact that I will soon be on a well made track. I start to pick up the first signs of the track. Navigation is now very easy. Just keep heading West until I run out of track! 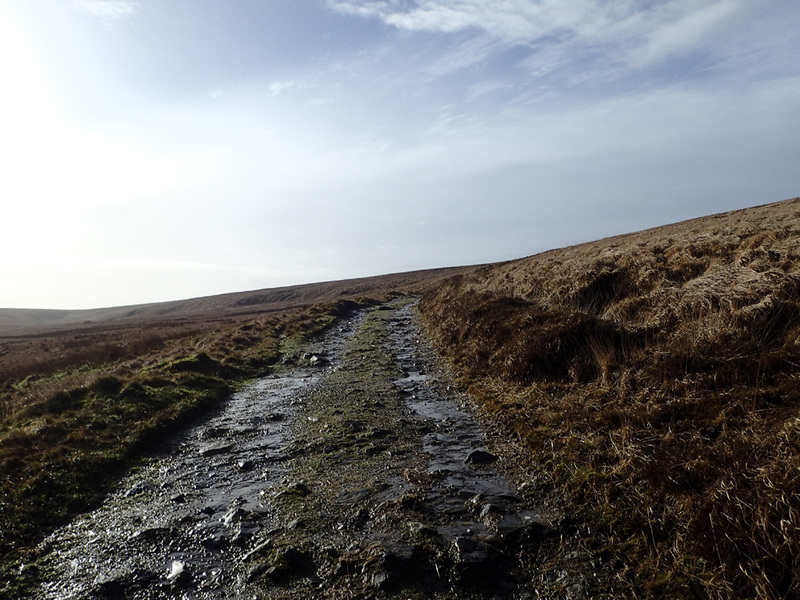 However, this part of the track is very rocky and muddy, which adds to the difficulty that the weather is already presenting. The winds down this track are extreme. I found it very difficult to make any forward progress at all. Breathing was also made difficult by the wind speed. I had found that the best way to move forwards was to push myself for around 10 tiring paces, then turn around in a braced position with my back to the wind so as to catch my breath and recover ready for the next stint. Progress in this manner was exceedingly tiring and slow. 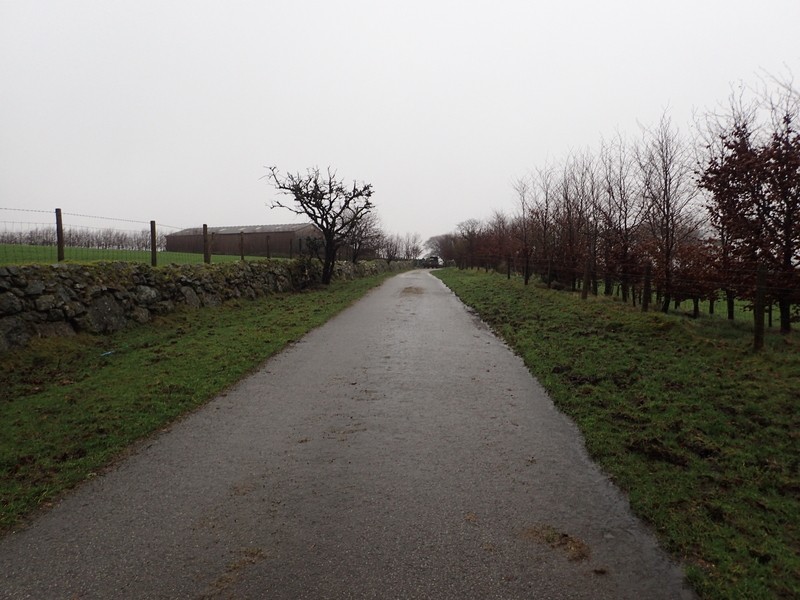 Although this section is only 3km long, it is the longest 3km I have ever had to do! 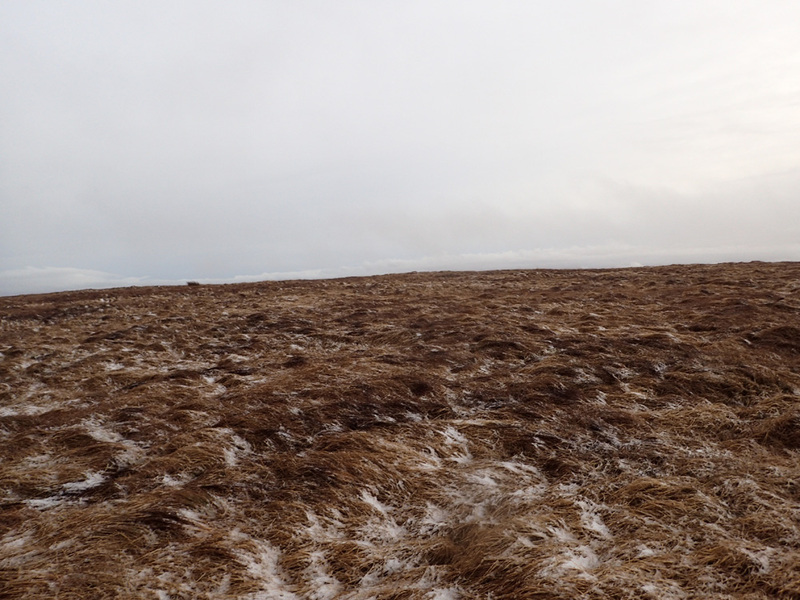 The photos make the terrain look so benign, I wish I had taken some video footage to show the true nature of the winds that I was facing. 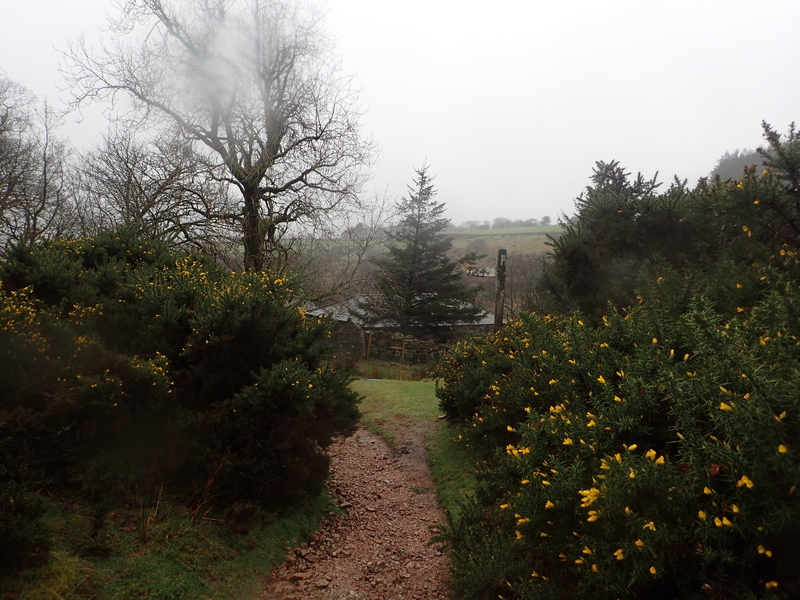 After what seems like an age I start to get a view on the treeline at the end of the track. I can’t wait for this section to be over with. I soon pass BullPark Farm. I take a 10 minute rest to drink some hot coffee and take on some food. 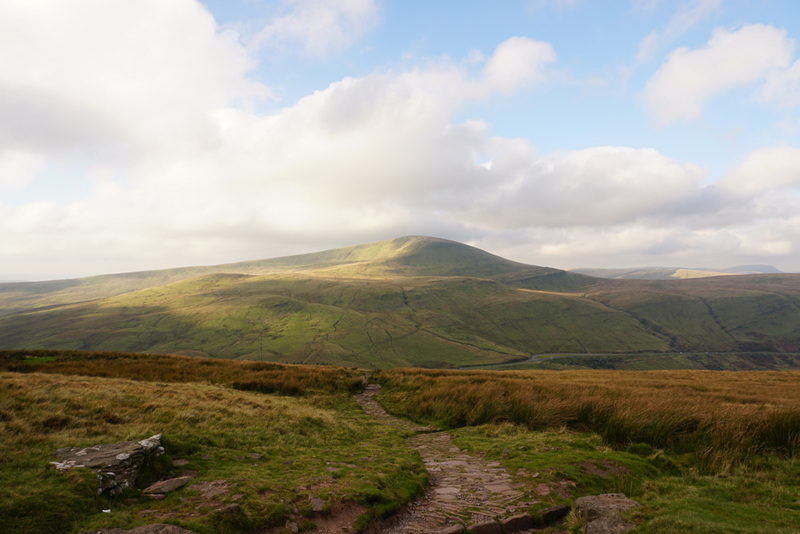 My mind is now thinking about the latter part of this hike across the Northern Moors where I will be more exposed and at much higher elevations. 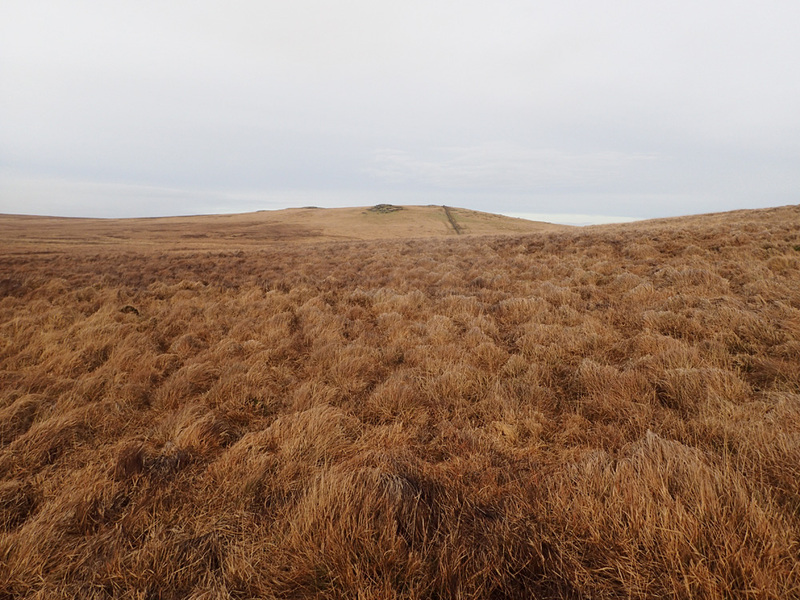 It is at this point that I start seriously questioning whether to cut the walk short as I know that once I commit to the Northern Moors, it will be very difficult to extract myself. Up ahead on the right I can just make out the hall. 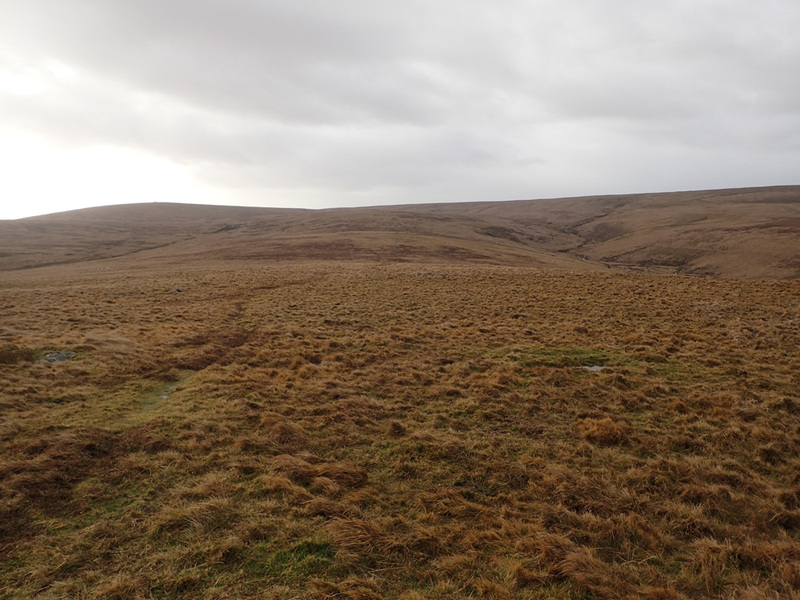 This marks the navigation point where I need to hang a left Westwards toward Princetown. 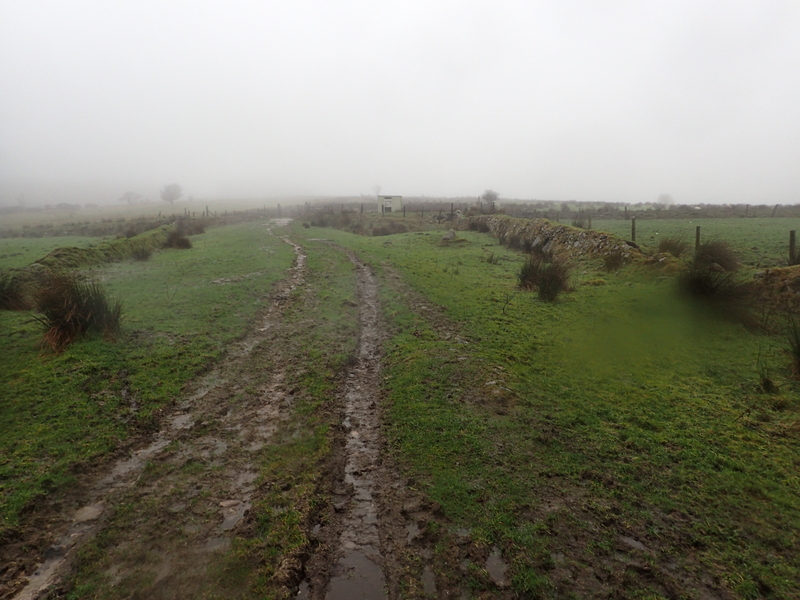 Parts of the track are exceedingly muddy and slippery. On more than one occasion I find myself landing on my hands as my feet disappear off behind me! 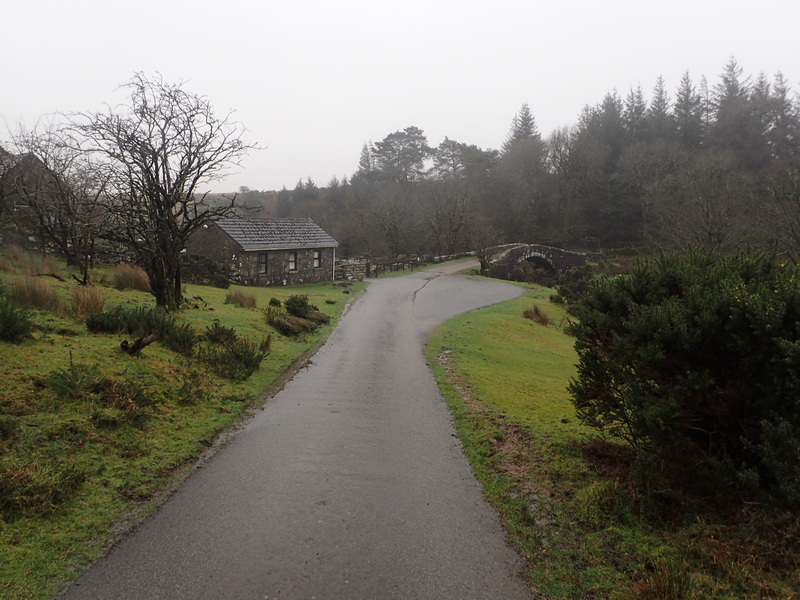 I know that I’m now nearly at the road leading to Princetown. It will soon be make or break time! 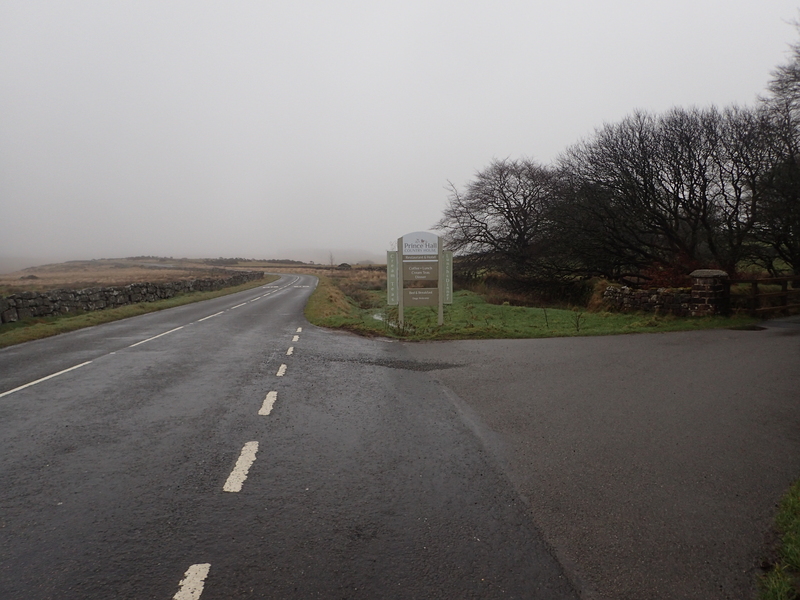 I soon make it onto the road and the Eastern outskirts of Princetown. 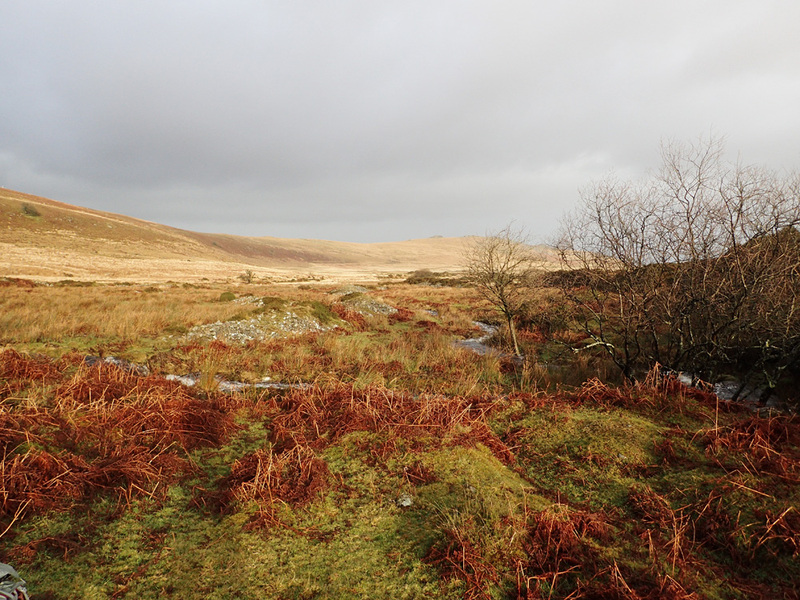 The plan is to proceed through Princetown to its Western Extremities where I will stop off to make the decision. I soon pass through the main town square which I recognise from previous walks. As I go by the many pubs and I can’t help but thinking that I’m on the wrong side of their doors! 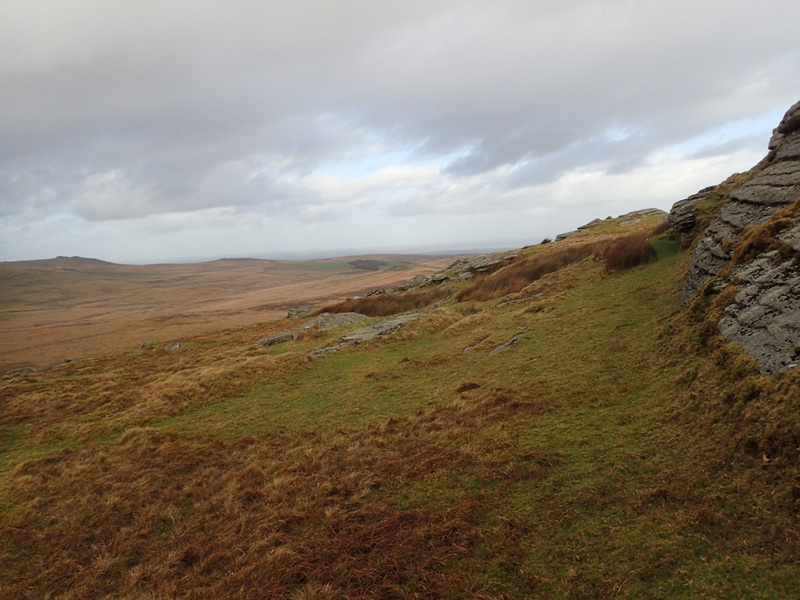 I am now at the Western extremity of Princetown. The choice is a simple one. I either commit to the rest of the walk with no chance of opting out, or I decide to cut it short here and now. I pondered this question for a while. 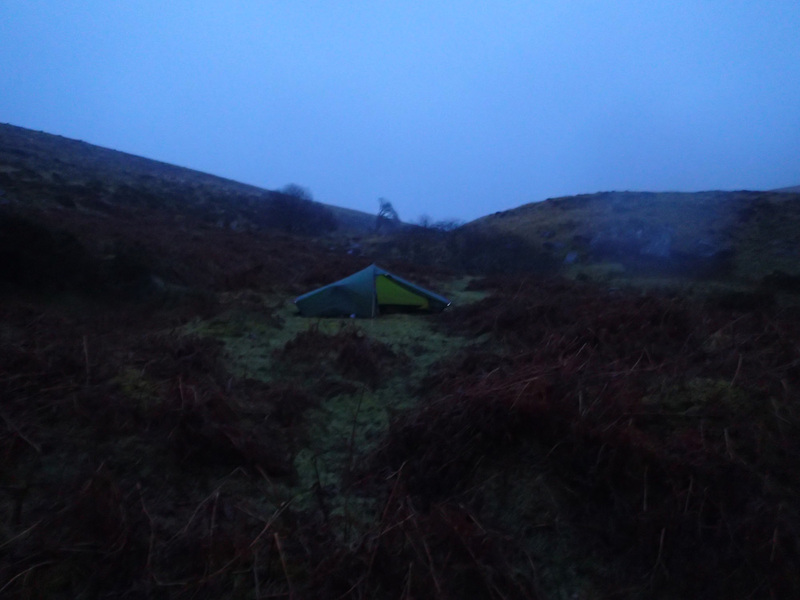 One part of me was trying to convince me that things would be fine on the Northern Moors and that if things were to go wrong I could simply pitch camp until the bad weather passed. 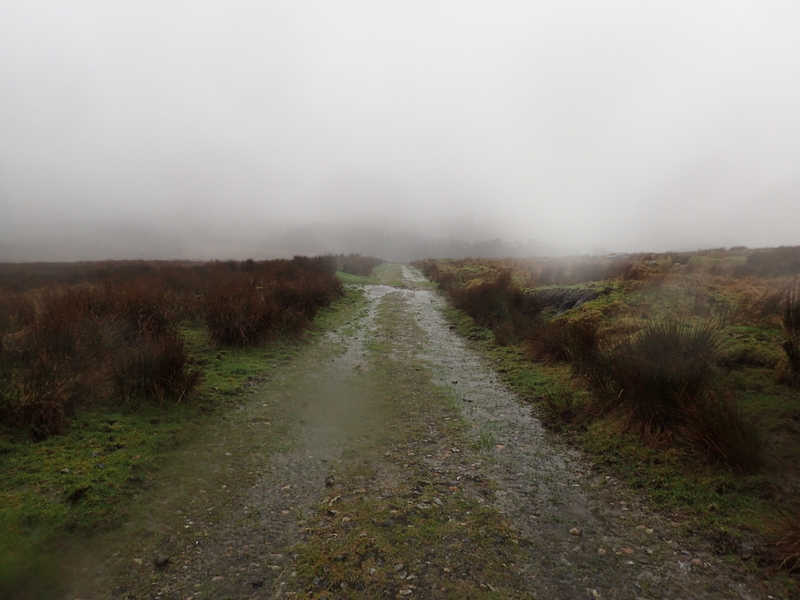 The other part of me was reminding me how difficult the walk along the well made track had been. 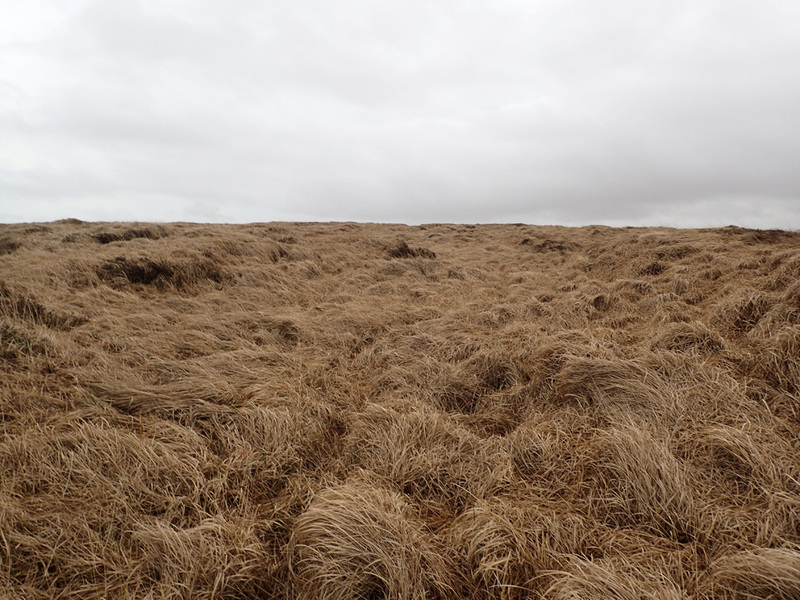 Doing the same thing cross-country amongst the tussocks and at a higher elevation, would probably not be a good idea. In the end I put in the call for my brother to come and pick me up. After the conversation, I felt genuinely relieved. As I’m waiting for my lift I start to get cold. It is at that point that I notice that I’m actually wet from head to toe. 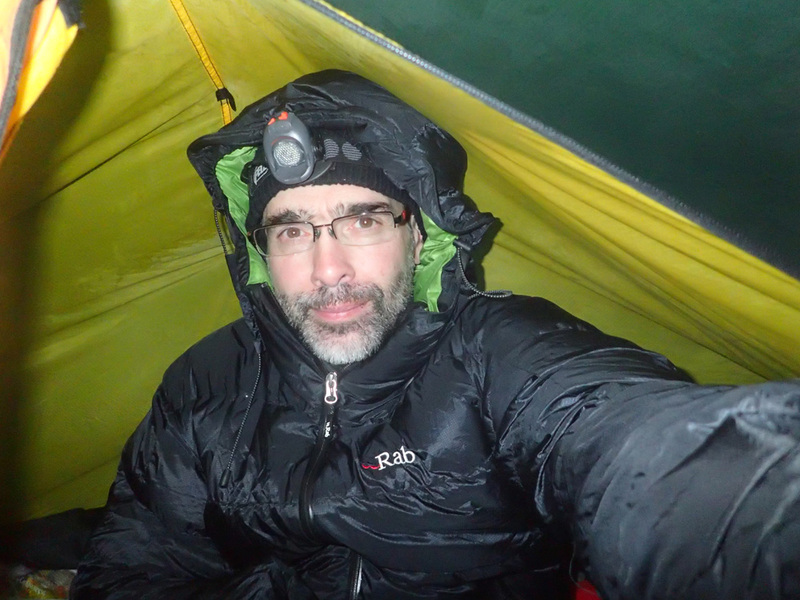 In a bid to win the heat battle I take out the down jacket even though it is raining – not something that is normally advised. On most occasions this jacket has the effect of providing instant warmth, but alas, not this time. To help stave off the cold further, I elect to keep sipping hot coffee at regular intervals from my nearly full flask. This does seem to work. With my cold and wet condition I come to the dawning realisation that I have probably made the right decision. Staying warm is a fundamental part of Winter hiking. Without this ability, things start to err toward the side of danger. It looks like the decision to end the walk early probably saved me from getting into trouble later on. The emergency plan didn’t quite go as smoothly as anticipated. There were two issues…. 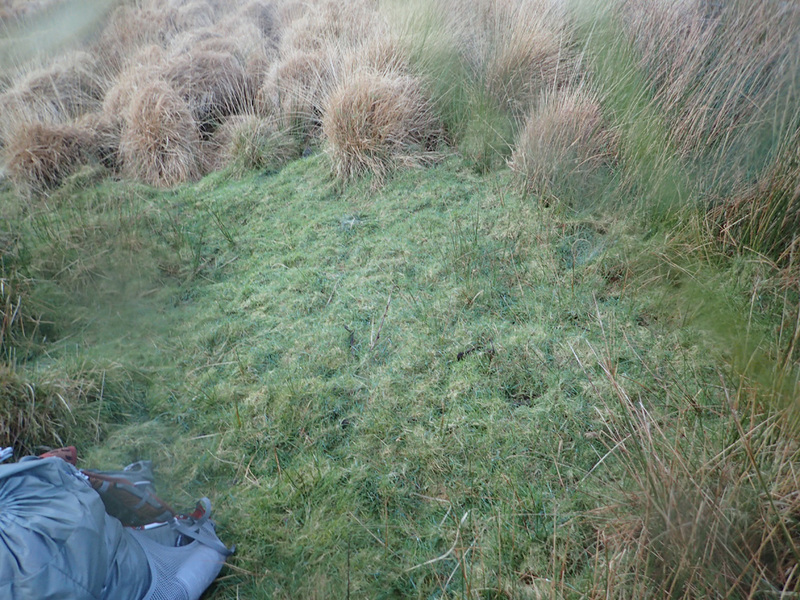 Firstly, I had found that the phone had switched itself on in the rucksack and was down to its last reserves of battery. This is why I prefer phones with removable batteries. I think I will have to get a sim card for my old Blackberry and use that one exclusively for hiking. The other other issue was that my new phone did not have my safety number’s phone number in it! Doh! Luckily, I have two brothers, both of which live fairly close, so I just phoned the other one! That’s it for this walk. Day 2’s primary goal was to put me close enough to fellow bloggers at Crockern Farm, so that I could visit them the following morning. 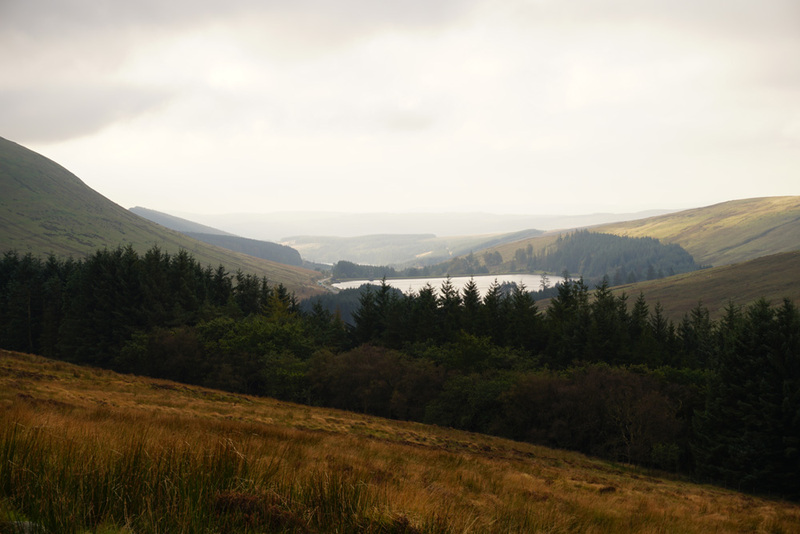 The biggest challenge of the walk would be to ensure that as I headed Southward, that I remain on the correct side of the West Dart River before it becomes unfordable. It would only take a simple mistake to end up on the wrong side, which would probably result in missed visit. 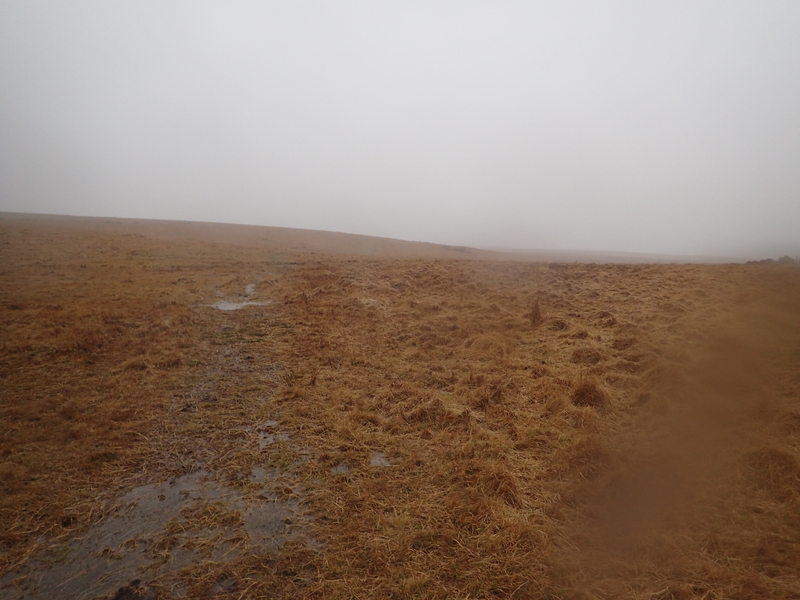 By Dartmoor standards there was a fair bit of hill climbing involved. 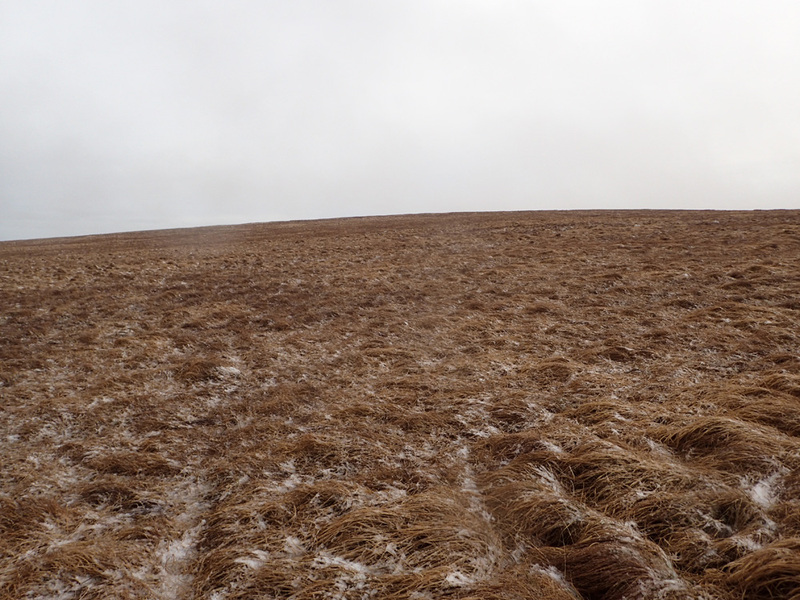 With the strong winds, these type of elevations really didn’t help at all! In terms of weather, the day started off with rain, then it got better to reveal some blue skies, but alas, it wouldn’t be long before these were replaced by drizzle and snow. Anyways, I’ll let the photos take you on a virtual hike! I wake up to rain outside. 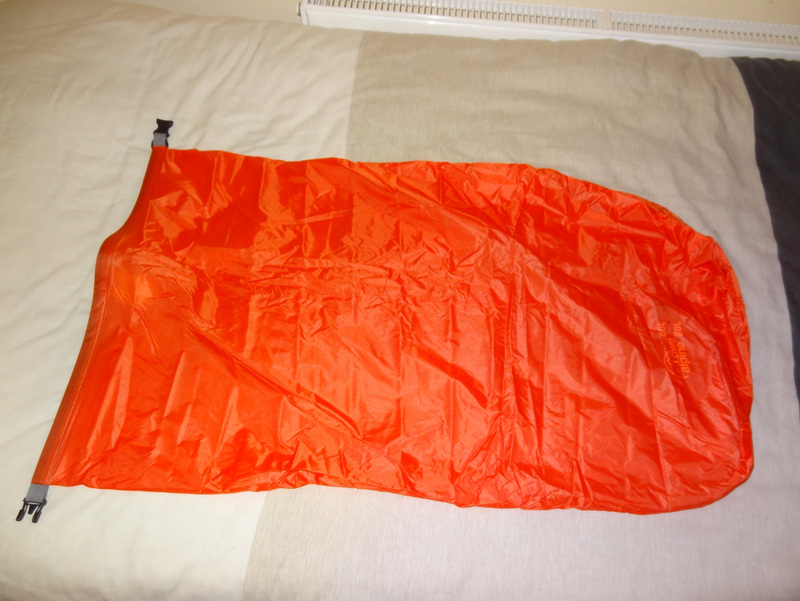 As a result I elect to pack the sleeping bag and down jacket into their dry bags. Both of these items of kit, whilst exceedingly warm, are rendered useless if they get wet. Time to get the breakfast on! It’s my usual standard fare. Hot muesli (much more effective than porridge), a wheel of cheese, some coffee and a small cake. After breakfast it’s time to boil water for my vaccuum flask. 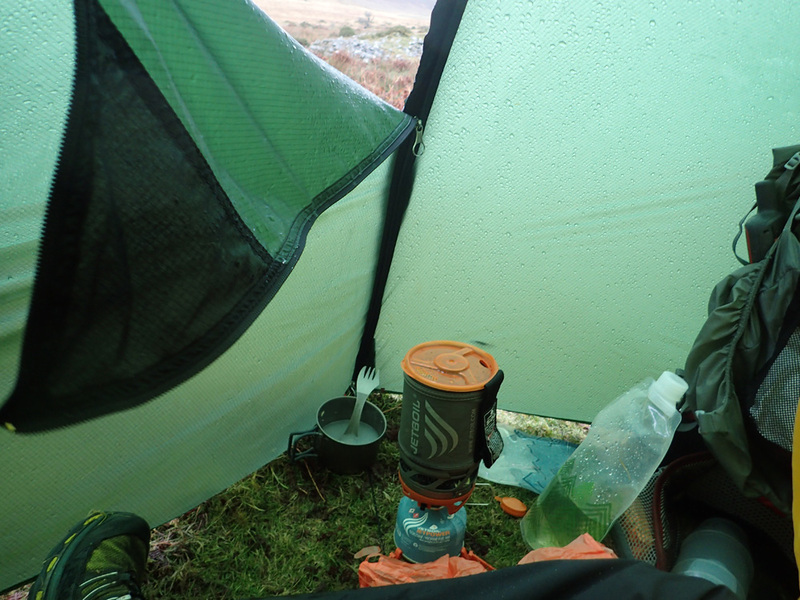 The winds have picked up so I have to partially close down the shelter whilst boiling the water. The top part of the door is left open to provide adequate ventilation for the stove. 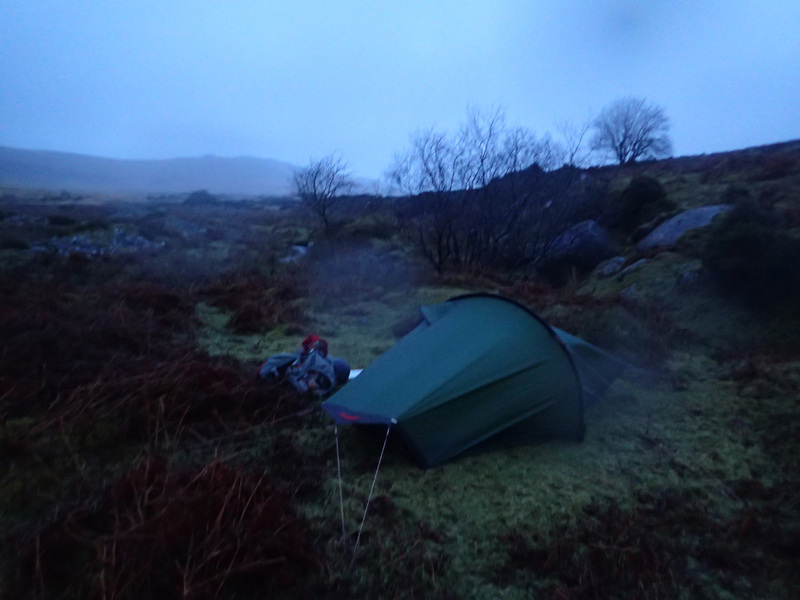 Luckily, the rain eases off, which means that I can pack the tent as-one. This makes makes pitching it at the end of the day much easier. Once again I leave the ground in pristine condition. I’m now all kitted up and ready for today’s 19 km walk! The view Northward toward the direction that I had hiked in on during the previous day. 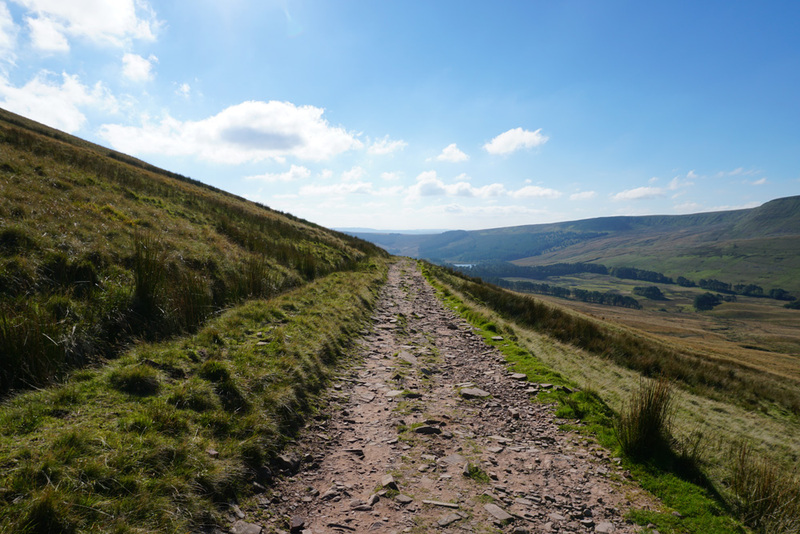 Time to get on with the climb Southward. To my right is a stream which I’m hand-railing upwards. 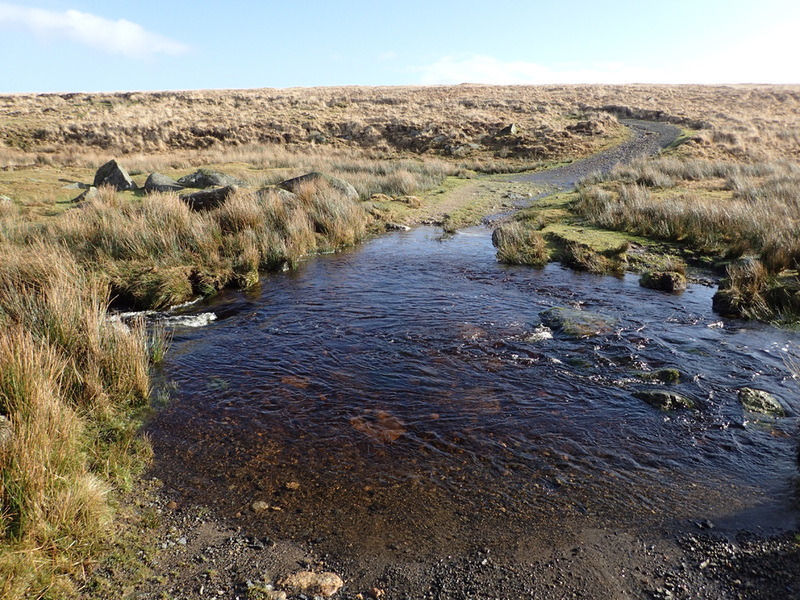 I know from previous visits that the fording point for this stream is exceptionally boggy – even on a good day. As a result, I’m keen to make the crossing before I get there. The flooded trees quite clearly show the exceptional water levels due to the incessant rains. 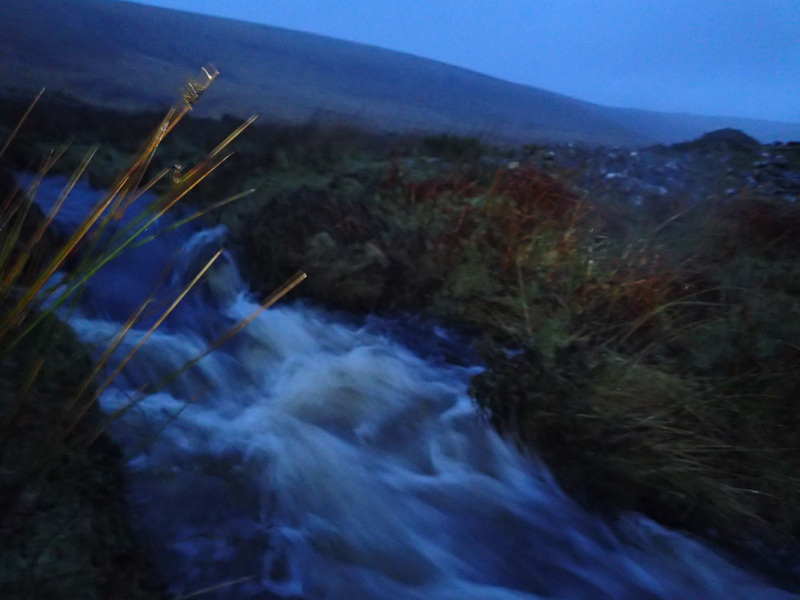 I’m rather conscious that all the streams that I will be crossing today will be deeper and will be flowing faster than usual – this necessitates additional care. 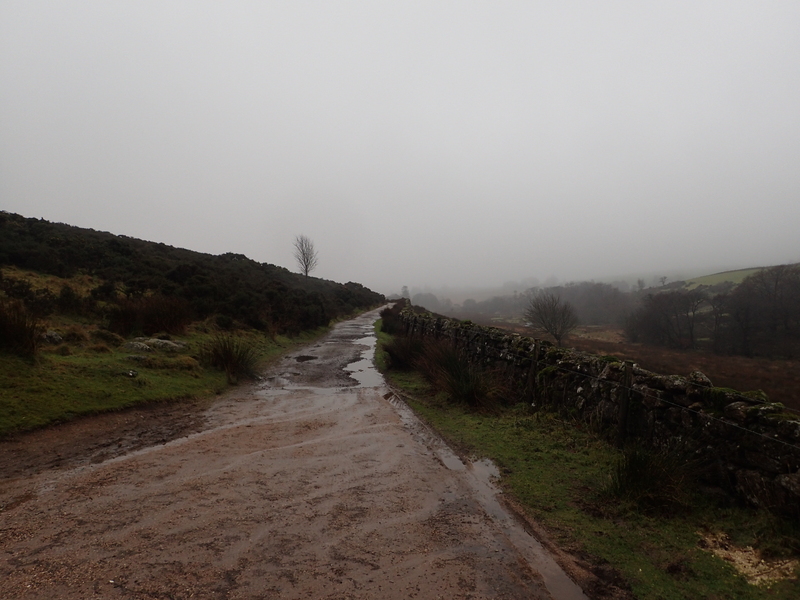 To my right is Steeperton Tor. I need to make my way around its Southern flank, but before I can do that, I need to find a safe way across the stream. 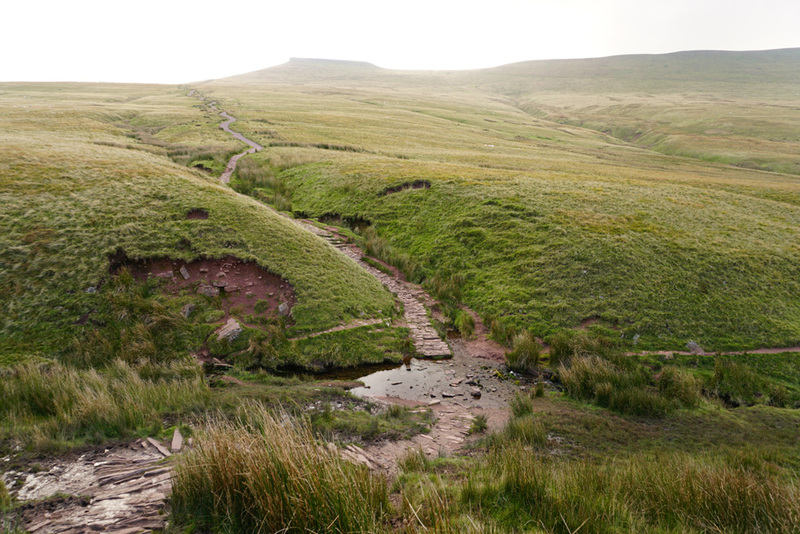 The terrain by the stream is starting to look relatively difficult up ahead. 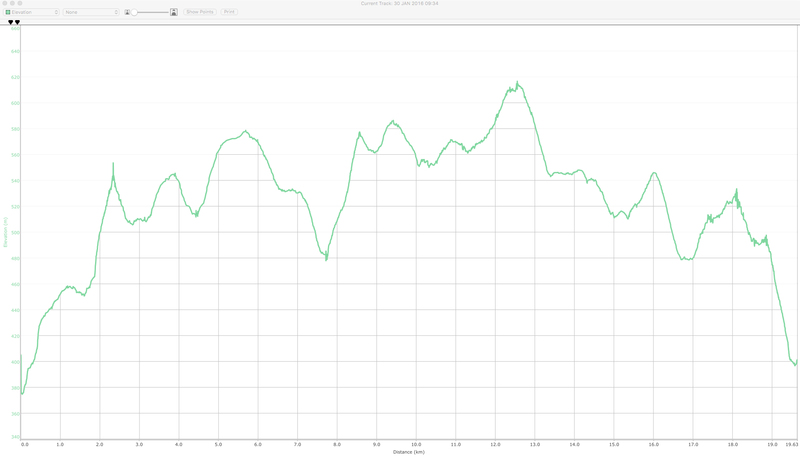 As a result, I decide to hang a left up the hill and get some elevation under my belt. As I climb up, I try to keep an eye out on the stream for any potential crossing points. 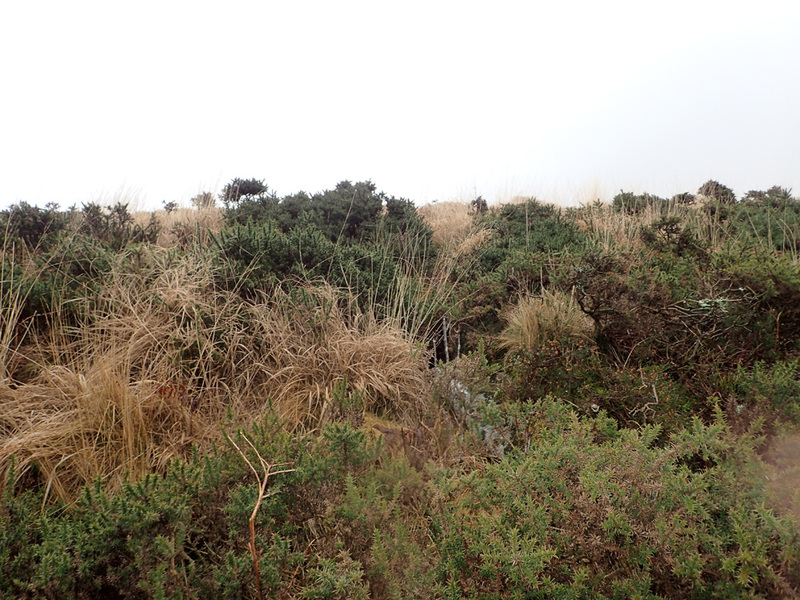 The climb up is a relatively prickly experience thanks to the thistles. 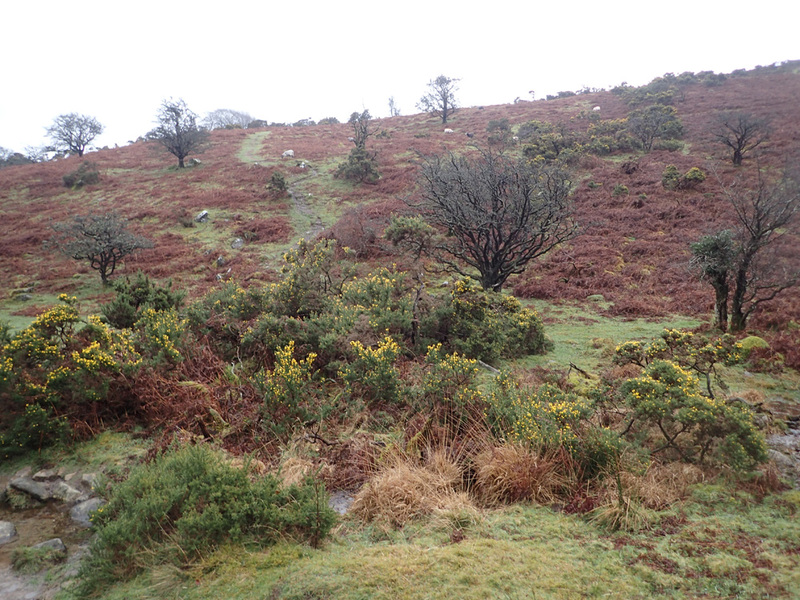 These are actually relatively rare on Dartmoor, but they always seem to be strategically placed where one needs to go! 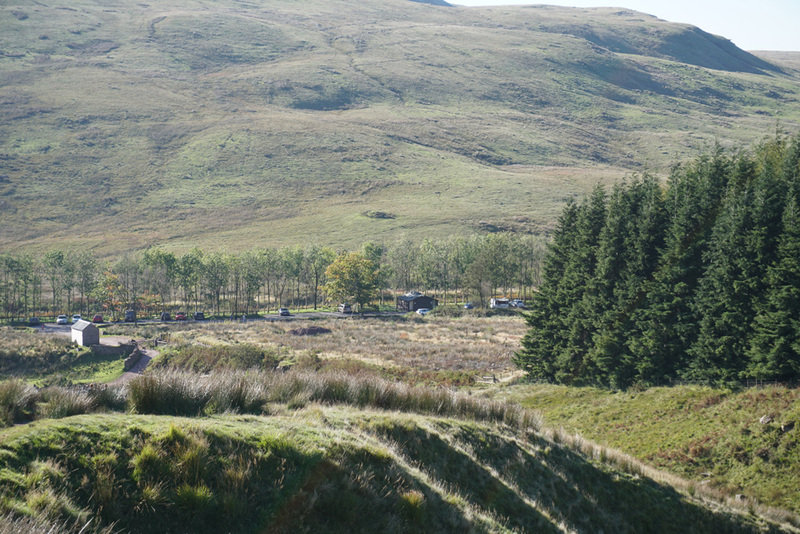 A look Northward back towards this morning’s old camp site toward the centre of the picture. The weather at this point isn’t too bad at all. Certainly an improvement from the previous day. I soon get to the top. As predicted, the ground looks much easier to traverse. The plan is to head back toward the stream once the ground near it improves. 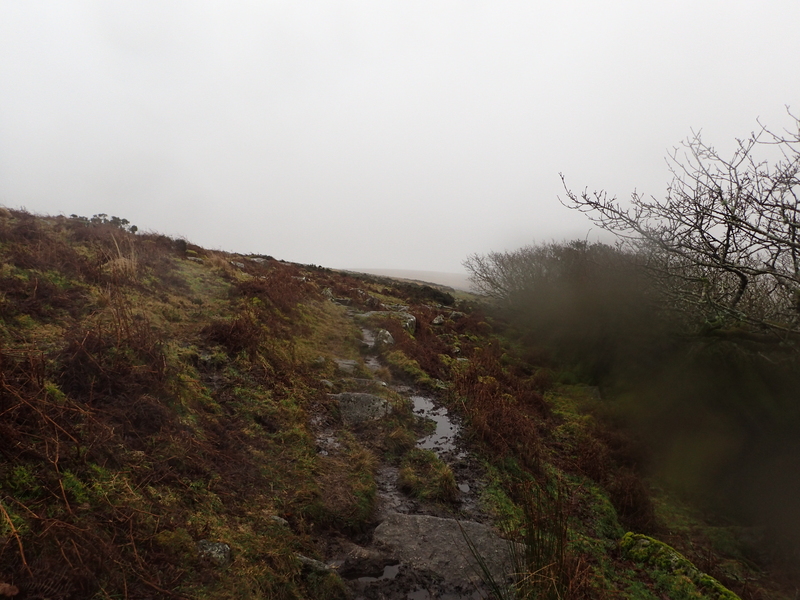 To my right, Steeperton Tor continues to tease me and remind me that I’m on the wrong side of the stream! After I converge back onto the stream I manage to locate a great crossing point. This is the view after crossing over. 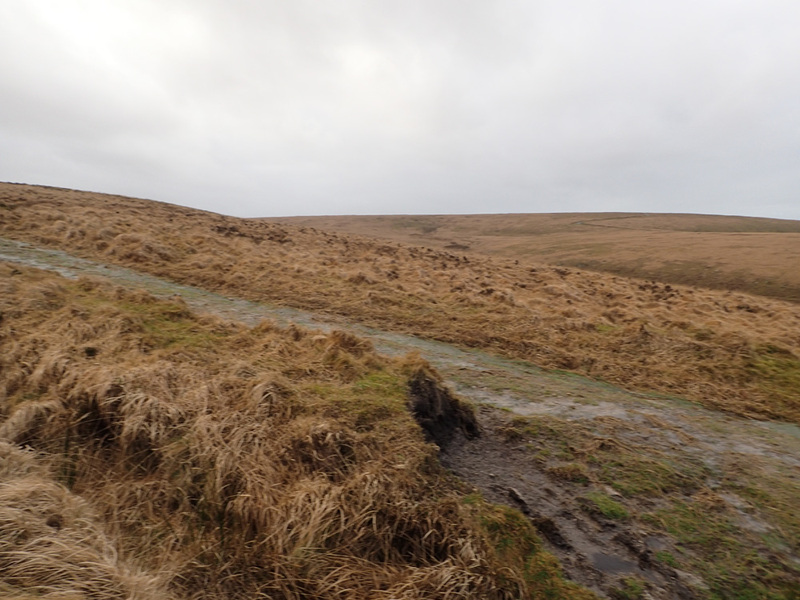 The original plan was to go around the Southern flank of Steeperton Tor. But instead, I elect to go right over it. I wanted to avoid the boggy areas by the stream and I wanted to get a representative sample of today’s wind speeds to see what it was up to! 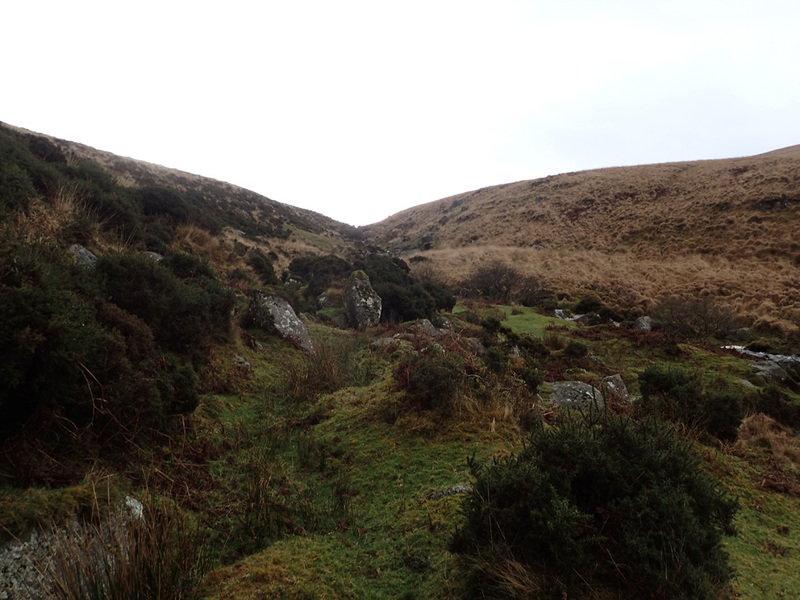 This is the view back toward the stream after a relatively steep initial climb. 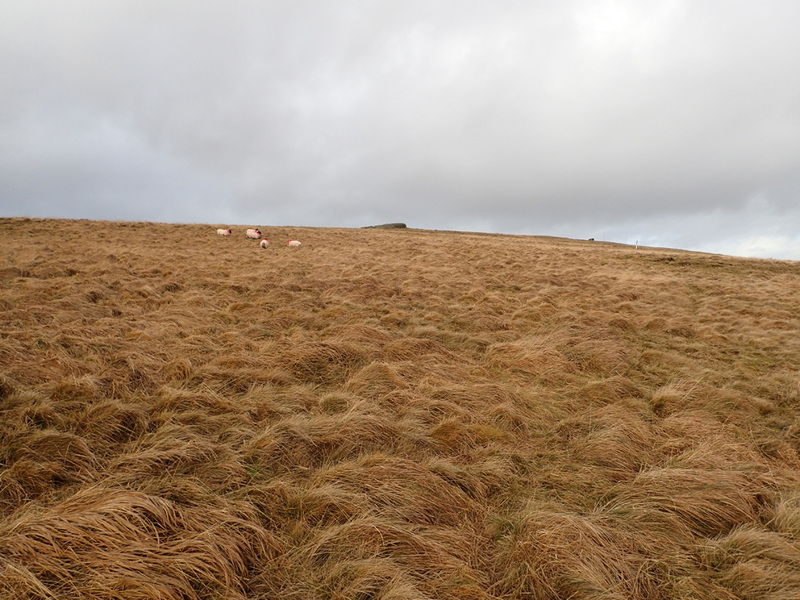 The climb up is through typical Dartmoor terrain – grass tussocks! 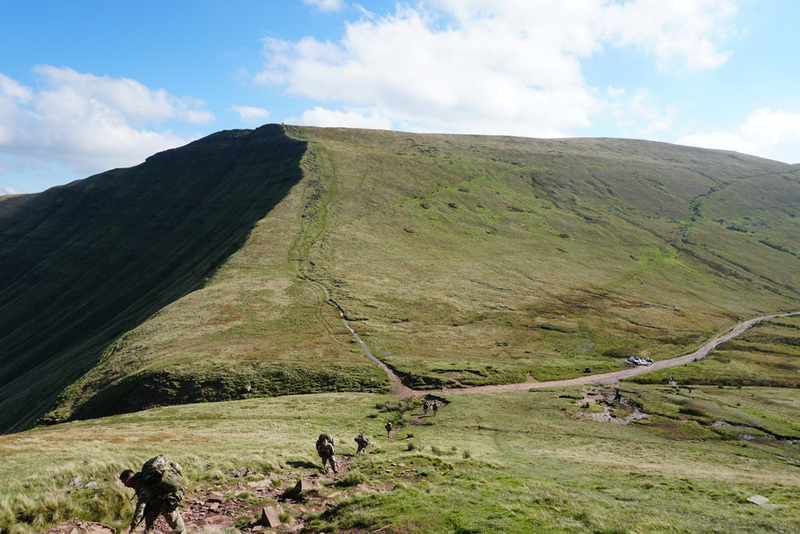 It’s quite difficult to convey how hard it is to cross this type of terrain with a heavy rucksack. You really need to go out there yourself and give it a go! 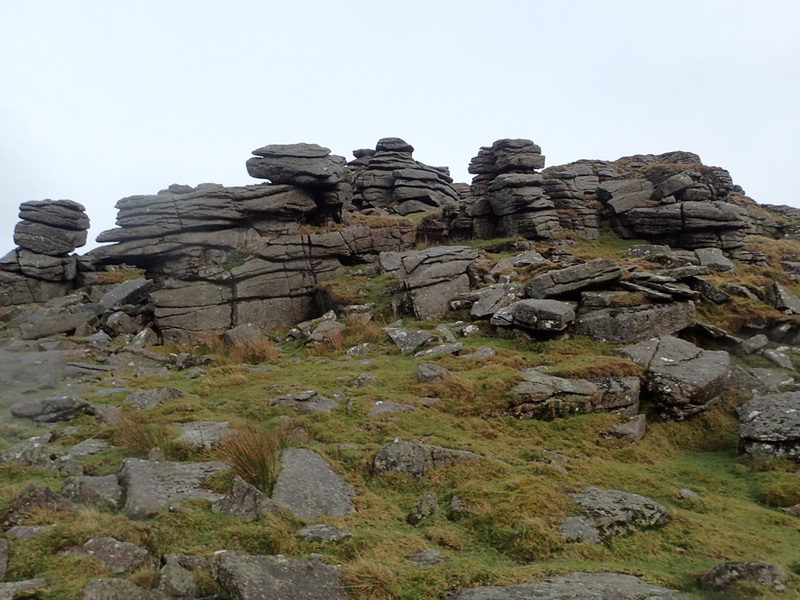 Soon the terrain starts to flatten out and I manage to get eyes on the rocks of Steeperton Tor. Not far to go now! I’m now practically at the top. 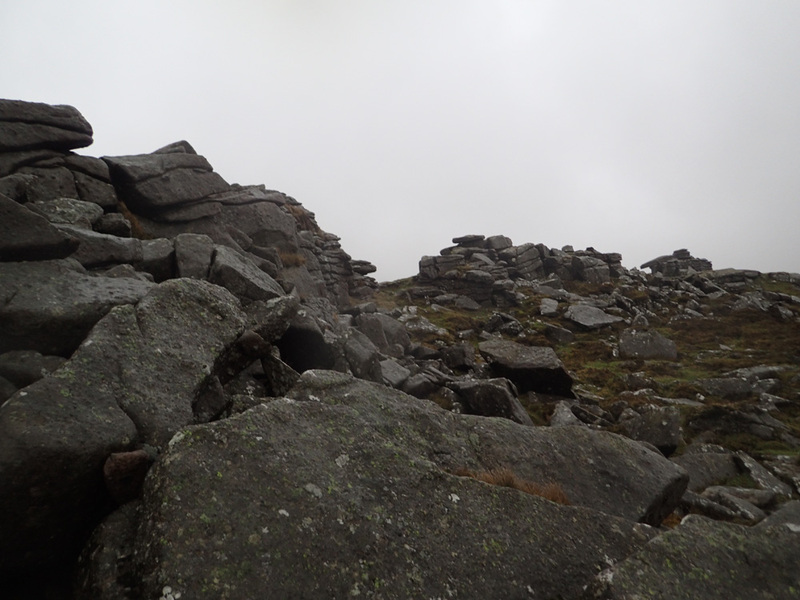 Although I’m sheltered from the winds by this rocky outcrop it is still rather blustery up here! 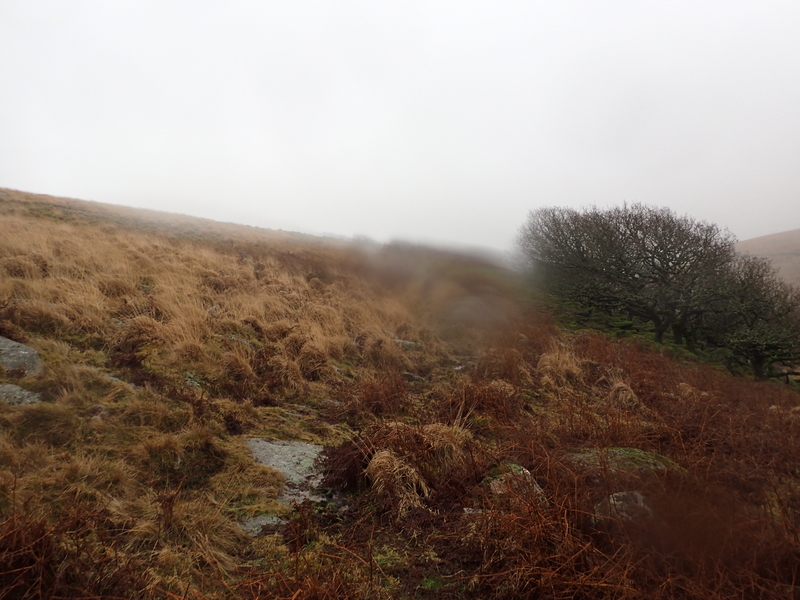 I’m now on the windy side of Steeperton Tor looking at the view Northward. I elect not too hang around due to the winds. The next stage of the plan is to follow this trail Southward. It should intercept an Army track. In the distance on the left is Hangingstone Hill. 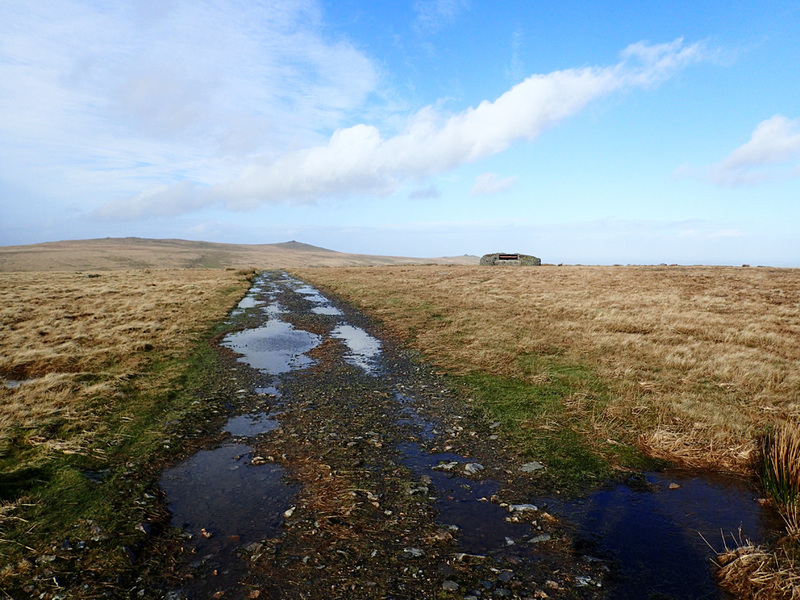 After a rather boggy descent I soon intercept the Army track. The plan is to follow it Southward until I reach a junction breaking of Westward to the right. 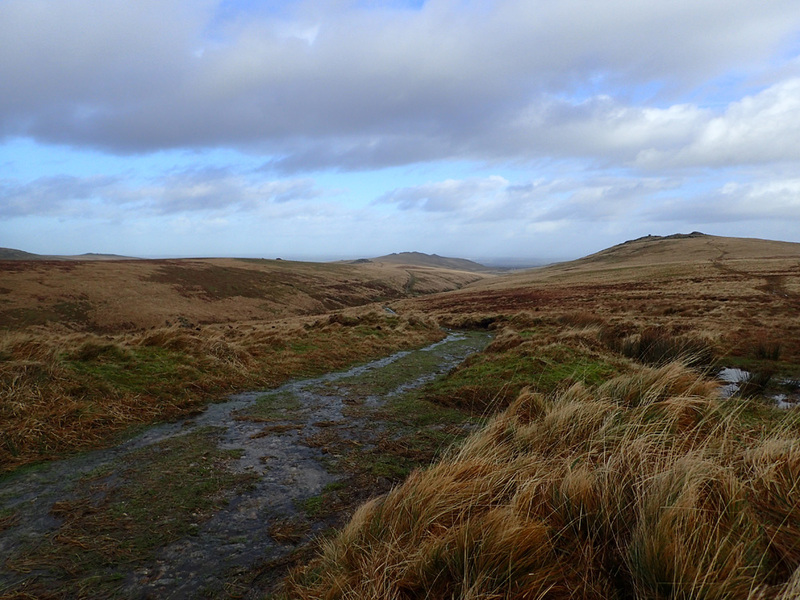 A look behind me back toward Steeperton Tor. 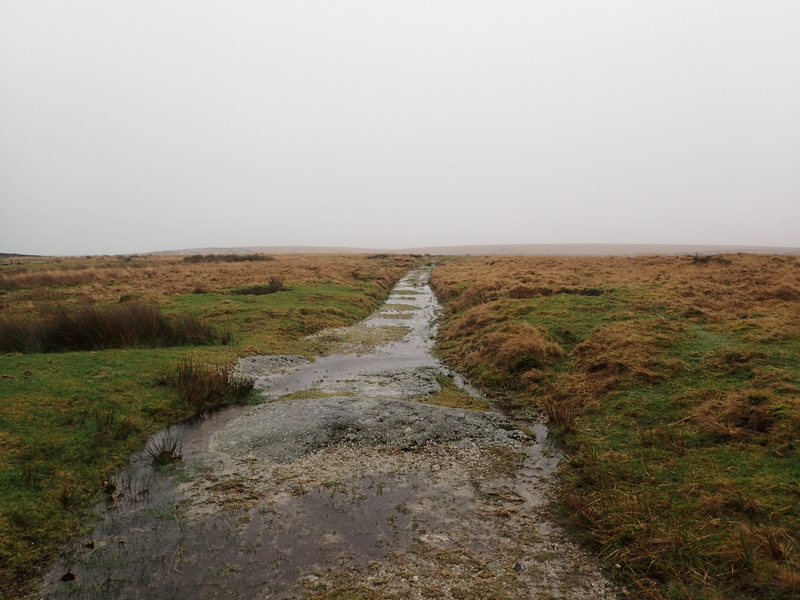 This track has so much running water that it almost qualifies as a stream! Up ahead past the flooded area is the turn off to the right that I need. Time to break Westward. 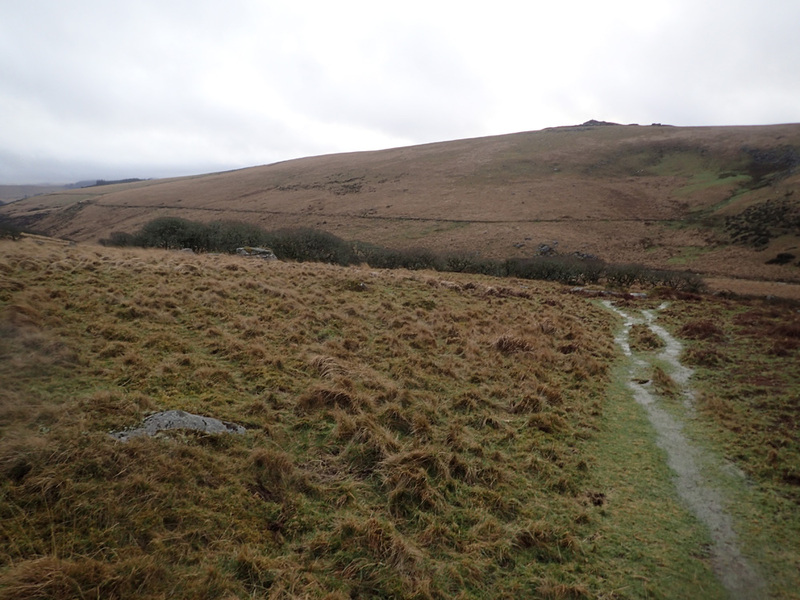 This track should take me to a fording point across the River Taw. I have never been this way before, so I’m not too sure what to expect in terms of depth and current. 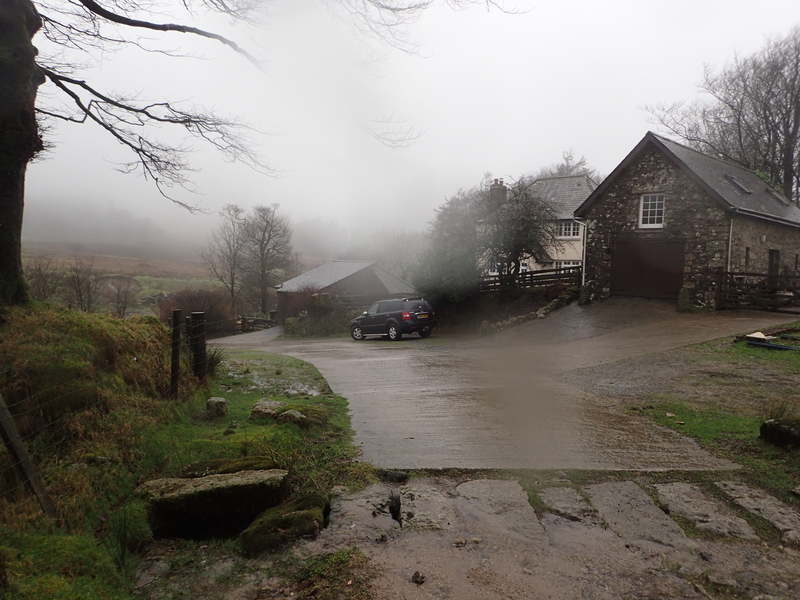 The fording point after having crossed it. 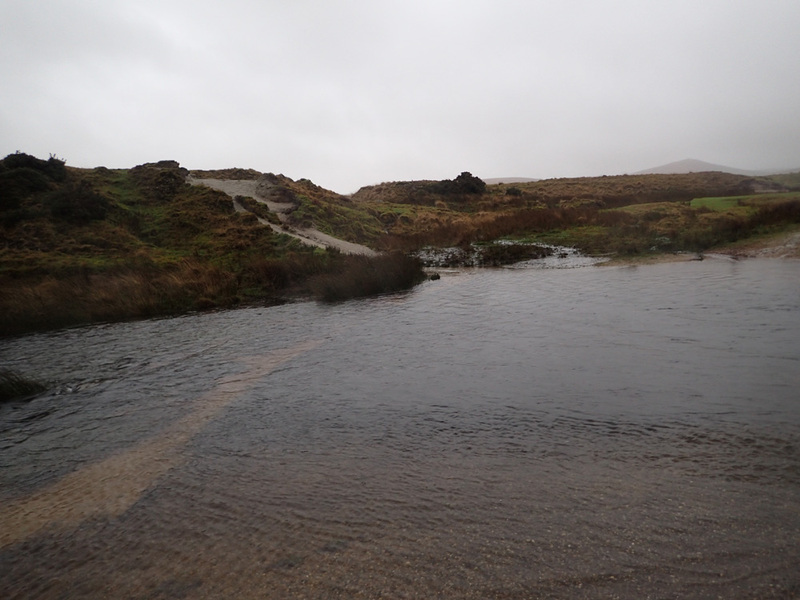 The water levels were almost up to my knees on the deeper sections. 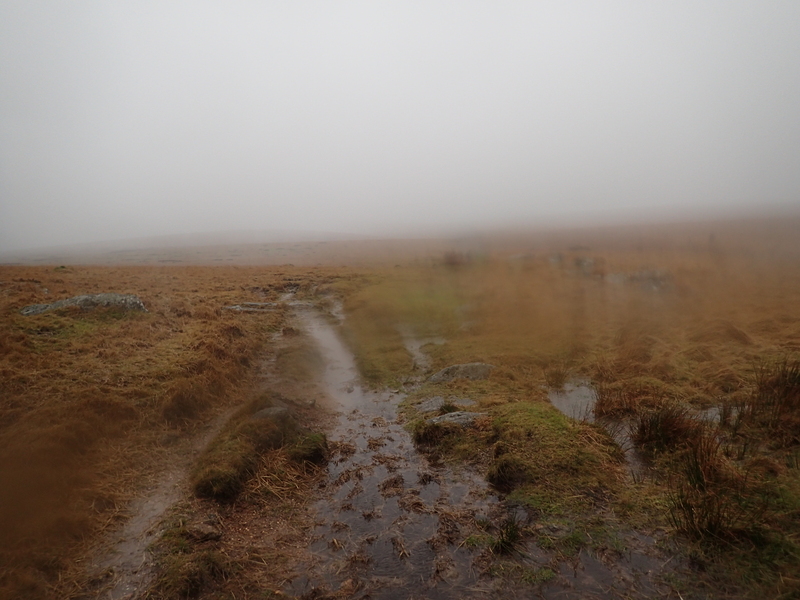 But once again, the hiking poles help me plot the shallowest route across. The biggest pain with this crossing was the sand and grit. It’s very important to clean one’s feet properly prior to putting one’s boots back on, otherwise the sand will start acting like sandpaper! The plan is to follow this track to a point where it meets another main track. 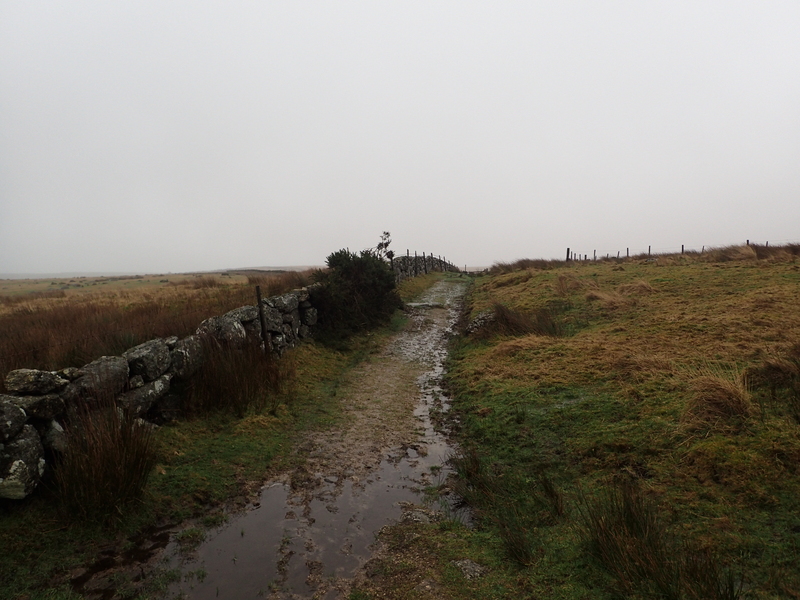 From that junction onwards, the rest of today’s walk will be cross country only. As I head Northwestwards I catch sight of an Army outpost. 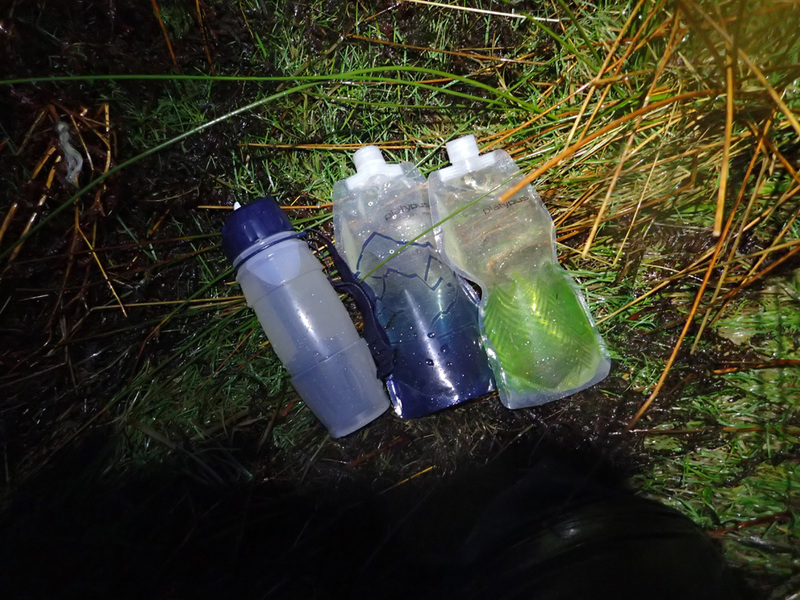 I guess these could be lifesavers if a hiker ever got caught out by the weather. 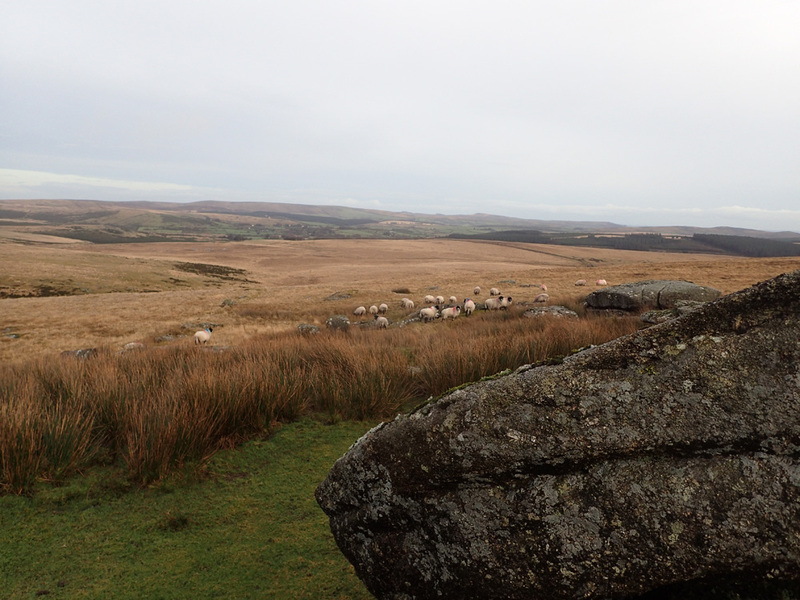 In the far distance is Yes Tor, the second highest point on Dartmoor. I eventually make it to the junction. It is now time to head cross country! 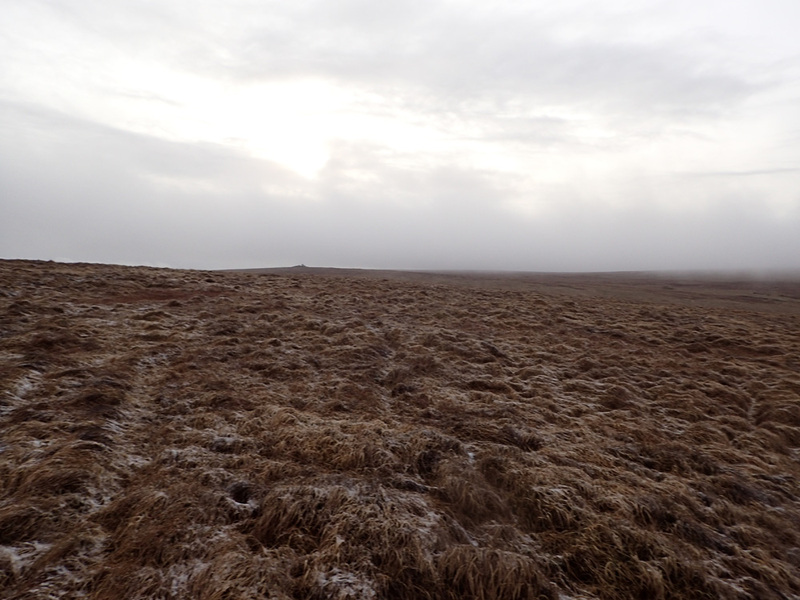 This leg will take me Southwestward toward an unmarked hill at 521 mtrs where I will then proceed Southward toward Great Kneeset. 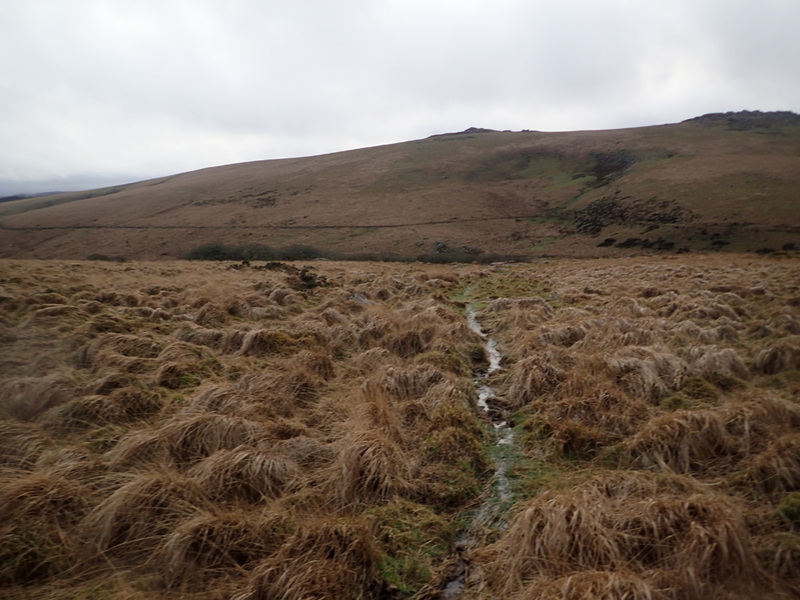 I don’t know about other hikers, but I always feel a little odd when I initially abandon a well made track for the wilds! But this feeling soon subsides once I settle down into the cross country walking. Here I find an animal trail which is broadly headed where I need to go. 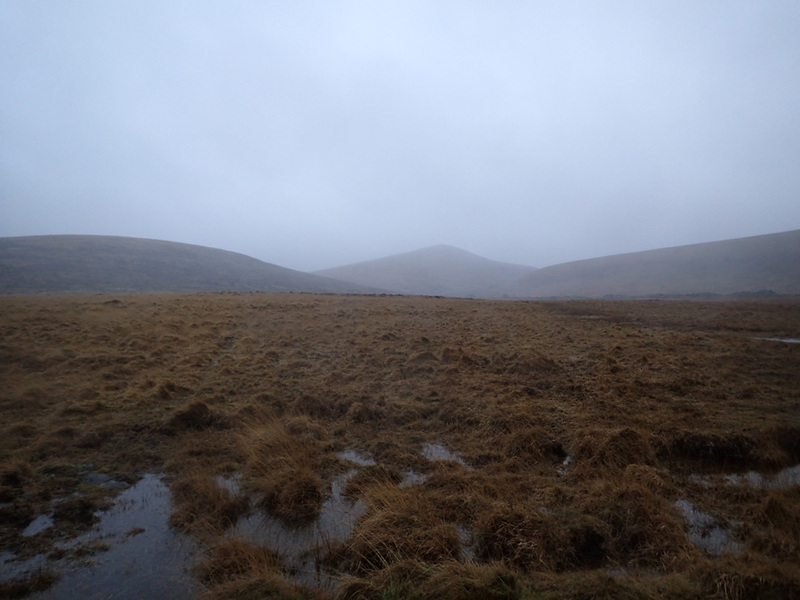 This saves having to negotiate the tussocks for the modest cost of a wetter ambulatory experience! I soon get to the top of hill 521. 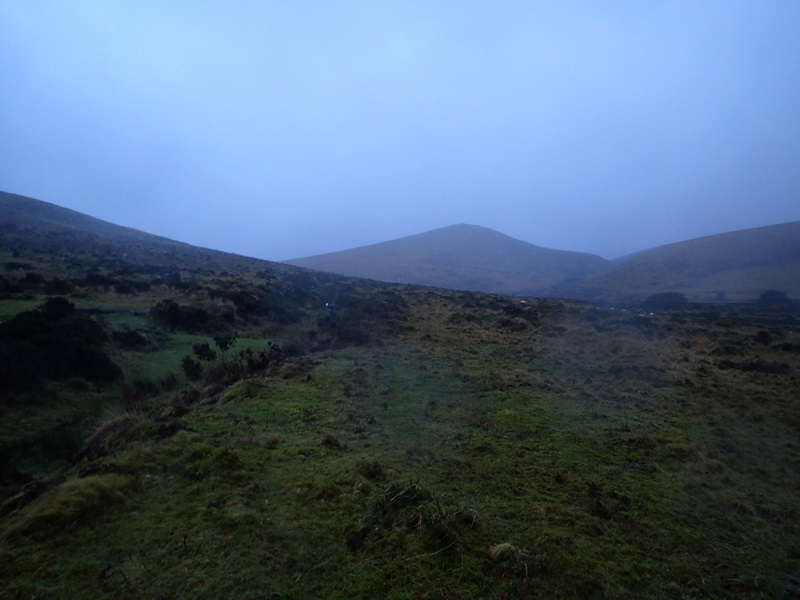 I now orientate myself toward Great Kneeset which is the hill off in the distance. The plan is to head downward and towards it. But before I can climb it I will have another stream crossing to negotiate. Down below I can see two groups of hikers. The group on the right look like they have successfully negotiated the stream. I elect to head toward their position, as there is likely to be a good crossing point there. The group of people on this side of the stream seem oblivious to the other group’s successful crossing and seem to be trying to locate a crossing point of their own. I get to the point where the other hikers were. The water here seems slower than the other parts of the stream, but the downside is that it is wider here. I get to the other side where I’m genuinely surprised by the depth. 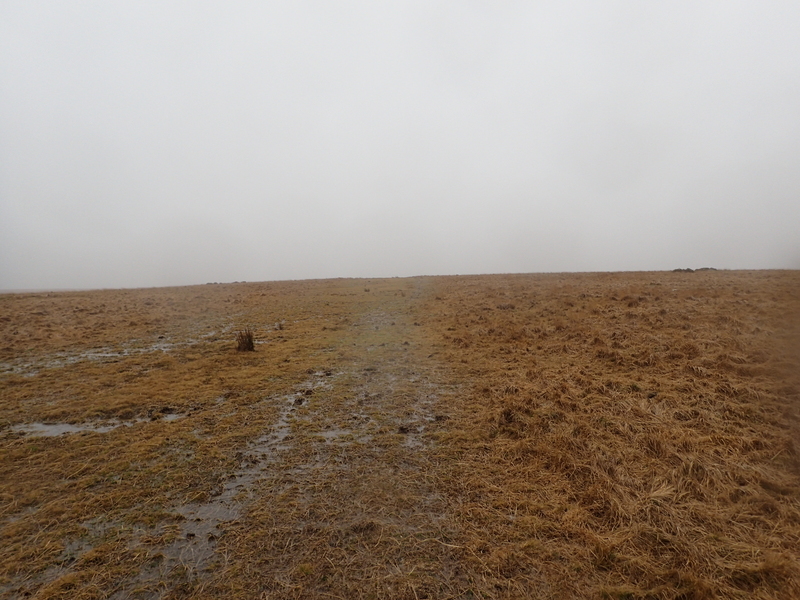 In this case it got deeper as I approached this far bank. It was almost at a point where the water was lapping up to my rolled up trousers. To my right, on the opposite bank, the other group of people have still not found a crossing point, despite many attempts. 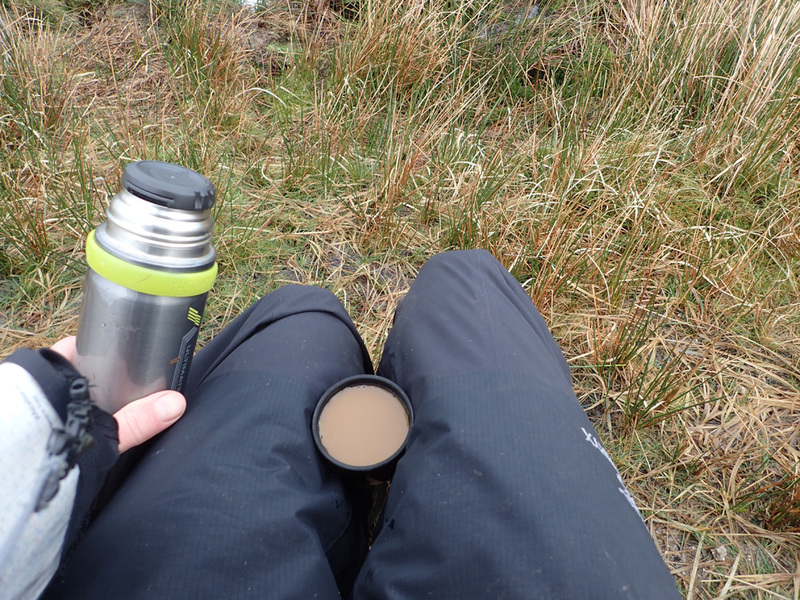 After towling myself off, I break out the flask as the rucksack is already off my back from the stream crossing. The hot coffee is most welcome in the cold. 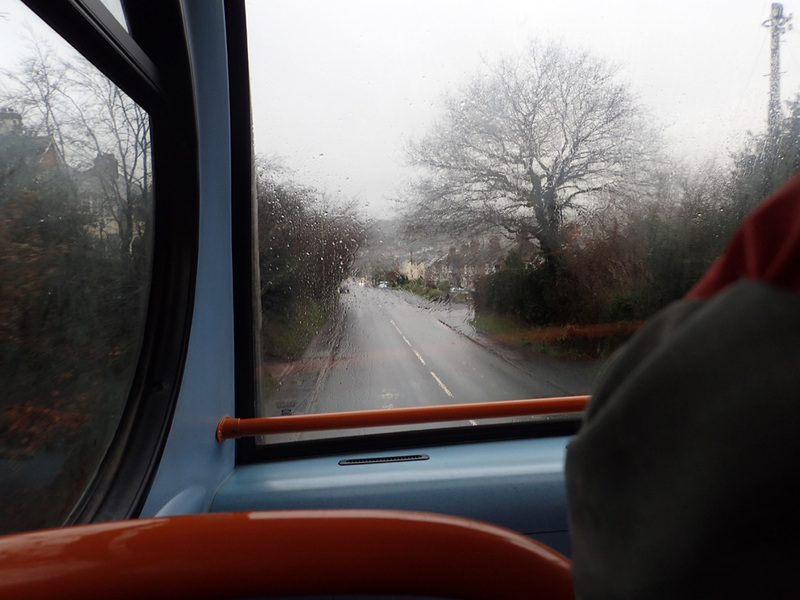 Note that I have kept my waterproof trousers on so as to combat the cold and retain body heat. After the coffee it’s on with the climb of Great Kneeset! The view behind me is glorious. 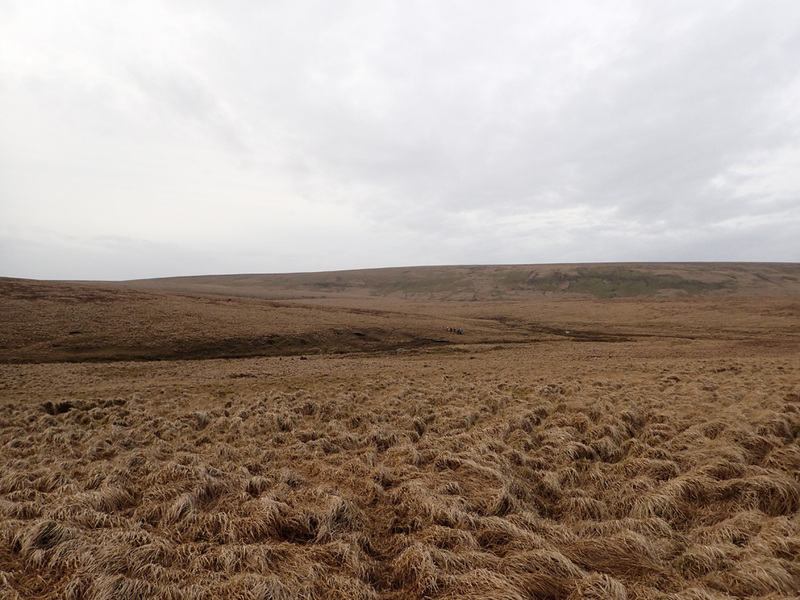 I take the time to memorise the lay of the land in that direction as this would form my exit route back off the Moor. 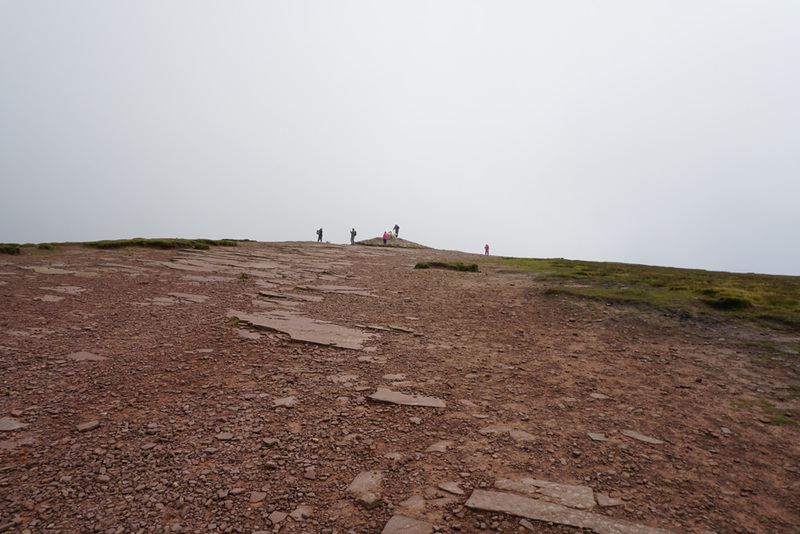 I get to the top and note rather disaprovingly that the group of hikers had left orange peel on the ground. They can be seen to the top right of the picture forming a tight knit circle, presumably to try and gain some shelter from the wind and aid communications. For some reason I find their extended group huddle mildly amusing, despite its practicalities! It’s now back on with the walk. 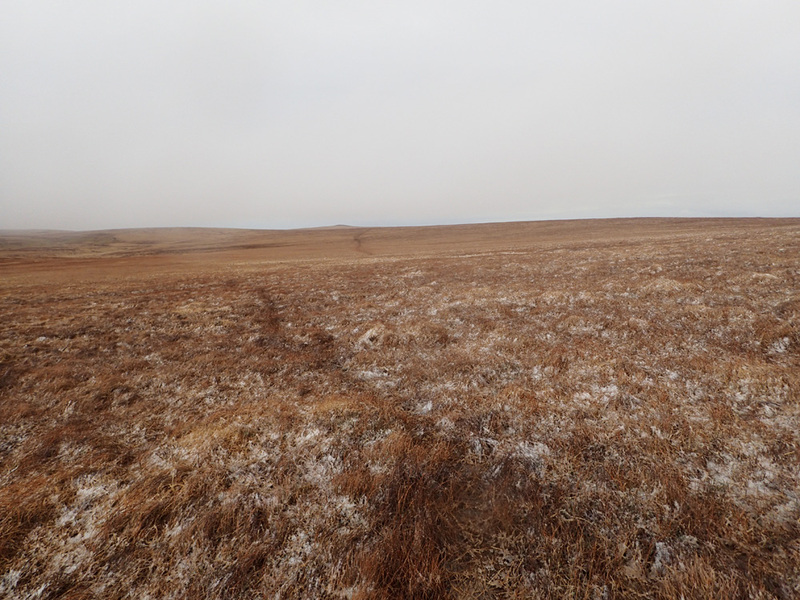 The plan is to head Southeastward toward Black Ridge up ahead. Then from there I will break Southward toward Cut Hill. 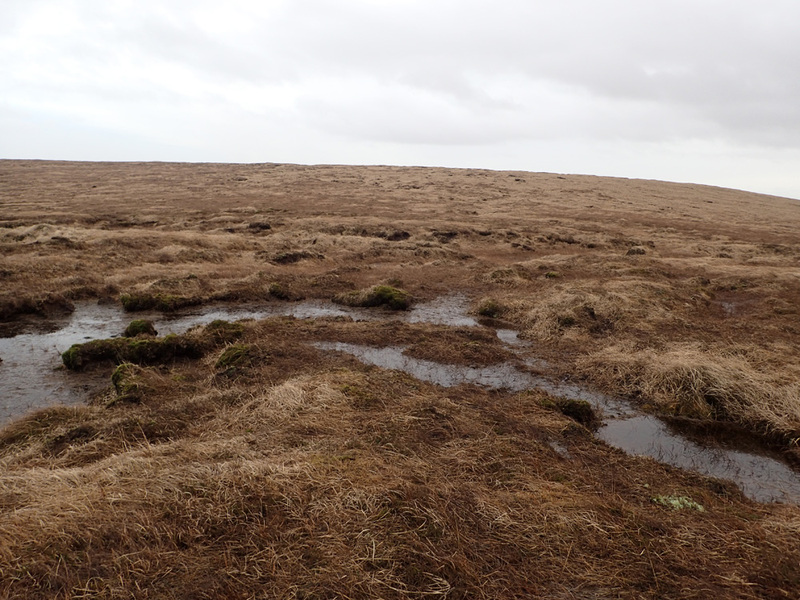 The terrain is criss crossed by many boggy areas like this one. These need a combination of detours and Super Mario like jumps to get across. I find myself continually scanning the ground ahead so as to find the least path of resistance. 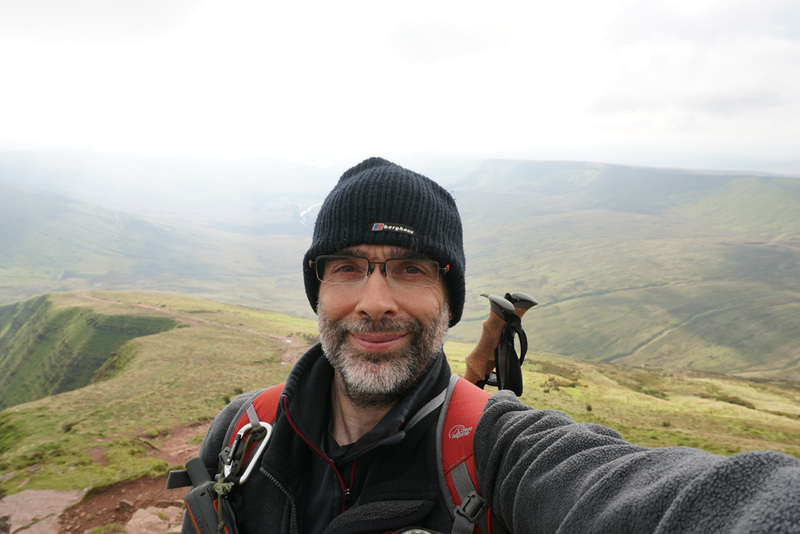 I’m now on the final ascent for Black Ridge! 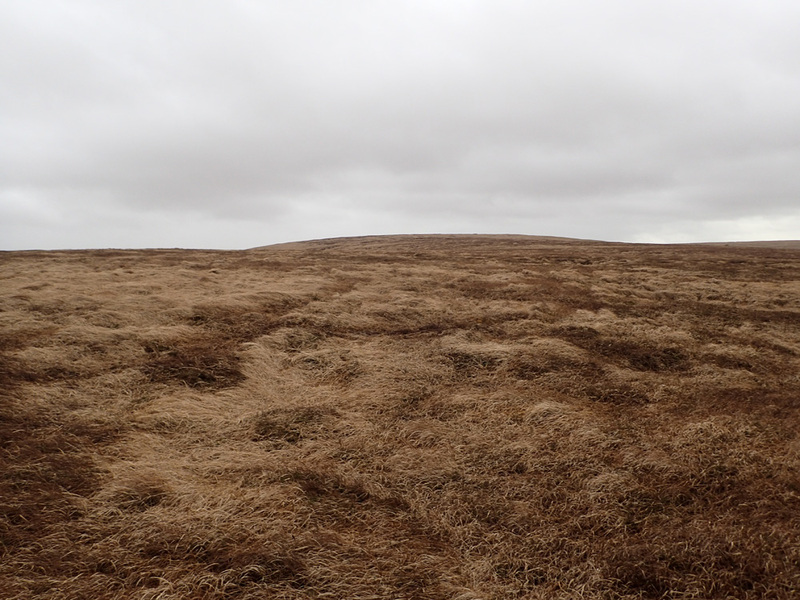 The top of Black Ridge is criss crossed by many gouged out peat passes. 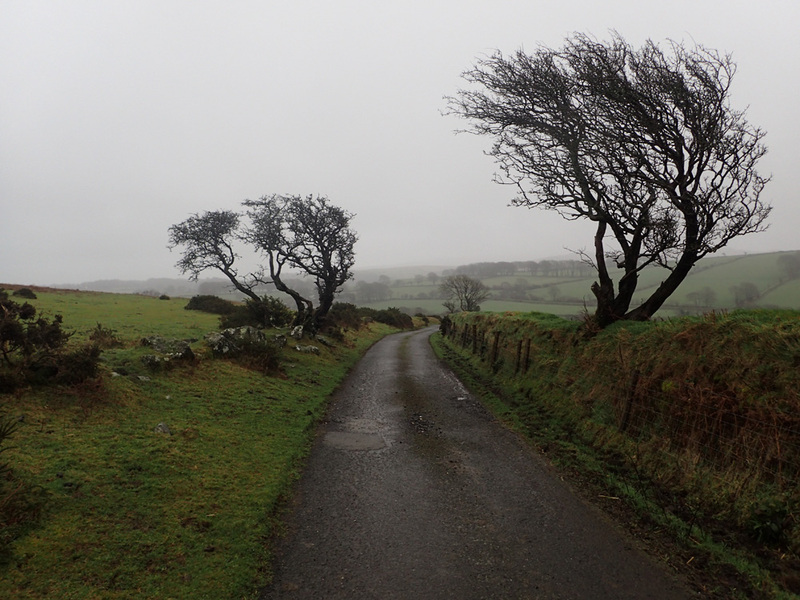 These are actually great places to shelter from the wind, regardless of its direction. 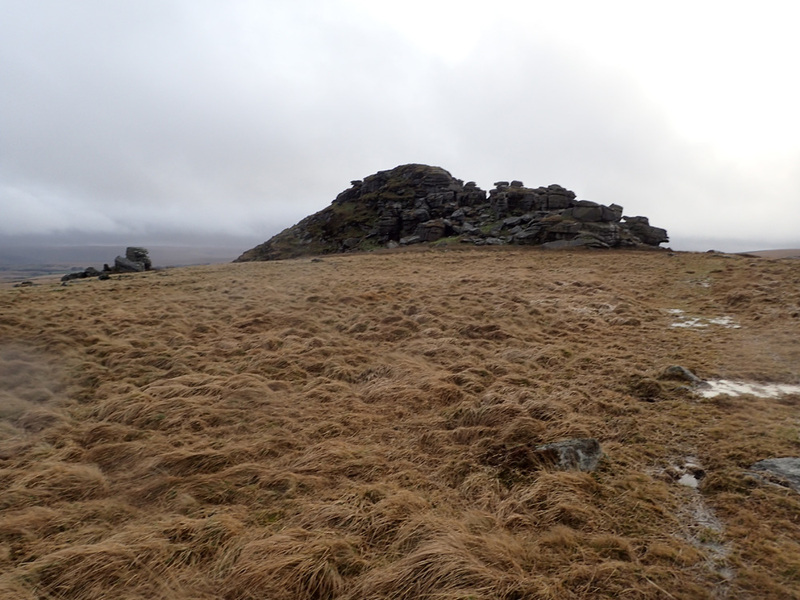 A mini-cairn marking the top of Black Ridge at 573 mtrs. 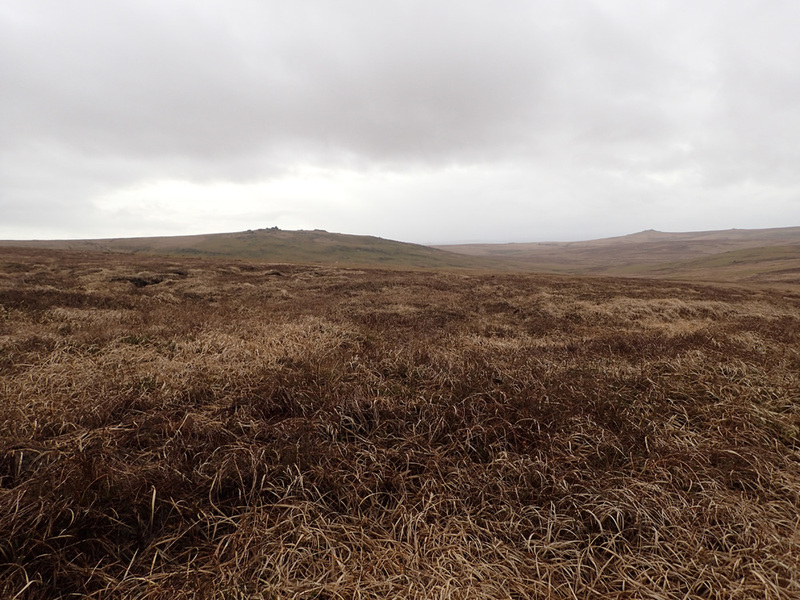 In the far distance is Fur Tor – the Queen of the Moor. 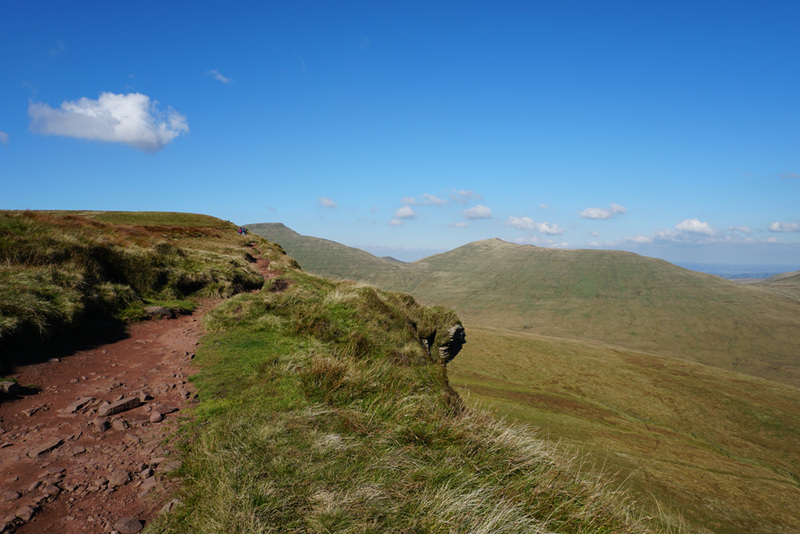 The other group of hikers were last seen descending Westward down Great Kneeset. I’m guessing they are headed toward Amicombe Hill as that is the only point where they can do this without having to cross a stream. It’s now a 2.5 km walk Southwards to Cut Hill. 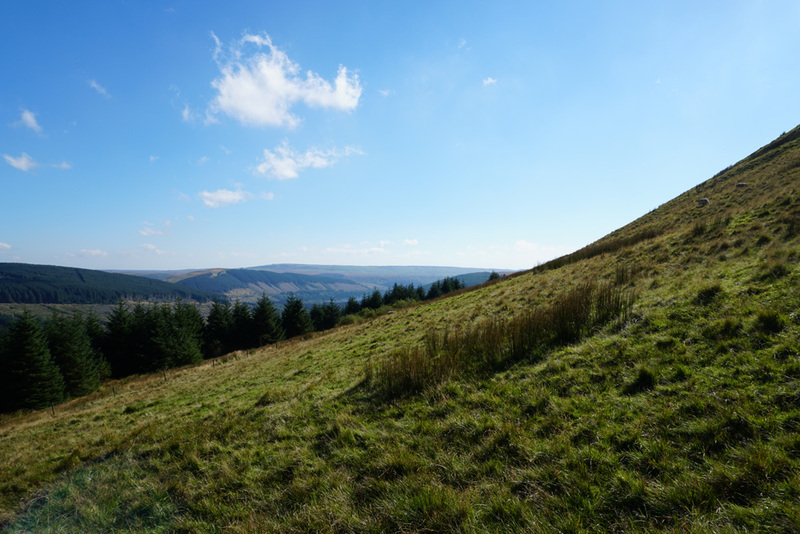 It is the tallest hill in this area, so is easily identified. I elect not to head directly toward it. Instead I put in a gentle curve to the left to allow me to contour my way there. This saves me from having to lose elevation unecessarily. 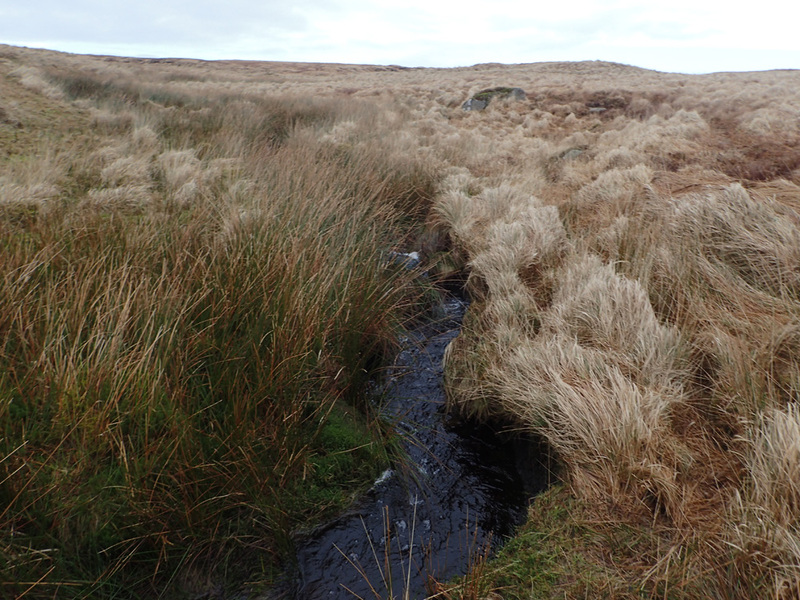 On the way to Cut Hill there are a few streamlets to negotiate, but they pose no problem, just a quick hop across. Plus, they are a great source of water! I’m now on the final ascent stage of Cut Hill. 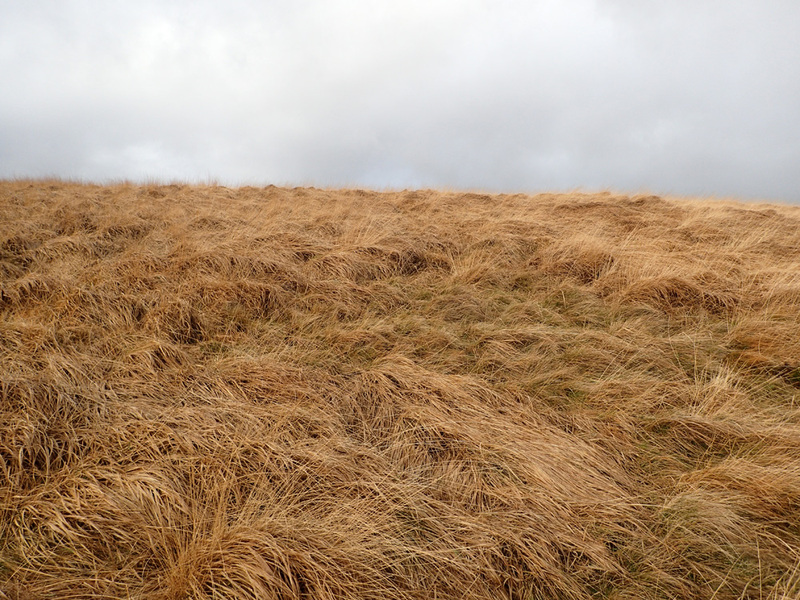 Today’s walk is more or less down hill after I reach the top of this hill. I find myself glancing to the right quite often. 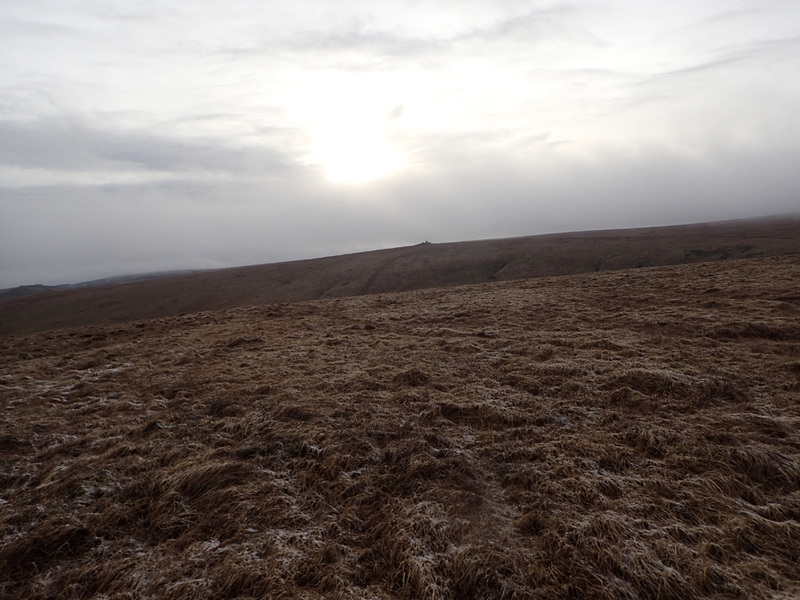 The view in that direction is pretty good, especially with Fur Tor as the centre piece! 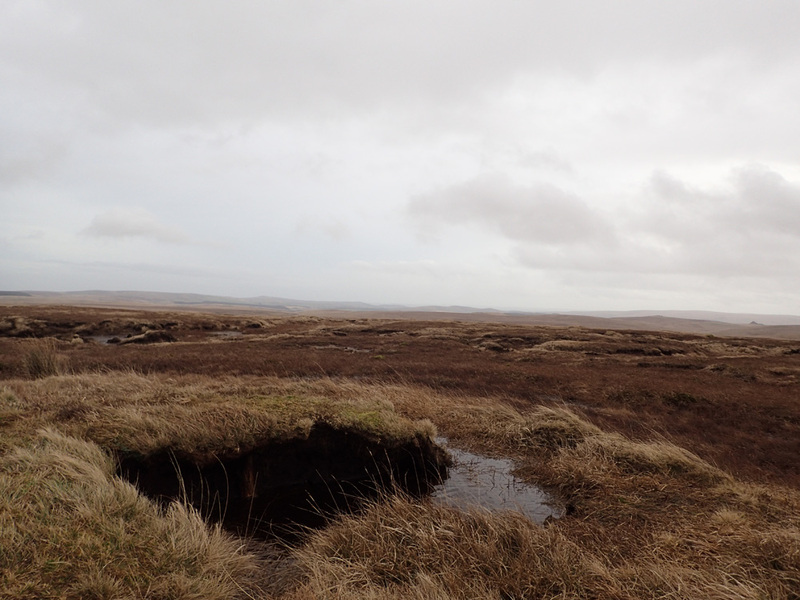 Just like Black Ridge, Cut hill is topped by many peat passes which provide some welcome respite from the harsh winds. 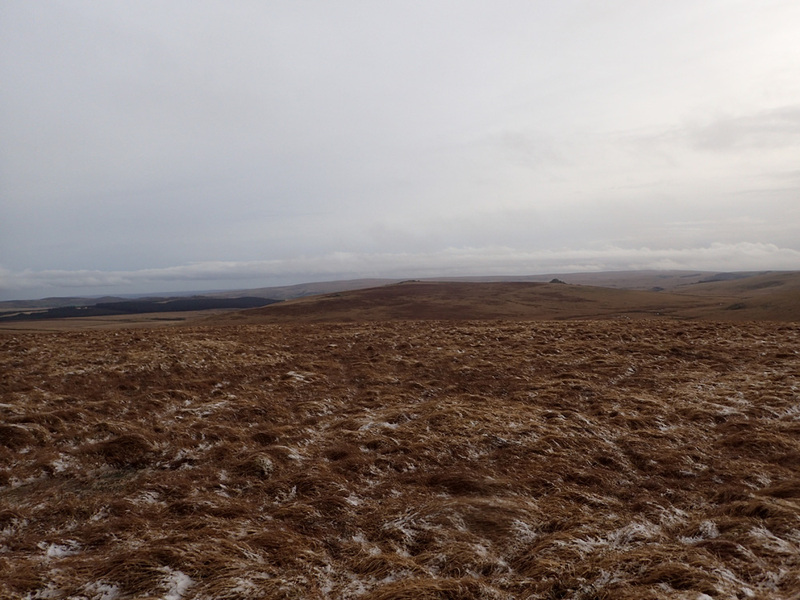 On crossing the ridge line I get my first decent view Southward. I notice that the visibility is starting to drop like a stone. I put in some last minute compass checks before I lose my visual cues completely. 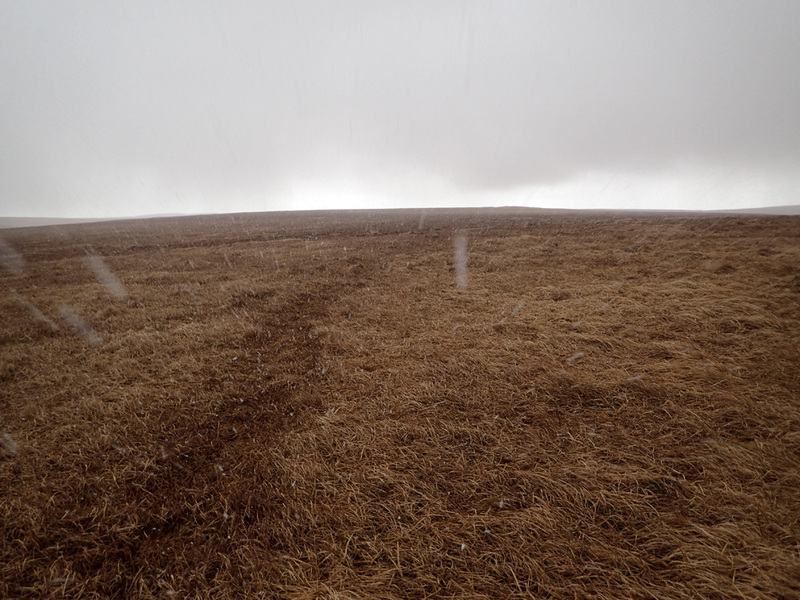 The high winds make the snow and hail rather painful. 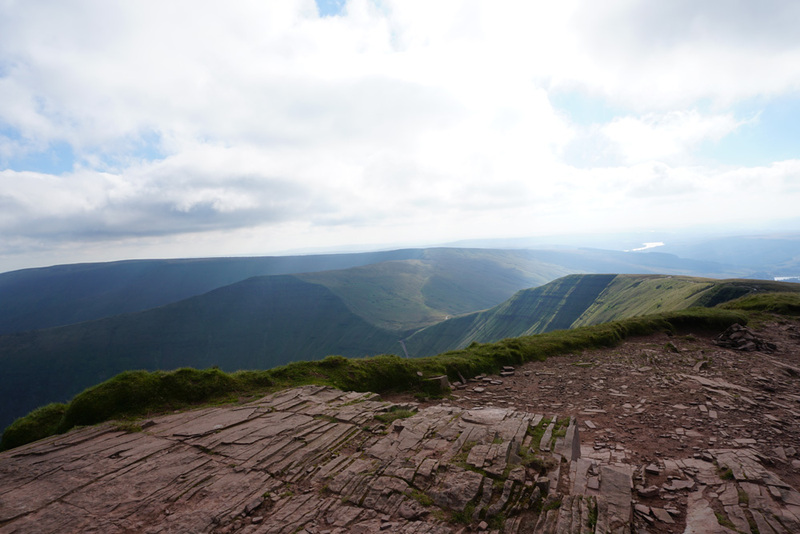 This part of the walk is turning truly epic! The downpour is so ferocious that it doesn’t take long for it to start to settle. I’m not a fan of the Army range markers. 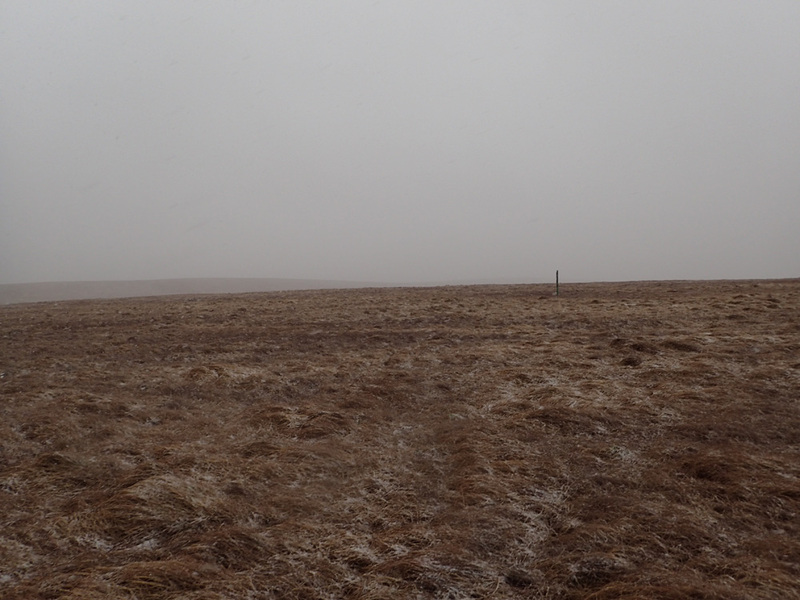 However, in conditions like these, they make excellent navigation features. 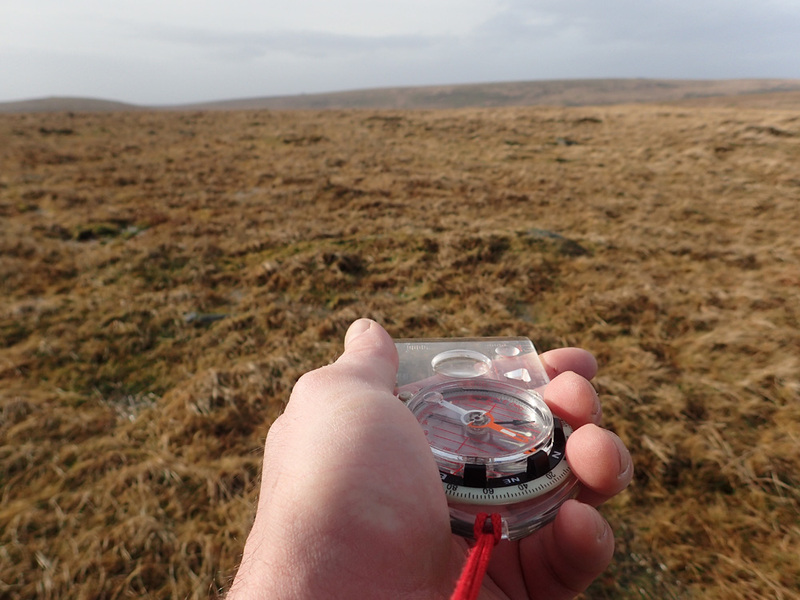 The plan is to follow the markers Southward until I bump into the West Dart River. 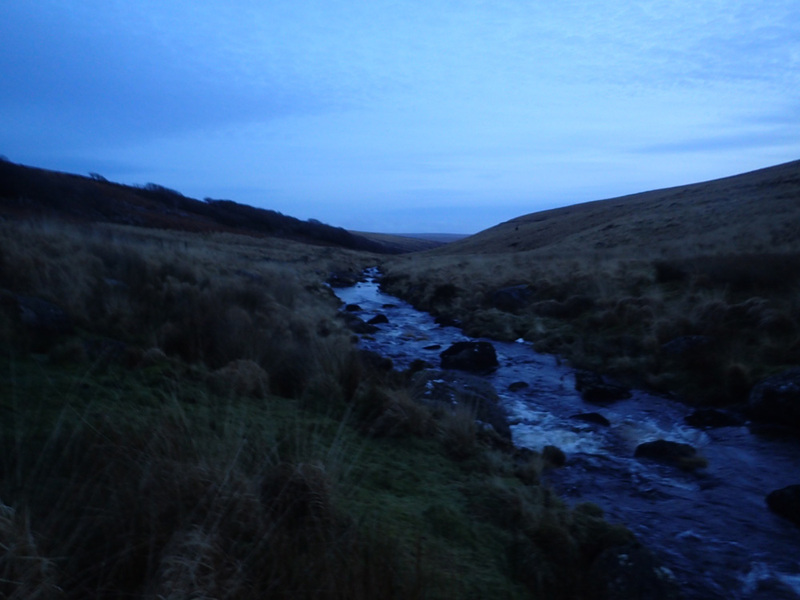 At this point it will be a mere stream, but it will provide me with a navigation fix and it will provide additional confidence that I’m navigating Southward on the correct side of it – vitally important if I’m to visit Crockern Farm tomorrow. The visibility starts to open up again. It looks like I have got through the worse of the downpour. 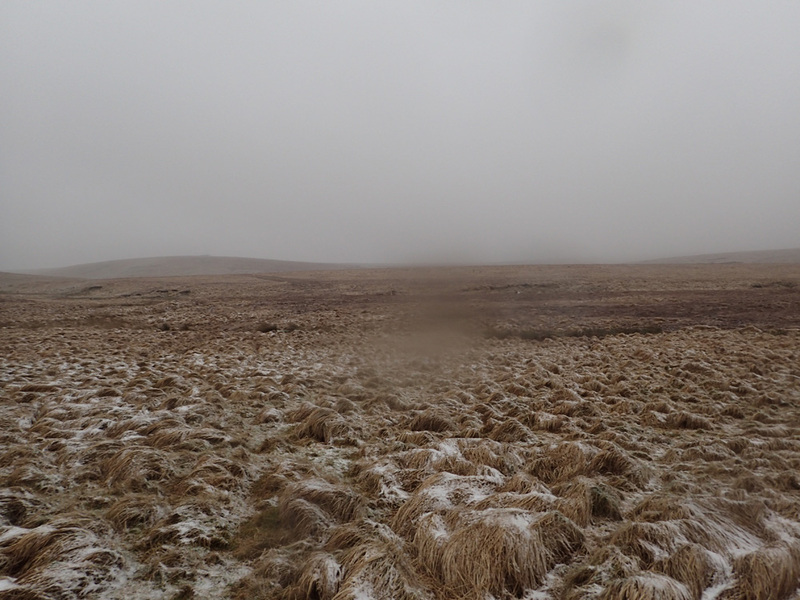 It’s now a case of heading South Eastward toward an unmarked hill at 539 mtrs elevation. 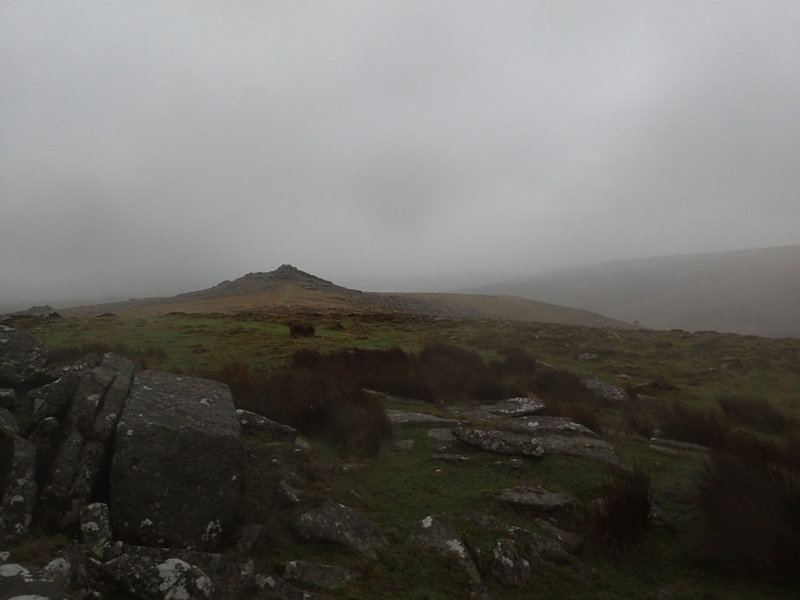 I’m not sure, but I think this is the view toward Rough Tor to the Southwest. I really should take more notes! The hill climb up the unmarked 539 mtr hill is relatively easy. I’m keen to see what’s on the other side, as I should be picking up Lower White Tor as the primary navigation point to take me toward Crockern Farm. 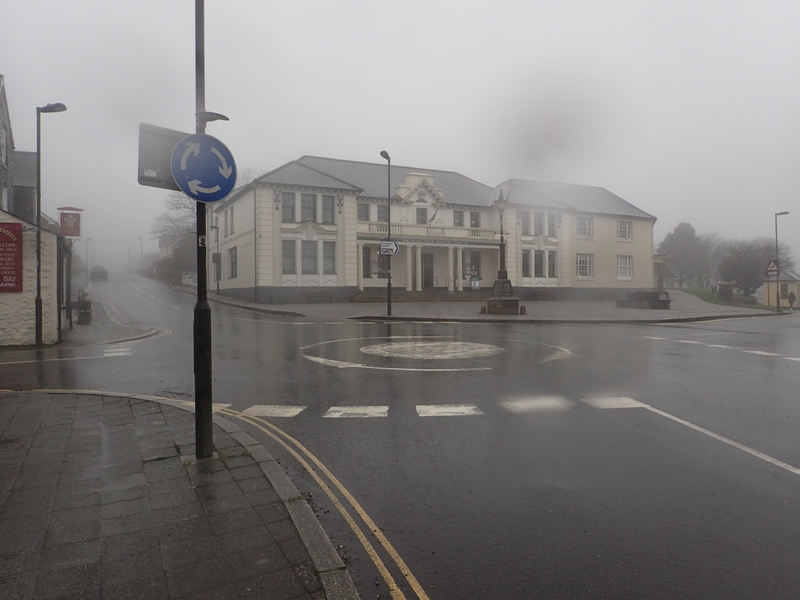 Although the weather is improving, it still lapses into the odd down pour. The one constant, are the high winds. 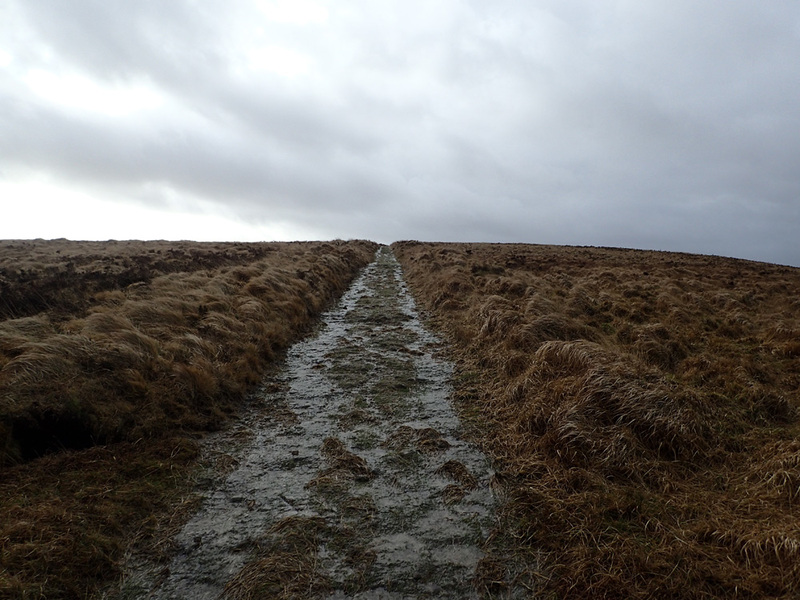 I wish that I had the presence of mind to film this part of the walk to impart to readers just how bleak and foreboding this section was. Nearly at the top of the 539 mtr hill! 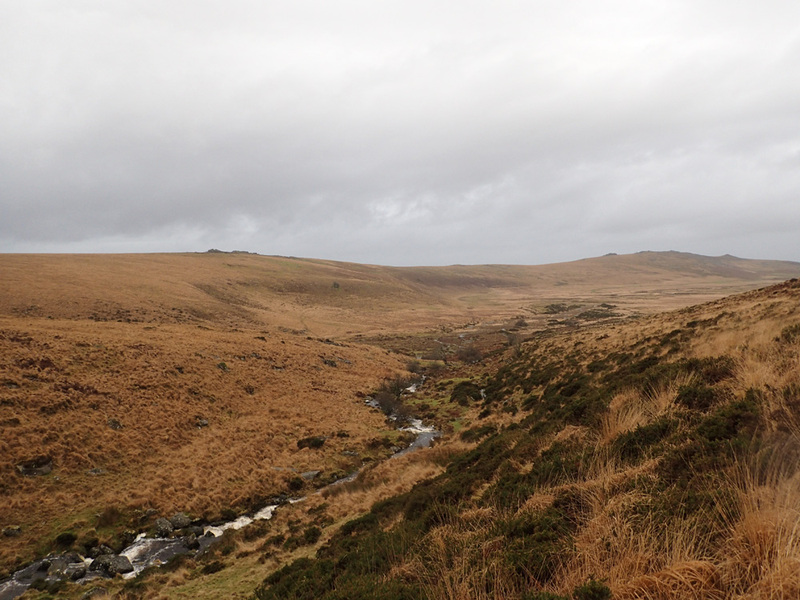 To the Southwest I can still see Rough Tor, which provides further reassurance that I’m on the correct side of the West Dart River. Nearly at the top. *Crosses fingers* that Lower White Tor will come into view! Otherwise there might be a need for some re-planning! 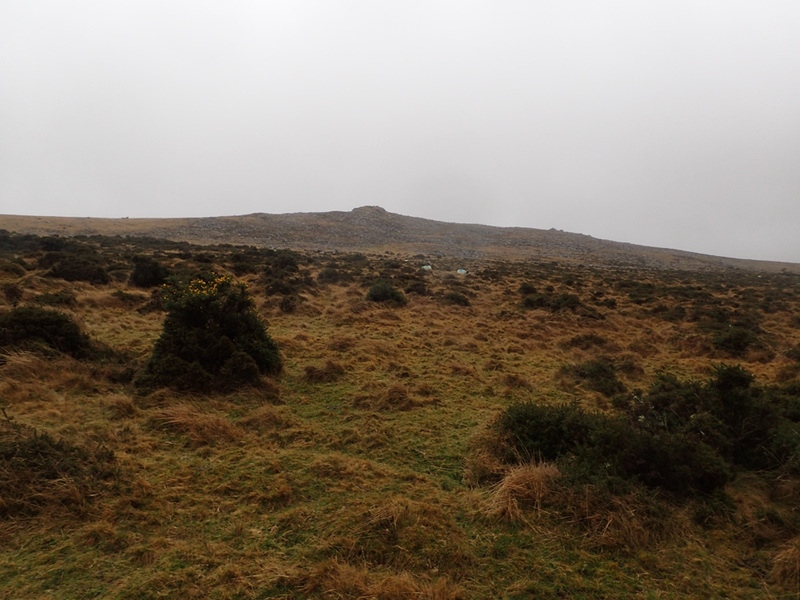 Another view toward Rough Tor to the Southwest. 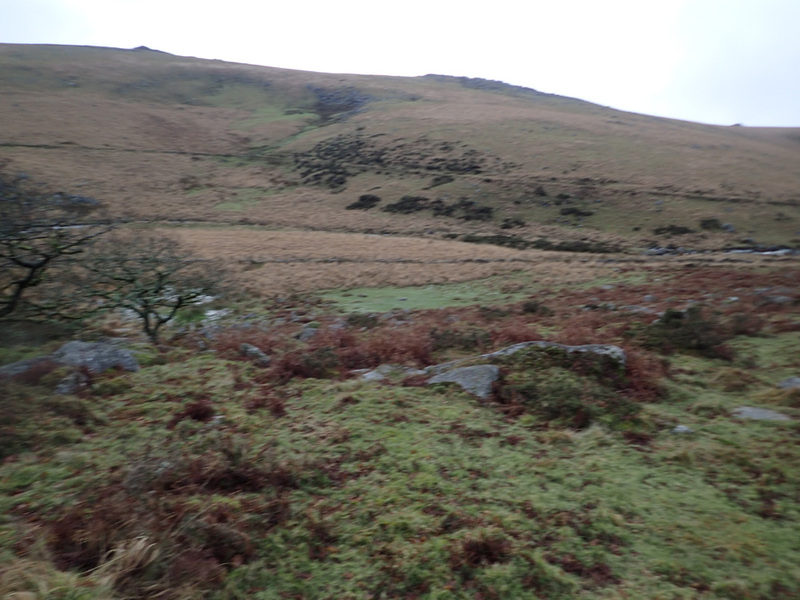 The wall running down the side of the hill beside it provides further evidence that this is indeed Rough Tor and that I am in the correct place. 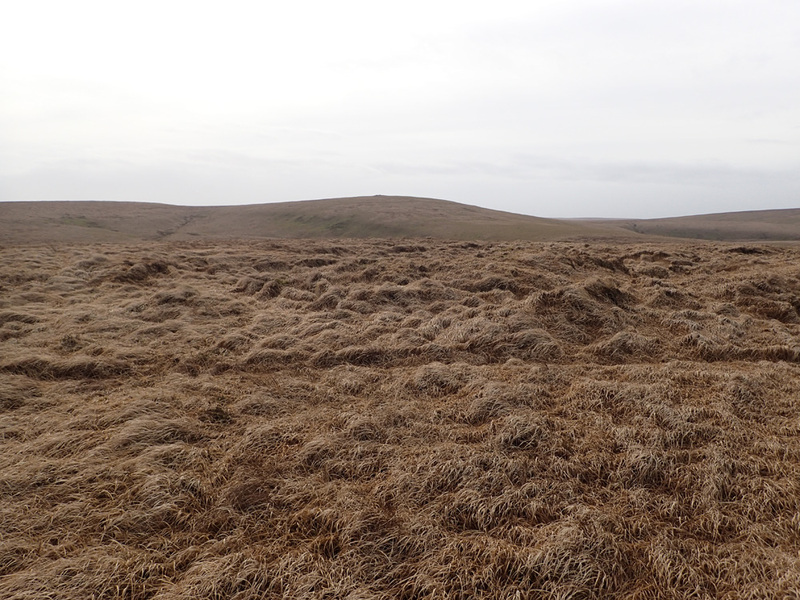 On Dartmoor, one can never have enough confirmations of position! 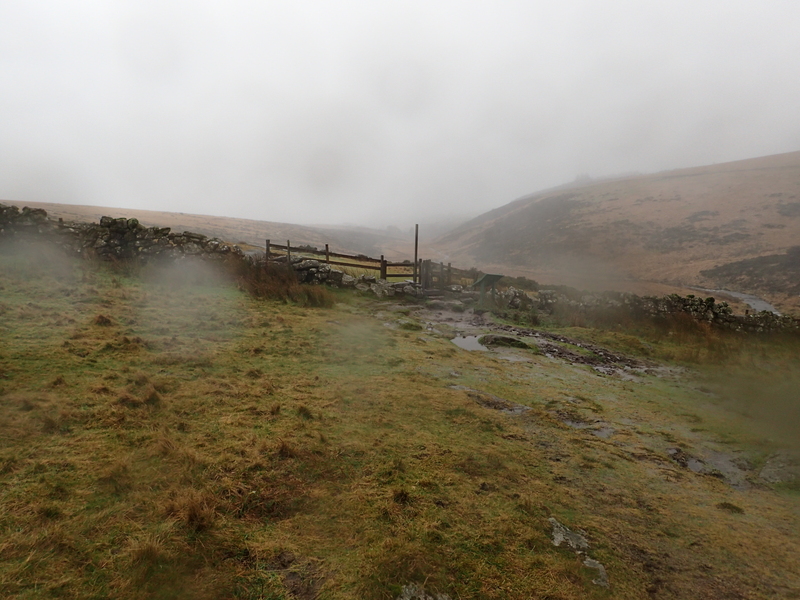 *Drum Roll* I cross the hill crest and there it is, Lower White Tor directly in front of me! Navigation +1! 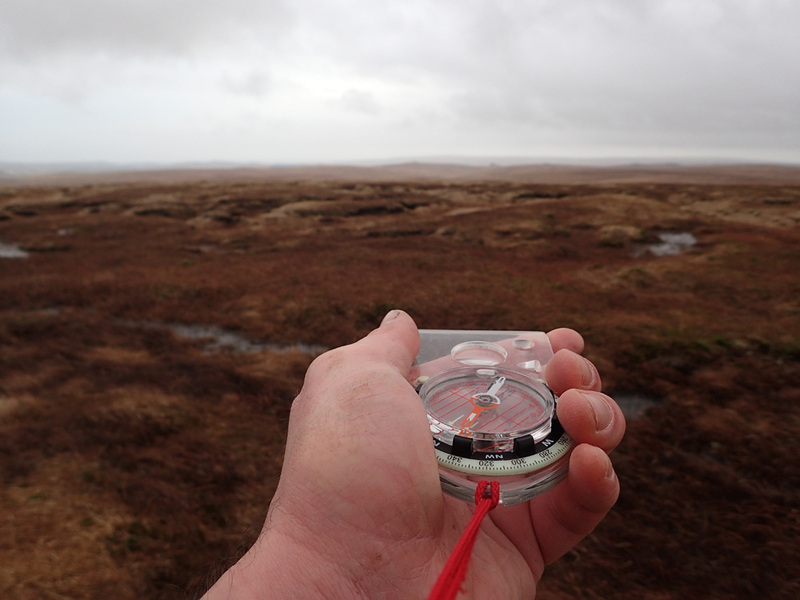 I’m now quite relieved as the navigational picture has resolved itself with no doubt as to my precise position. 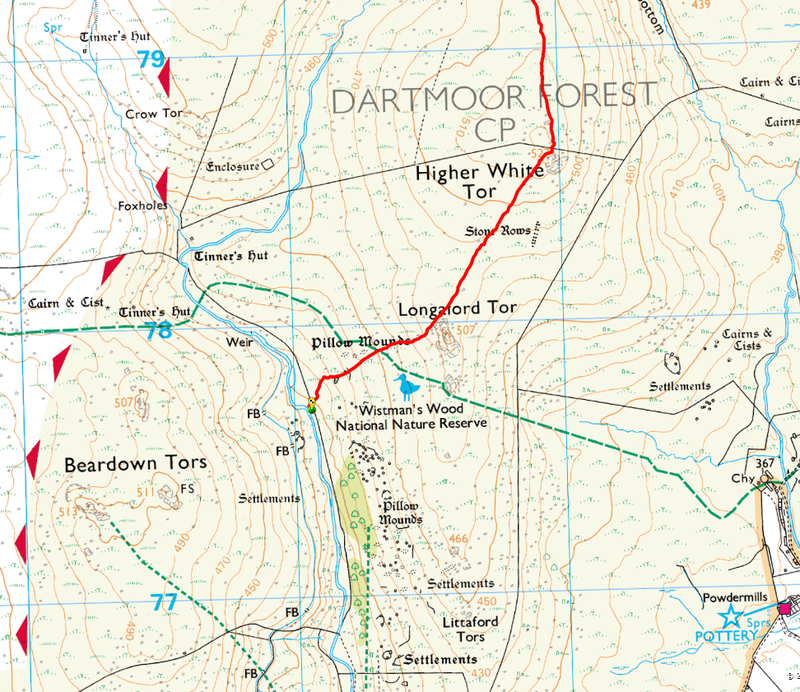 From this point onwards it will be a very easy down hill stroll going from Tor to Tor until I make the final camp spot. 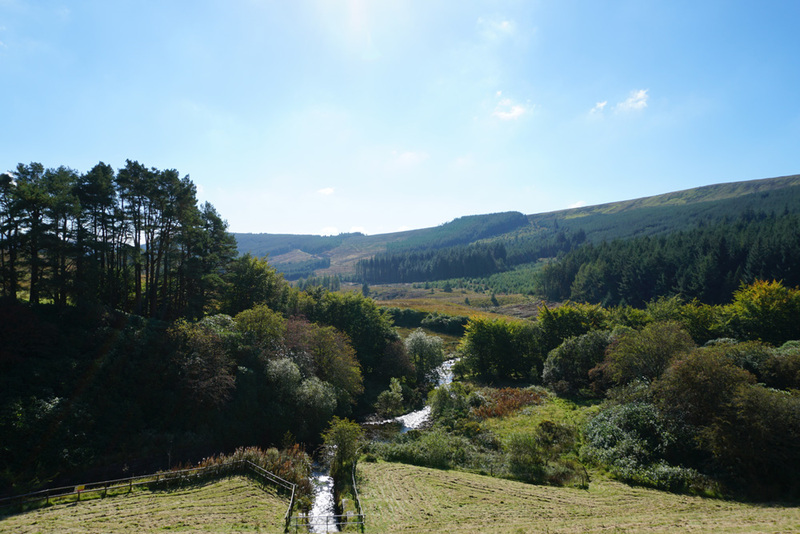 The view down the West Dart valley is outstanding. 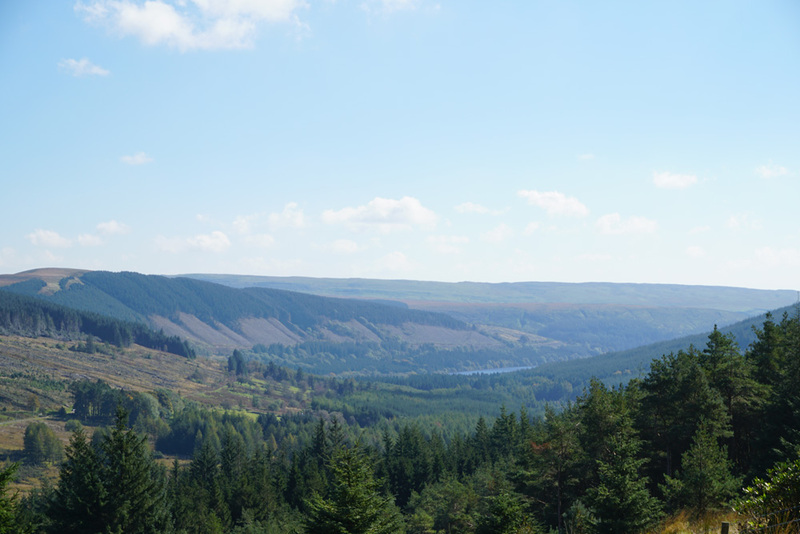 As a bonus, I know the planned camp spot for the day will be in that valley. Today’s walk is nearly at an end! Up ahead are the ruins of Brown’s House another perfect navigational marker! 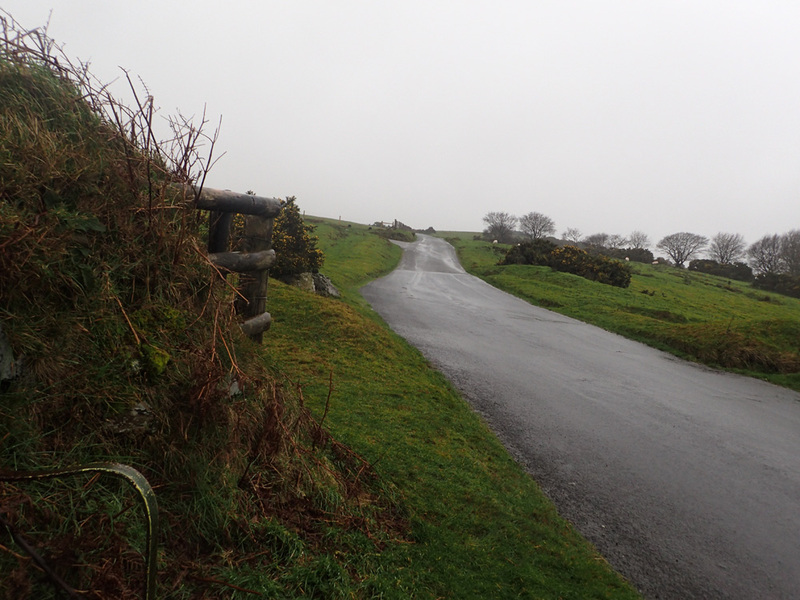 It’s now time for the final hill climb of the day up to Lower White Tor. 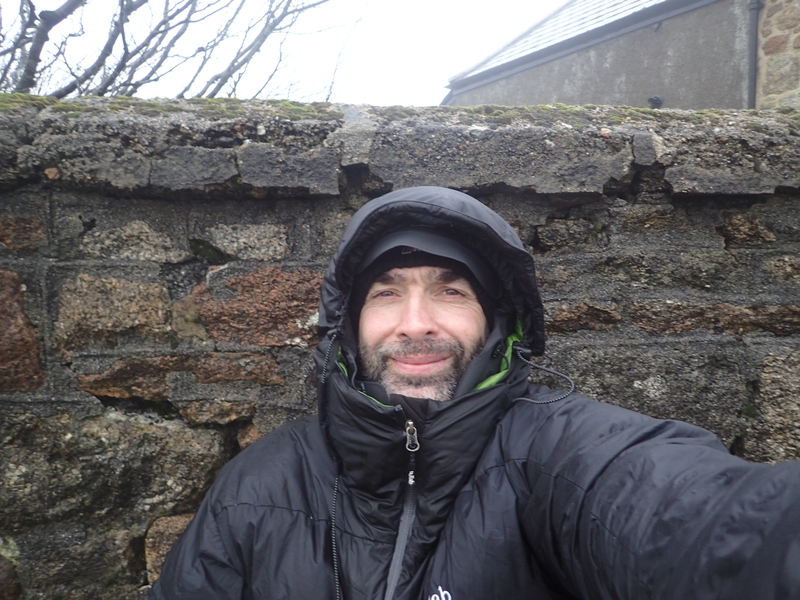 To my right is Rough Tor and its characteristic wall. 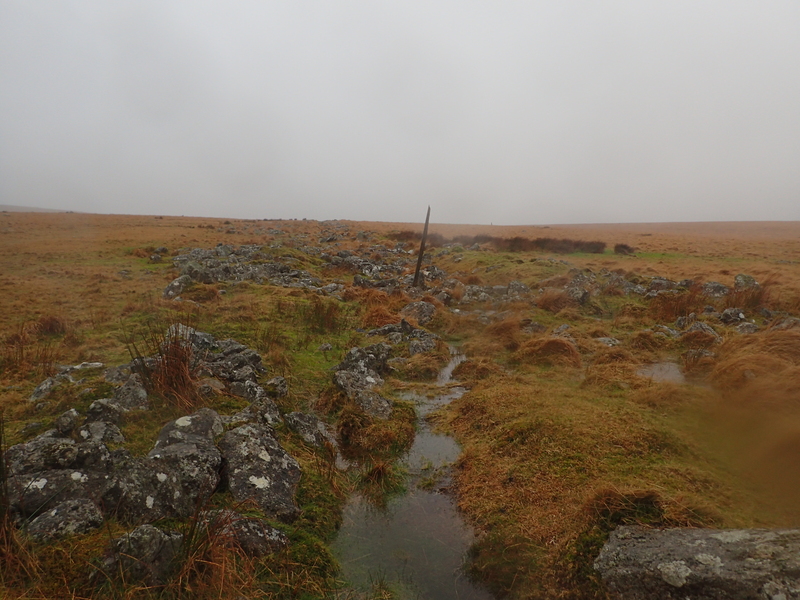 That wall marks a crossing point of the West Dart River that I have used many times in the past. The sun’s proximity to the horizon is definitely making itself known. I estimate that I have around an hour of daylight left. With only around 2 km downhill left to do, it looks like I should arrive on time! It isn’t long before Lower White Tor comes into view. 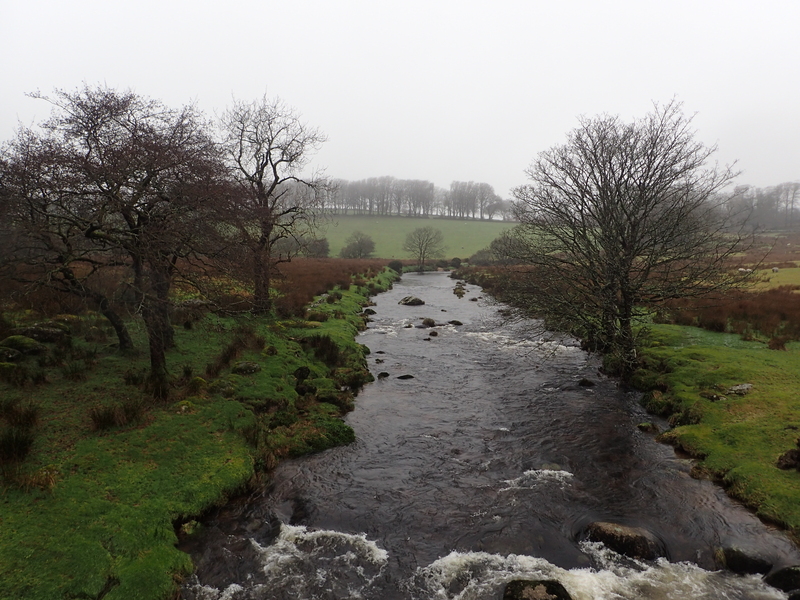 It is the first of three Tors that I will be following into the West River Dart valley. Higher White Tor! 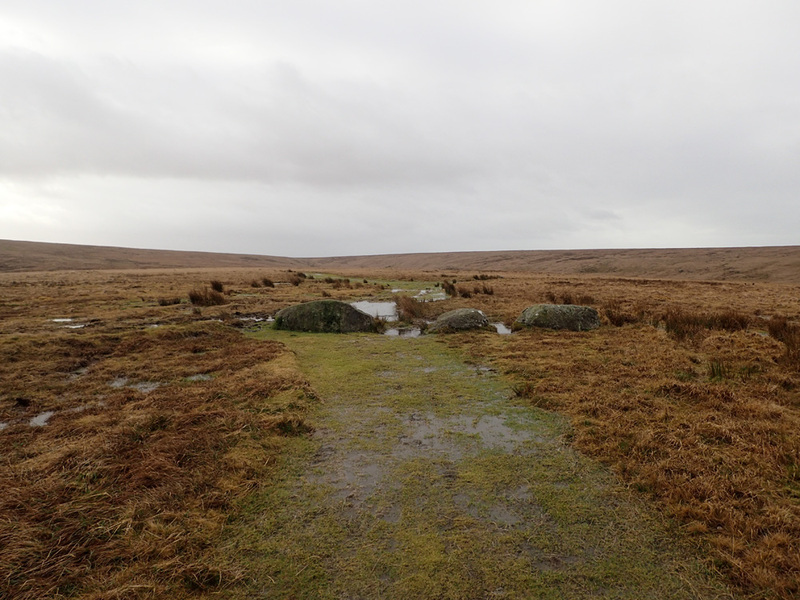 I have wanted to visit this Tor for a long time, but its positioning makes a North-South crossing of the Moor quite difficult, due to roads and the numerous boundary fences that litter the area. 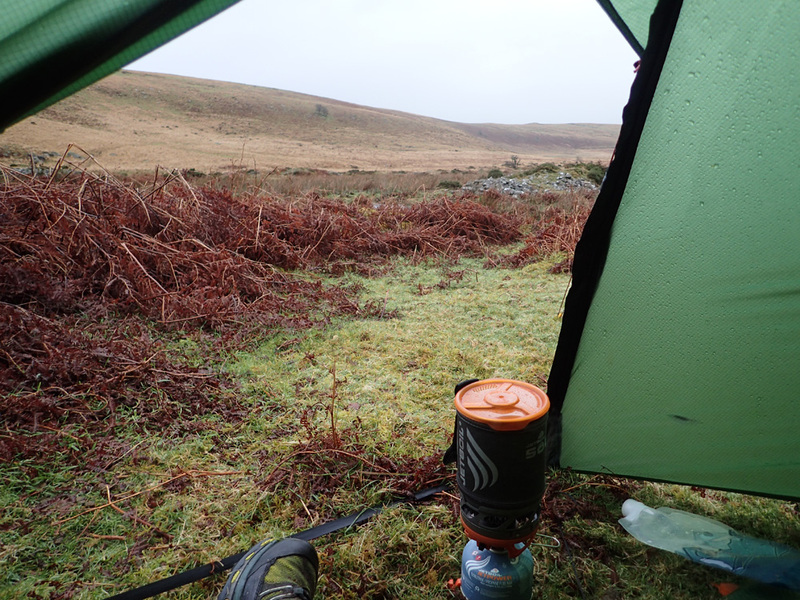 I elect to find some shelter from the strong winds and finish off the last of my hot coffee. 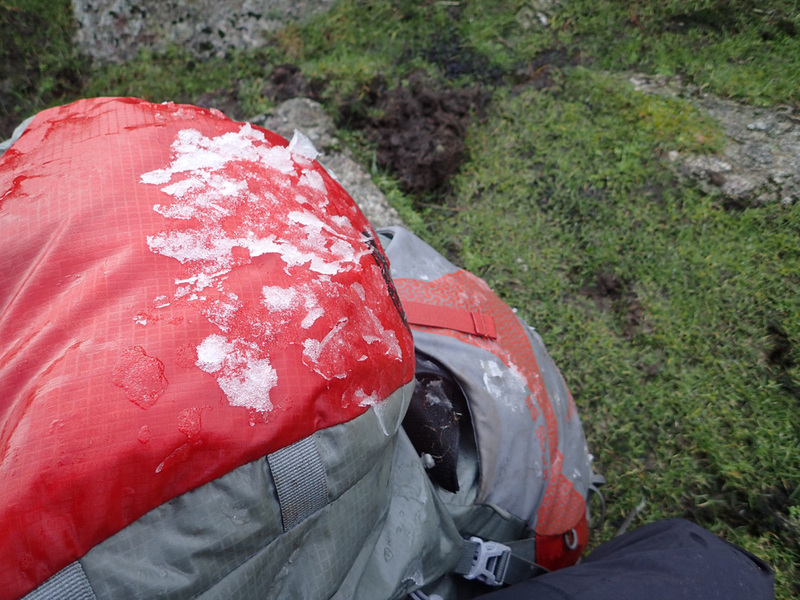 When I take off the rucksack I’m quite surprised by the build up of ice on it! When I sit down, I can’t quite believe that the coffee is still piping hot – Thermos make some pretty decent flasks – even if there is a premium to pay. 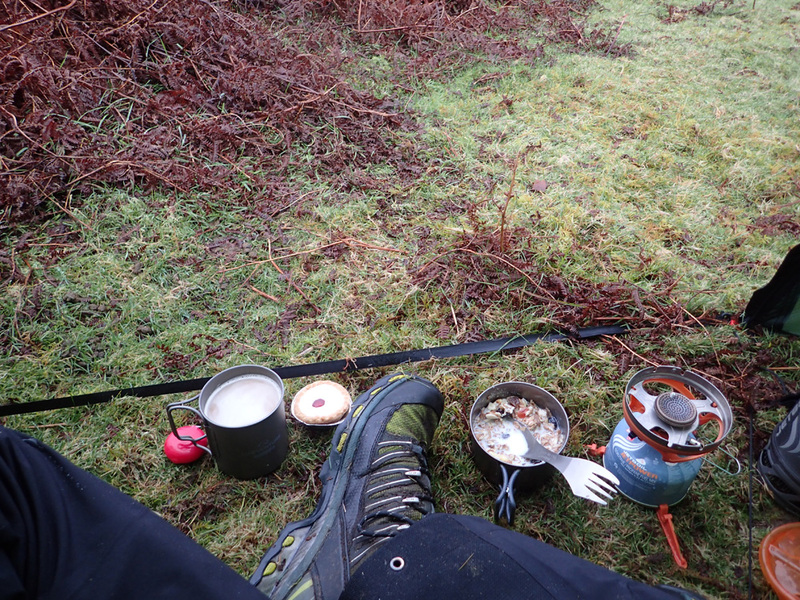 I also note, that in my drive to keep walking, I had forgotten to stop off for lunch. 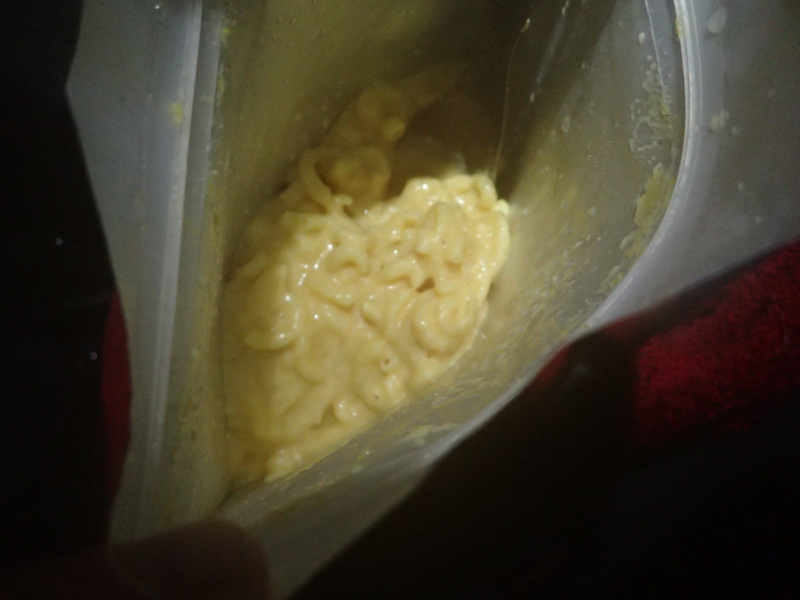 Even the on-the-go snacks have barely been touched. I start to wonder if I’m carrying around too much food…. Higher White Tor! Another first! 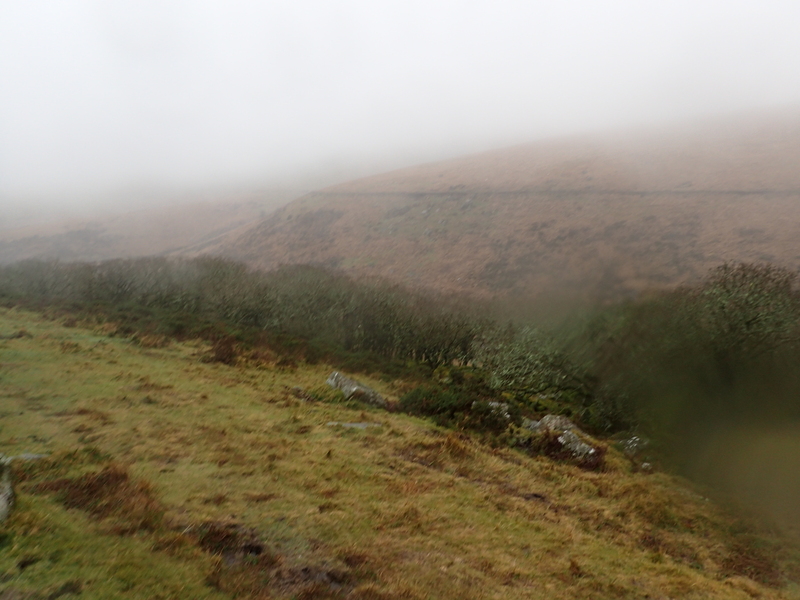 Once I clear of the wall I get a great view onto Longaford Tor down below. 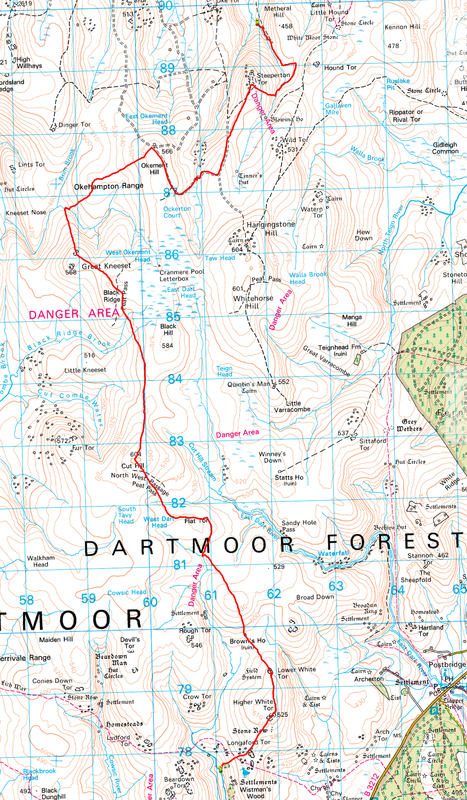 The plan is to head to that Tor, then start my descent down to the West Dart River ready to make camp. 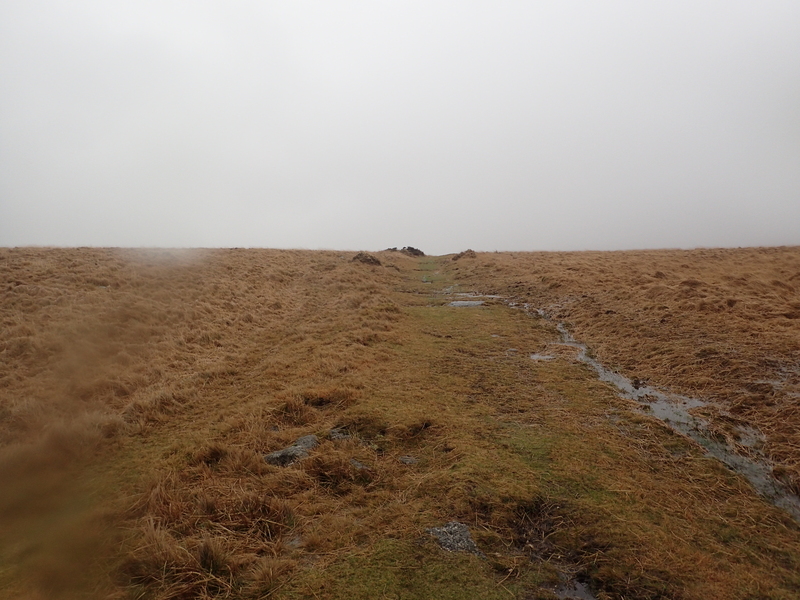 The wind and rain make this section of the walk quite difficult, despite the fact it’s downhill on relatively flat terrain. 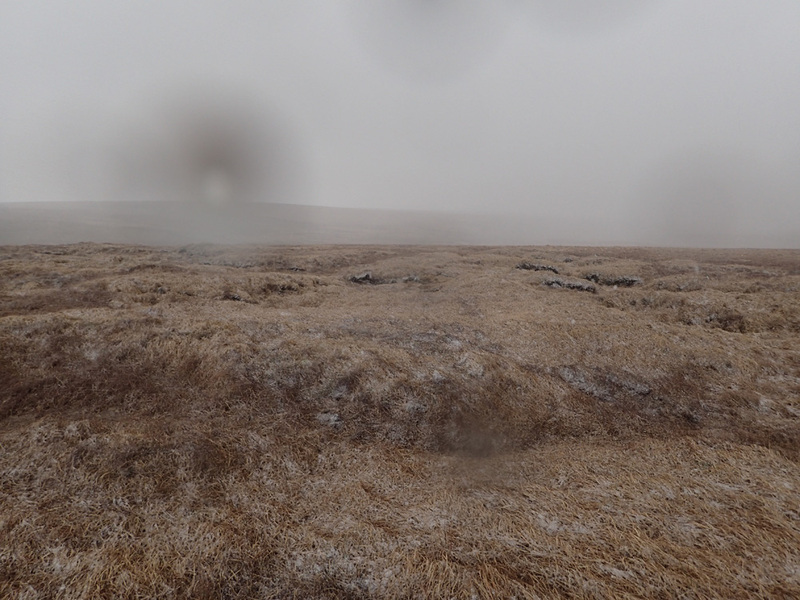 The map indicates several stone rows off to the left, but alas, I do not catch sight of them. Maybe next time? 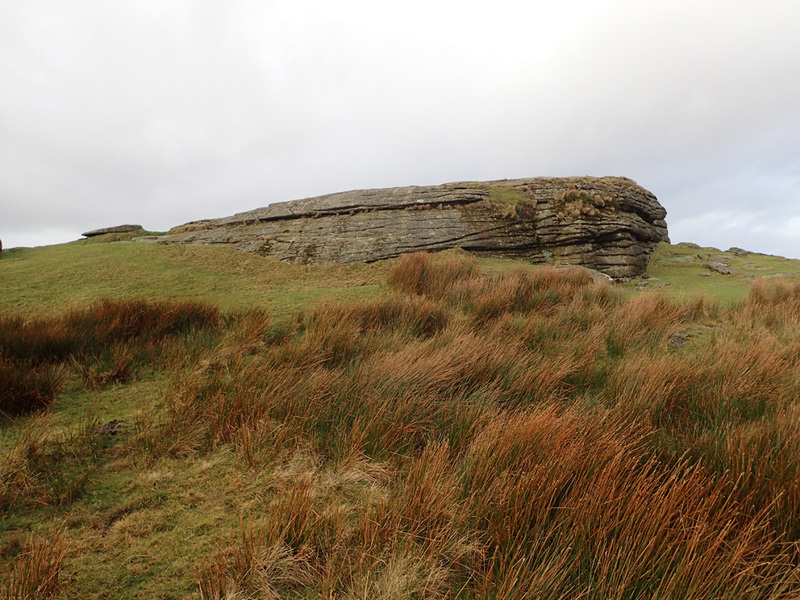 As I get nearer to Longaford Tor its imposing size starts to become apparent. 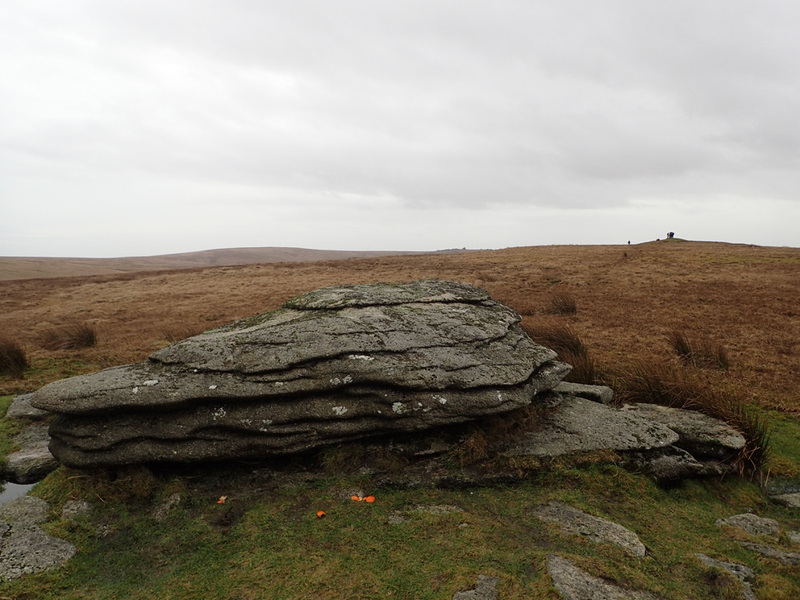 This has to be one of the biggest Tors on the Moor (with the possible exception of Great Links). Longaford’s rocks in greater detail! 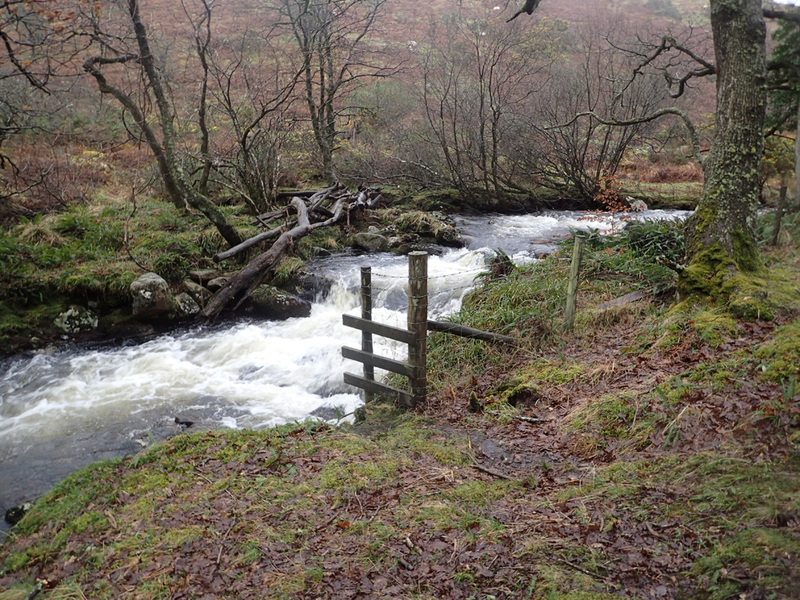 As I start my decent down toward the river, I catch site of the Weir that I camped by on a previous Winter trip here. 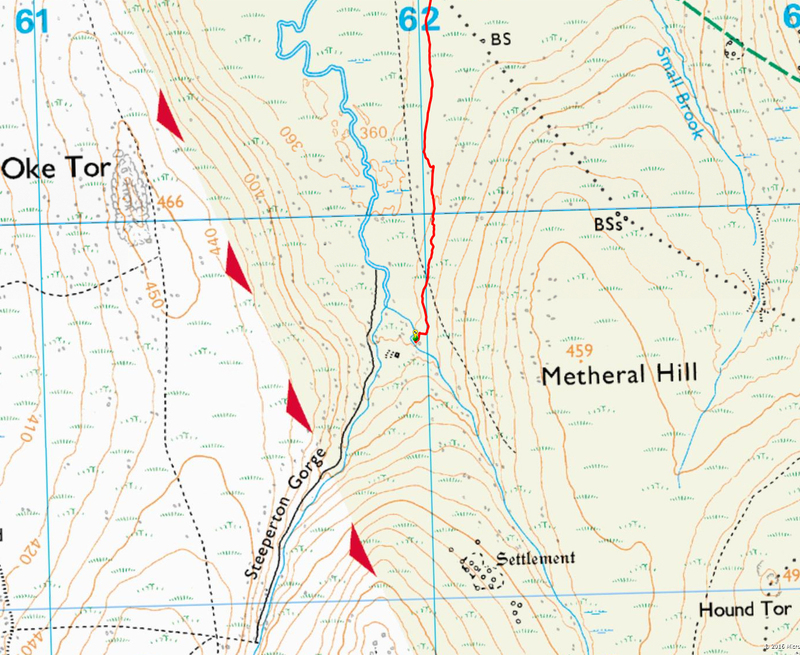 On that walk I was due to visit these Tors, but couldn’t get across safely. This was one of the reasons why I was being very careful navigationally speaking to ensure that I ended up on the correct side of this river. As I descend, the winds start to ease off. I guess the Beardown Tors across the way are starting to provide some shelter. 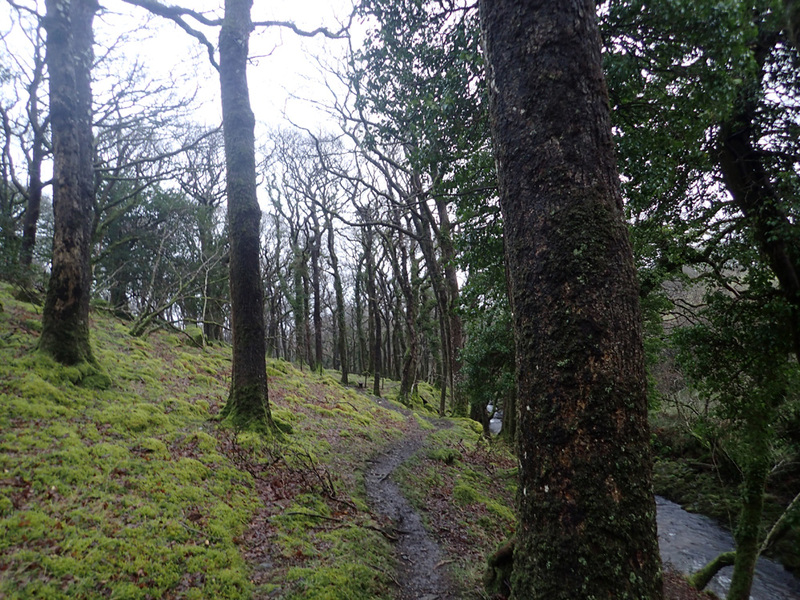 I soon get to the wood-line of Wistman’s Wood. 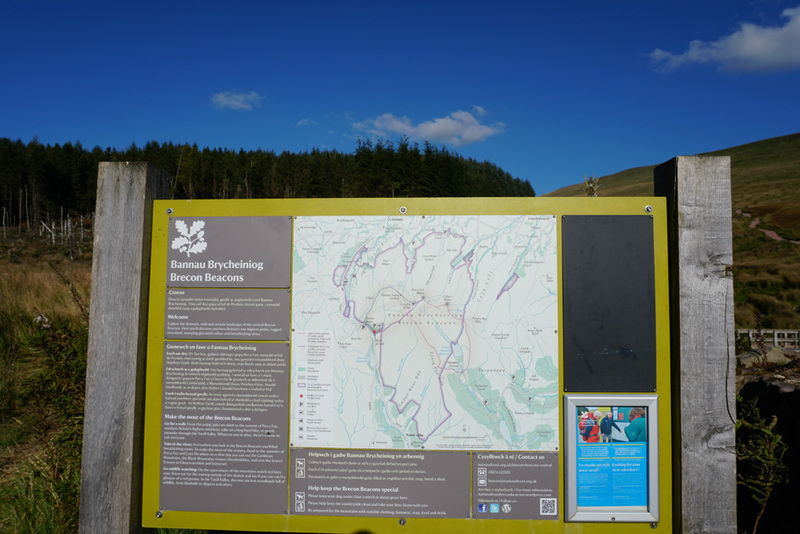 However, I note that this Northern extremity of the wood is not on the Ordnance Survey Map! I sometimes do have cause to wonder if they are cutting costs…. Down below on the right I spot what looks like the perfect pitching spot. 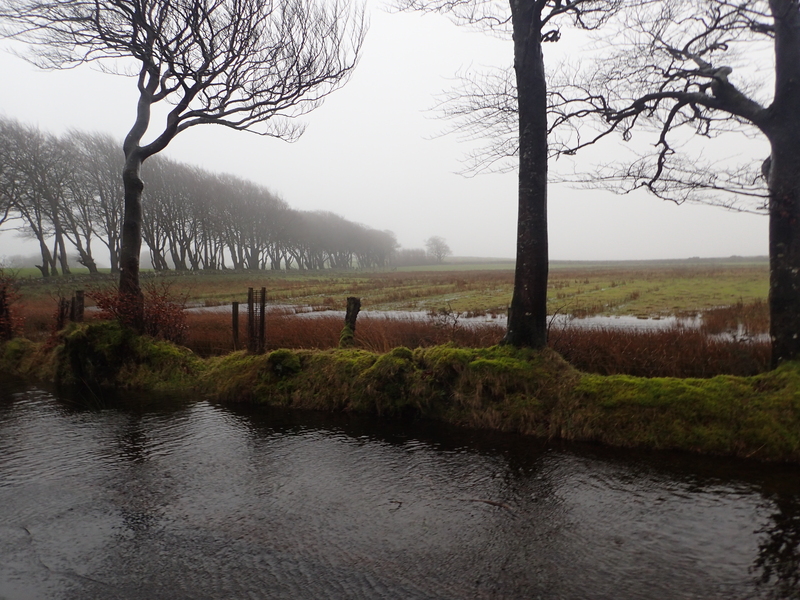 But as I get nearer it becomes apparent that the green patch of ground is extremely waterlogged. As a result I decide to get closer to the river to see if I can find a better spot. 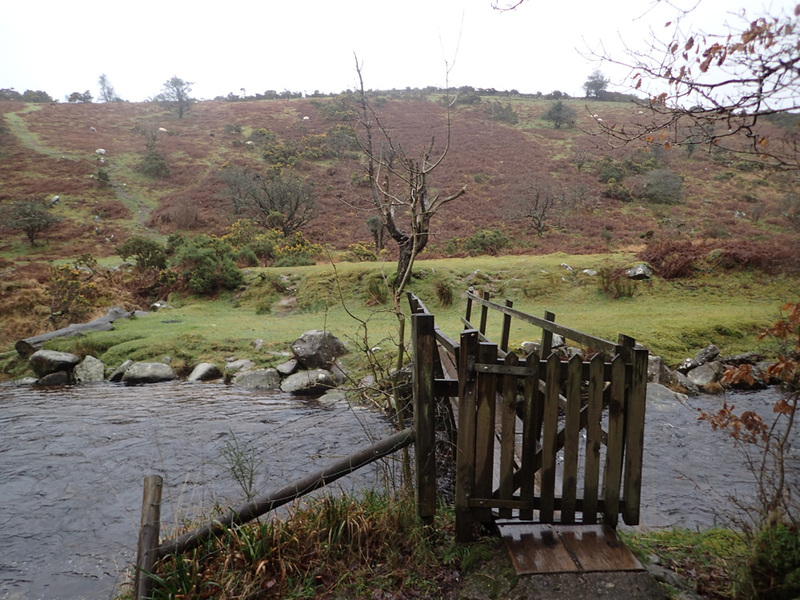 There is a boundary wall between me and the river, though luckily I spot a gate and head straight for it! 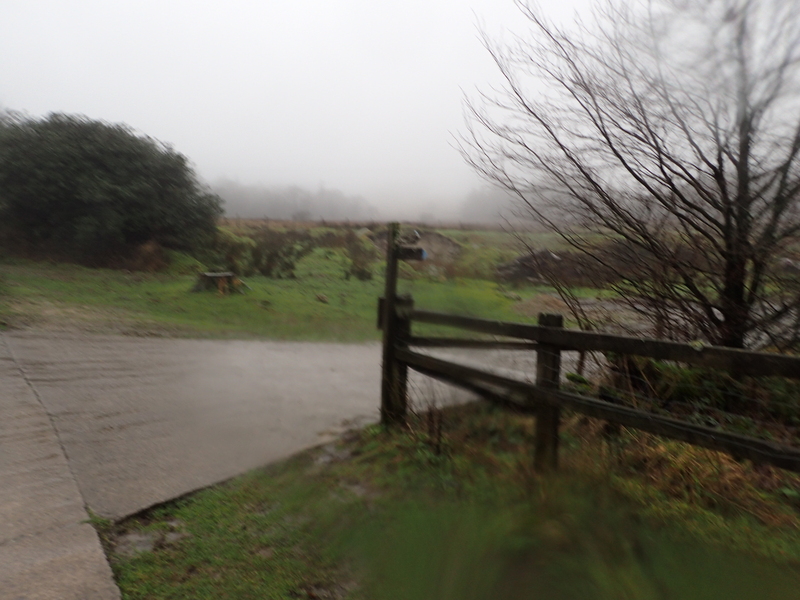 The approach to the gate is exceedingly boggy. 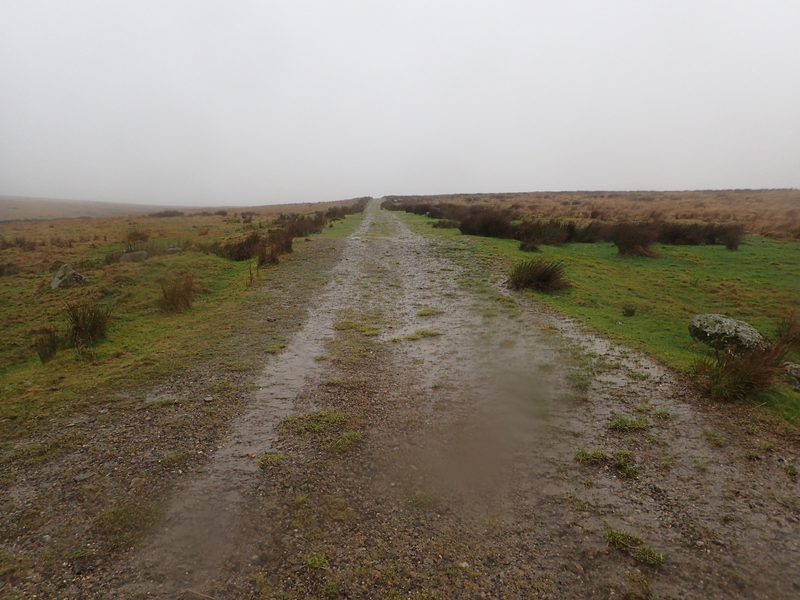 I realise that tomorrow’s exit from this area is going to start with very wet feet right from the go! 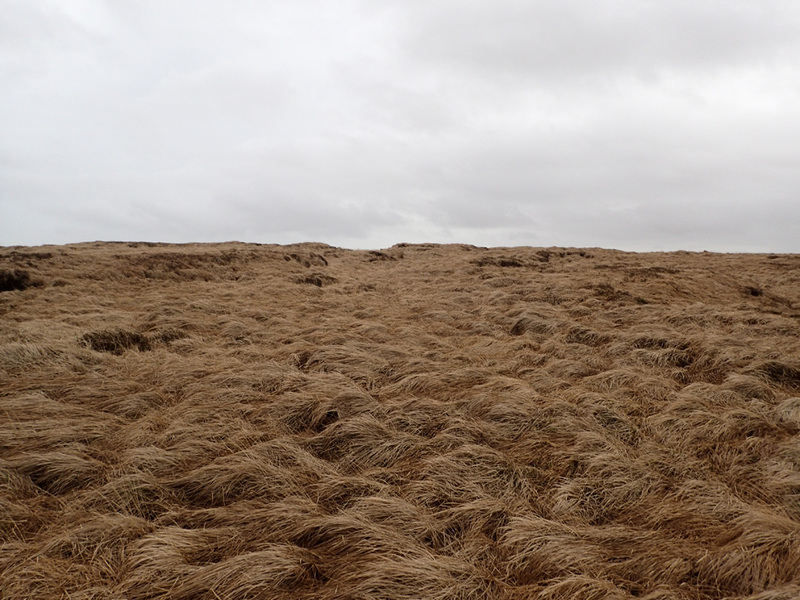 Eventually I find this patch of grass. It is very small and is sloping down toward the river. However, it is the best spot of ground in the vicinity. 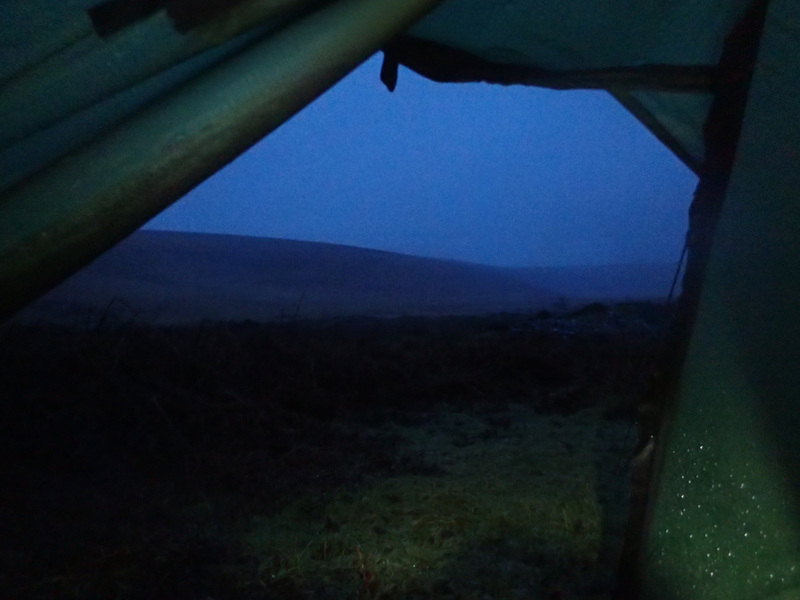 Luckily, I have a lot of experience with regard to the Akto Tent’s precise dimensions. It will be a tight fit, but it should be a goer! I get the tent up and then pop off to top up the water bottles. To the left of my foot is a cascade of water running over the grass. This is very handy as it means I won’t have to lean over the rather busy river to fill up the bottles. Darkness is definitely setting in. It seems that I have arrived just on time! Home from home! The Akto tent only just fits into the space that I had found. The slope was greater than I anticipated which necessitated the packing of items under the air mattress to try to level it off. 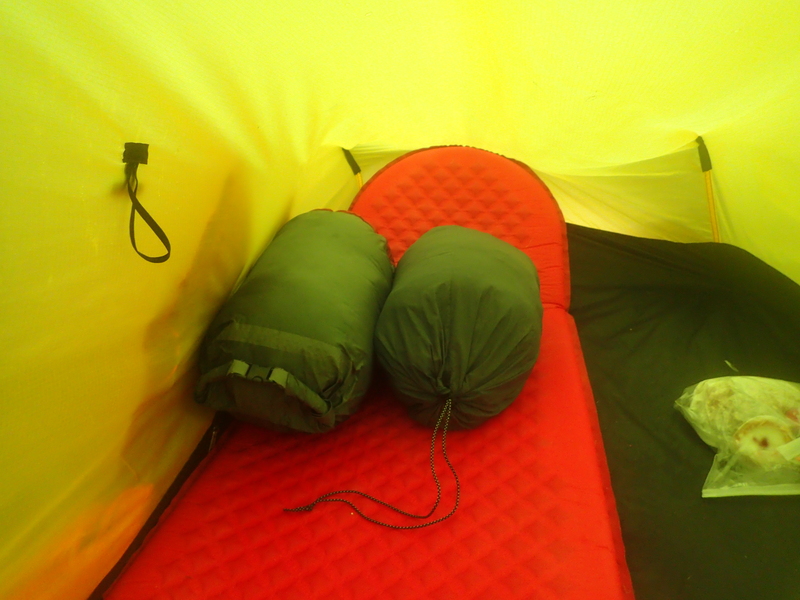 Nevertheless, this fails to work and I end up sleeping with my sleeping bag being squished up against the tent wall! Time to get some water on the boil for this evening’s meal. Finding a level enough spot for the stove was rather challenging. In the end I had to place it rather too close to the tent for comfort. 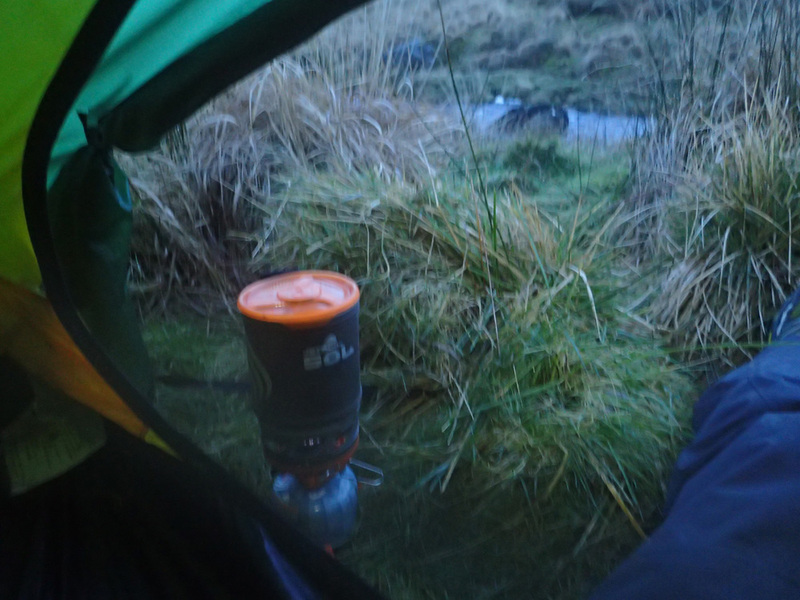 Whilst waiting for the water to boil I start to notice that there is a big hole in the ground in my tent’s vestibule. I hope I haven’t inadvertently camped on some animal’s burrow! With the falling temperatures I unpack the down jacket – possibly my favourite item of kit as it provides instant warmth. The Olympus Camera’s flash is so weak that I have had to turn off the head torch to take the shot! 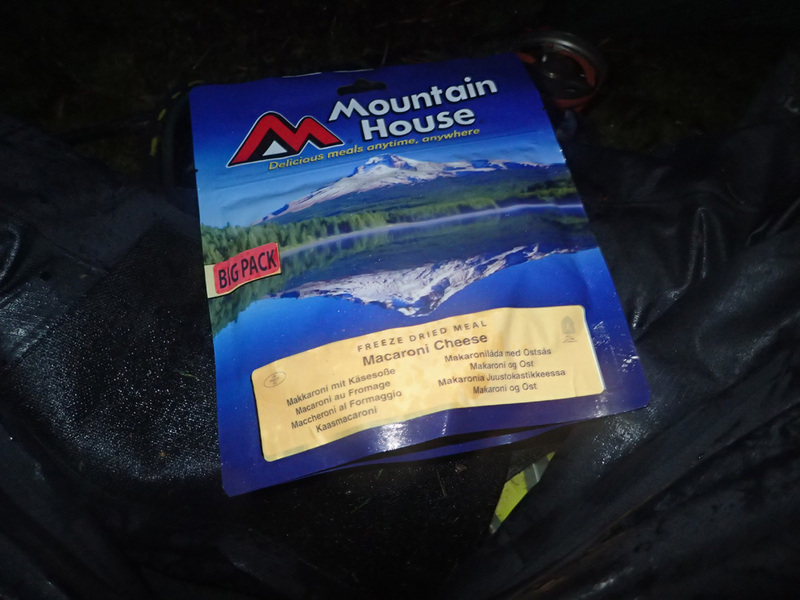 It’s Chilli Con Carne from Mountain House! I know what you are all thinking. ‘It looks like puke’. But trust me, it does taste a lot better than it looks! I’m now all fed and watered, so it’s time to turn in for some reading followed by an early night! 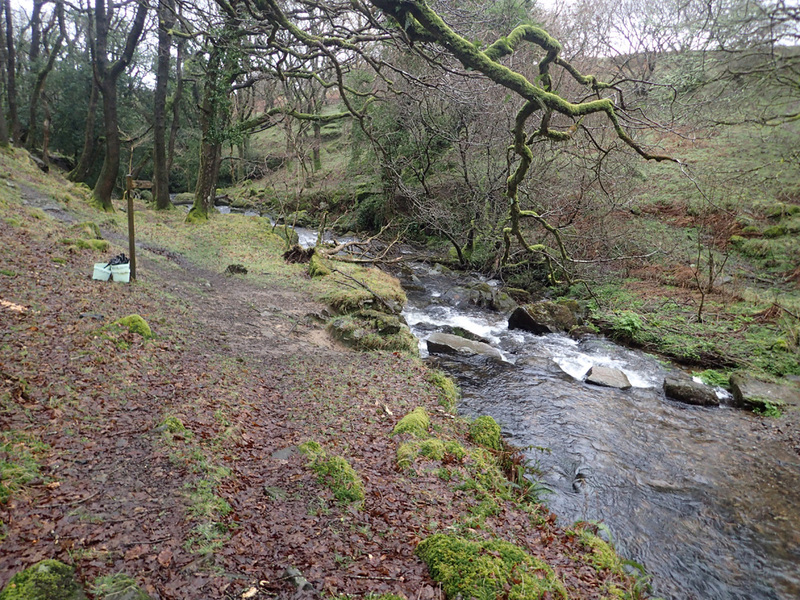 Day 2’s camp spot was in a very sheltered area alongside the West Dart River. The perfect placement for my visit to Crockern Farm the following morning! 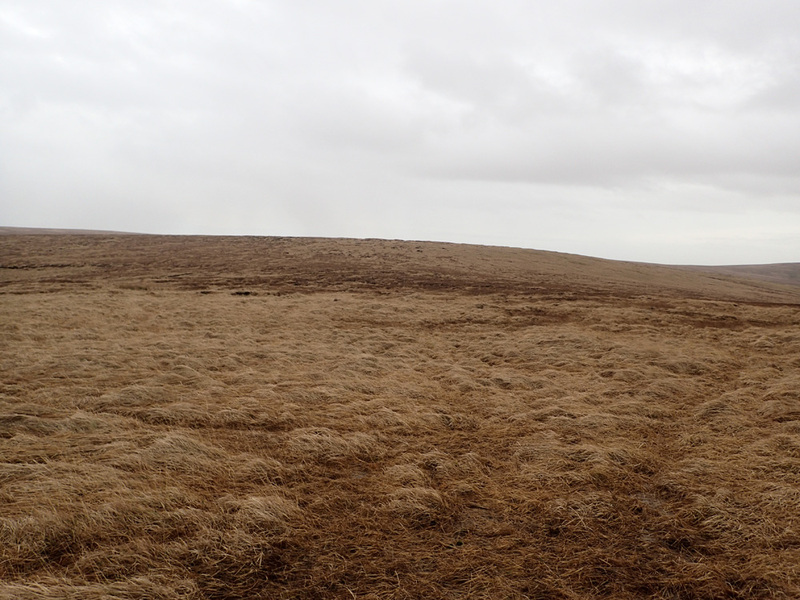 That’s it for Day 2’s Northern Moor crossing. 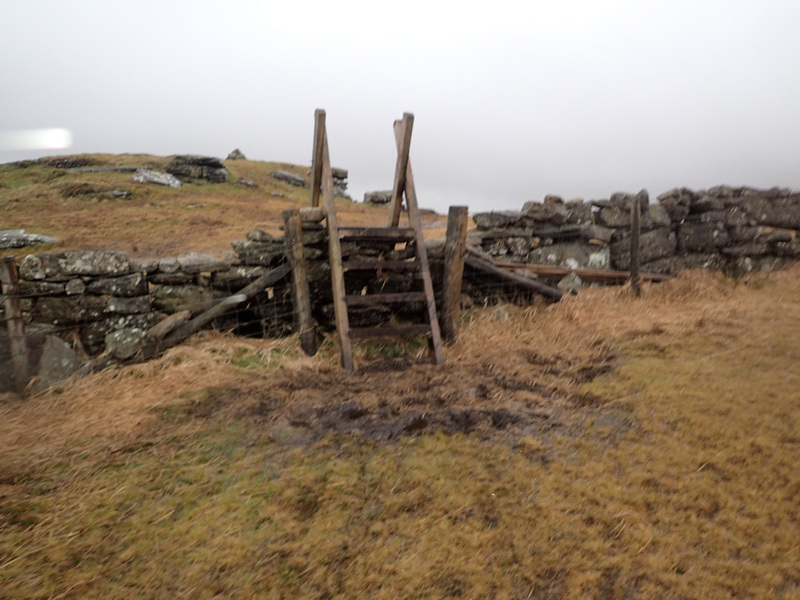 Tune in next week for my visit to Crockern Farm and to discover why the walk got cut short. Some newer readers may be wondering why I class this walk as a 3+2 day walk rather than a 5 day walk. The reason does make sense, at least in my head! The + 2 refers to partial days. Normally my walks are all +1 walks as I like to leave the last day with a lot of slack in it. However, for this one, I knew that I would be arriving reasonably late and I also knew that there wasn’t a lot of daylight too. As such I planned the first day to be a partial one. In the event, my planning was spot on; I got to the planned camp spot just as the sun was setting, an achievement that I also matched the following day. I guess that my planning has matured to a point where it is now reasonably accurate with regard to timings. As usual I took many hundreds of photos, almost one every hundred metres or so. That way when uploaded to Facebook they form a virtual walk that I can take myself on at any time. Alas, space is limited on the blog so I can only publish a select few at vastly reduced sizes. 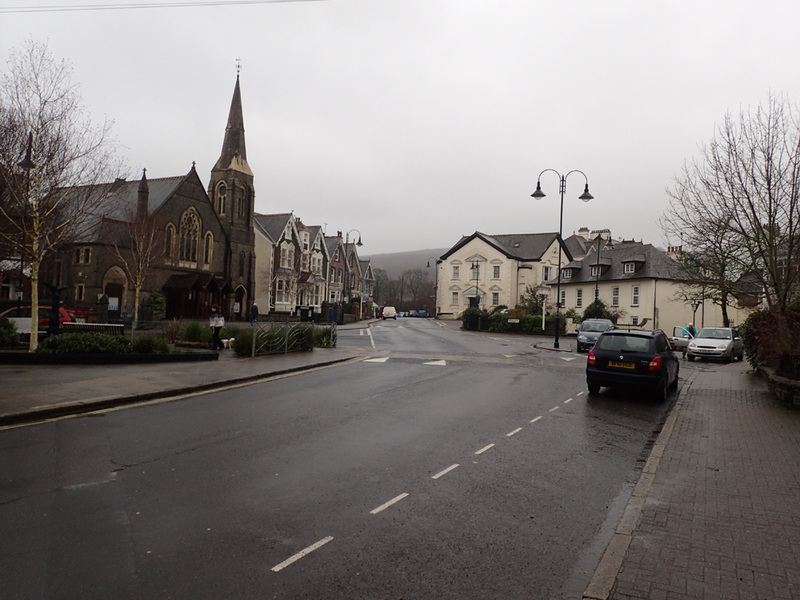 Okehampton! Back in familiar territory! 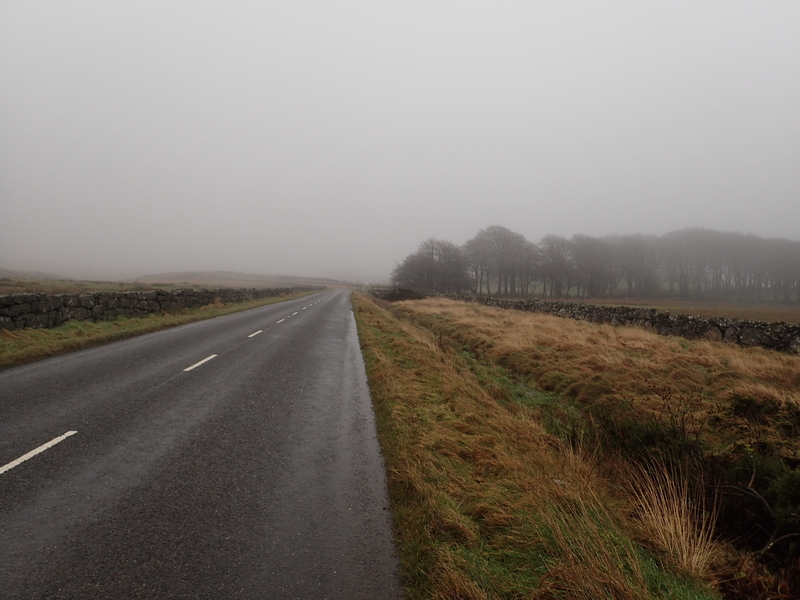 In the distance one can see the Moors through the low cloud and rain. 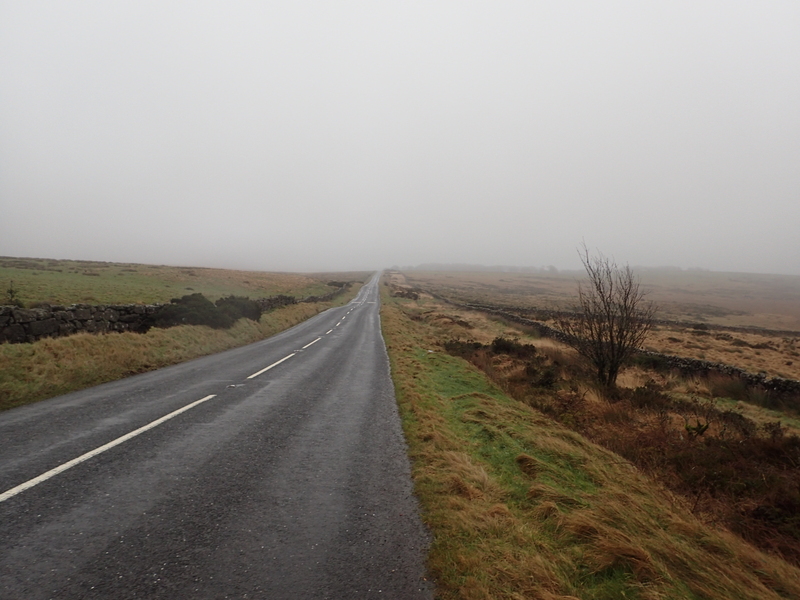 I think I have exhausted all the possible routes on to the Moors now. So I plump for a simple one up the road past the Railway Station. 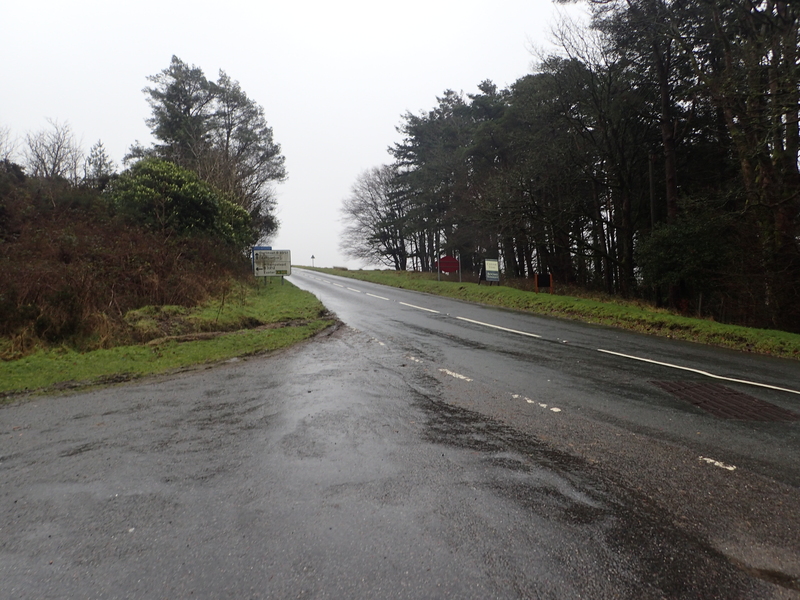 It is all up hill from the bus drop off point, but I soon get to the foot bridge that crosses the A30 road. 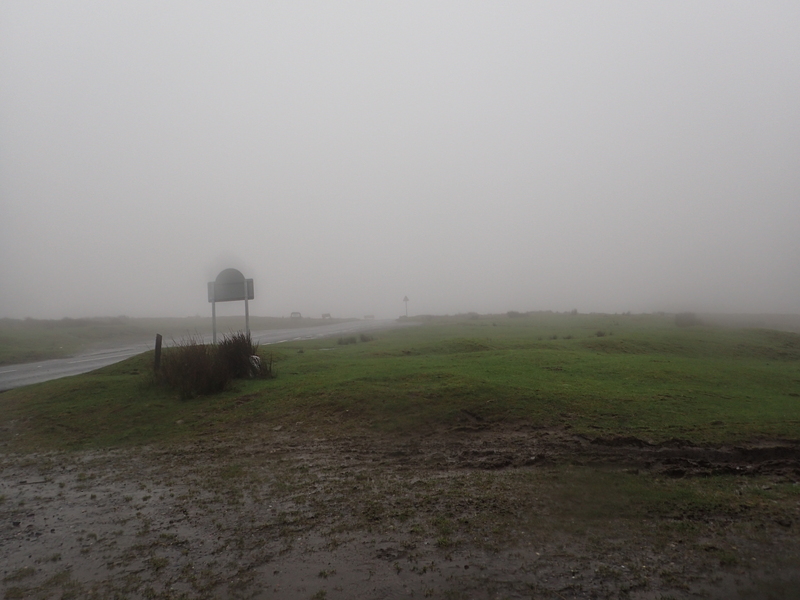 Once over, I consider myself on Dartmoor proper. 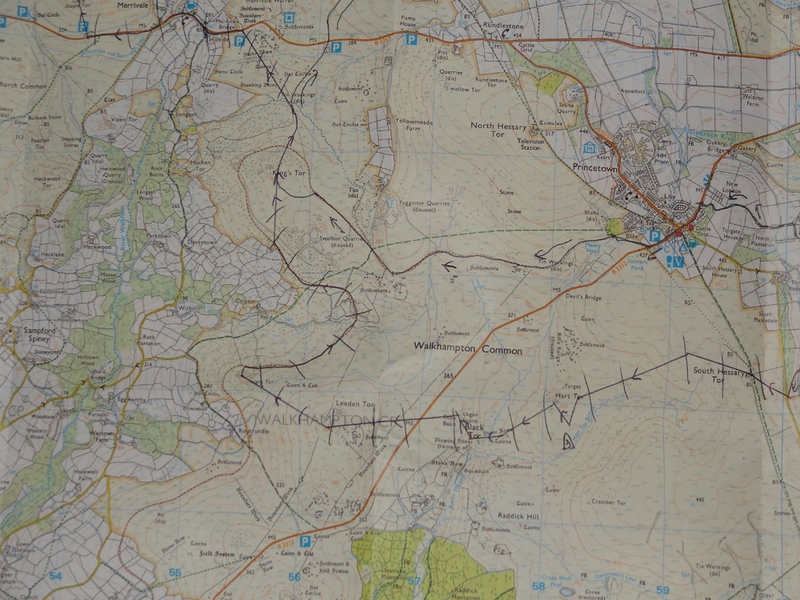 Once across, the plan is to negotiate some fields to get me to Tors Road. I’m now on Tors Road. 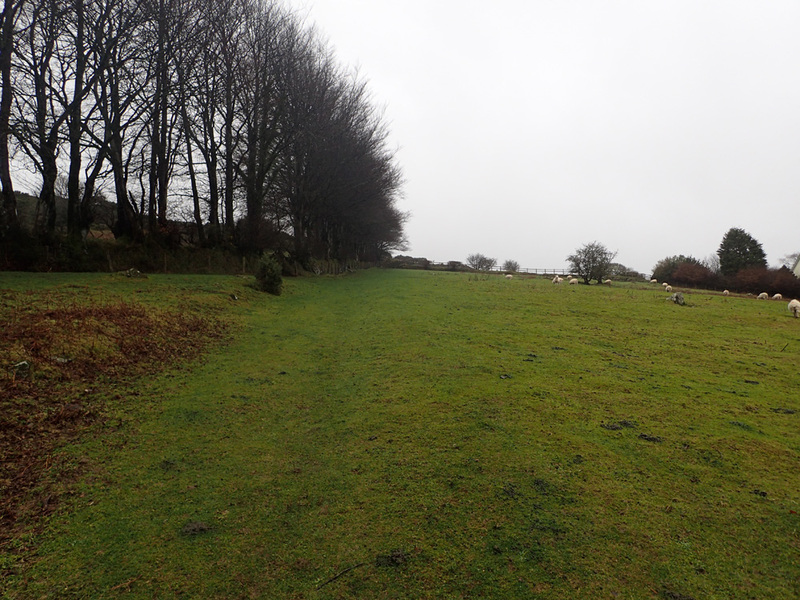 The plan is to head down it for around two hundred metres, then hang a left at the first turning to take me toward Lower Halstock farm. I’m now on the turn off heading broadly Eastward toward the farm. I know that as I near it, there should be a public footpath turning off it to the left. The weather has been non stop rain so far. This will continue on for the rest of today’s walk. I’m now nearing the farm. 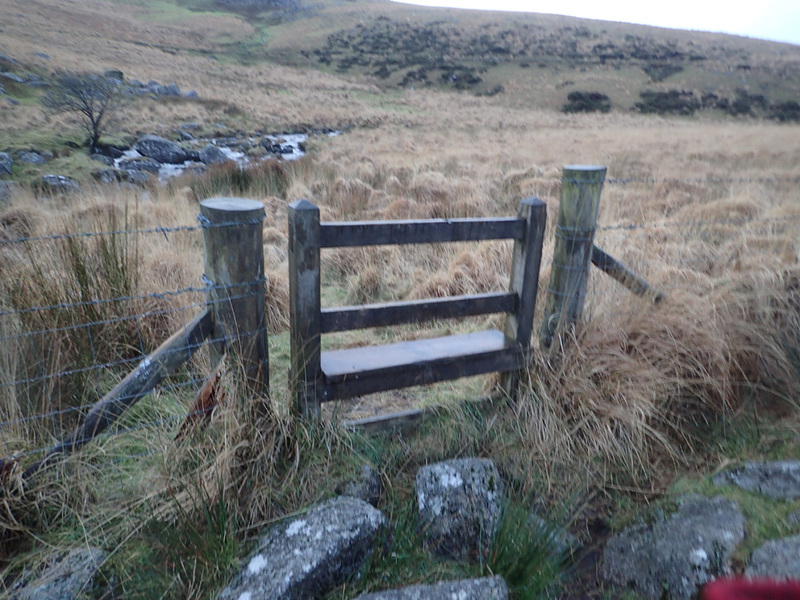 This was my exit route off the Moor on my last walk. However, I’m now looking for a footpath turnoff to the left. As I head down the hill I spot the signs marking my turn off. 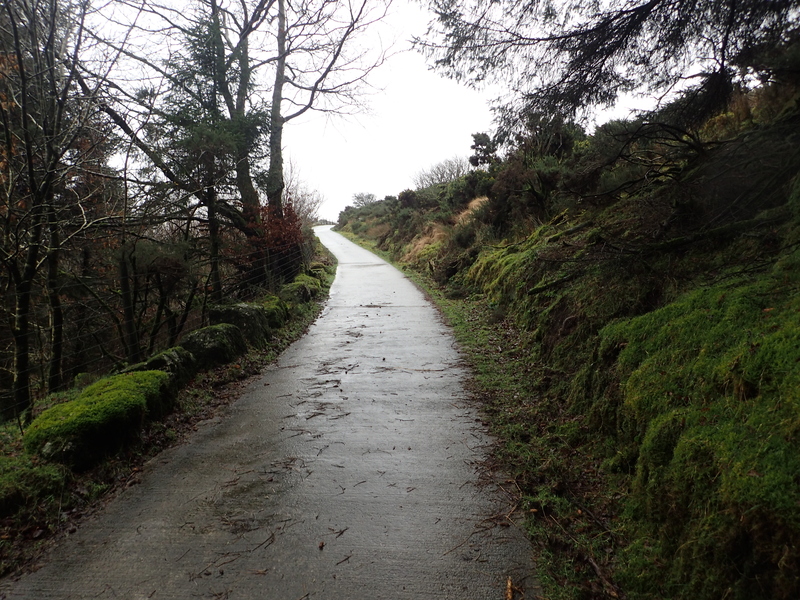 The plan is to ultimately get me on the latter stages of the Tarka Trail which I have used many times in the past. 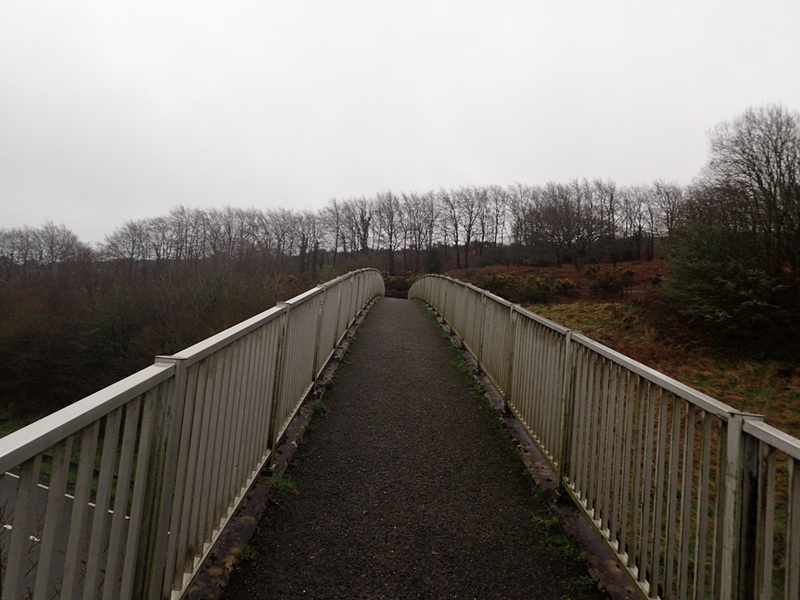 To get to the Tarka Trail I need to handrail this stream eastward until I get to the bridge that crosses it. Ah, the ‘Bridge’! These wet stepping stones prove too slippery to safely use. Instead, I elect to take my boots off and just ford across the stream. 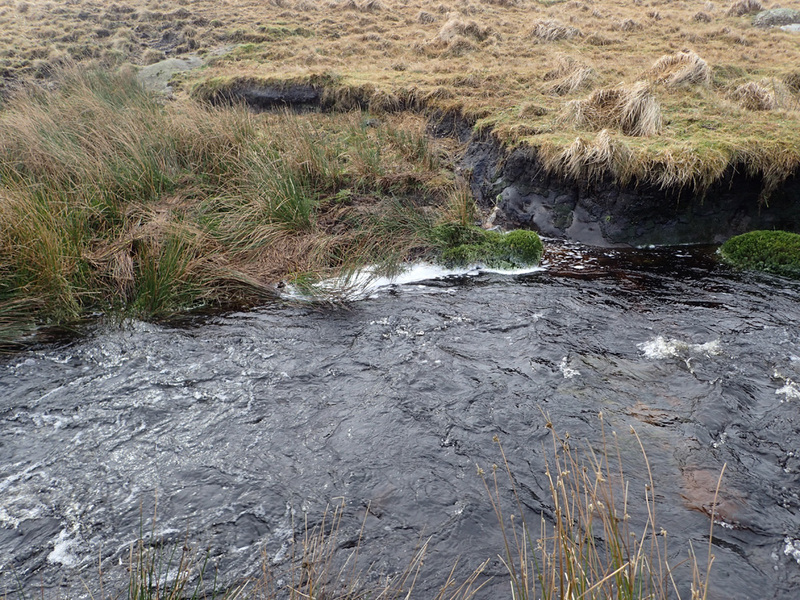 I have now crossed the stream and after towelling myself off, I get back underway. 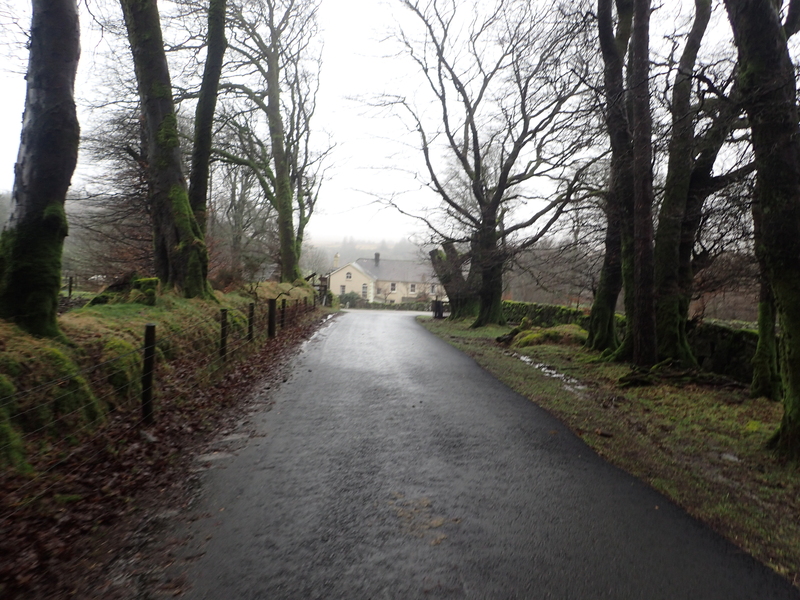 We are now heading toward the forest that should intercept with the Tarka Trail. 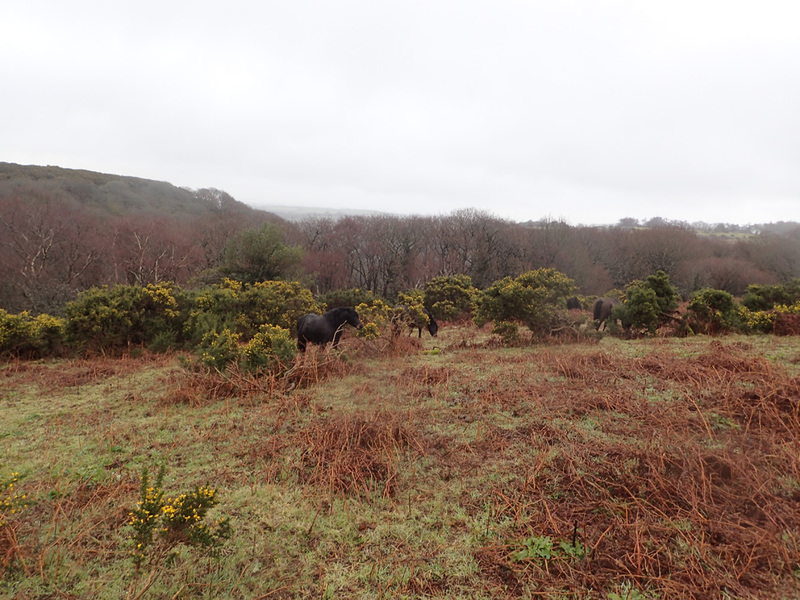 On the way to the Tarka Trail I spot my first Dartmoor Ponies. They seem completely oblivious to the rain! There’s the forest up ahead. 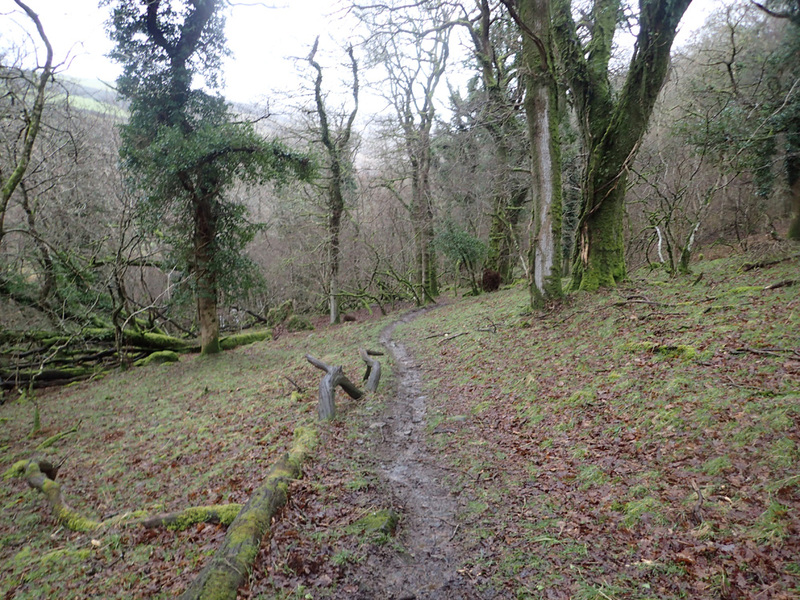 It should now be down hill to the East Okement River and the Tarka Trail. I’ve never taken this trail before so I’m naturally quite interested to see where it comes out on the Tarka Trail. When I get to the East Okement River I’m surprised at the water levels and the raging torrents. I guess the excessive rain we have been experiencing is starting to take its toil on the land. 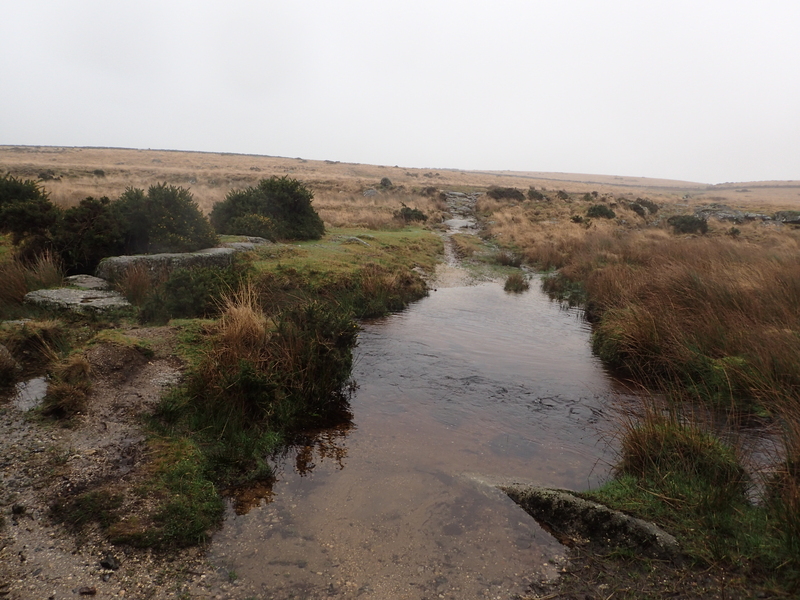 I soon get to a familiar bridge that I first used on my first ever Dartmoor walk back in 2012, though back then it was the height of summer, with very different weather conditions. 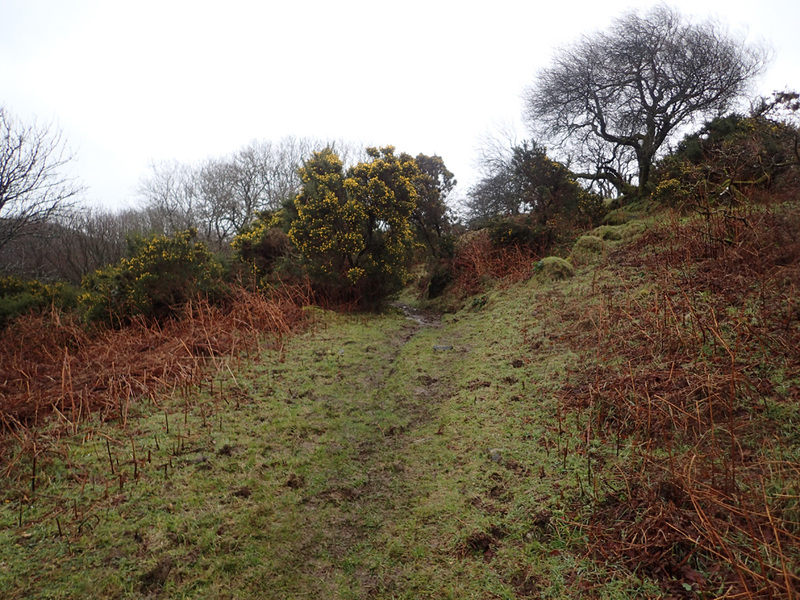 The first task is to climb the hill to get me onto the main track leading Southwards further into the Moor. 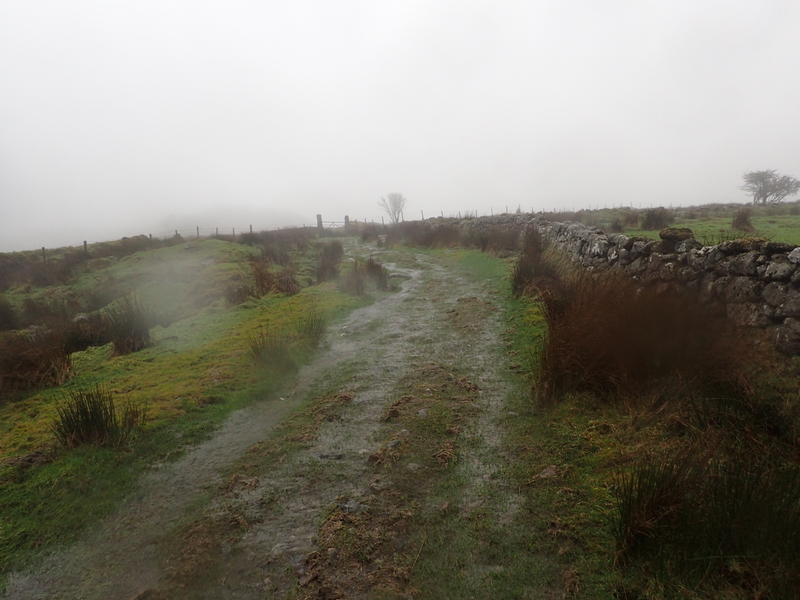 It doesn’t look it here, but all the tracks are water logged. Putting one’s foot down results in a pool of water forming. My sieve-like Salomon boots have started leaking a long time ago, so I’m not particularly worried about the water. 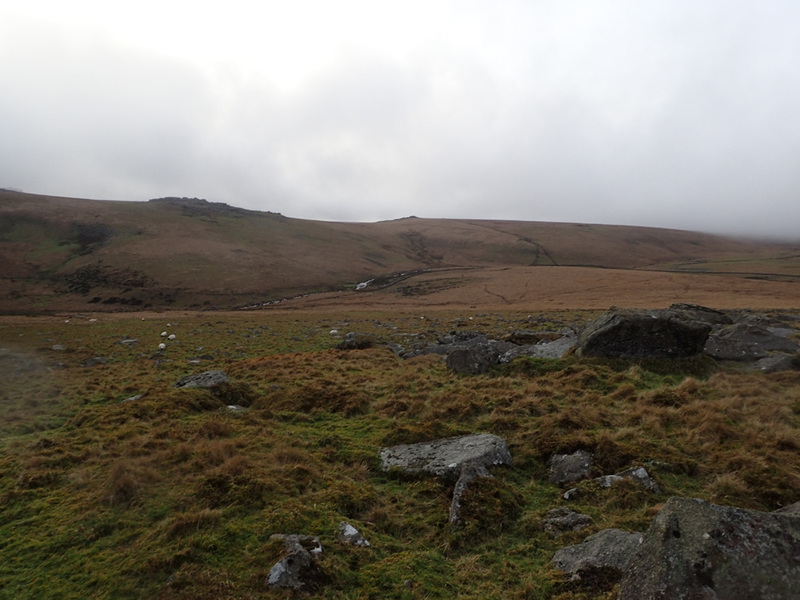 After heading South for a bit I turn Eastward to face Belstone Tor. 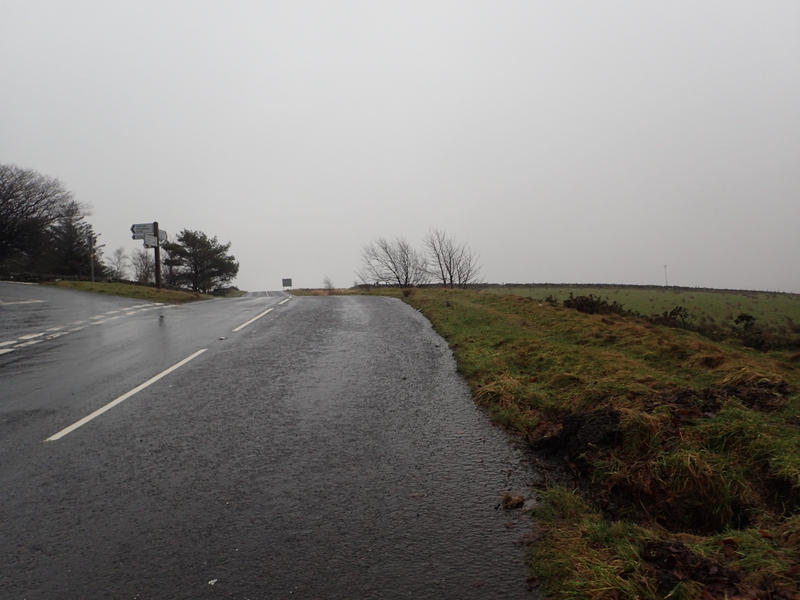 I need to climb right over that and back down the other side to get to a fording point that I need. 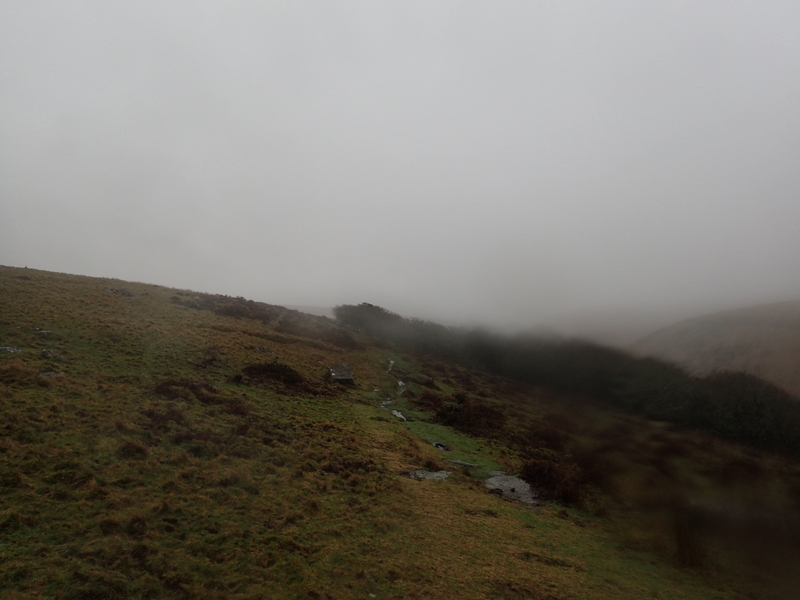 As I ascend the winds and rain are picking up. 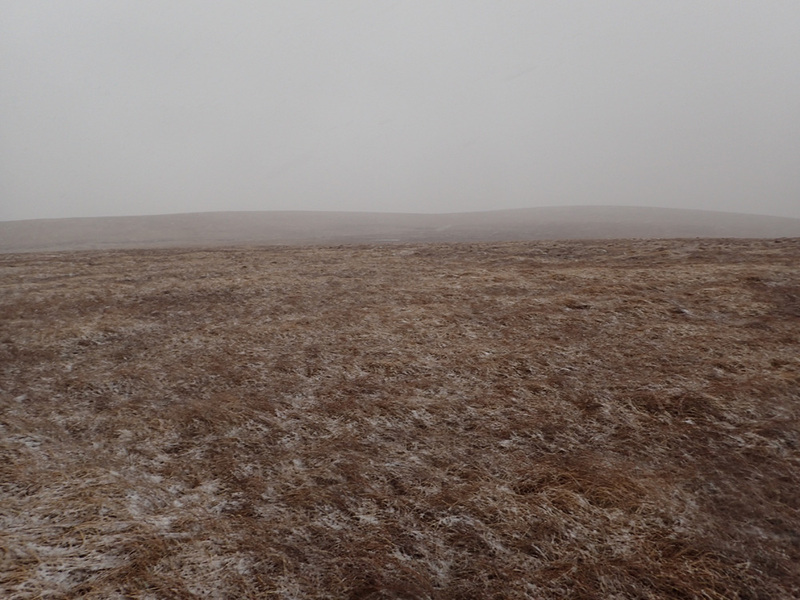 This is the view Northward toward Tors End Tor. It doesn’t take too long to get up there, though the lack of recent hikes is really showing itself in my Gluteus Maximus muscles. I guess that’s a group my exercise regime fails to cover. 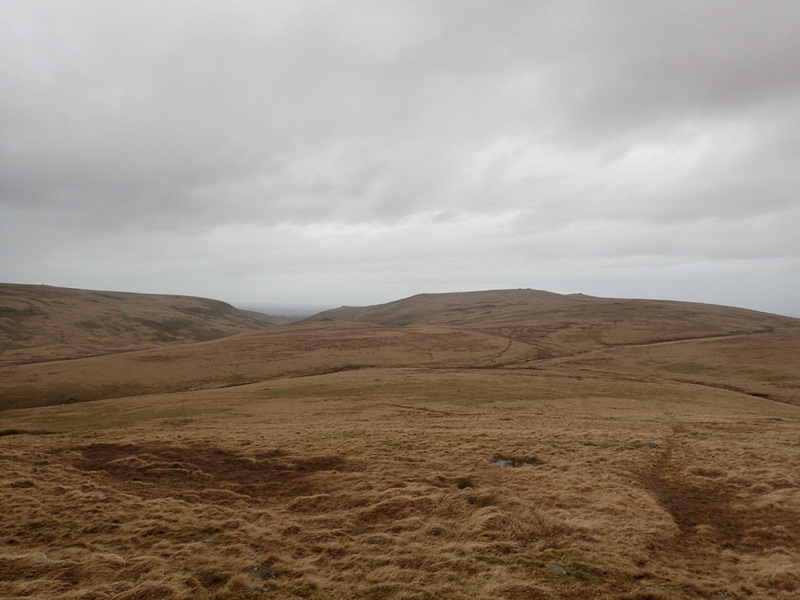 Another view Northwards toward Tors End Tors, but this time from the top. The winds are very strong up here and seem to be coming in from the West. 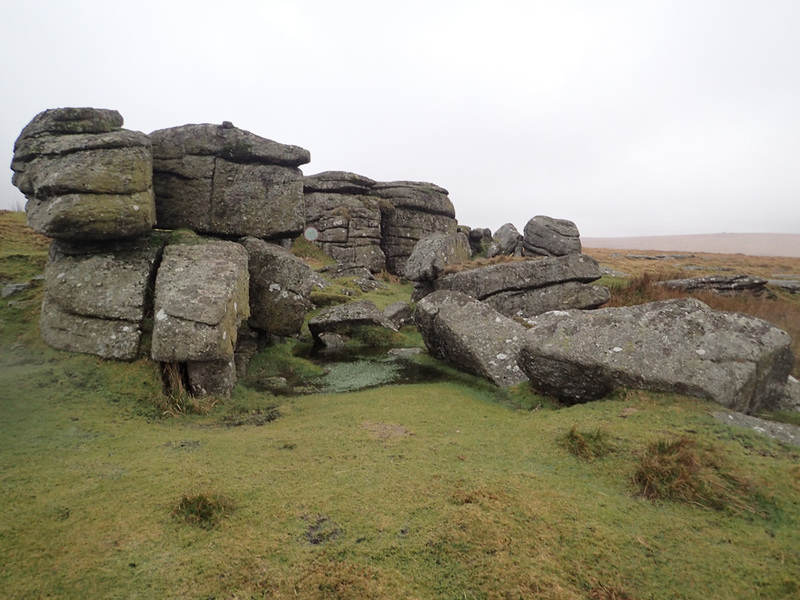 As a result I’m quite keen to clamber down the other side of Belstone Tor to gain some sort of shelter and protection. 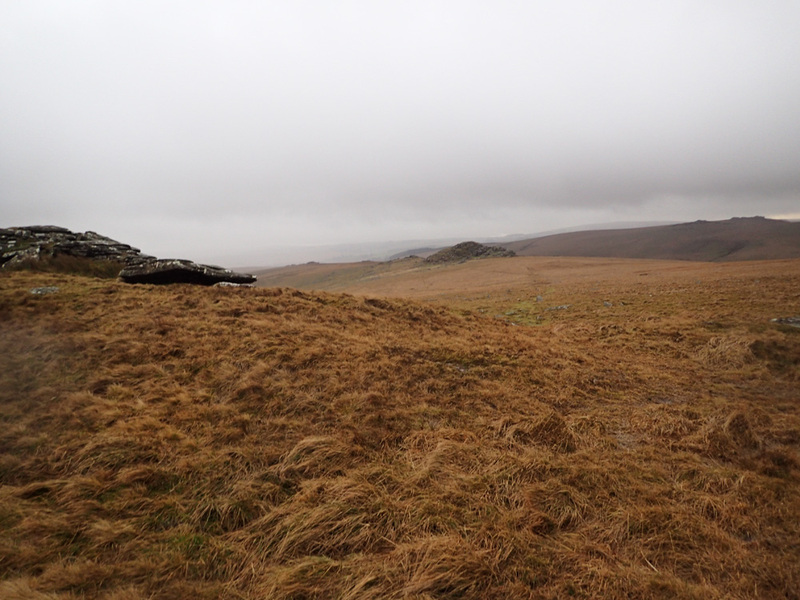 The view from the other side of Belstone Tor looking Eastward. Things are much calmer on this side of the hill. 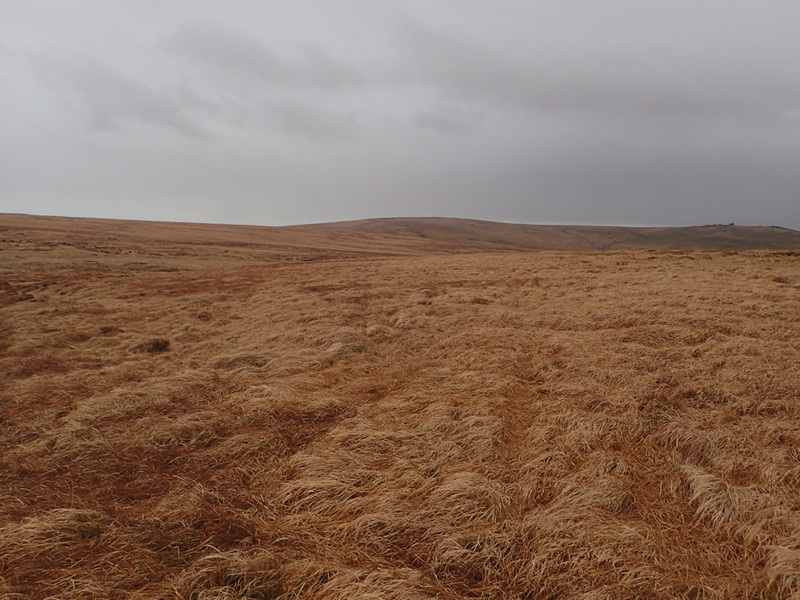 In fact it is quite amazing what a difference crossing the ridge-line has made. 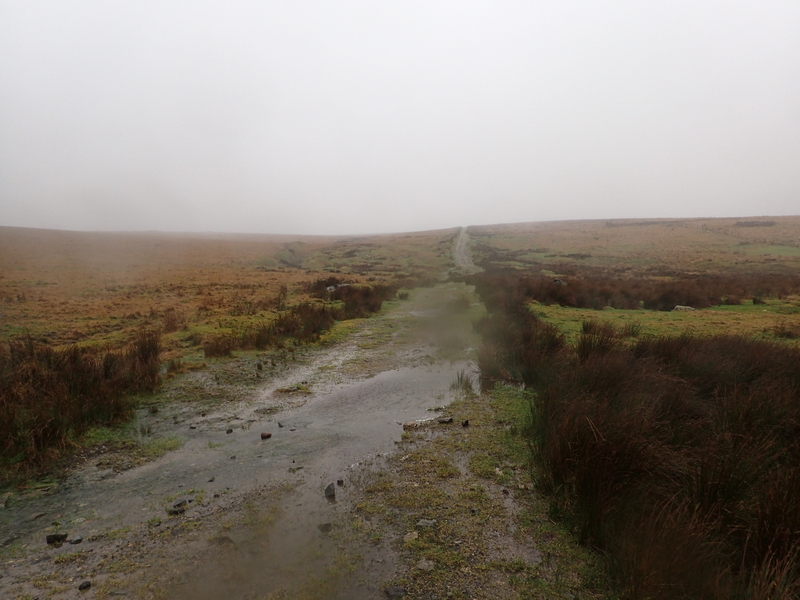 Down below is a main track that I need to get me to the only Fording Point for the River Taw. The descent is littered with many slippery rocks. The ground itself also proves to be relatively slippery too. This makes the descent a cautious one. I get to the bottom and proceed Southward. 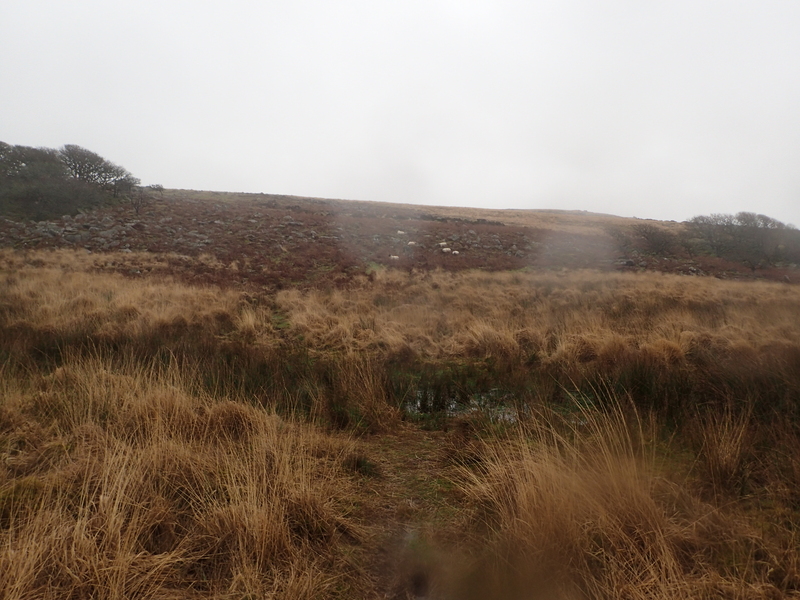 The plan is to continue in that direction until I see a turn off to the left that will take me to River Taw’s fording point. There’s the turn off! Time to head to the fording point. 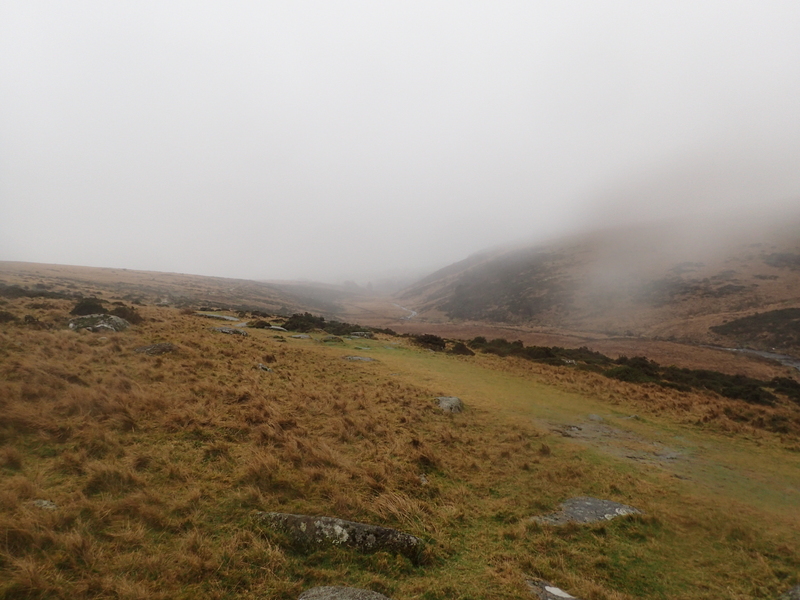 In the distance, through the looming cloud and rain I can just make out the peak of Steeperton Tor. The plan is to camp at a stream located at its base. I get to the ford where once again I’m taken aback by the water levels. Normally the river has a depth of a mere cm or two here, but right now, the water comes up to my lower knees. After a relatively cold ford, I start to proceed Southward. 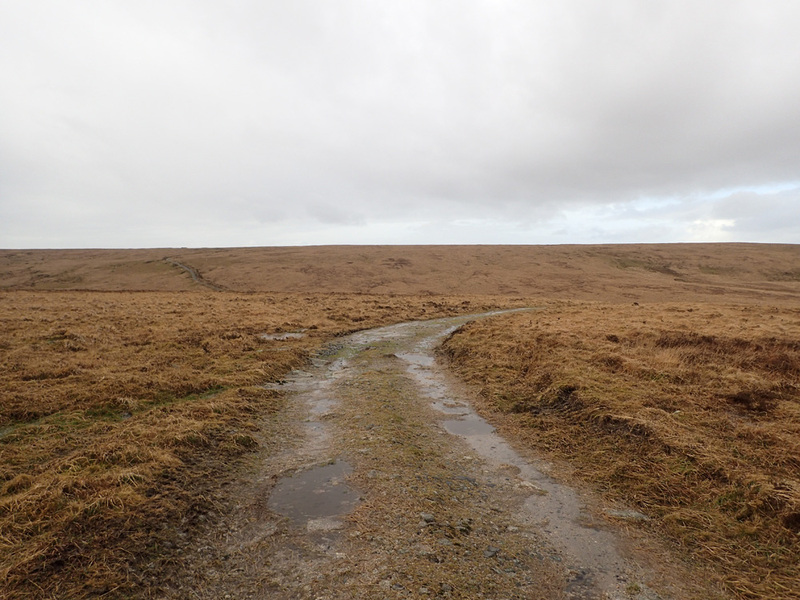 There are no trails at this point, but navigation is reasonably easy, just head for Steeperton Tor peak at the centre of the picture. 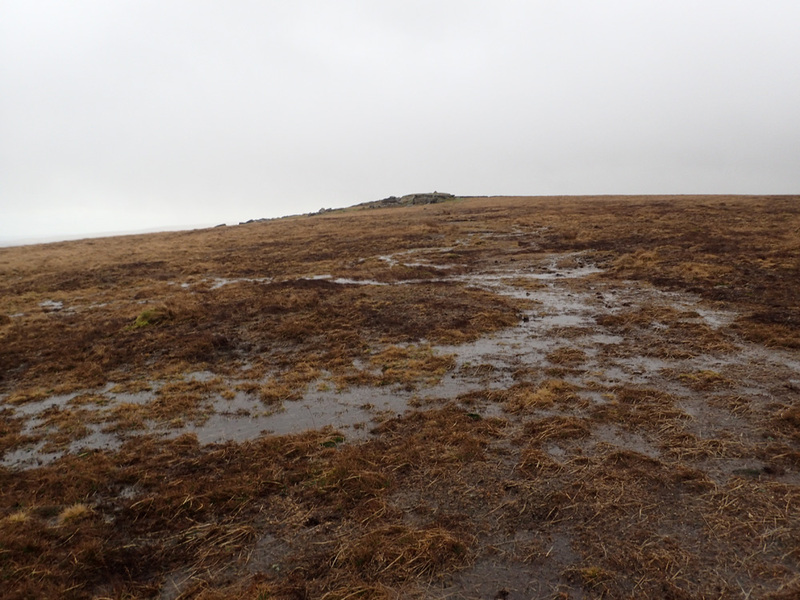 The ground is exceptionally boggy, which does hinder progress somewhat. The winds are also quite high here too due to the exposure from the West. 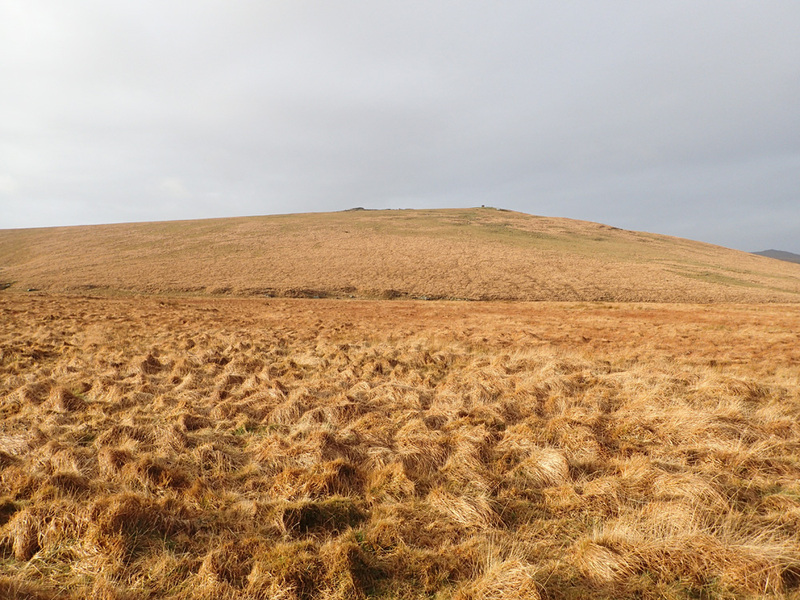 I’m hoping that as I near Steeperton I’ll get some wind protection from Oke Tor which is located off picture on the hill to the right. The glasses came off a long time ago. 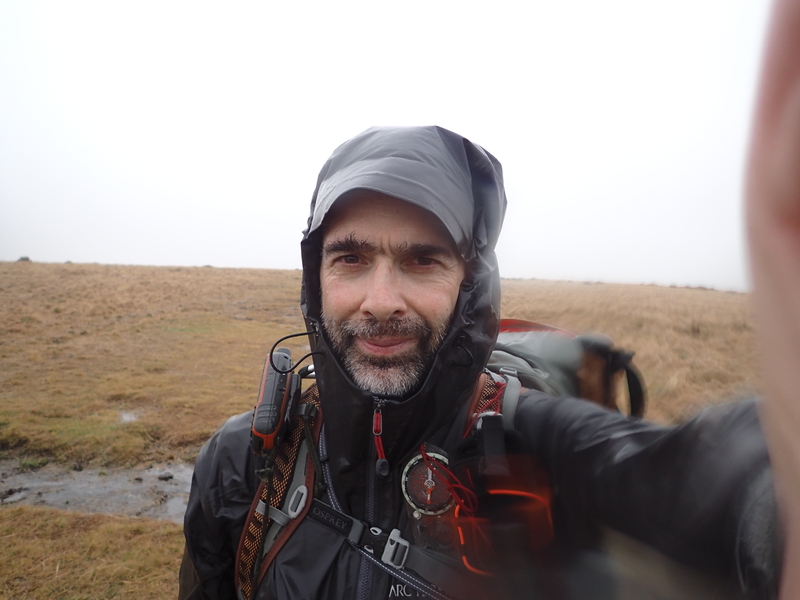 The combination of wind and rain meant I could see a lot more without them on. The new attachment on the left shoulder strap is a camera stowage point. Although designed as a quick release stowage, I rarely use it, and elect to keep the camera in my hand instead. 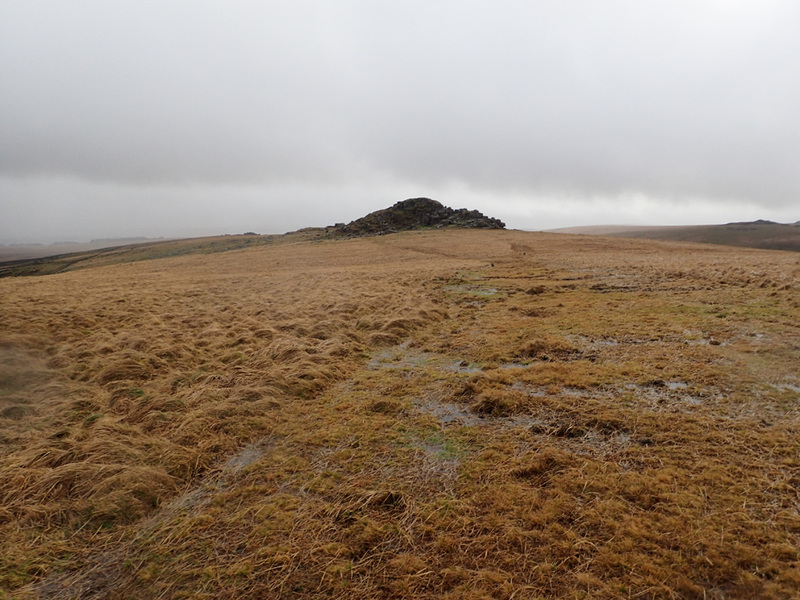 As I get nearer to Steeperton Tor, my predictions about the wind start to become a reality as the hills on all three sides start to provide shelter. 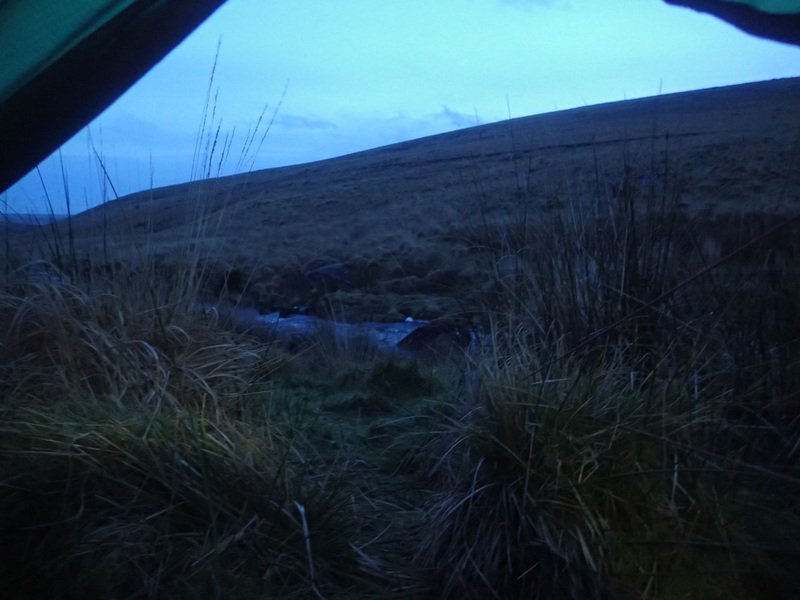 The next task is to look out for the stream and locate a decent place to camp nearby it. Putting up the tent is like riding a bicycle. It goes up exceptionally quickly, despite not having been used for almost a year. The first task of the day is to fill up my water bottles ready for camp. 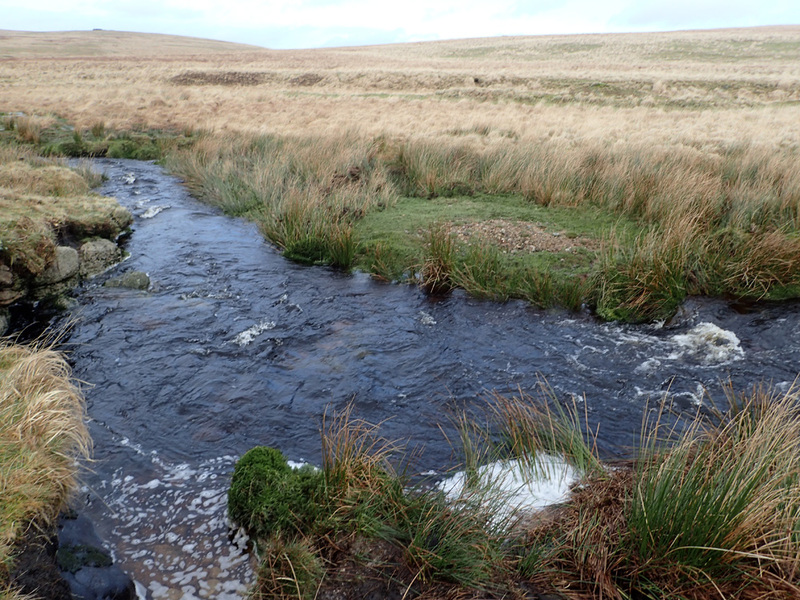 These are supposed to be small, slow flowing streamlets, but the weather has put paid to that! Back to the Akto Tent. One of its best features in these conditions are the reflective corners. These make locating the tent in poor light very easy. Today’s supper is going to be a Mountain House Macaroni Cheese! To get the meal prepared I need to boil the necessary water first. 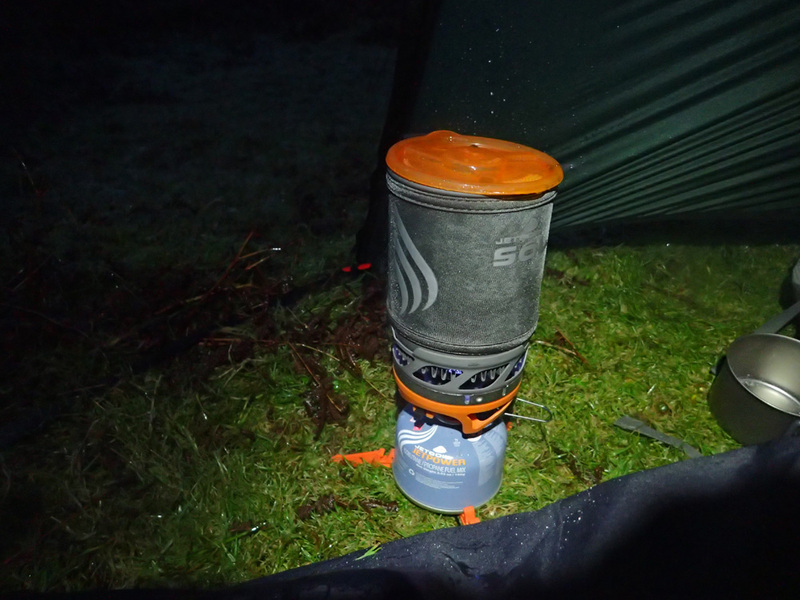 The JetBoil Sol makes very short work of this. 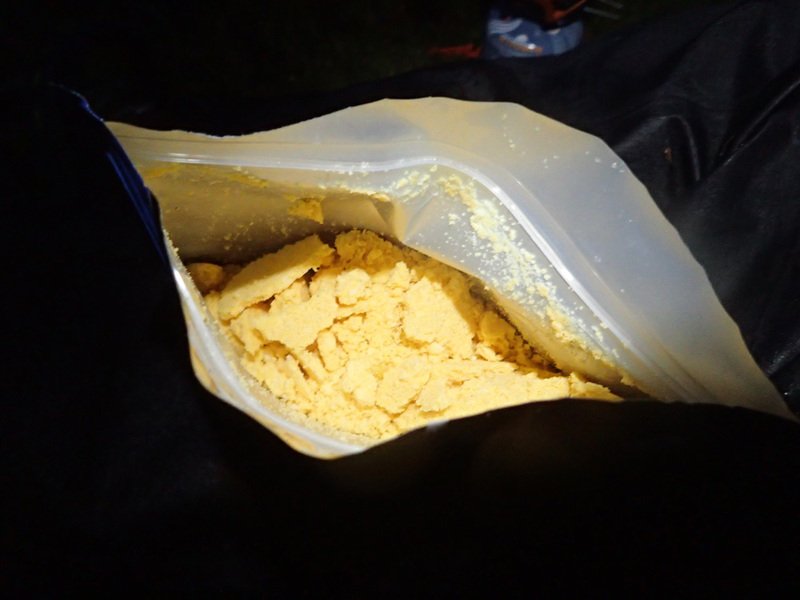 After 10 minutes reconstituting with the water, the freeze dried food is transformed into a very good meal! With the outside temperatures taking a nose dive, I decide to take a last look out of the tent before closing it up for the night. The camp spot for the end of Day 1. 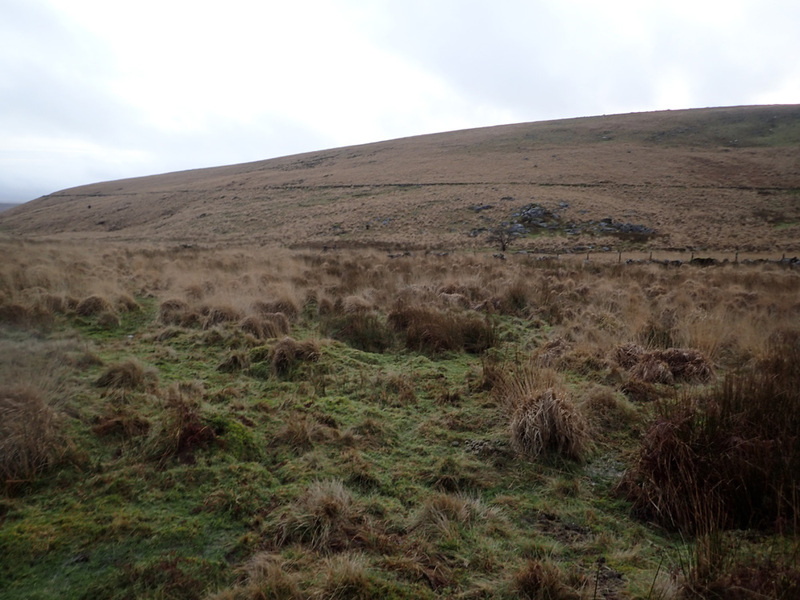 It is in a very sheltered position, nestled between 3 hills. Being out of the wind does make a big difference! So that ends day 1’s trip report. 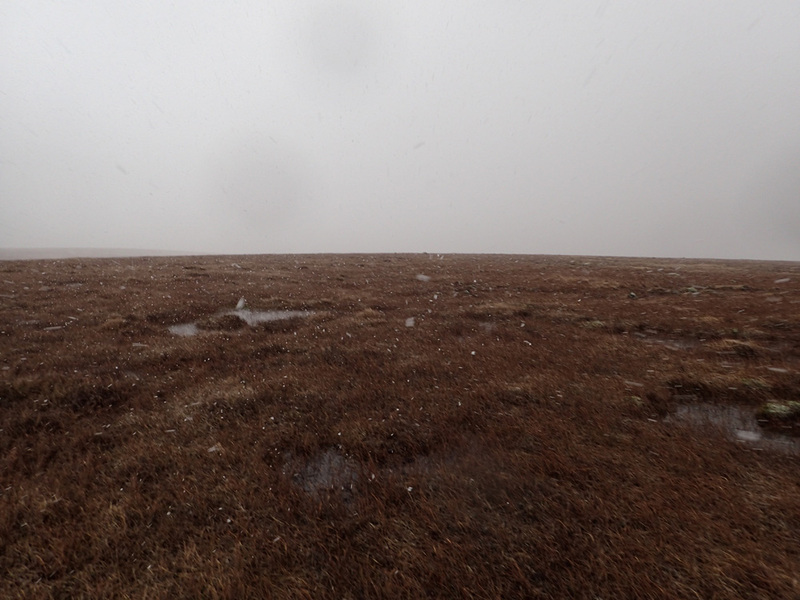 Tune in next week for Day 2’s crossing of the Northern Moors! 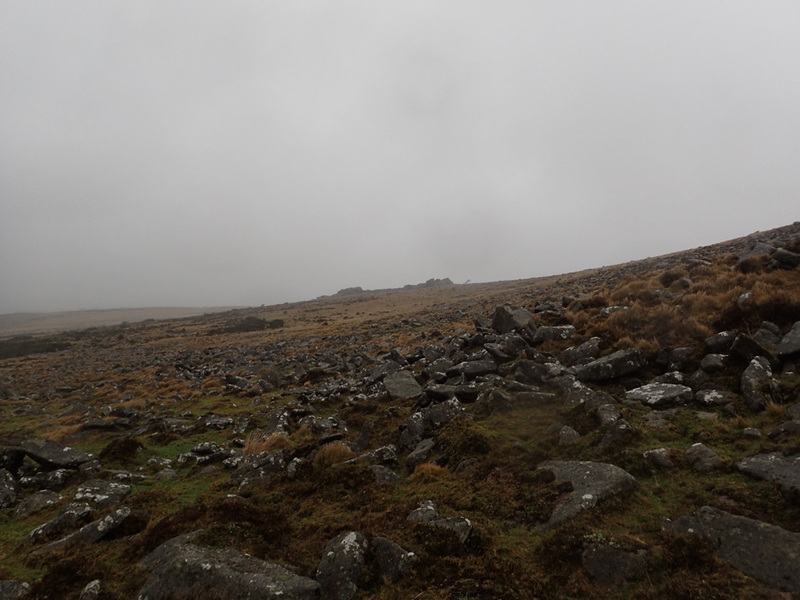 Back from Solo 3 + 2 day solo Dartmoor Walk! So, this is how it’s gonna be? The more observant readers will be wondering why I’m back so early…. For the first time ever I decided to cut a walk short. It was no easy decision, but on reflection I still believe it was the right one. 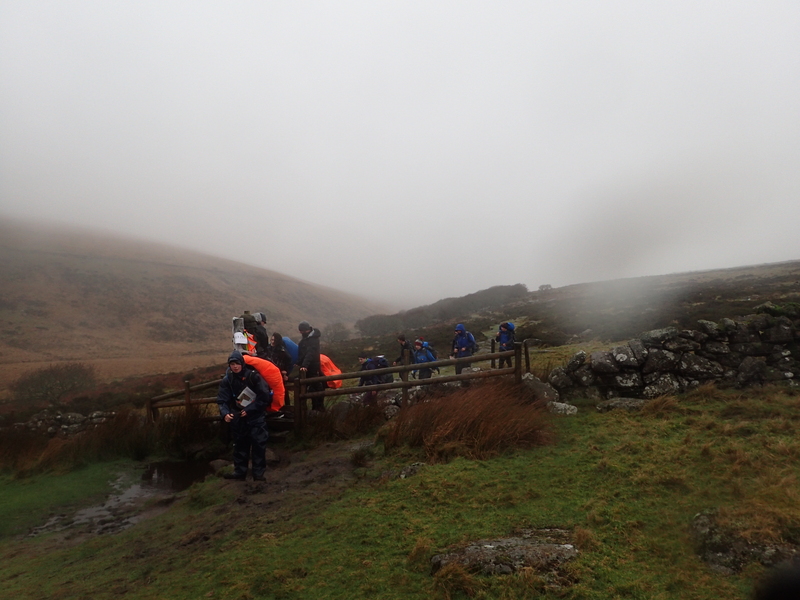 The weather for the walk was pretty atrocious on the whole, that is with the exception of a few hours on Day 2’s morning. From the off there was plenty of rain. 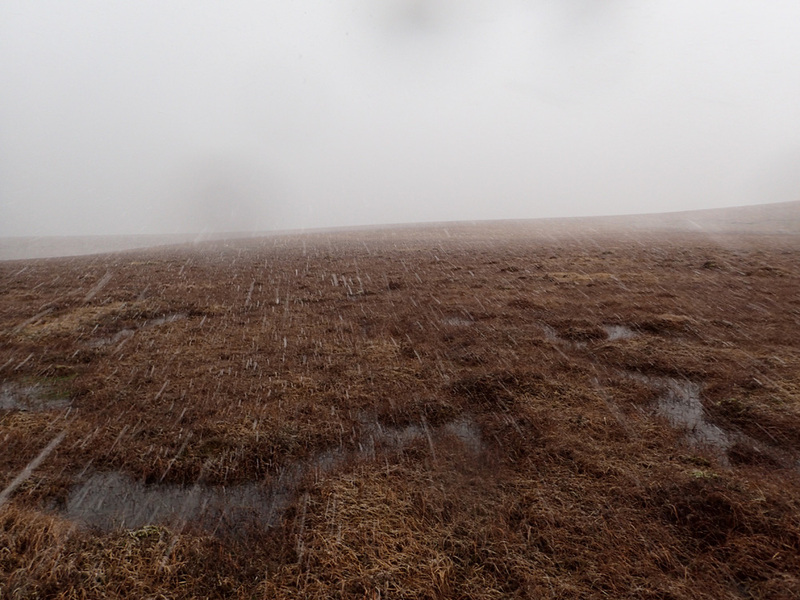 At one point it was cold enough that the rain became snow! 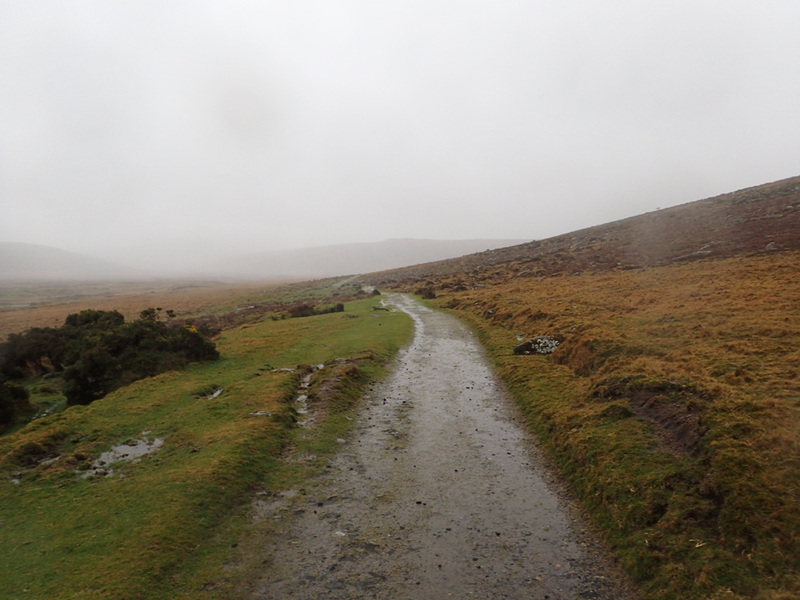 Rain, whilst problematic, was not the cause for the walk being curtailed. The real enemy was the wind. 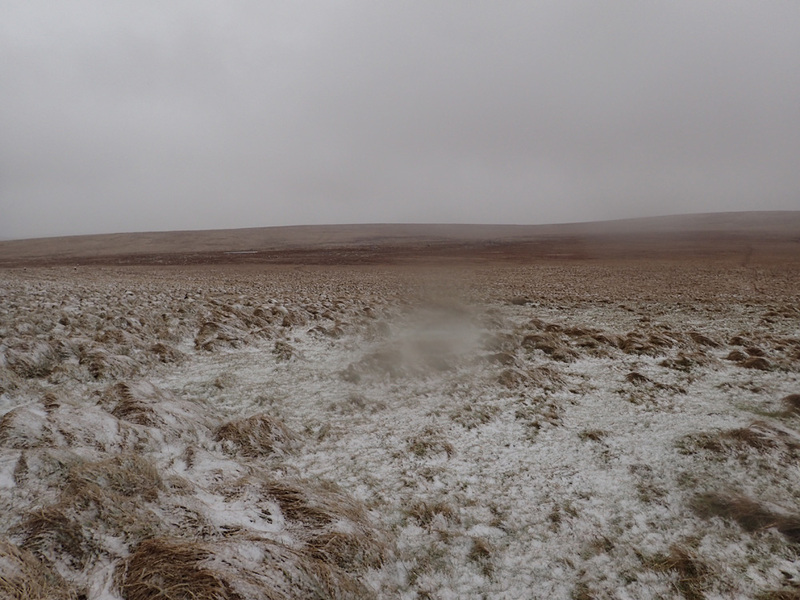 It was the wind that eventually prompted me to cancel the walk on Day 3. Day 3 was supposed to be an easy day, one that was planned to be mostly on tracks, that way I could recover from the expected gruelling cross-country walking of Day 2. However, in the event, Day 3 would prove much worse. 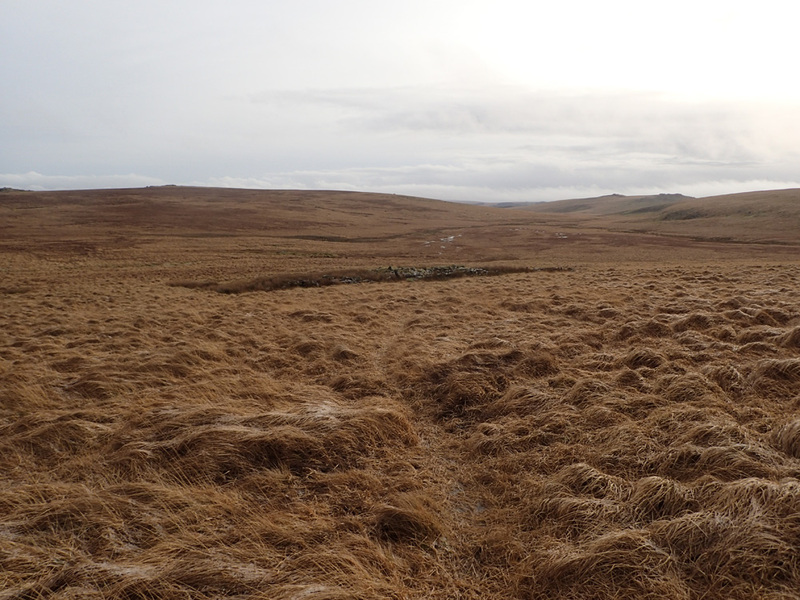 I was heading Westward on a track, which should have been easy going, but the wind was so strong that I found it genuinely difficult to make any forward progress. Even breathing was difficult. I found myself walking for around 10-20 paces, then having to turn so that my back was to the weather to allow me to recover for the next stint. Progress was painfully slow. 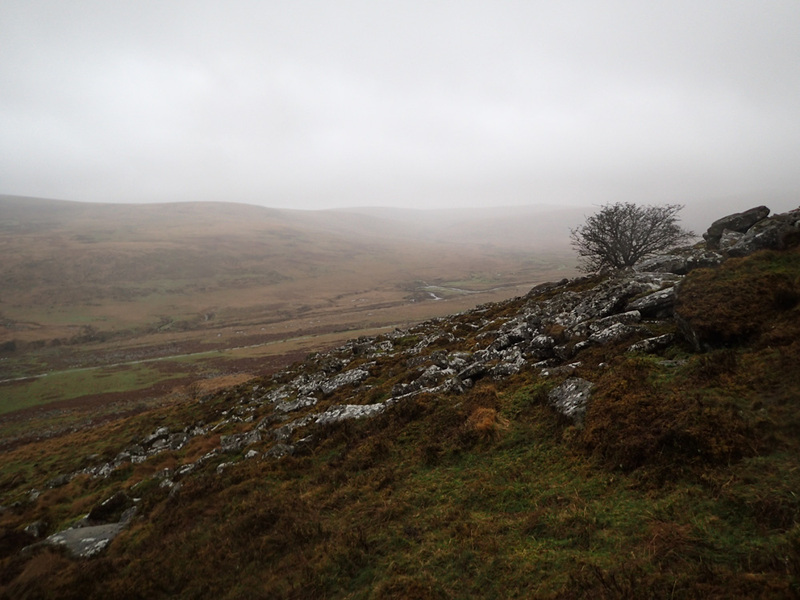 The plan was to hike to Princetown, and then from there carry on with section 2 of that day’s walk. However, given my slow progress, and the reduction of my will to carry on, I decided that I would call it a day and arranged for my brother in Plymouth to come and get me. 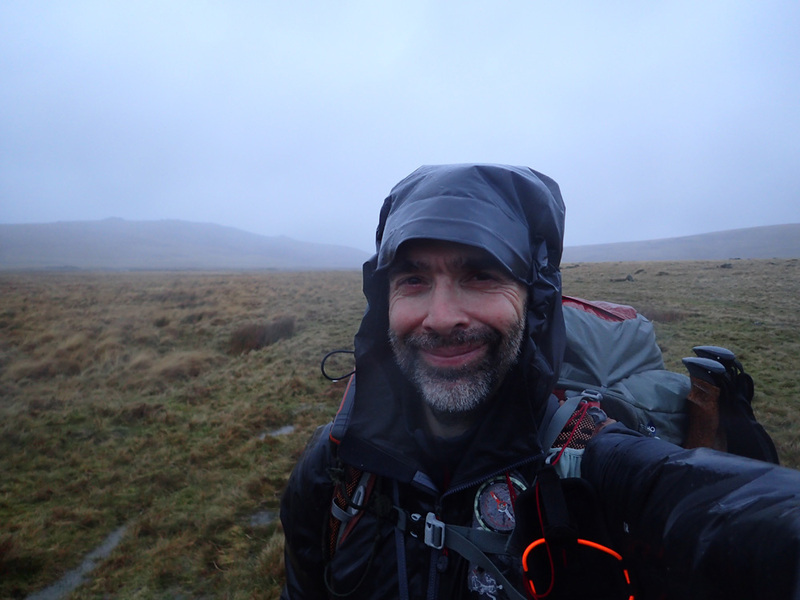 Given my lack of will to carry on and the state of my kit, I guess it was a good call, especially as the subsequent day’s weather was more of the same. When I got back to Civilisation I was curious as to what the wind strength actually was. 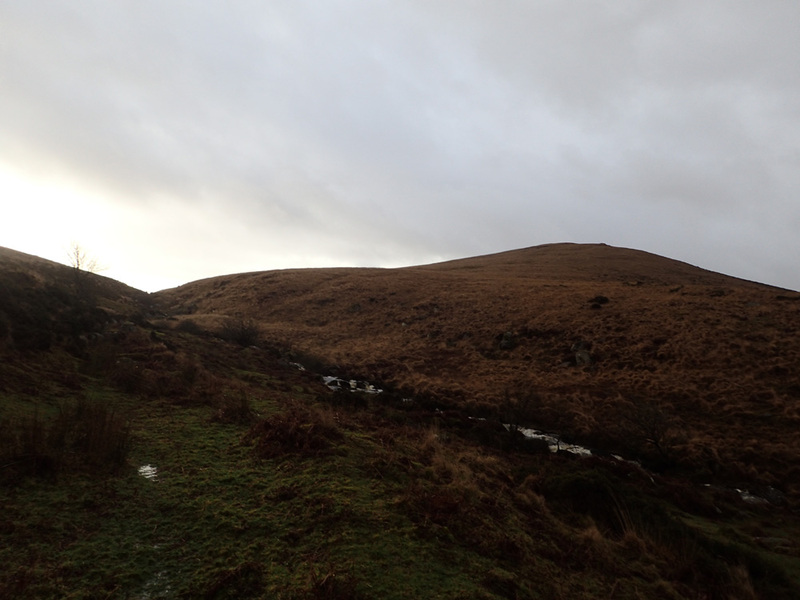 It turned out that it ranged from 30mph for 24 mtrs elevation to 51mph for 621 mtrs elevation. A lot of Day 3 was at around the 400 mtr mark. So I guess I was getting around 40 mph worth of wind and rain. That would go a long way toward explaining the physical exertion required on the walk! I finally managed to meet up with fellow bloggers at Crockern Farm! If you want to know more you will have to tune in for Day 3’s account. 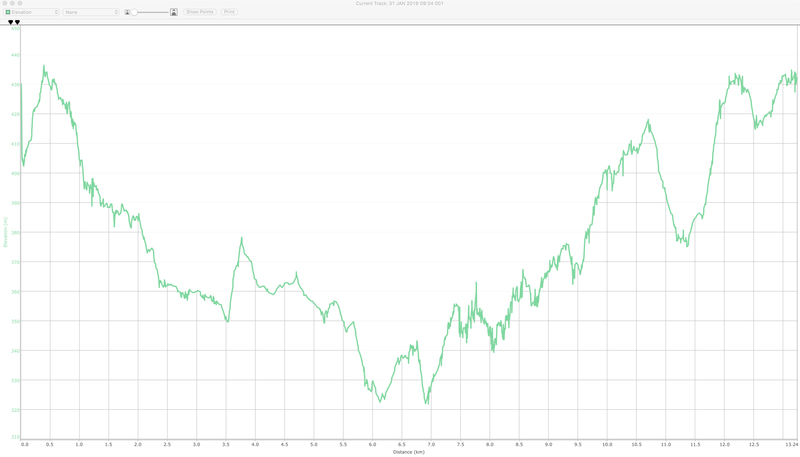 The elevation profile for the walk! 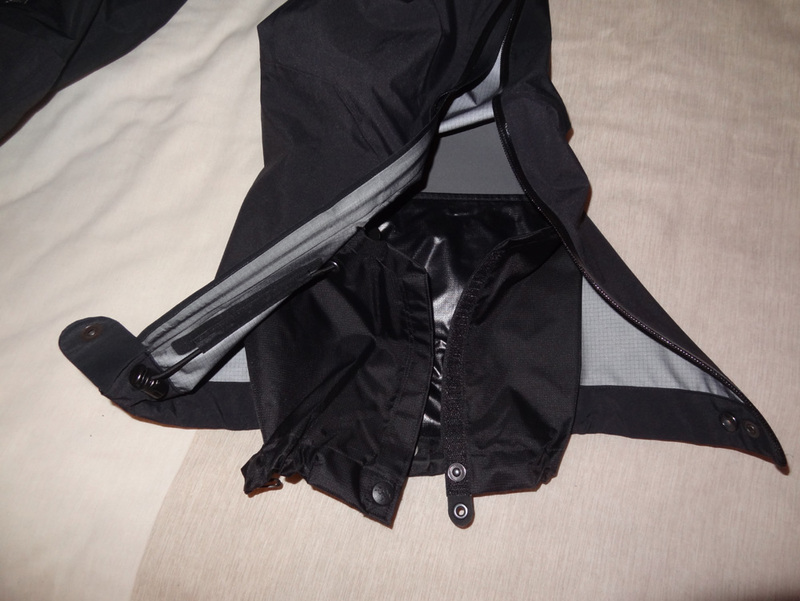 As alluded to earlier, the Gore-Tex Pro didn’t fair so well. I guess there is a limit to how many days of rain that material can keep off. The real test will be to see if they go back to being waterproof when next used, or whether they will wet out straight away. Either way, I can’t help thinking that I would have been better off with a cheap plastic mac. But that’s a conversation for another day…. Anyways if you want to know more, tune in next week for Day 1’s account! 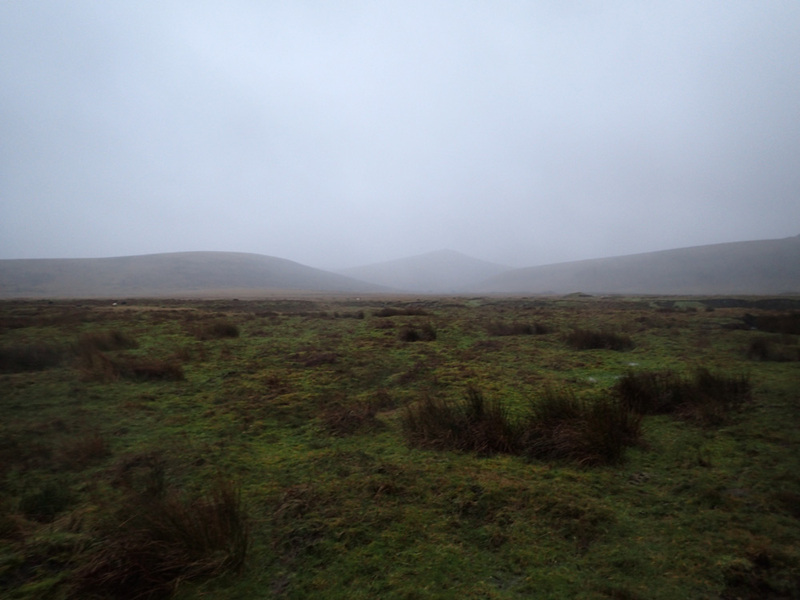 Ready for Solo Dartmoor 3+2 day walk! Ready to go!! 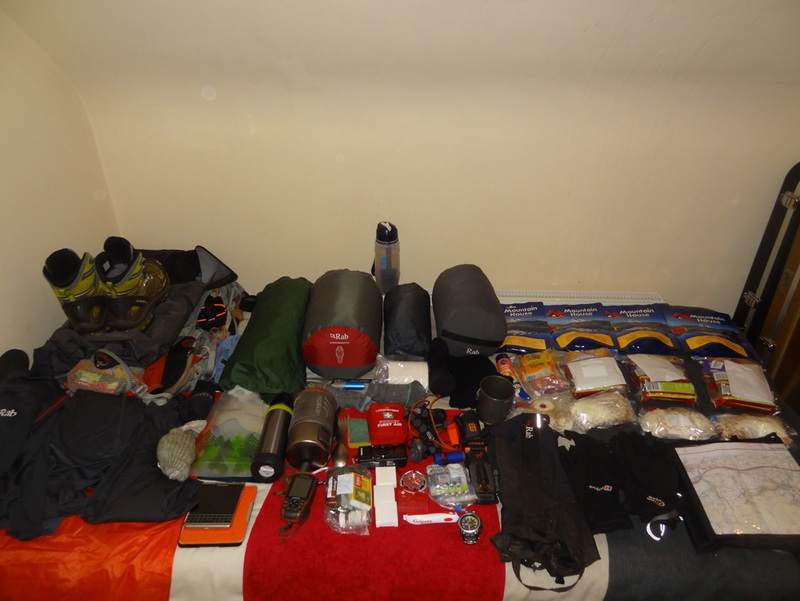 The kit I will be taking to Dartmoor. Total weight is 16.2 Kg which isn’t too bad for a Winter trip over 5 days. It’s been a while, but I’m now finally ready for the first walk of 2016 and the first walk for almost a year! Far too much elapsed time! 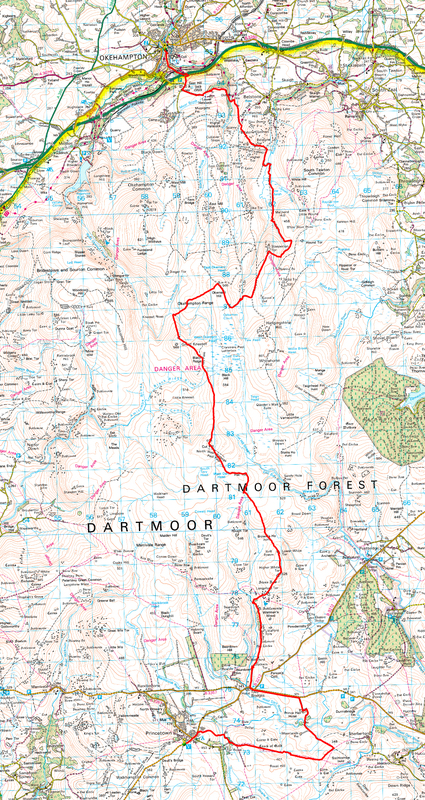 This particular walk will be one that takes me around the Northern reaches of Dartmoor – one of my favourite haunts. The original planned walk was going to visit many places that I hadn’t been to before. This particular plan was put together around 6 months ago and then transcribed to the paper map a few weeks back. Yesterday I decided to Quality Assure (QA) the route plan to make sure there were no issues. It was at that point that I discovered two alarming mistakes. Mistake number one had saw that I had accidentally forgot to plot a camp spot on the paper map. I number my camp spots based on the day of the camp. When I got to the end of the planning session the last spot was numbered ‘4’, which meant that I would need to book 5 days of holiday for the walk. Speaking of firing times, the QA also discovered that part of the plan would take me through a live firing range! As a result I had to spend a lot of time with the planner cutting out parts of the plan to get it to satisfactorily fit into a 3+2 day walk. Alas, it seemed that a lot of the interesting new areas that I wanted to visit were the ones that had to be dropped. 😦 I guess that this was to do with the fact that a lot of them resided on the periphery of the original plan. Despite the modifications, the new plan is still a good one – just not as good as it once was. 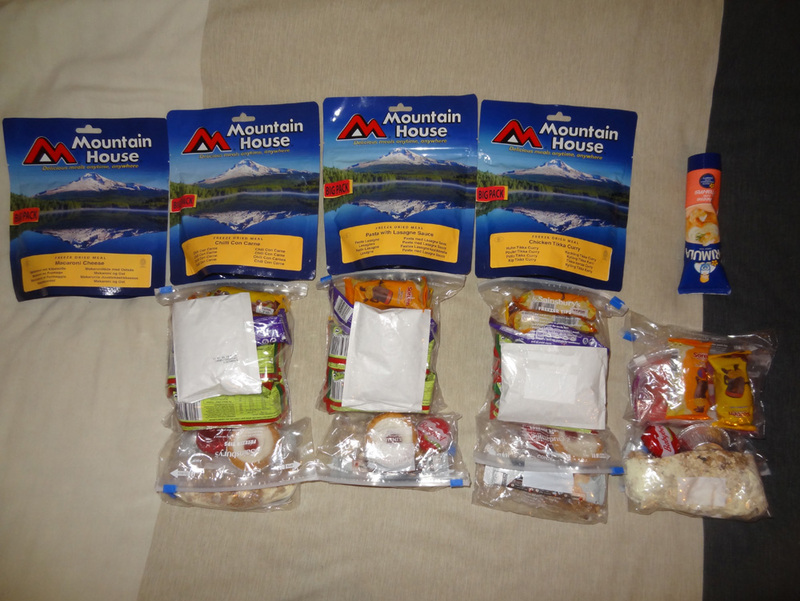 The rations for the walk – not including Friday’s ready use food, which is already packed on the rucksack. These food supplies are enough for 4 suppers, 3 lunches, 4 breakfasts and daily on-the-go snacks. 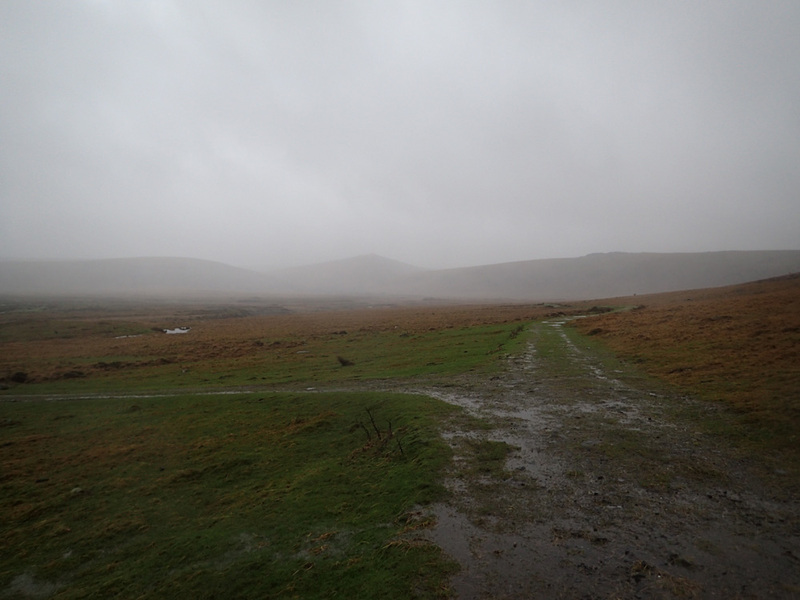 The weather forecast for the whole walk is looking pretty grim with rain being a prominent feature. With that in mind I had decided that some parts of my kit would have to be upgraded. New waterproof trousers! 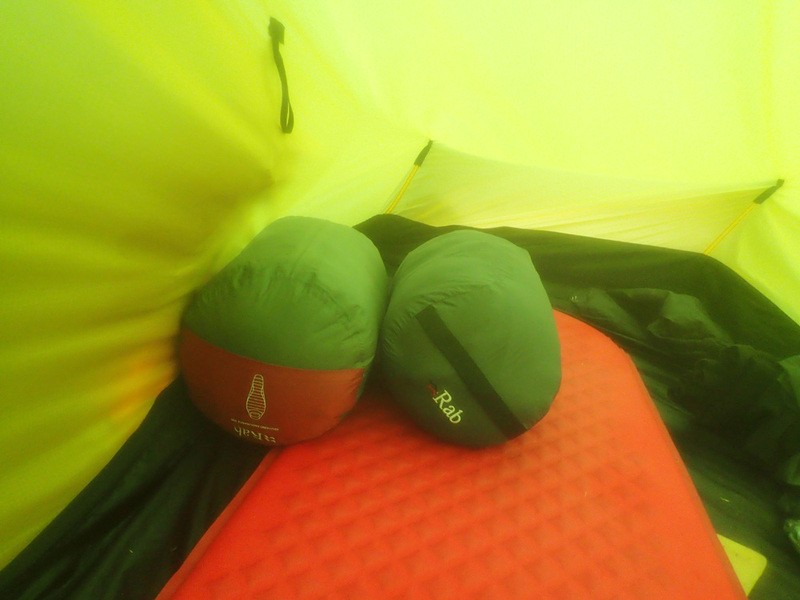 In this case a pair of Arc’Teryx M Betas made from Gore-tex Pro. My old Berghaus Deluge trousers had stopped being waterproof a long time ago, despite many attempts to re-vitalise them with various sprays and washes. In the end I kept them around solely for their thermal properties rather than their ability to keep out water. Given the amount of expected rain, I decided that it would be prudent to replace them. These particular trousers also feature built in gaiters! 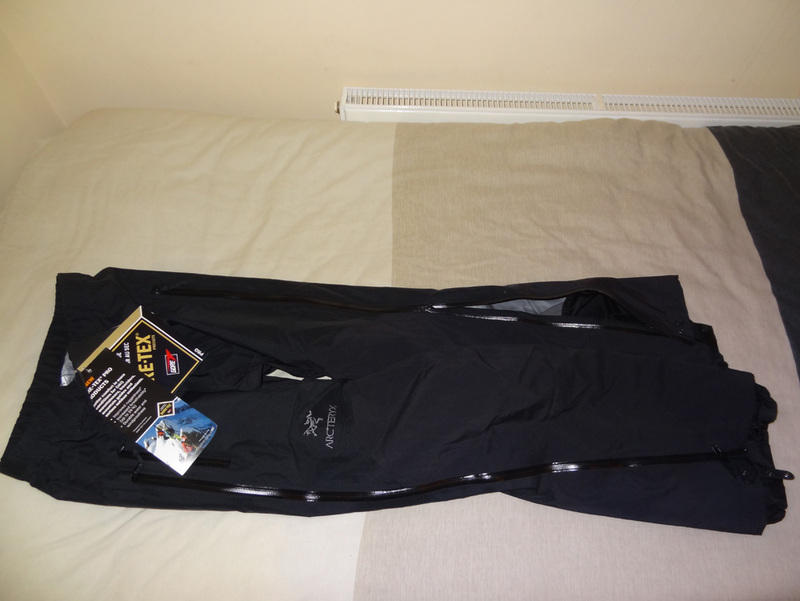 I had been impressed with the Gore-Tex Pro material used in my existing jacket, so this steered me toward getting a set of Gore-Tex Pro trousers. Although expensive, this kit should last a fair while. A new camera! 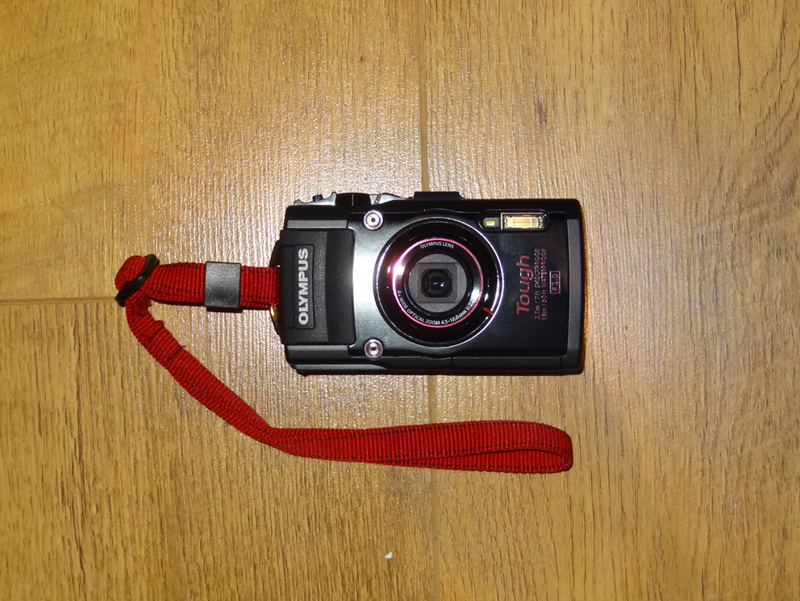 The Olympus TG-4 which is apparently completely waterproof! 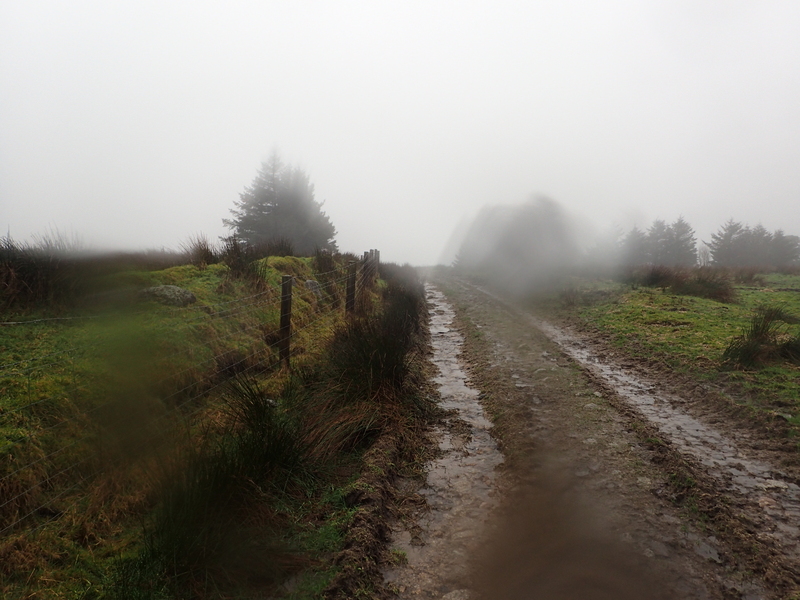 The Sony, whilst a very good camera, used to really suffer on wet walks. Sometimes it would just completely shut down and at other times the internal lenses would fog up. To get around this I decided to purchase what is effectively an underwater camera. I figure that if it can survive the depths of the sea, then it should easily be able to handle some British rain. The downside of the new camera, is a rather limited zoom capability and poorer image quality. I’m not too fussy about the latter as many of the photos that appear on this blog are vastly reduced in size from their originals, so the slight loss of detail shouldn’t be apparent – at least in theory. The TG4 camera holder. 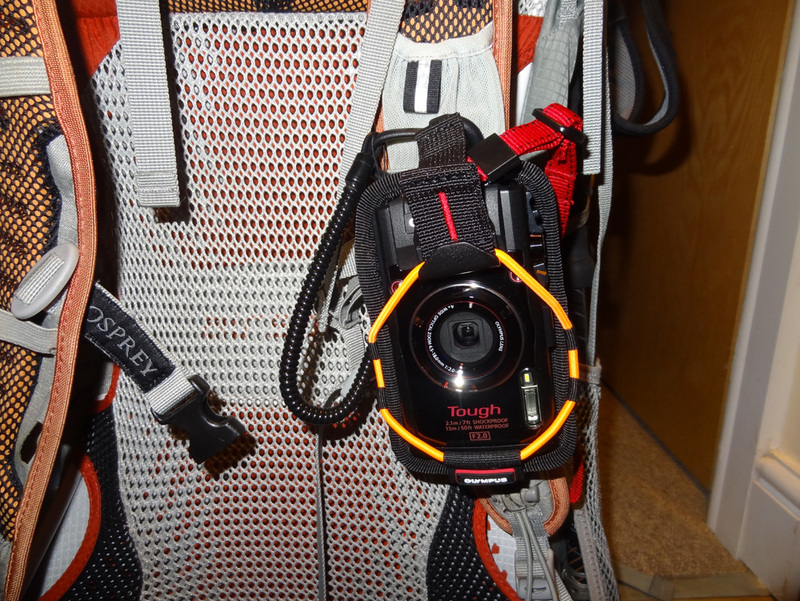 This is designed to fit on the rucksack and makes it really easy to get the camera out quickly. This mounts the camera onto the rucksack straps and makes it exceedingly quick and easy to get the camera out ready for use. Given the number of photos that I tend to take, this will be a blessing! A new map case! This time one by Aqua Quest. With the exception of the last one that I owned (no longer available), these map cases never seem to last very long with me. I guess they do tend to receive some rough treatment in the field. Hopefully this one will put in the same kind of sterling performance that its predecessor did. A new flask! This one will keep drinks warm for 24 hours! 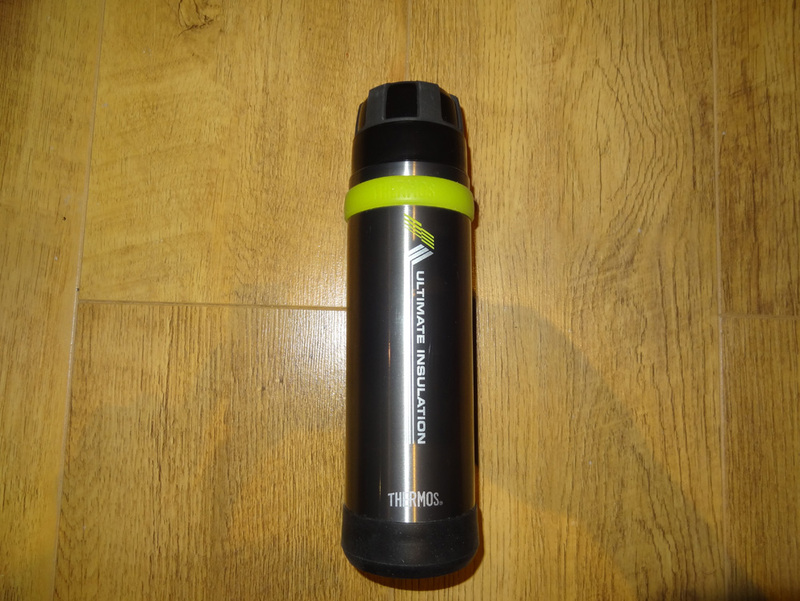 A year or so ago, Mountain Warehouse gave me a small vacuum flask as a Christmas present. 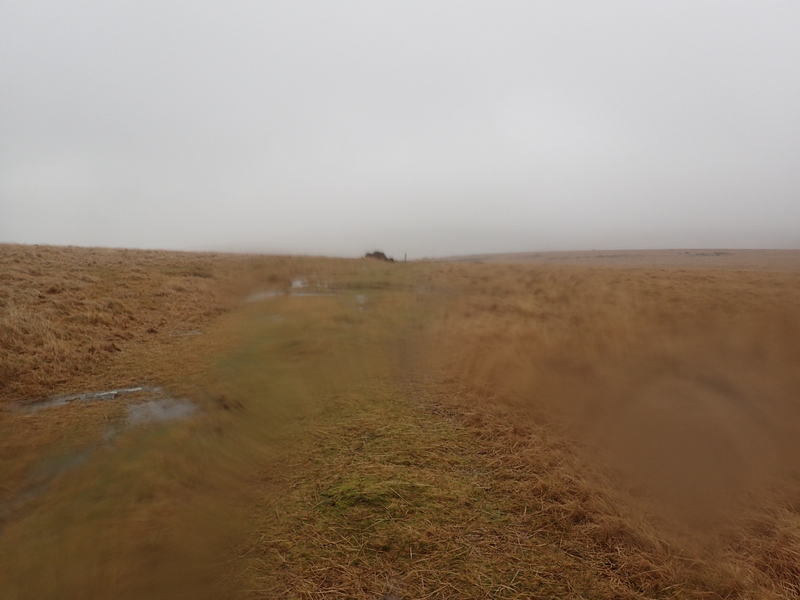 I don’t normally use them, but I did decide to take it out on a December Dartmoor walk. The result was that I was really impressed with the ability to get a hot drink anywhere and very quickly. It really made a difference on that walk. 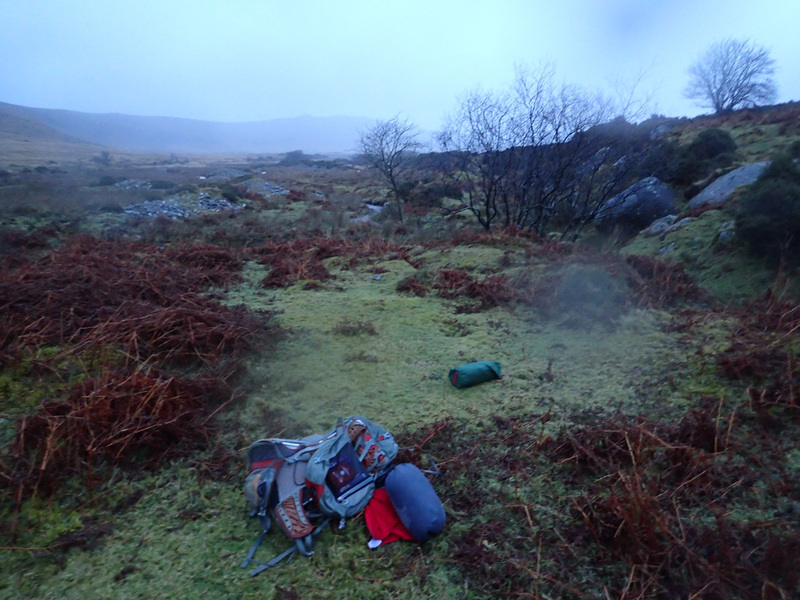 I don’t tend to use rain covers with my rucksacks. I much prefer to seal the inside with a single large dry bag. 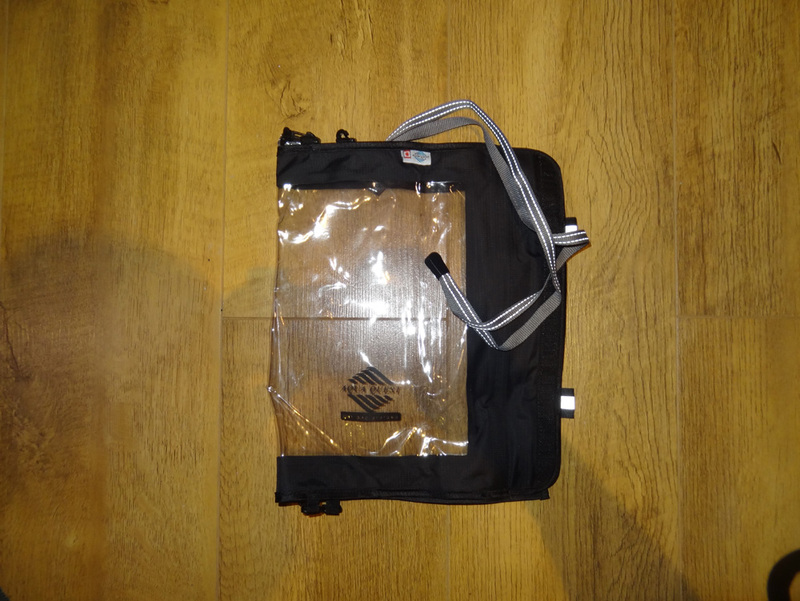 This makes access to the rucksack much easier and offers more protection from the elements, especially if the rucksack takes a dunk in a stream. Alas, my old one had developed some holes around the seal, due to over-zealous compression on my part – hence the replacement. A new E-Book Reader! 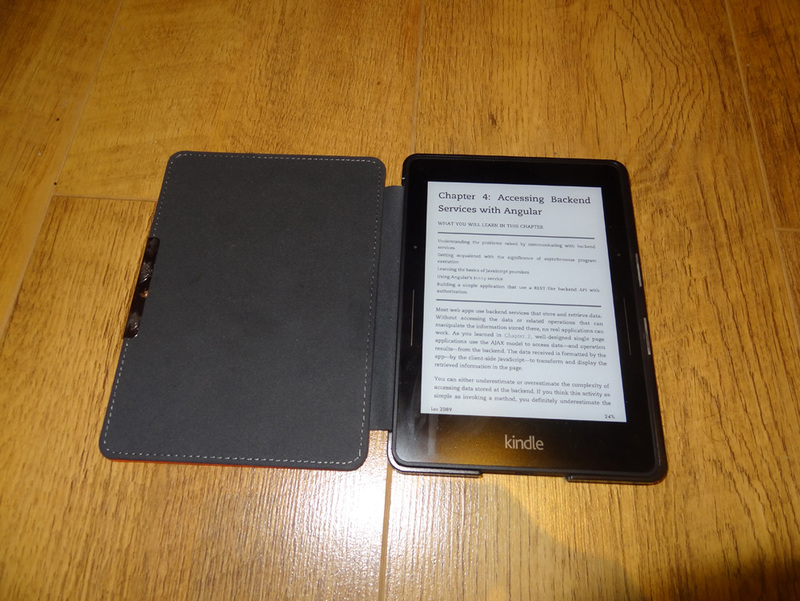 In this case a Kindle Voyage. 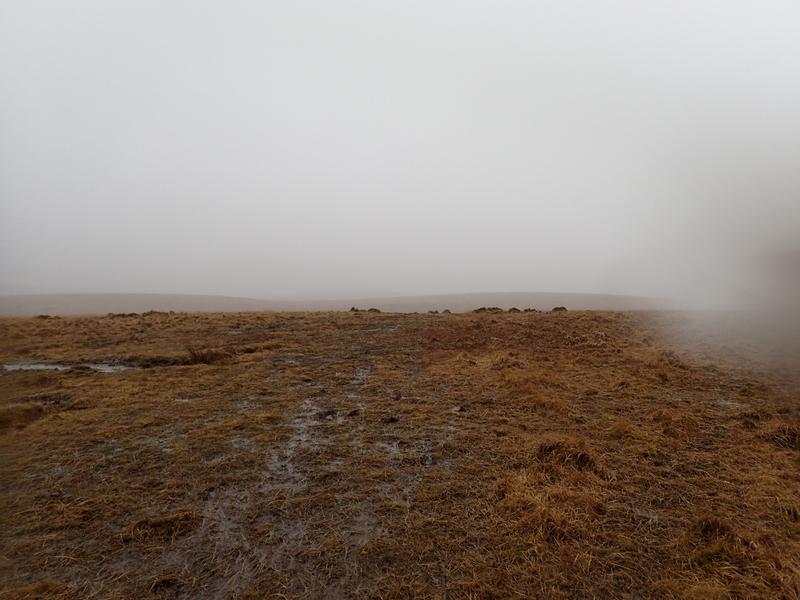 Anyone who has followed my last walk on Dartmoor will know that my Kobo Reader finally succumbed to the rigours of the outdoors. I really like to read and given the long nights in the Winter, this piece of kit is considered quite essential! 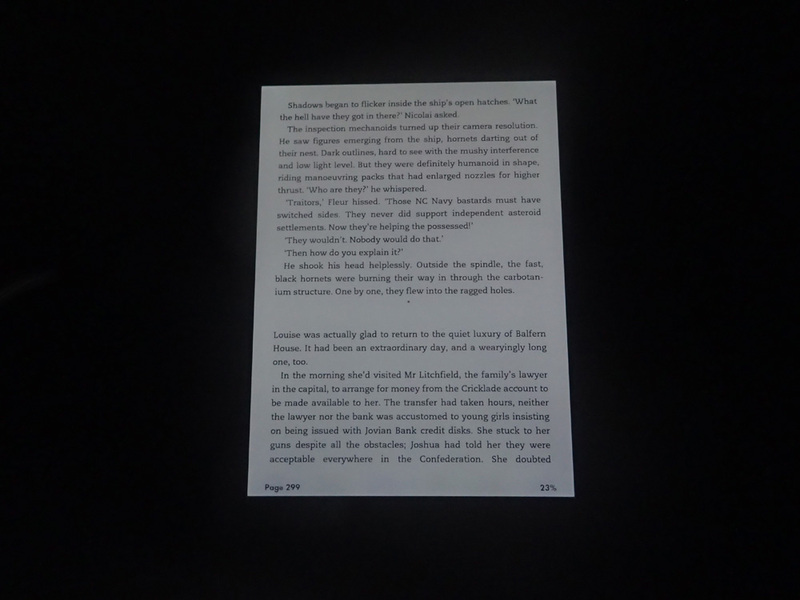 Unlike the Kobo, this one is backlit which means that I will be able to read it in the tent without needing to use a headlamp. It will be interesting to see how the Kindle performs. A new tooth-brush! This one is from Colgate. I really like this one. 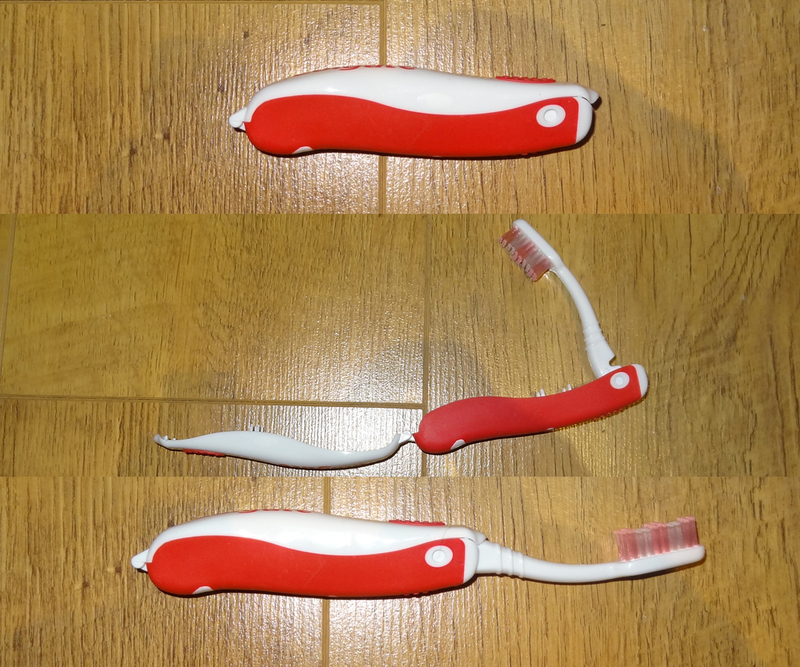 It folds out to a full sized, quality tooth-brush, but when folded takes up very little space. For me, the added bonus is that its container forms an integral part of the structure of the brush. This means that I won’t need to carry a separate tooth-brush container. 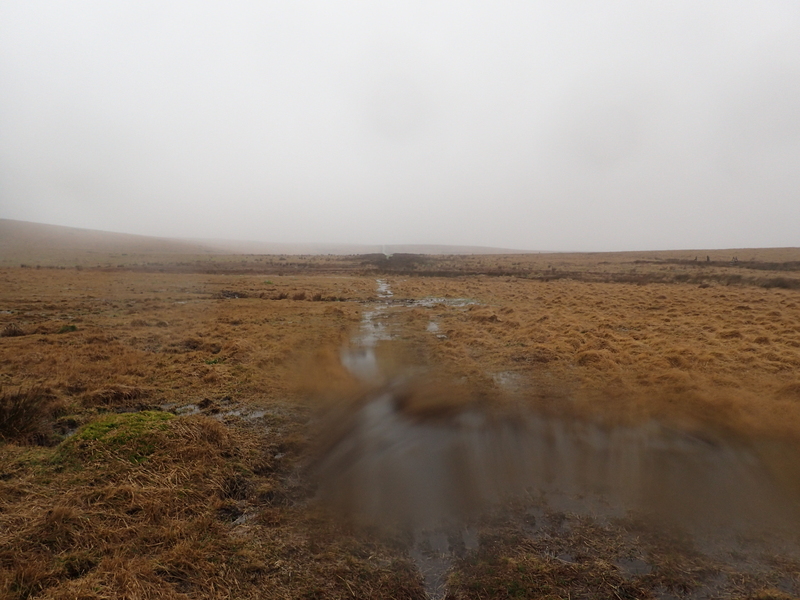 Dartmoor is normally quite boggy. Given the recent rains that we have been having, I’m expecting this to be especially the case for this walk. My Salomon boots leak like a sieve, so as a result I have decided to get enough hiking socks to allow me to wear a clean pair every day. 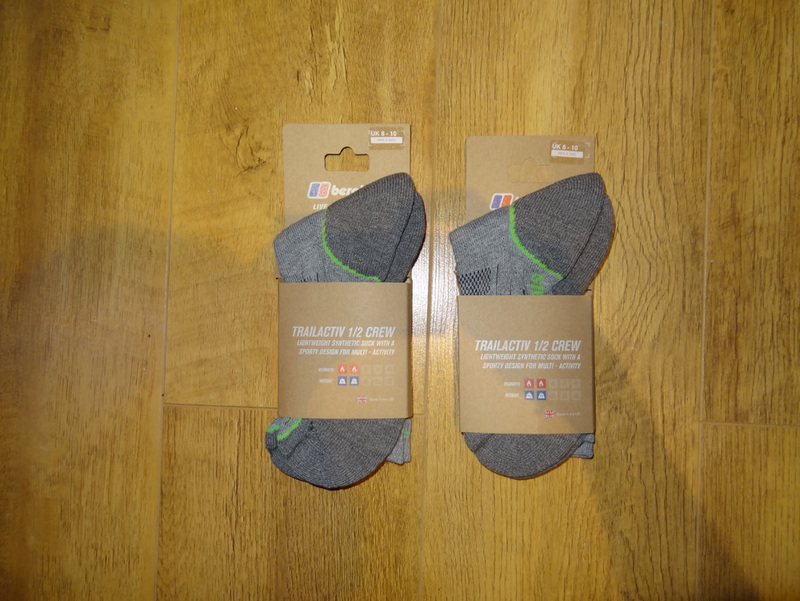 Having this many socks will be a great luxury as it will allow me to start each day off with dry feet! Something that shouldn’t be underrated! A new phone! 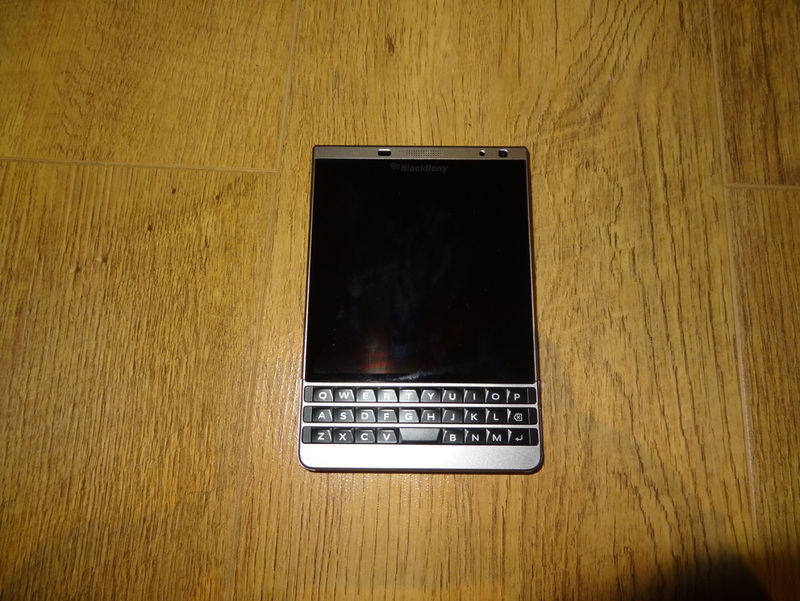 Welcome the Blackberry Passport! I know! It’s a phone with a physical keyboard! 😯 People do keep pointing this fact out to me, normally in the same sentence as ‘museum’. But this keyboard is a pleasure to use and it is touch sensitive to boot, so that it can also be used like a track pad. Very handy for accurately editing text! The Blackberry Passport is heavier than my previous Blackberry, but it does have an awesome battery. On most days I can get by for 3 days before needing to charge it, not something that most other phones can do! However, the battery isn’t removable. That bit does worry me, as removing the battery is the only sure way of ensuring that a phone won’t be accidentally switched on during the rough and tumble that is hiking. I guess we will have to see if this presents itself as an issue. There have been a lot of equipment changes, which is unusual for me, but I’m hoping that these changes will enhance the walk, especially with the predicted rain. 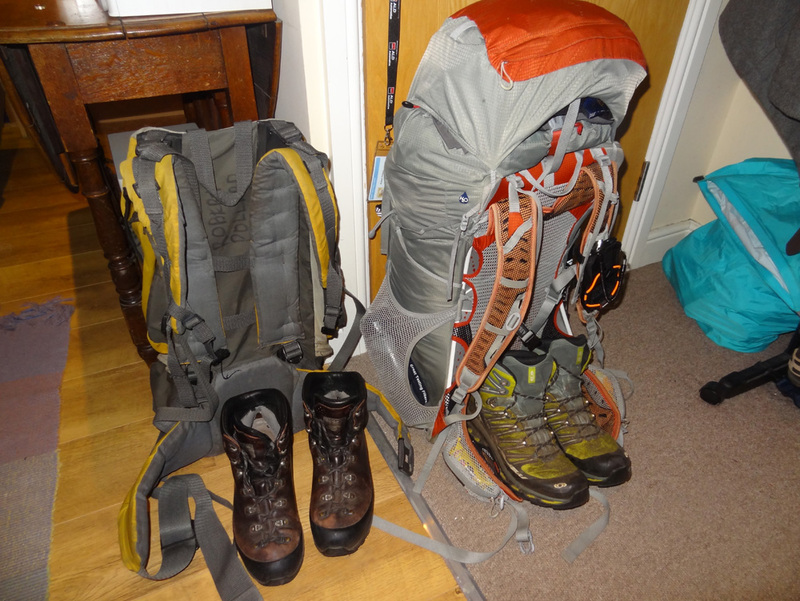 On the right, I’m all packed and ready for tomorrow’s adventure. 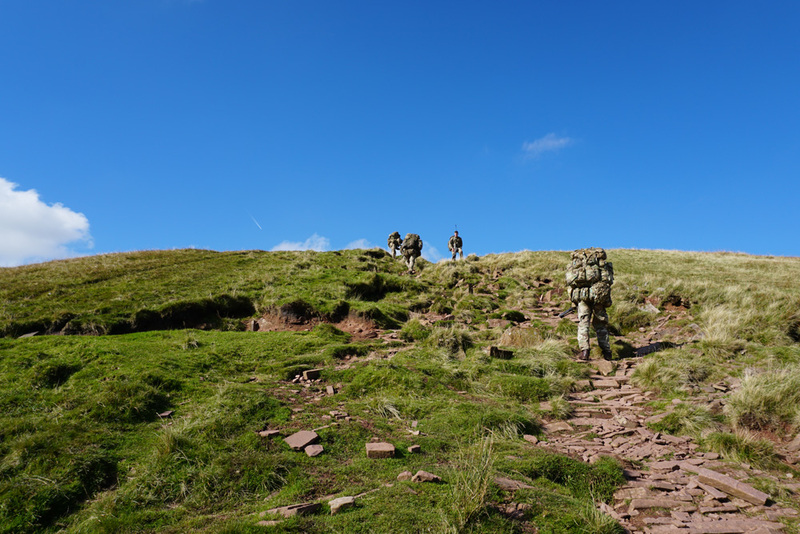 The rucksack and boots on the left are used for training only. That’s it for now. Excitement levels are sky high and I suspect that tonights’ sleep is going to suffer as a result! See you all in 5 days! Firstly welcome to my blog! 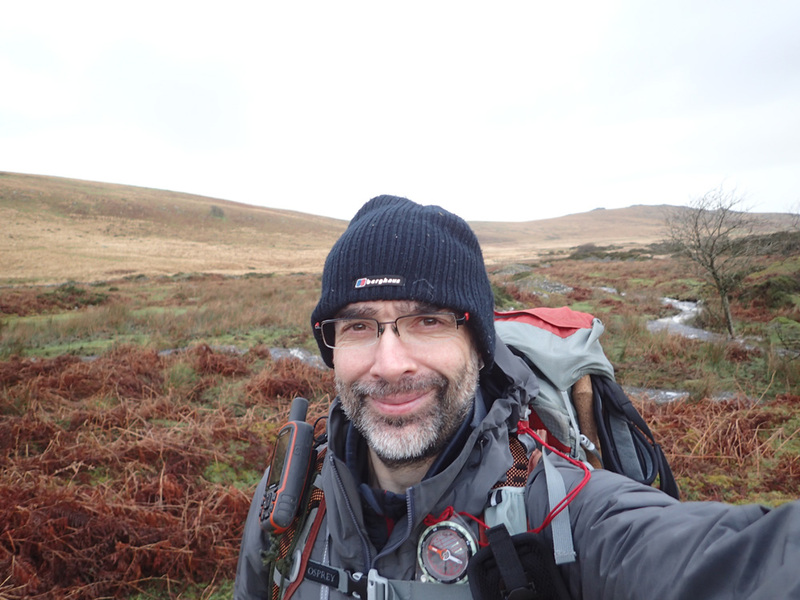 My name is Rob Pollard and this blog details my onward journey from couch potato to backpacker. 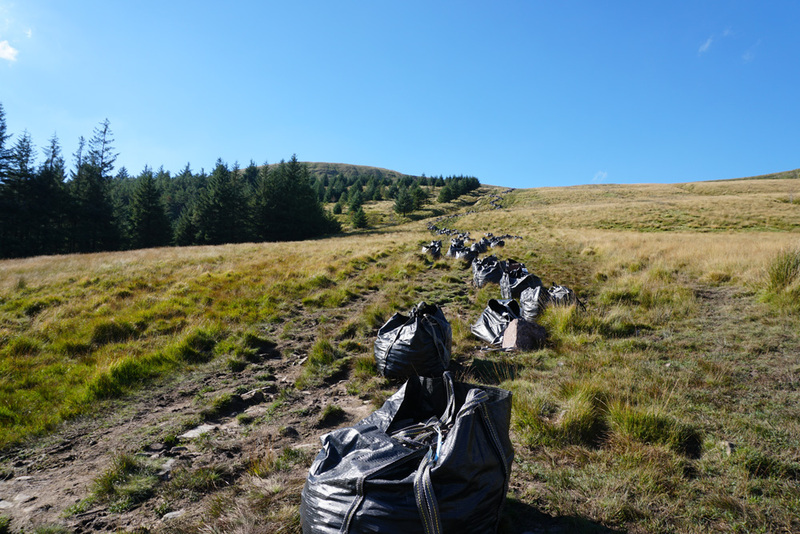 Hopefully it will spur more people on to take up this rewarding activity. Have fun reading it! Furthest in one day: 44.44km. Longest walk (dur): 6 days. Longest walk (dist): 113km over 5 days. Ancient Armies – My home made ancient battle simulator! MusicBox – My Virtual Band! Uk Astro-Imager – My astronomy site! So long, farewell, and thanks for all the fish! 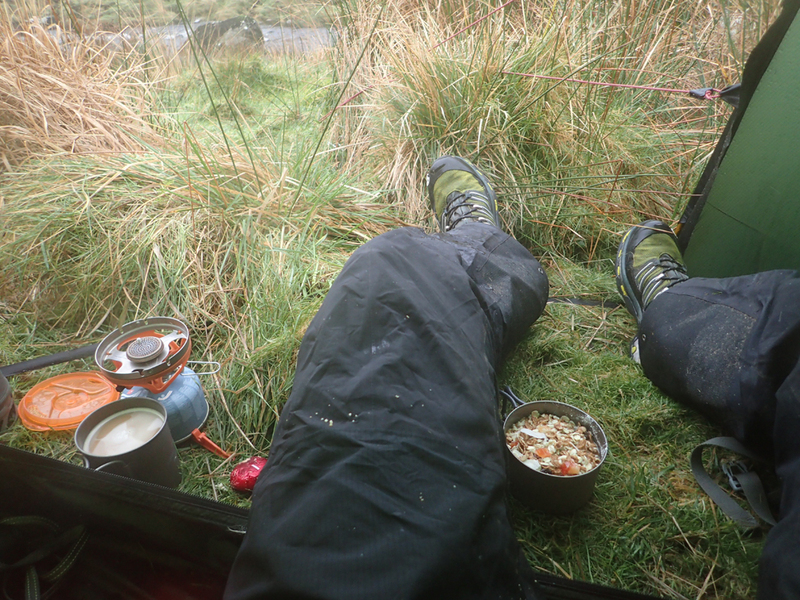 Back from aborted Snowdonia Region 2+1 day Solo Walk! Backpacking is an activity that carries an inherent risk. I can take no responsibility for any injuries (or worse) that are incurred through trying to emulate any walk in this blog. If you don't know what the risks are, find out and get trained! Even better, find an instructor that can teach you the safe way to do things and make sure that you carry the proper kit.